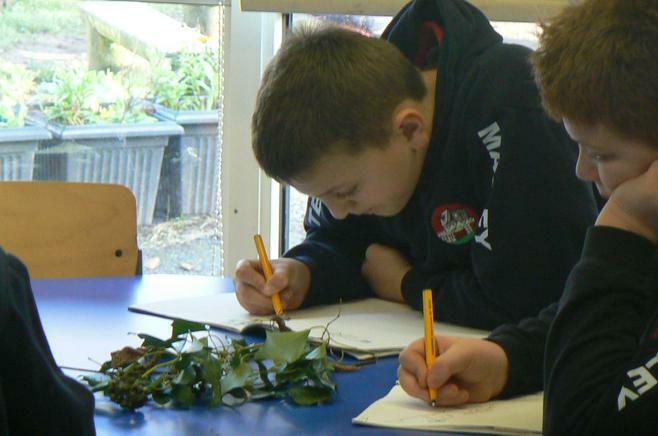 Spring Term Theme - "What Mr Darwin Saw"
This term the class will be finding out all about the life and works of Charles Darwin. 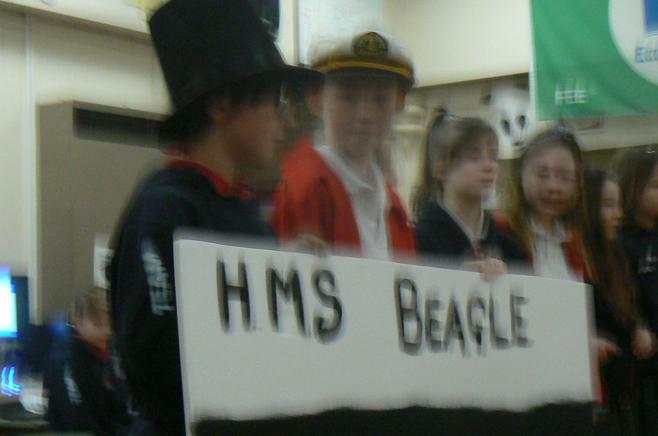 They will learn about his early life, his incredible discoveries whilst on board HMS Beagle and the scientific theory of Evolution. 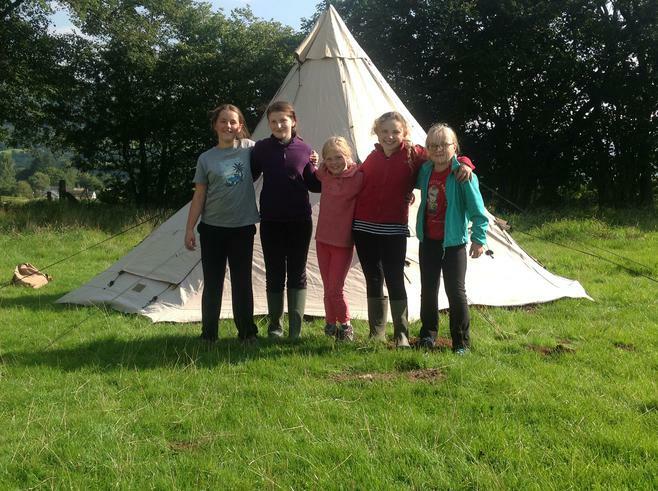 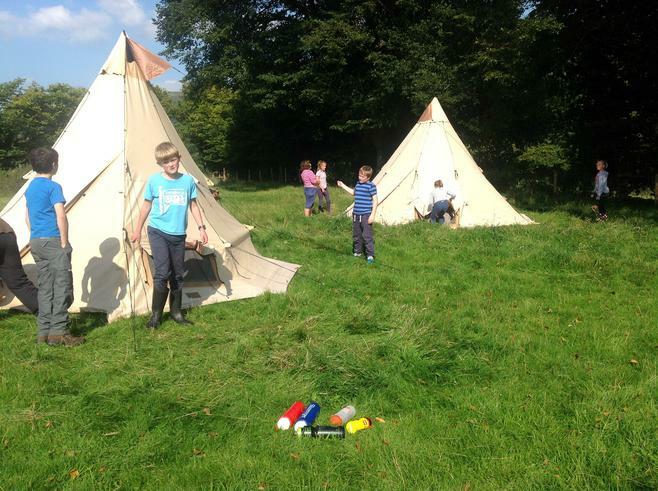 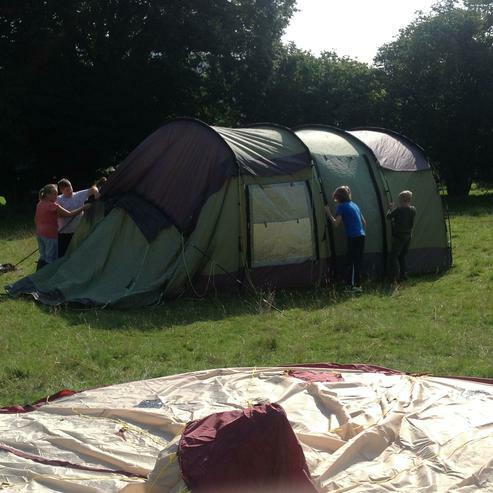 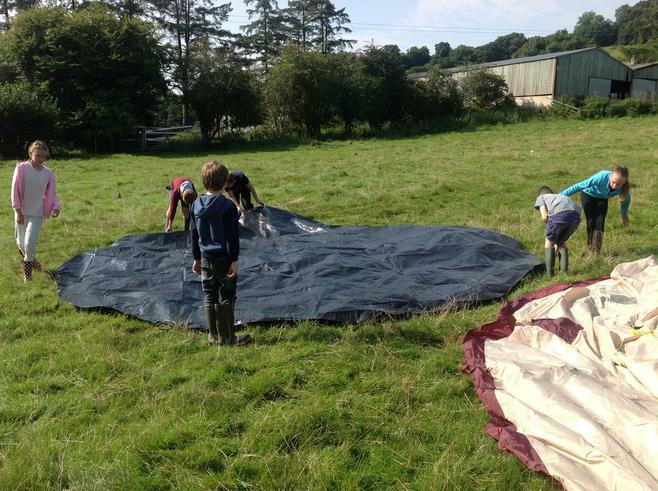 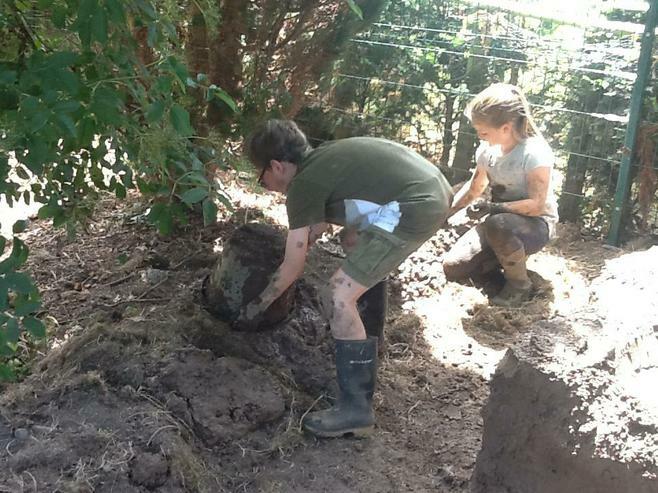 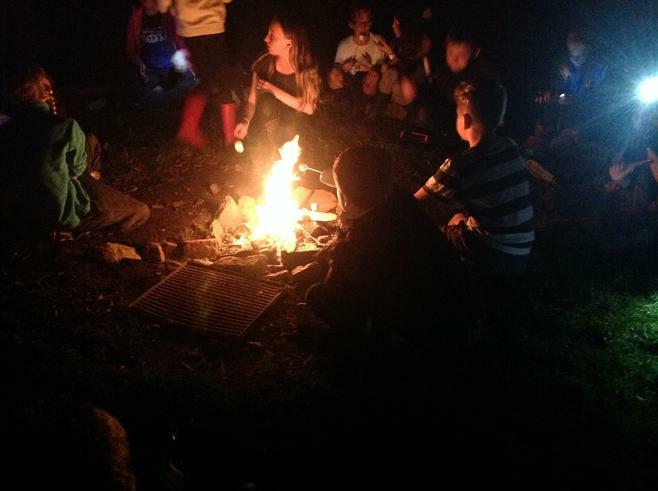 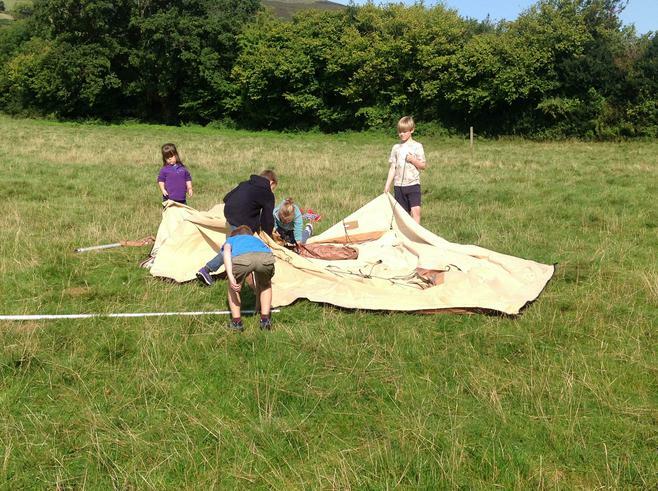 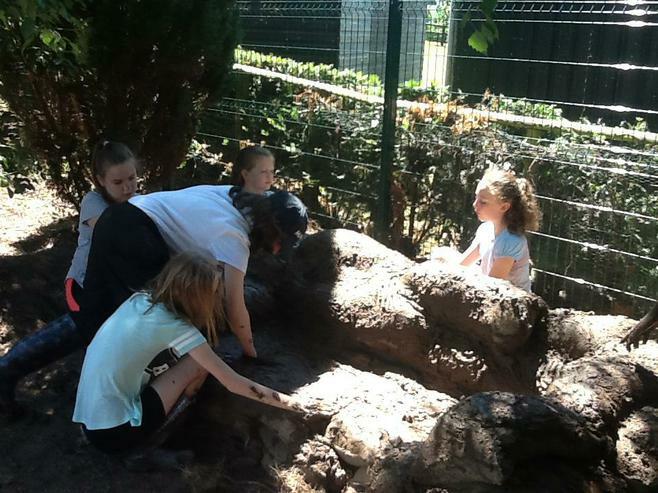 To support their learning the children will be making their own journey though time in the Space Odyssey Dome and will also have the opportunity to visit the Living Rainforest in Oxfordshire to see how animals adapt to their habitats. 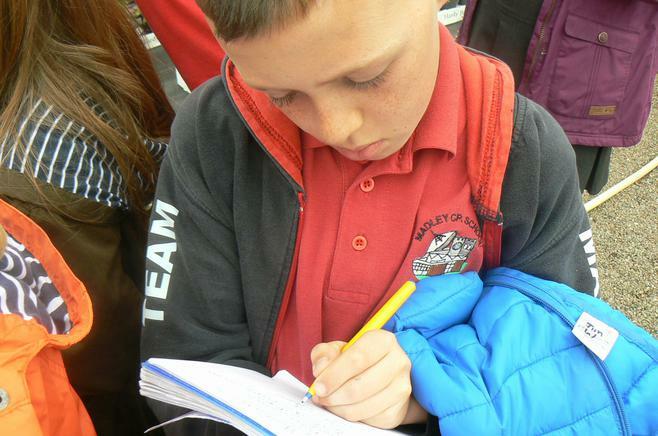 Along the way, the children will be applying their writing skills in the form of a diary entry as Darwin himself, a biography of this great man, a leaflet on how to prepare for an earthquakes and a report on the importance of protecting rainforests. 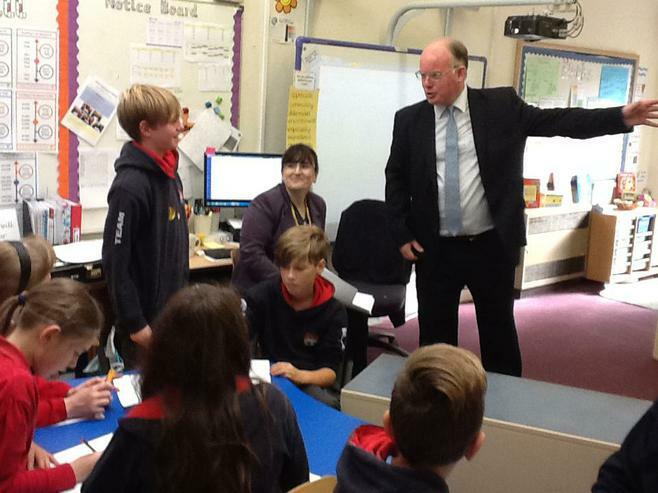 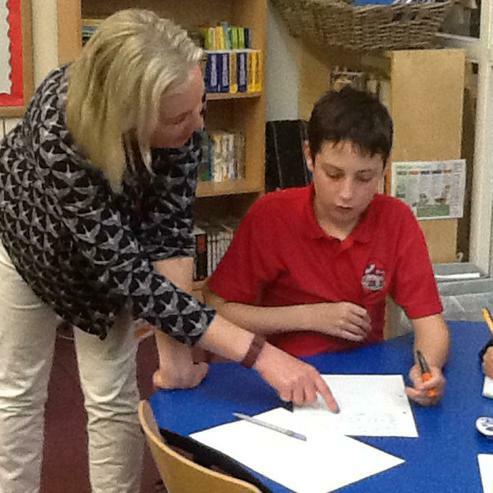 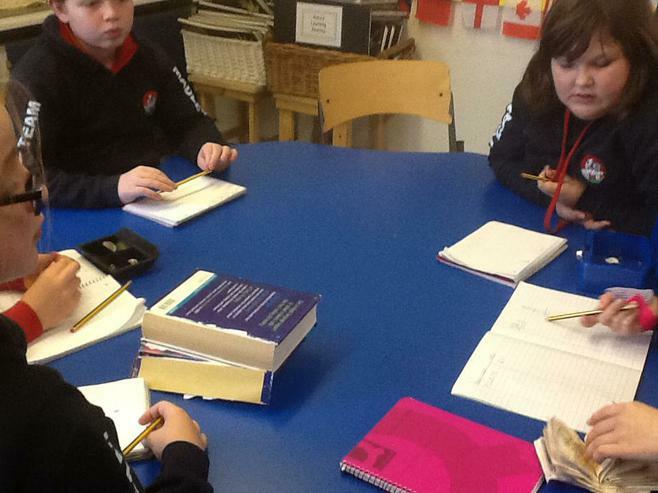 In addition, they will be continue to develop their maths and grammar skills. 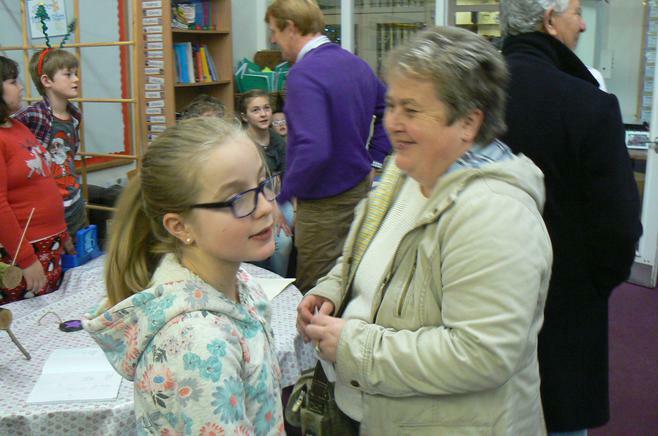 It will be a very busy term indeed. 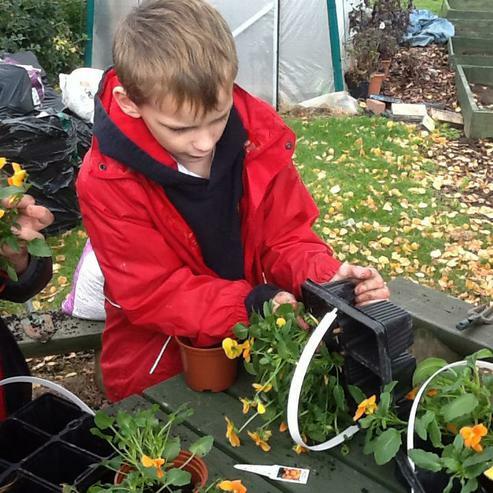 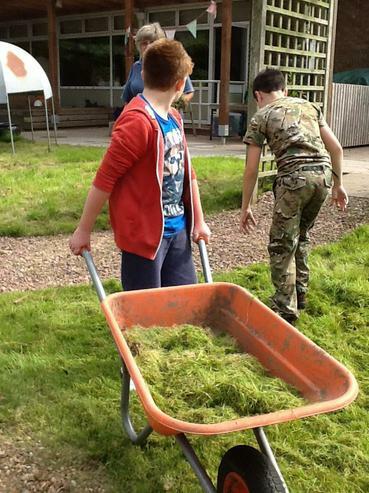 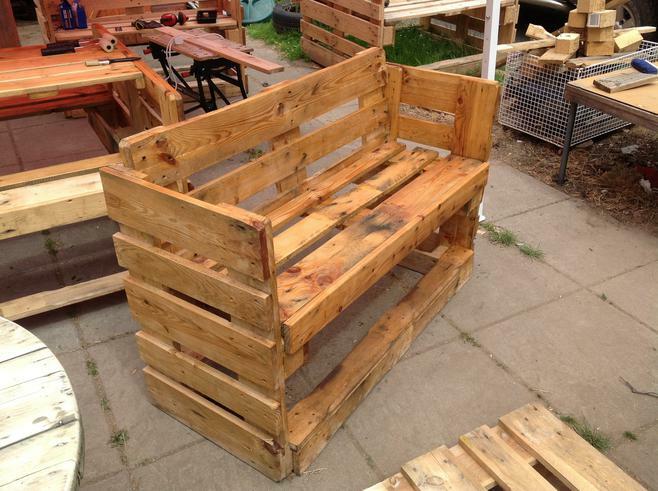 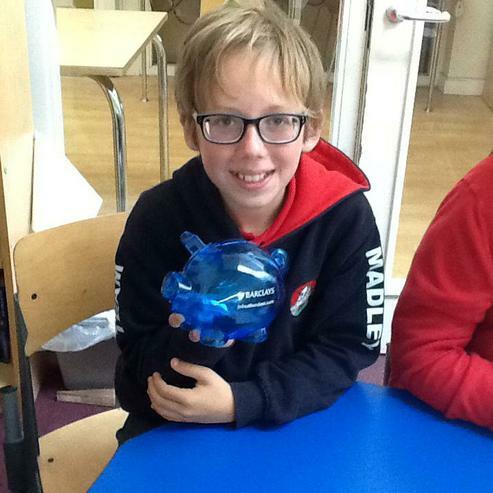 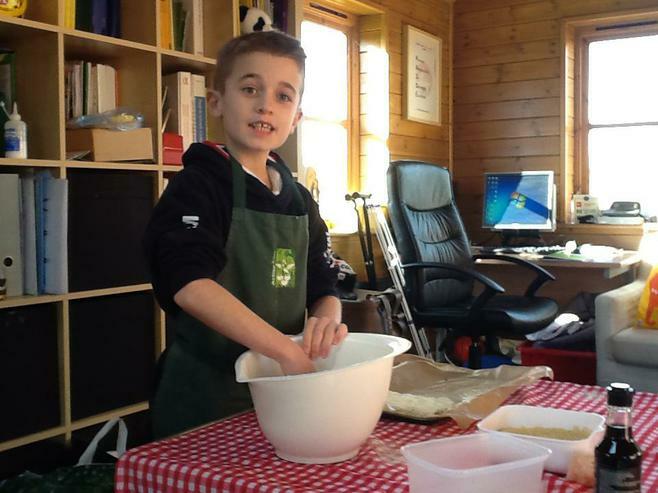 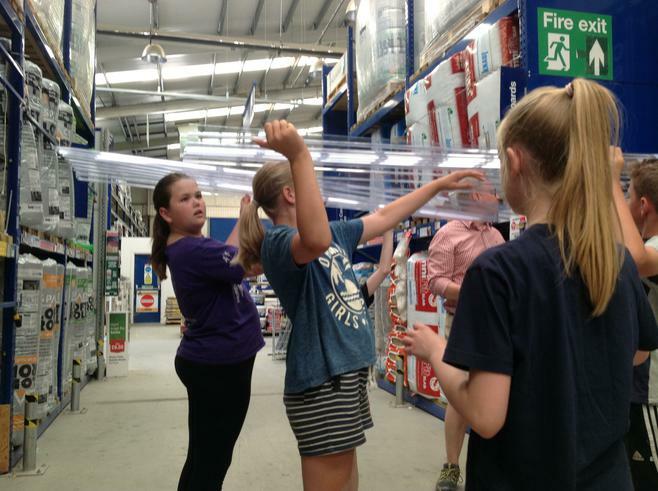 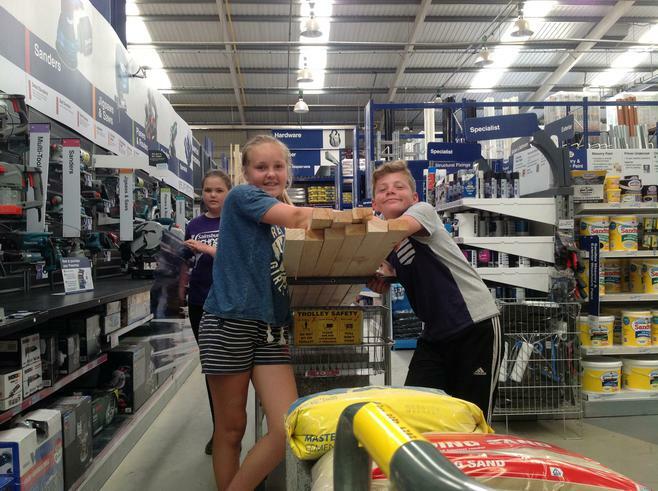 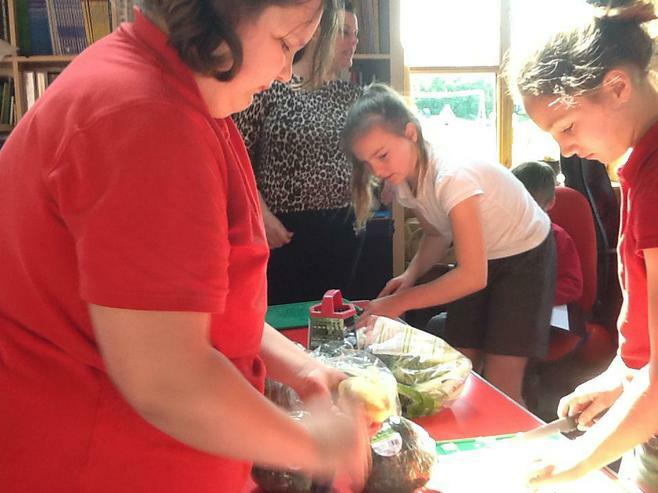 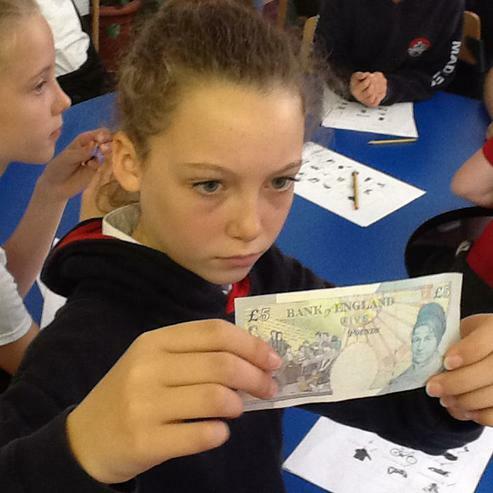 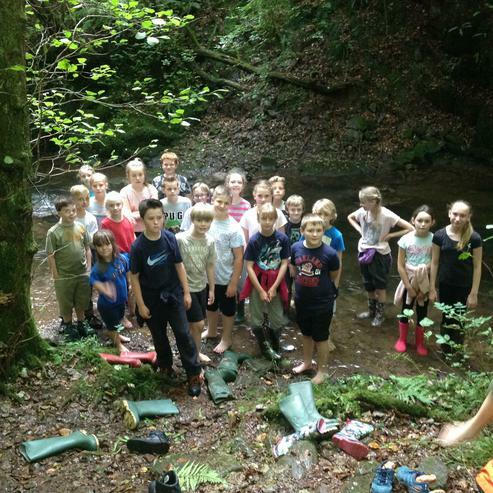 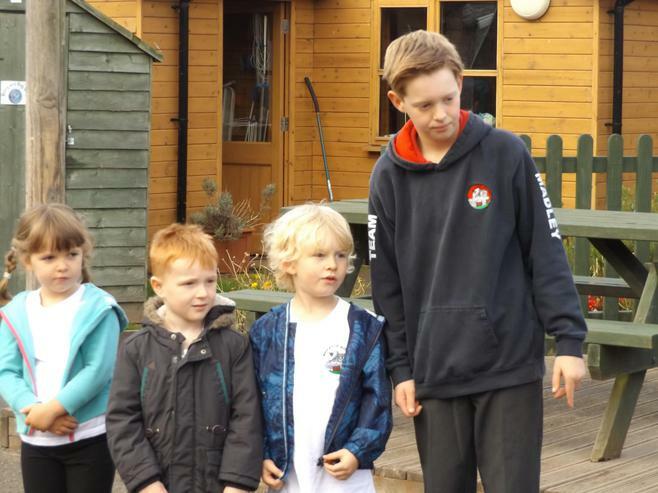 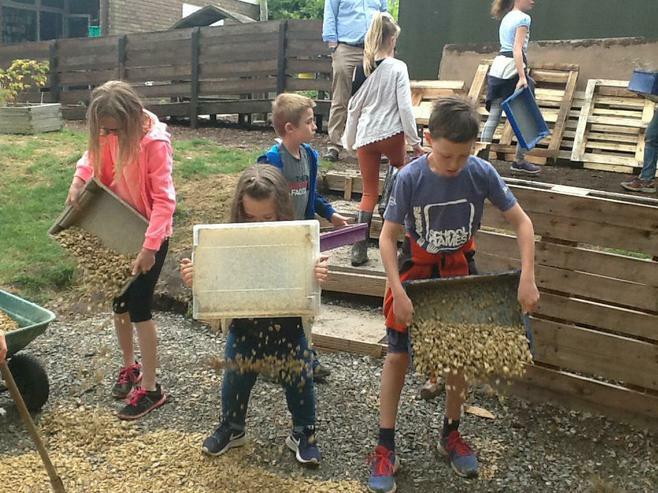 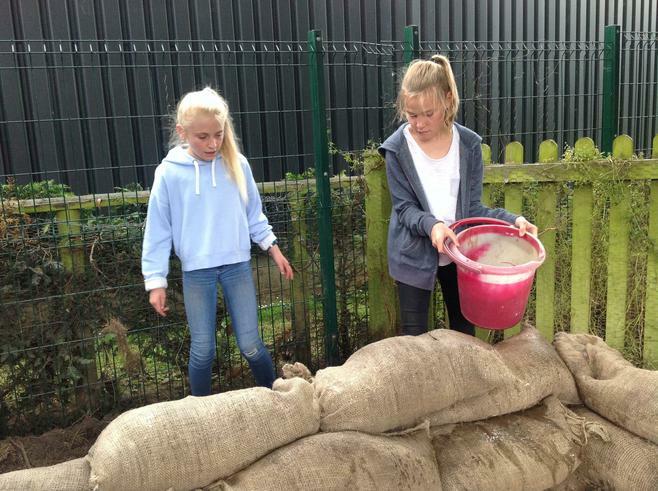 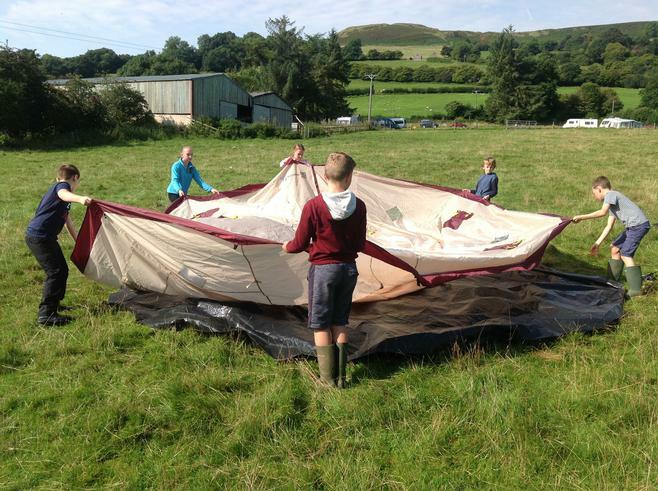 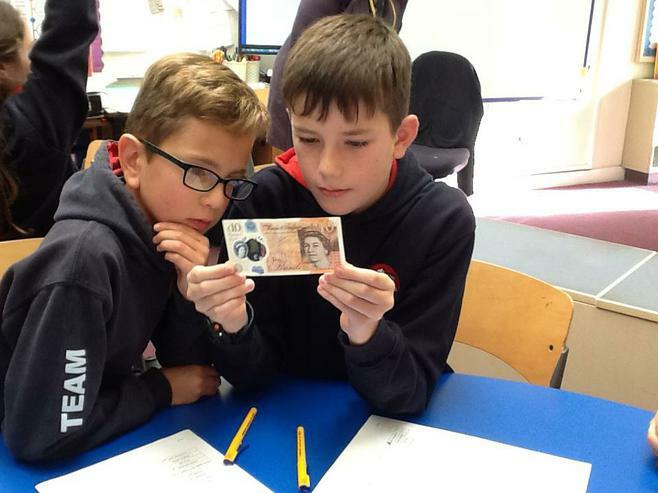 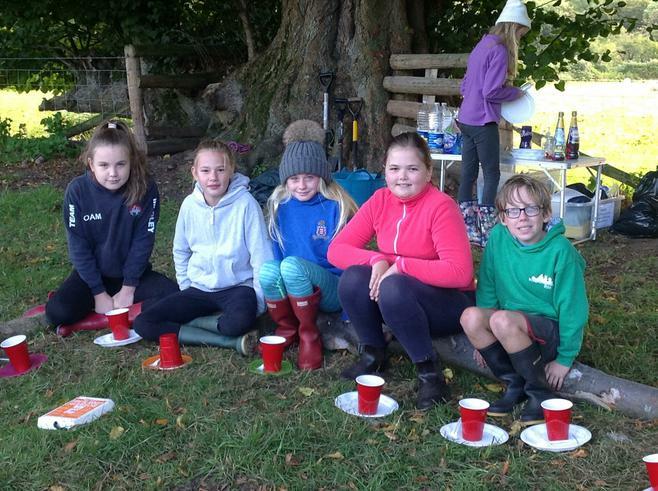 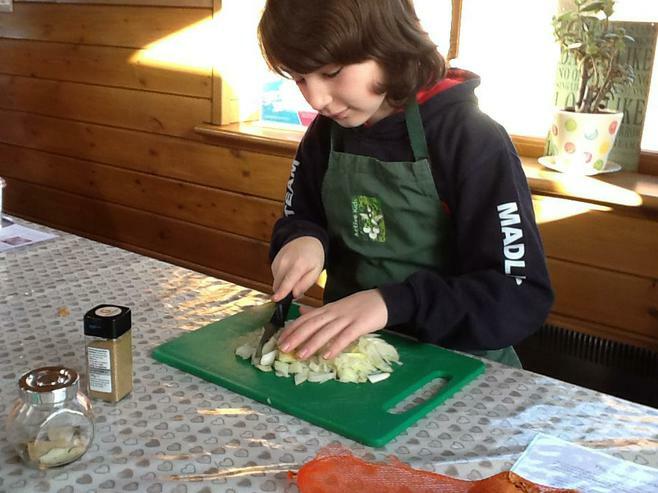 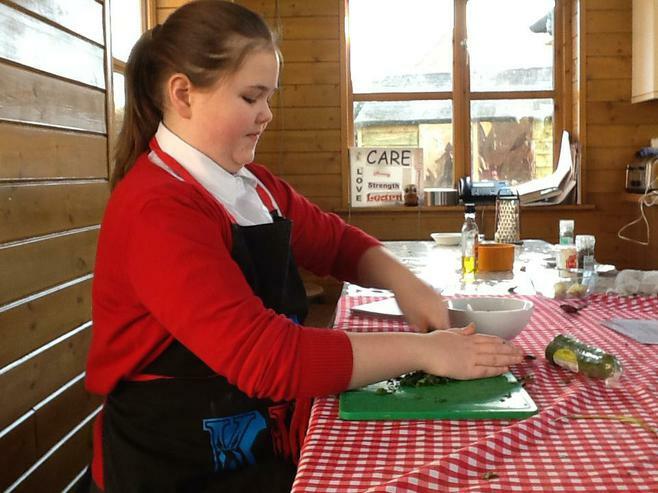 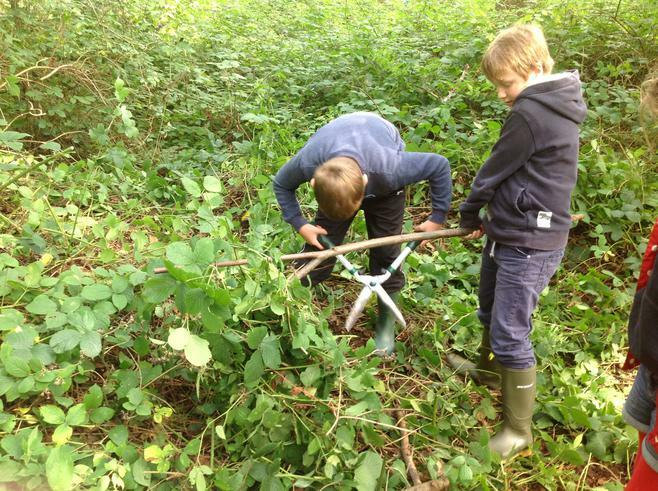 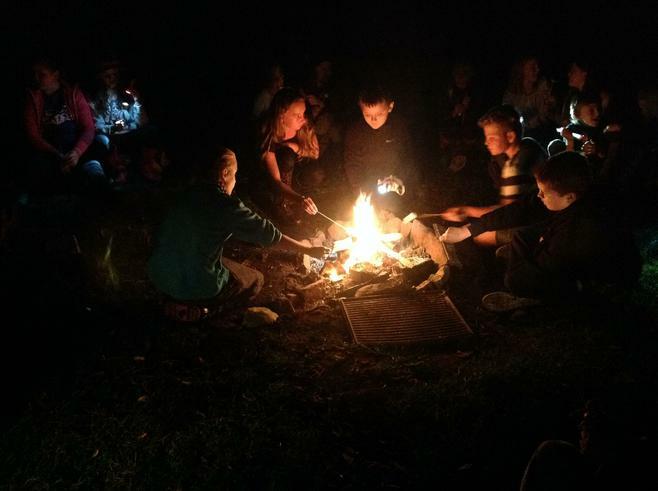 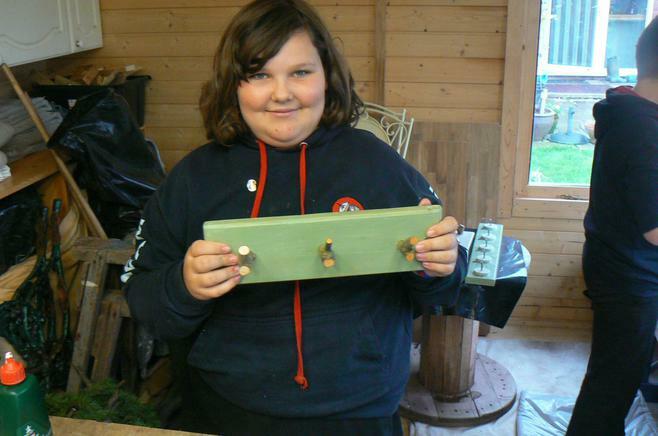 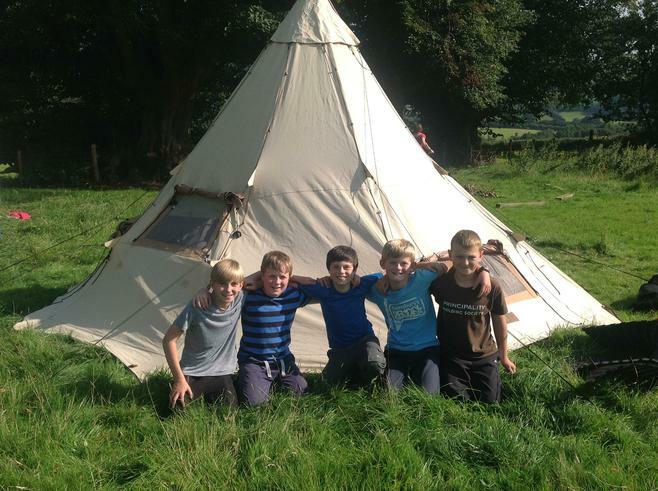 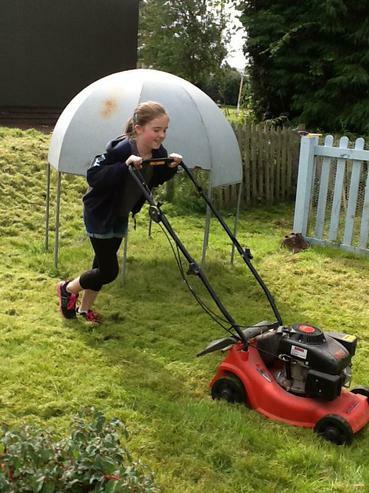 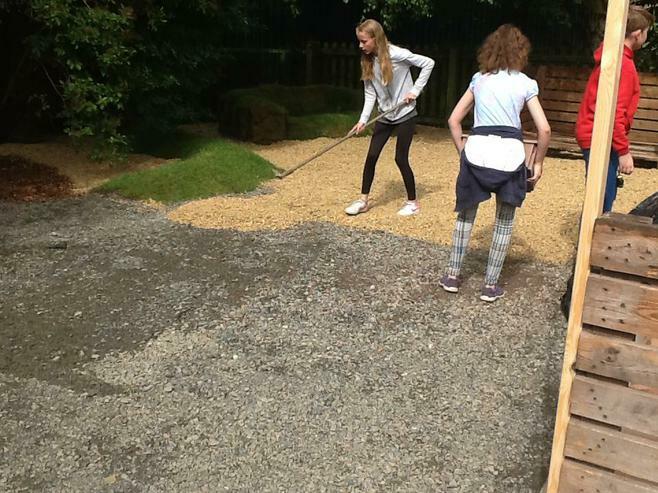 During the Autumn Term class 6 generated £1400 in profit as part of their enterprise and this money gave them the budget for their 'Legacy Project'. 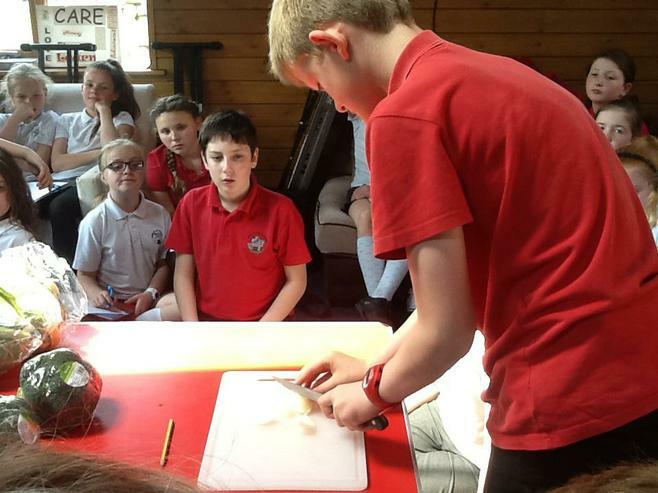 The idea started out as a pizza oven but with ambitious minds and determined children the project grew into a 'Legacy Restaurant'. 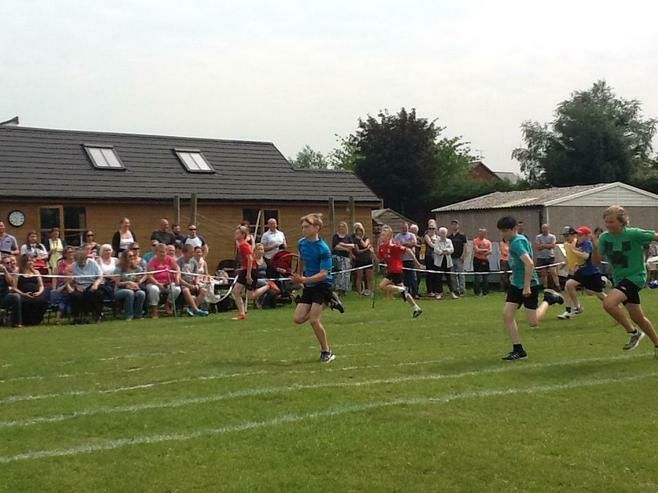 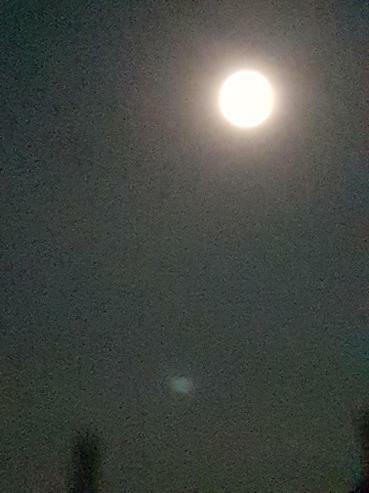 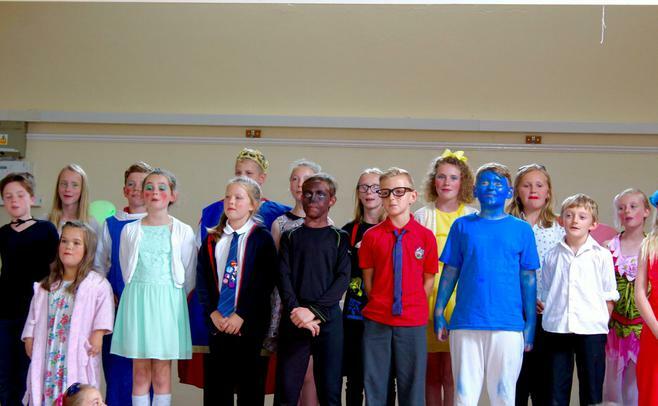 The following photos celebrate the amazing achievement of these children and their gift the current and future pupils at Madley Primary School. 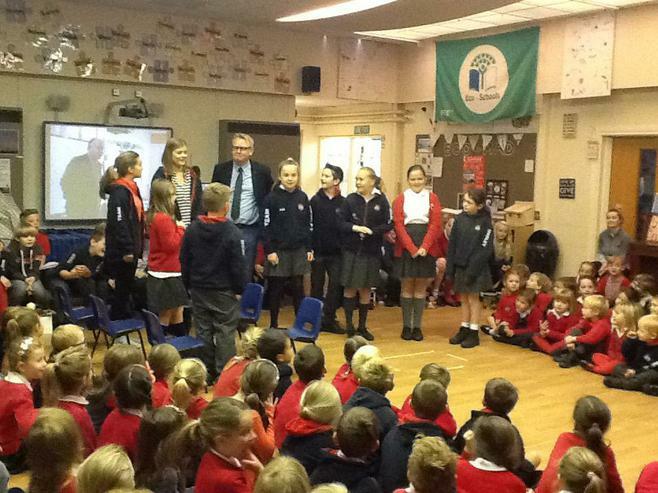 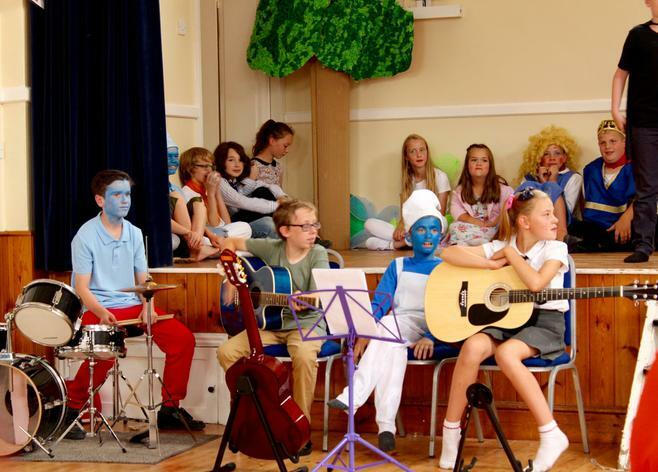 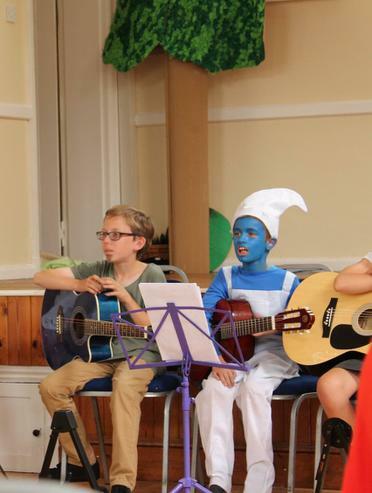 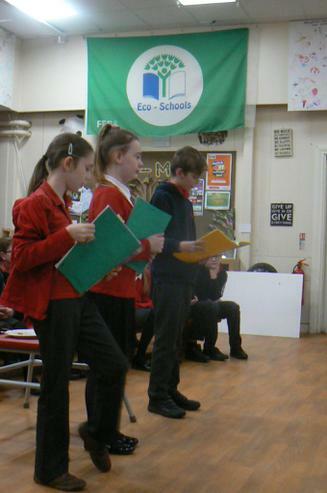 Year 6 always write the scrito for the final performance, with support from Dan at the Courtyard, and compose their won songs, with guidance from Mrs Blaker, and this year, Year 6 did not disappoint. 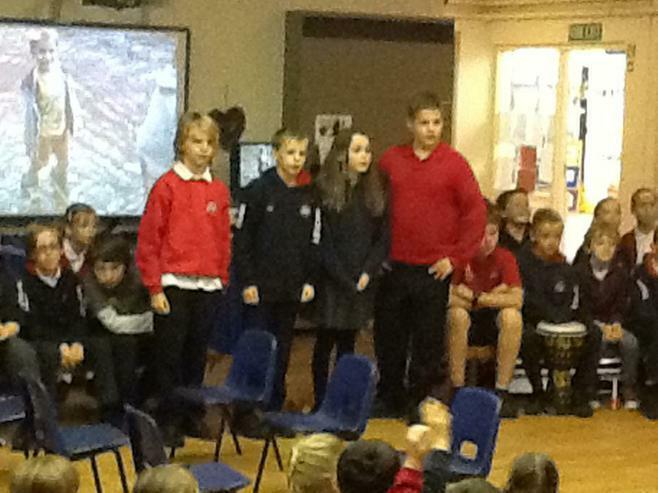 Their songs were fun and full of energy and their performances were full of memories, humour and energy. 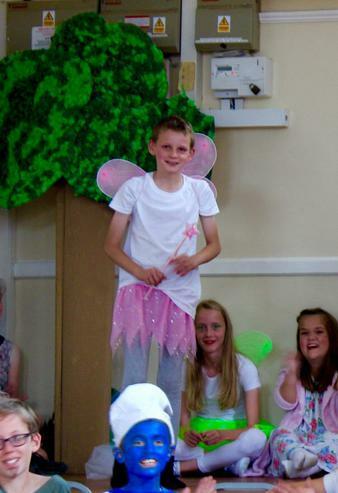 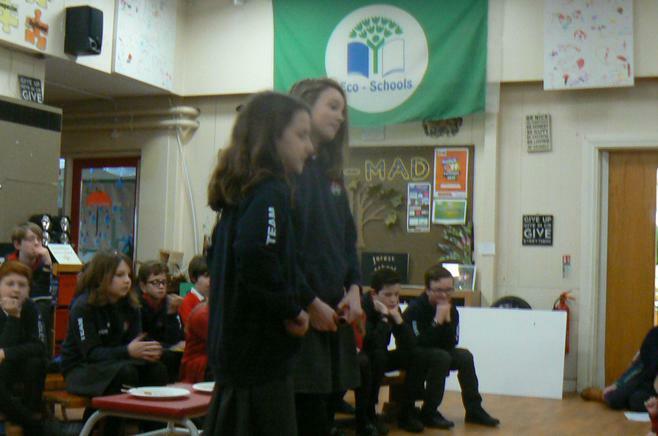 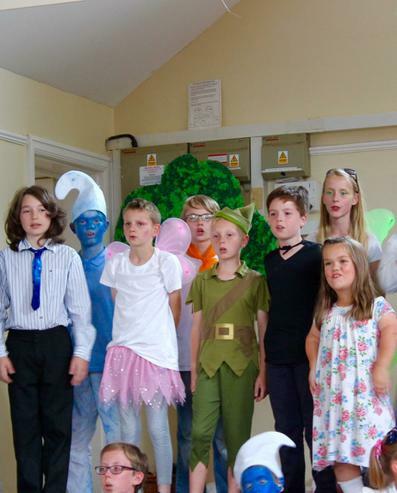 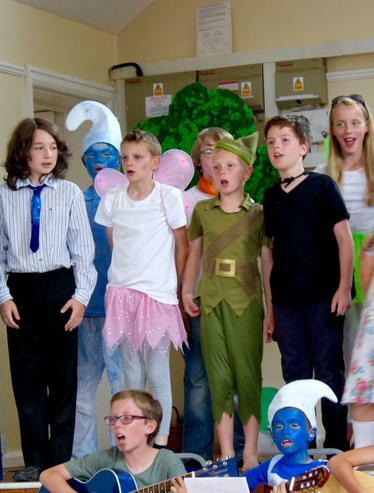 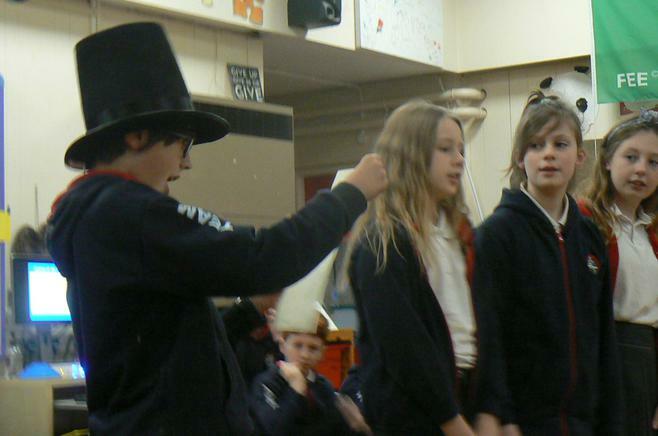 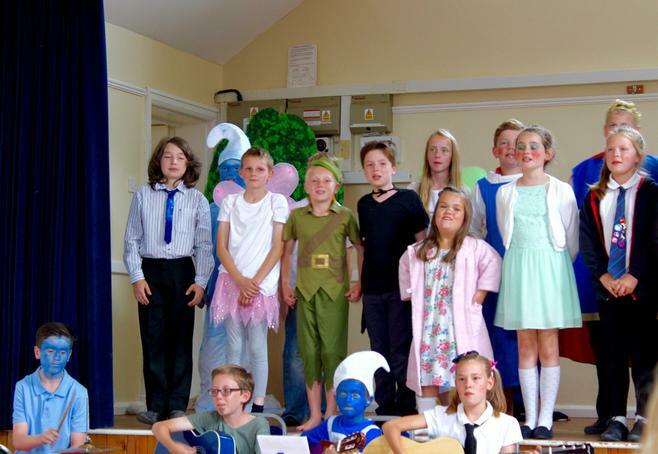 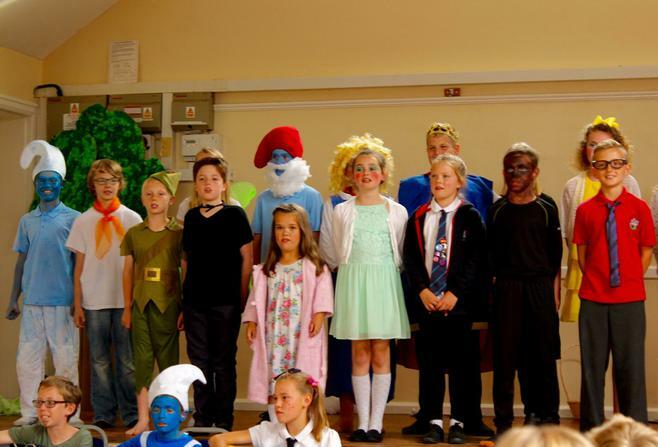 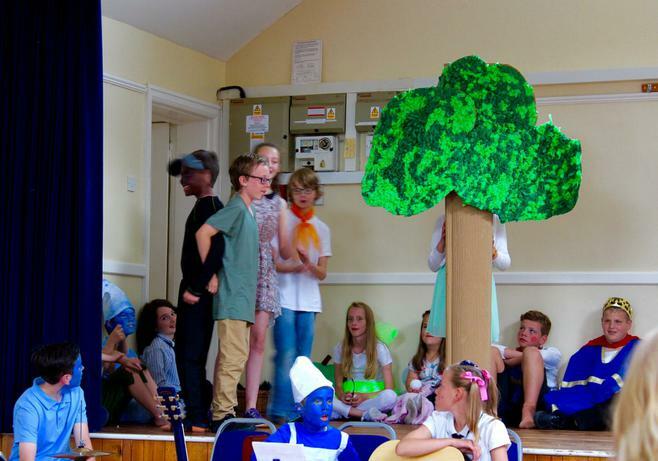 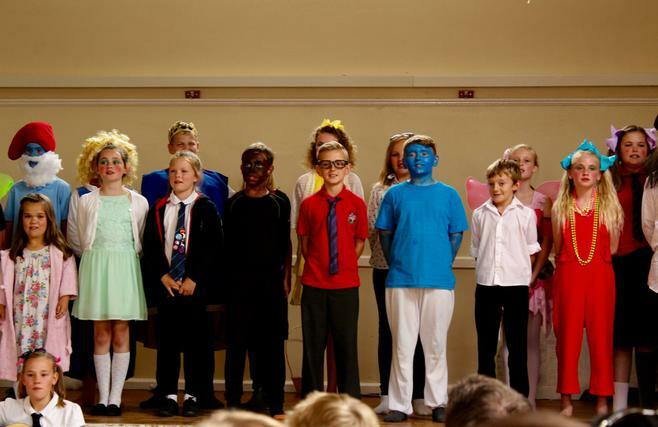 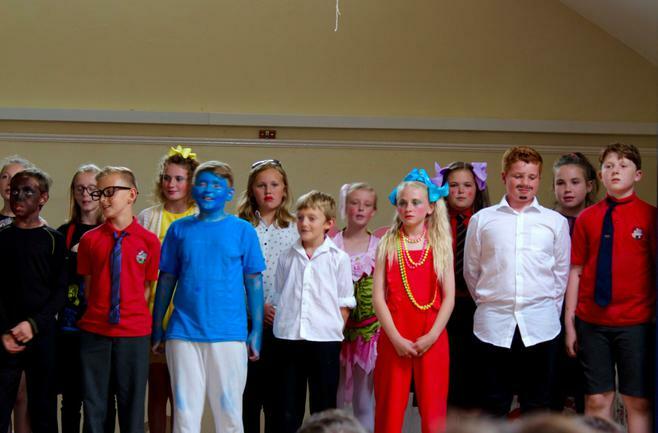 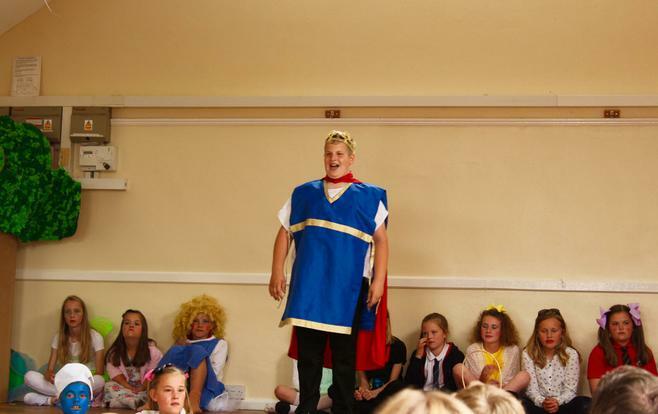 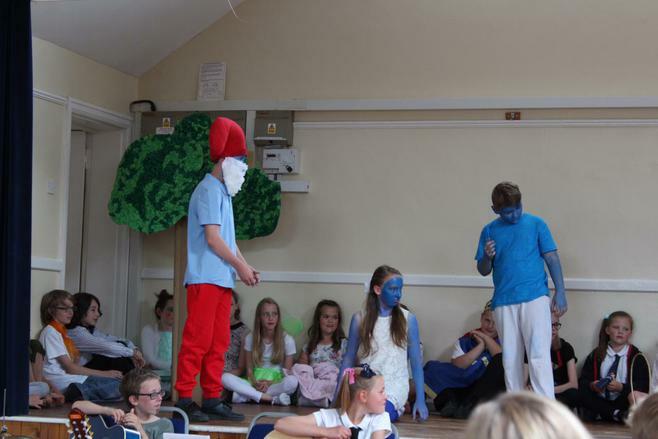 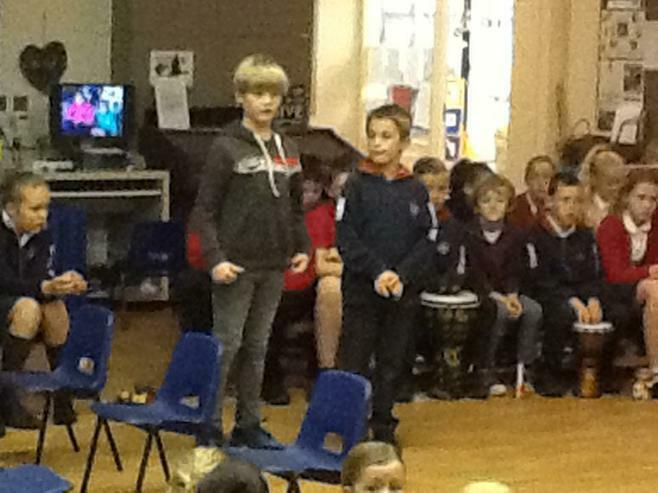 All of the performances were enjoyed by their parents, friends, peers and teachers. 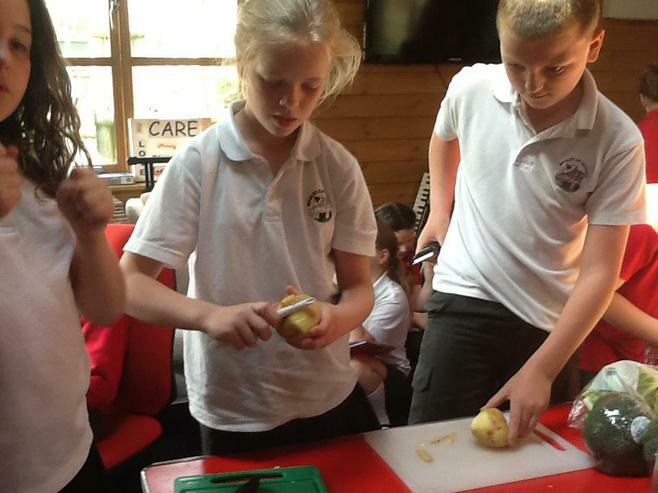 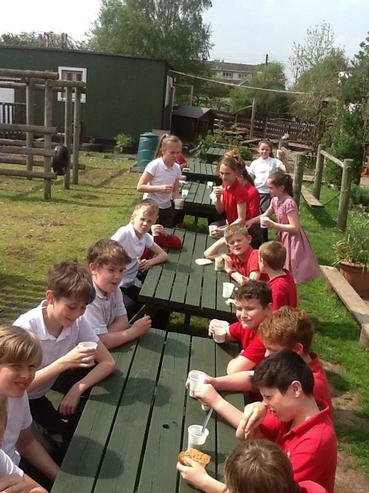 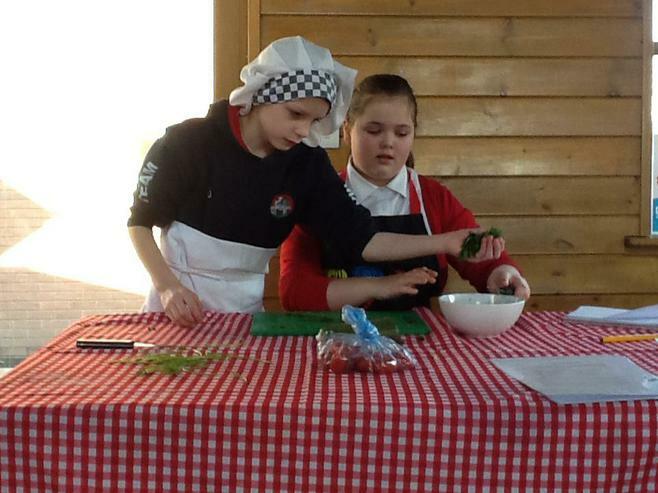 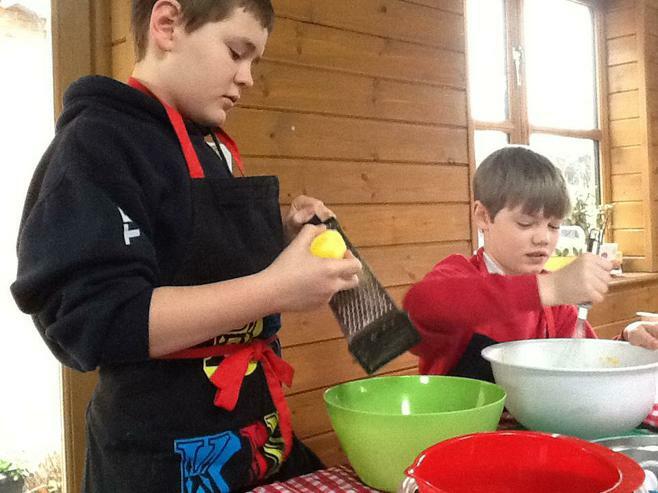 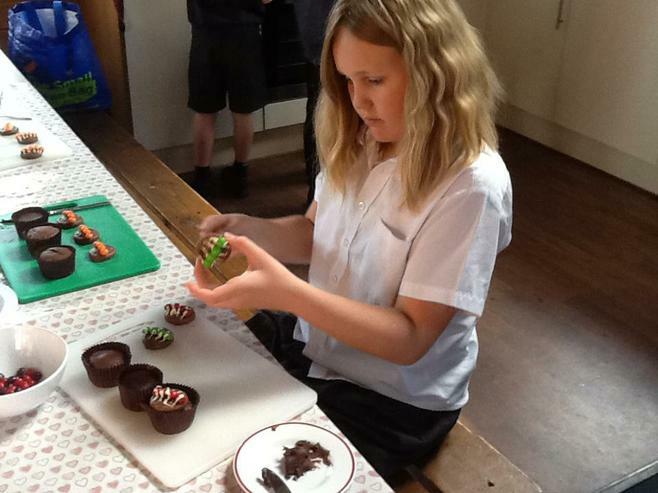 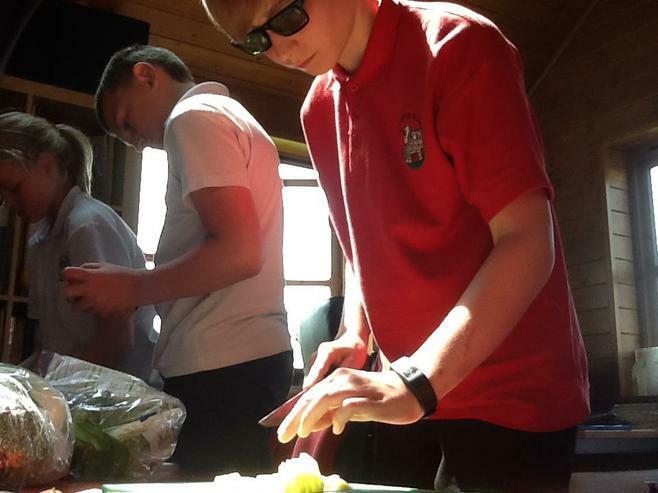 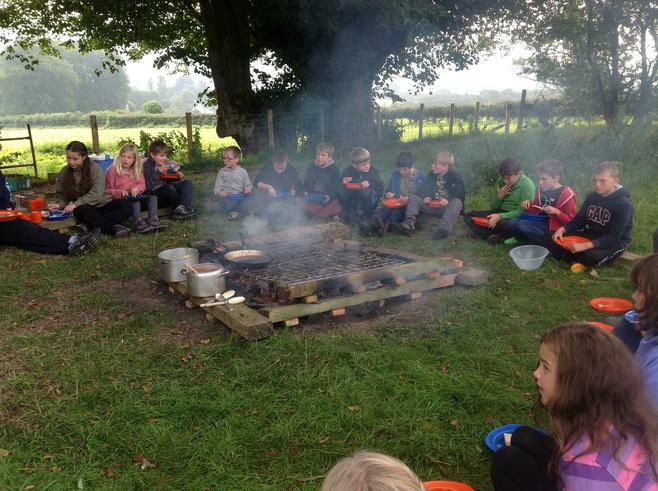 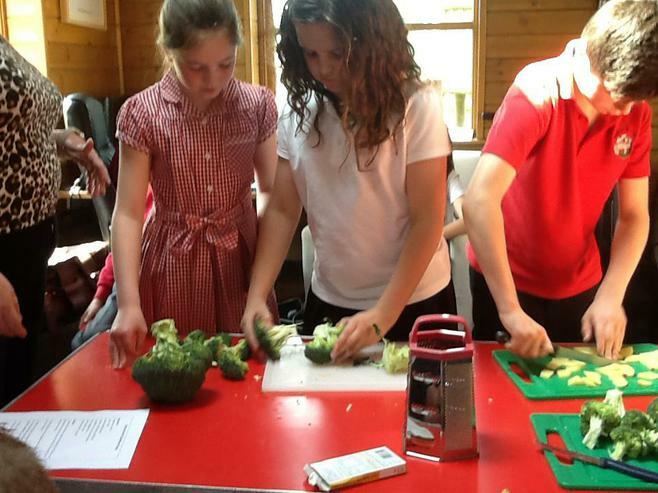 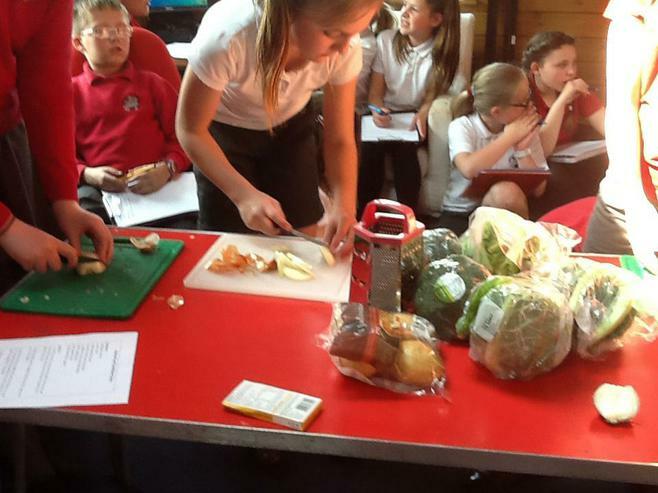 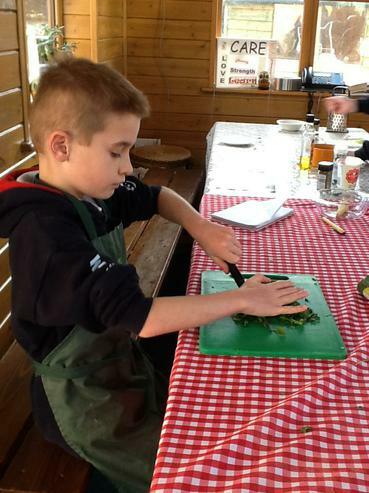 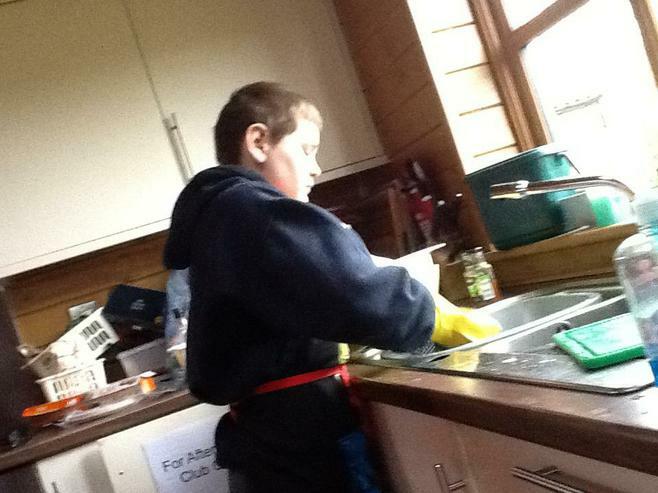 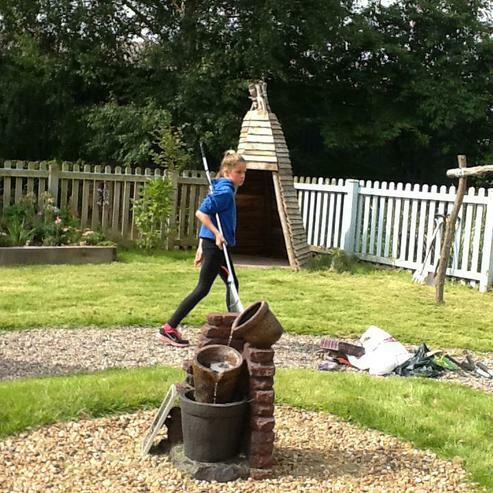 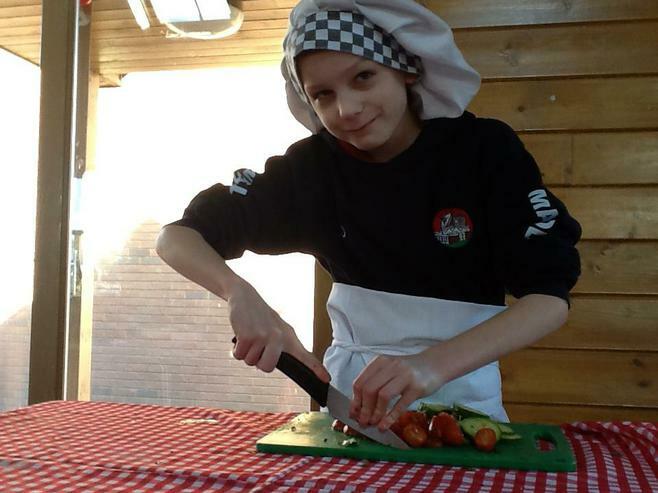 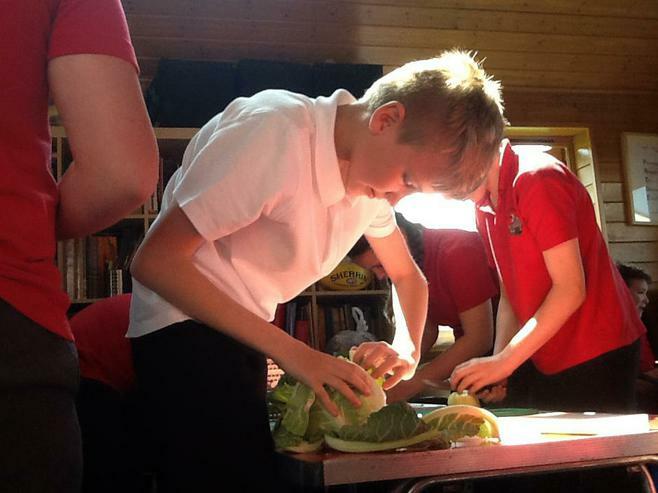 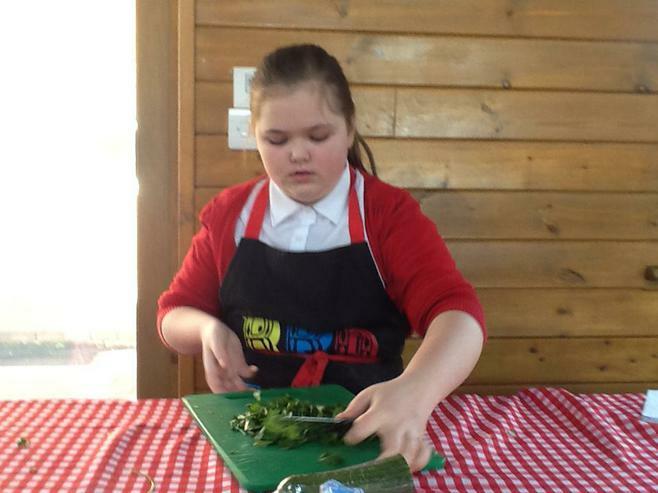 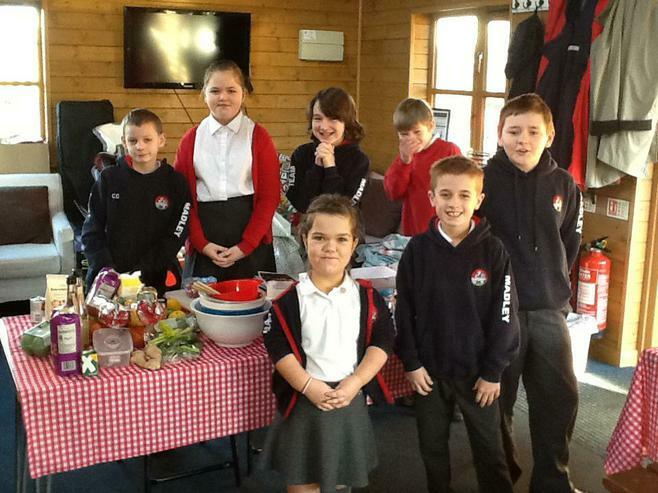 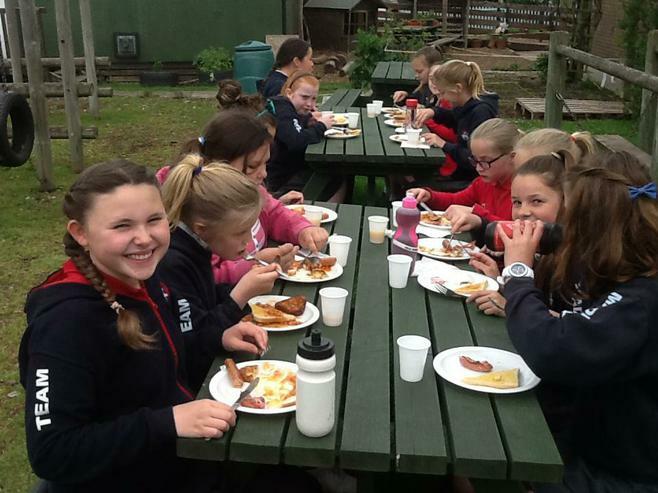 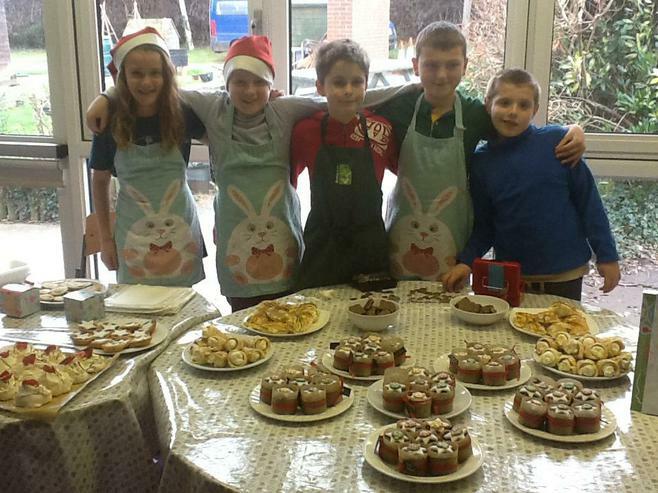 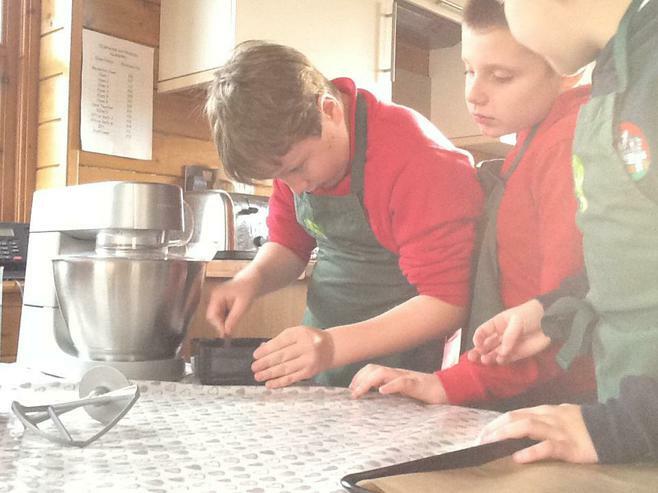 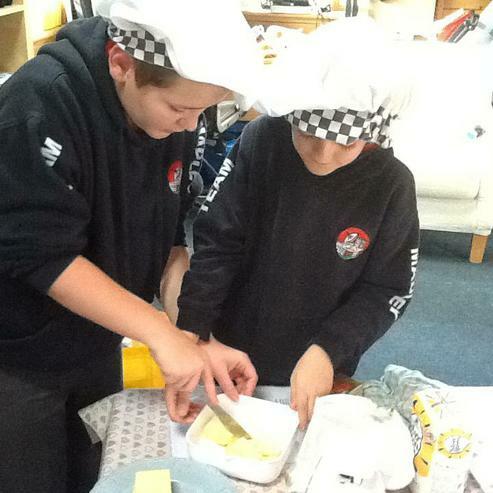 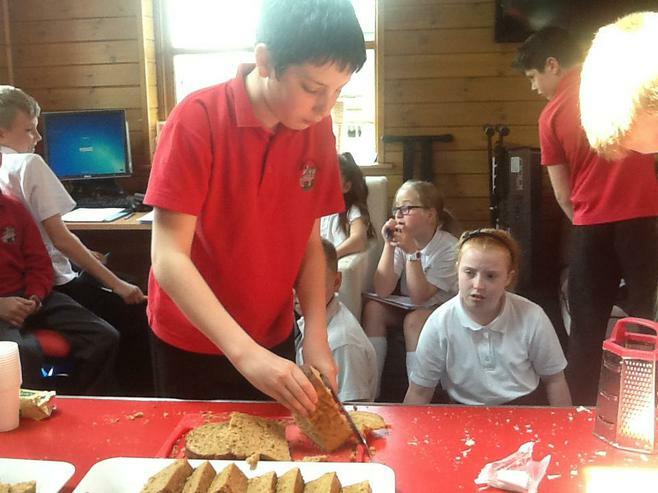 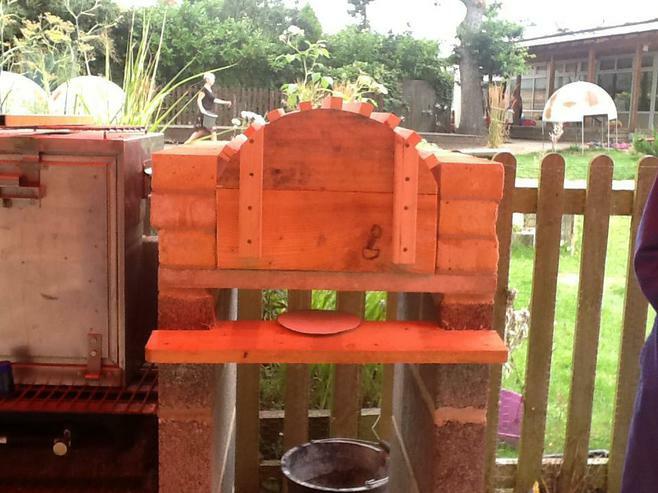 Year 6 have been working exceptionally hard to achieve their outdoor kitchen and have exceeded their expectations. 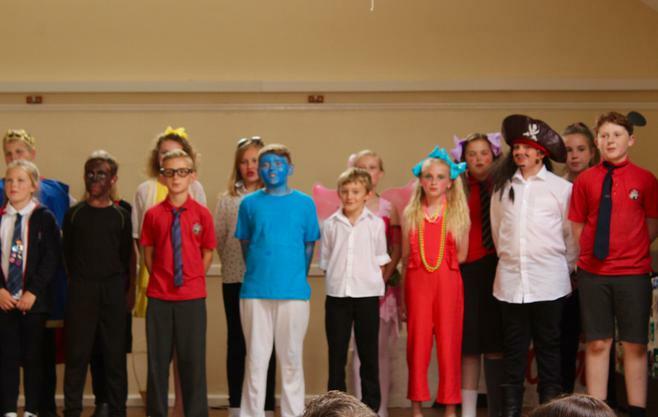 This was achieved through the determination and teamwork that has been shown by a fantastic Year 6 class. 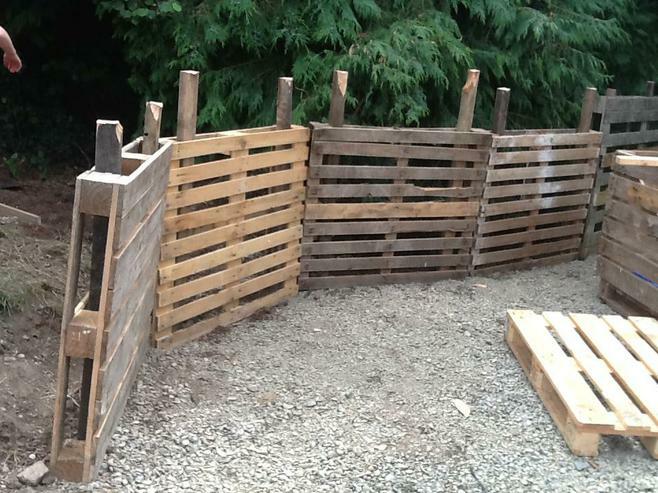 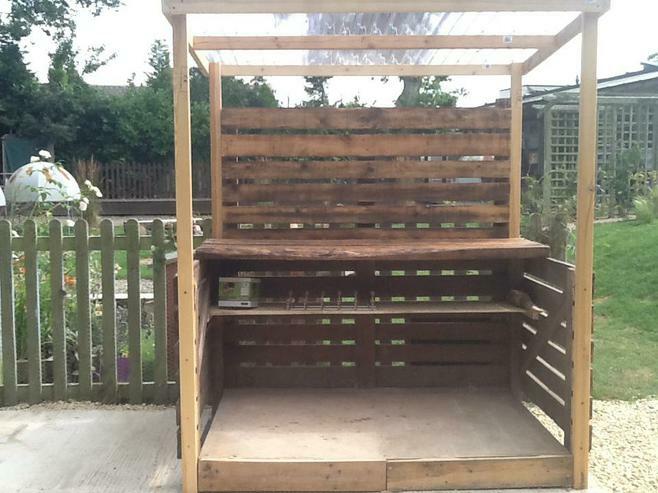 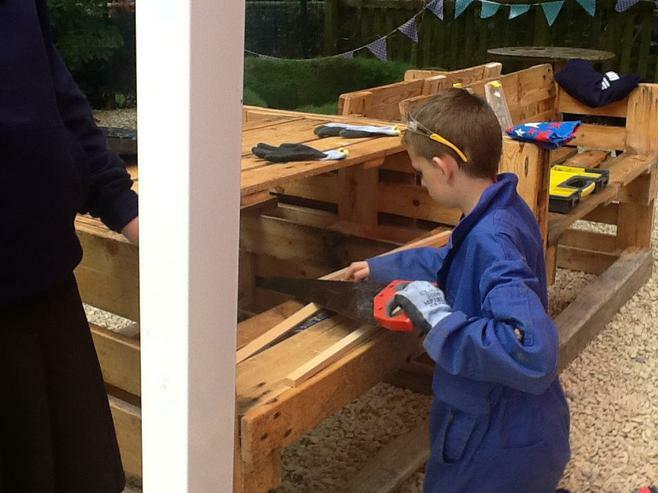 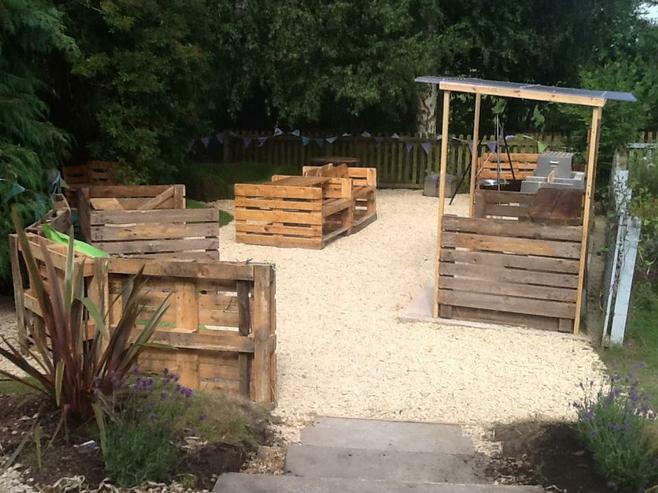 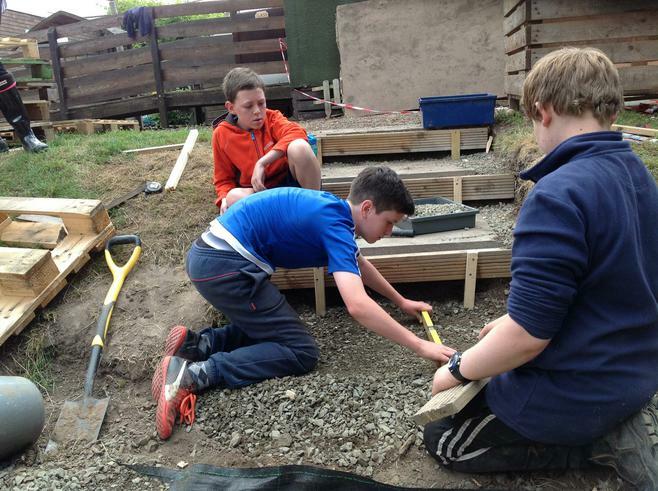 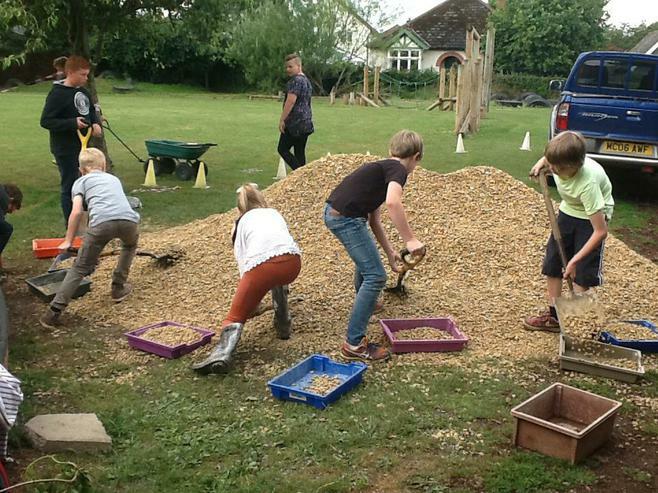 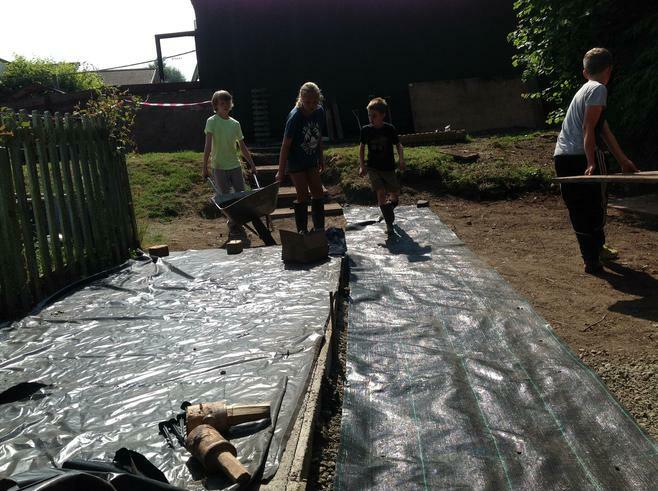 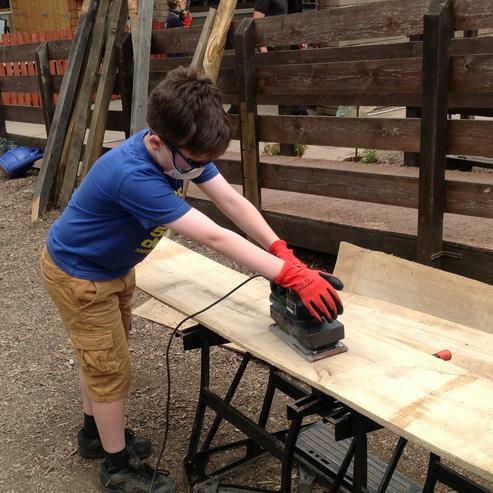 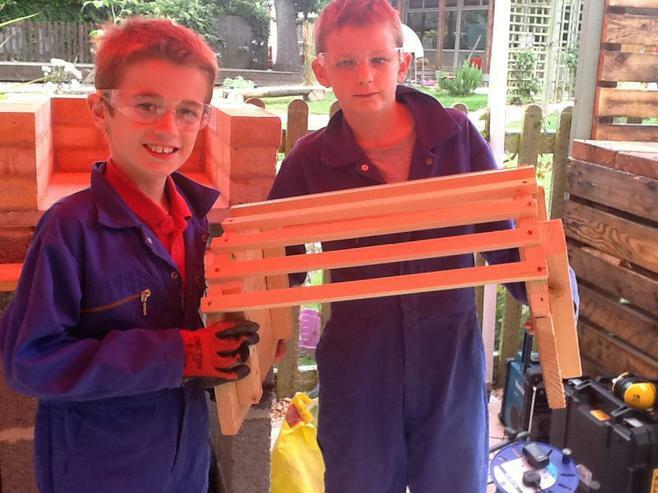 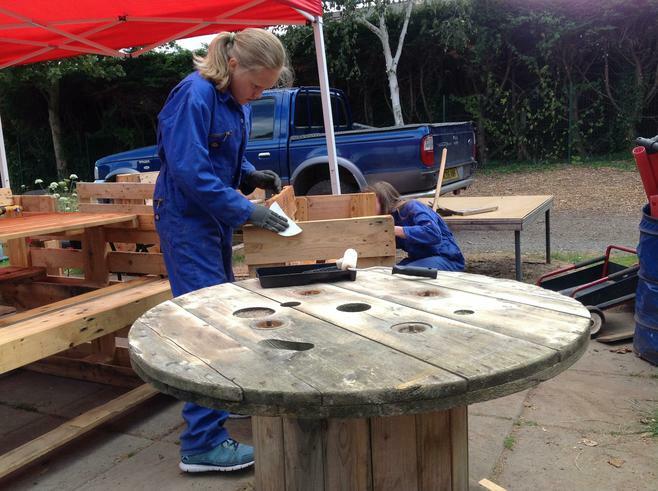 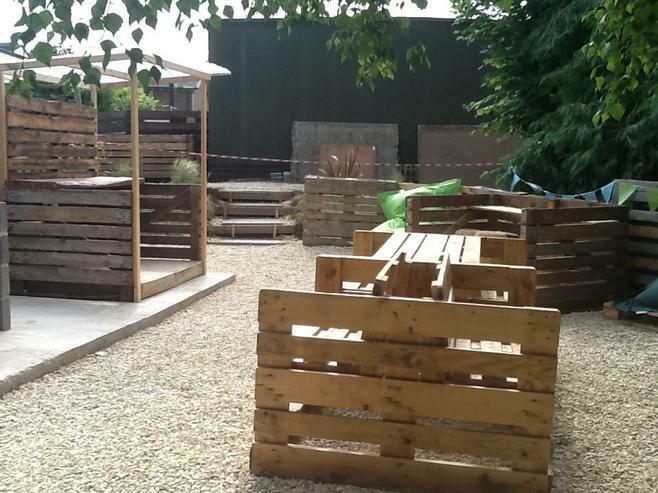 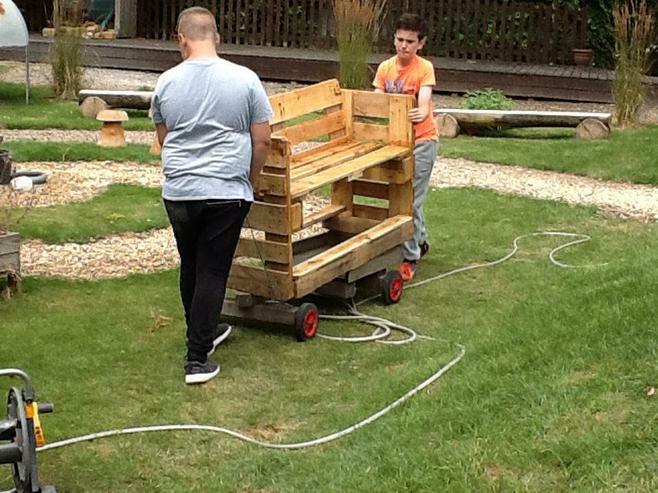 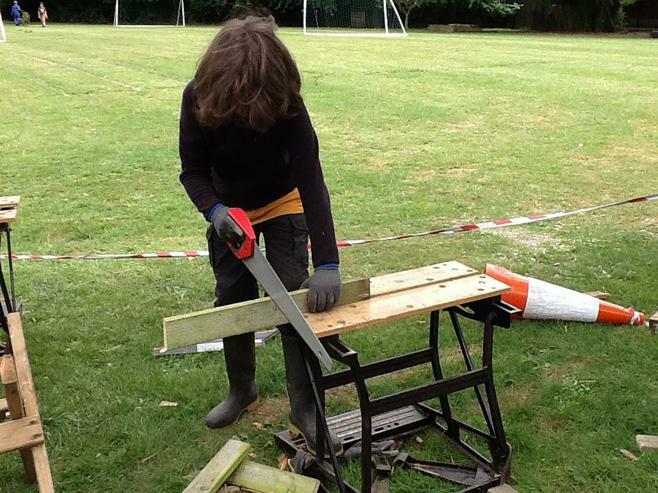 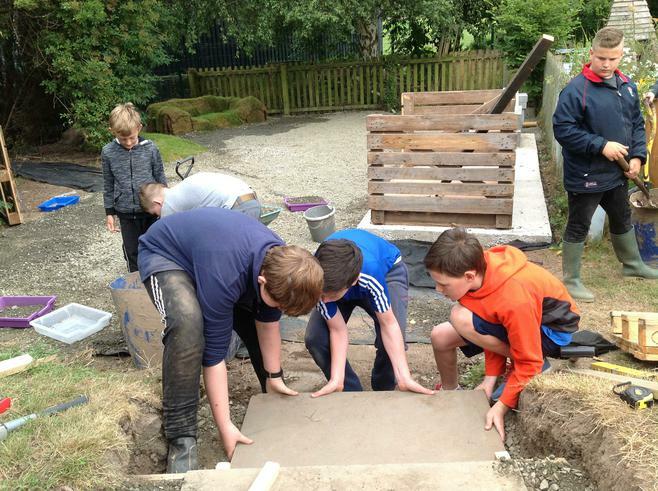 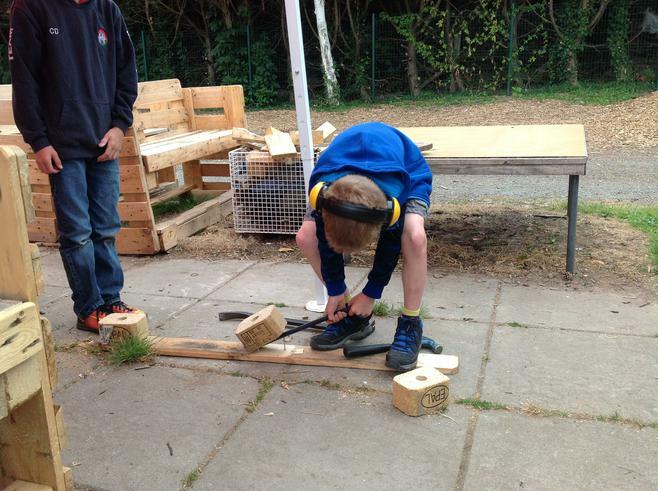 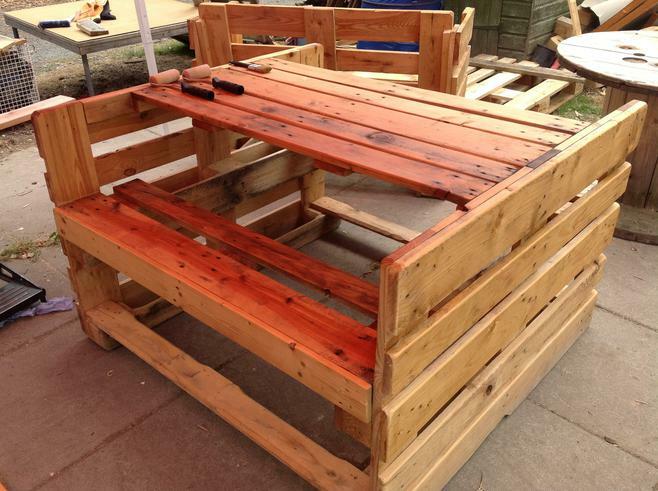 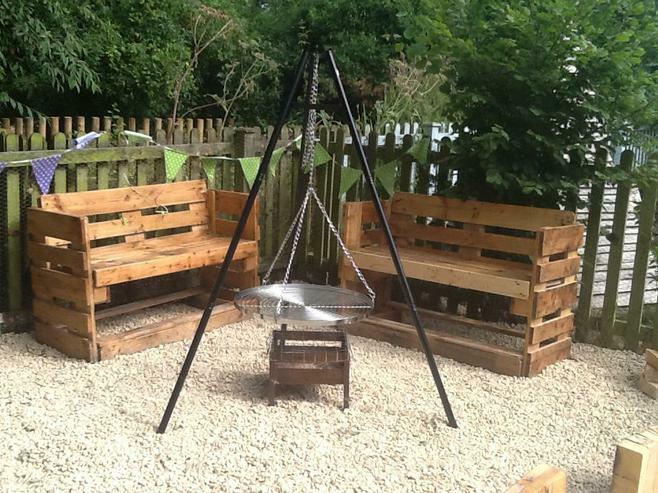 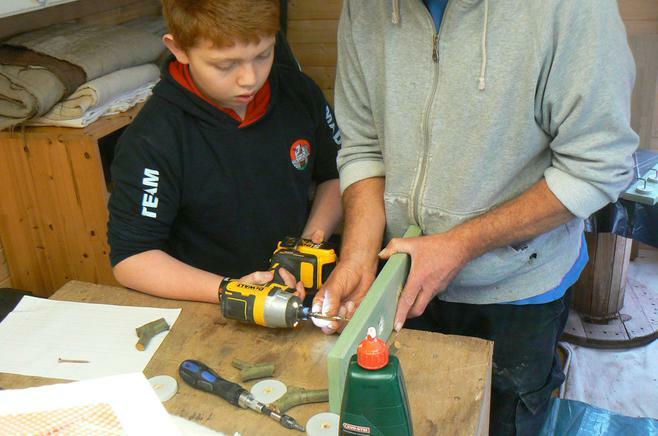 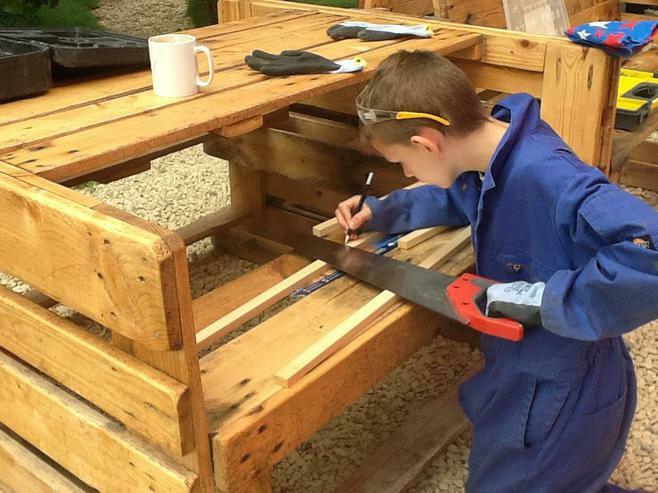 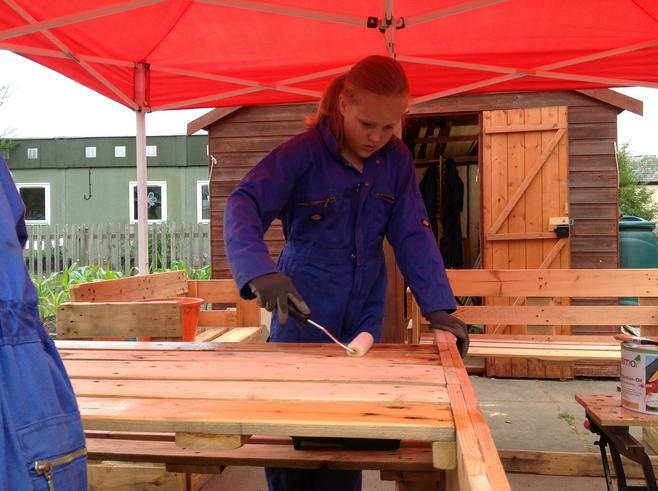 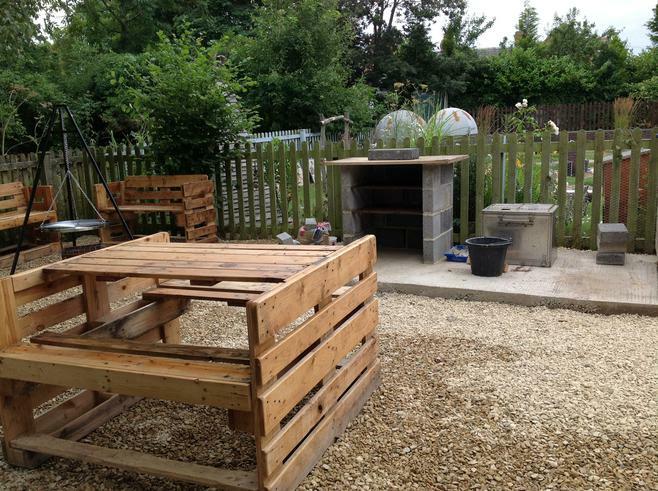 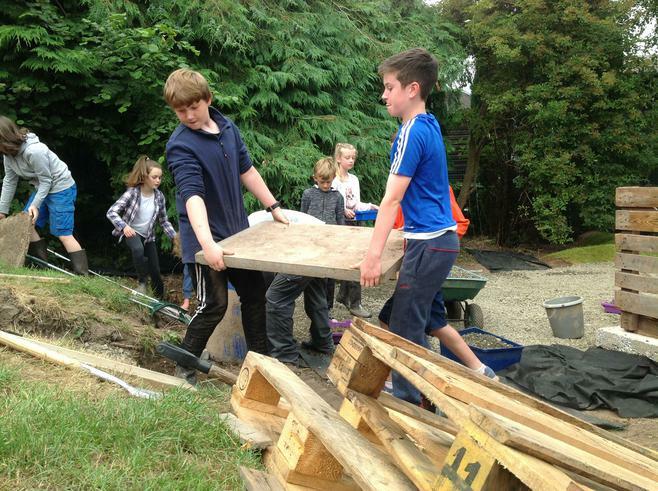 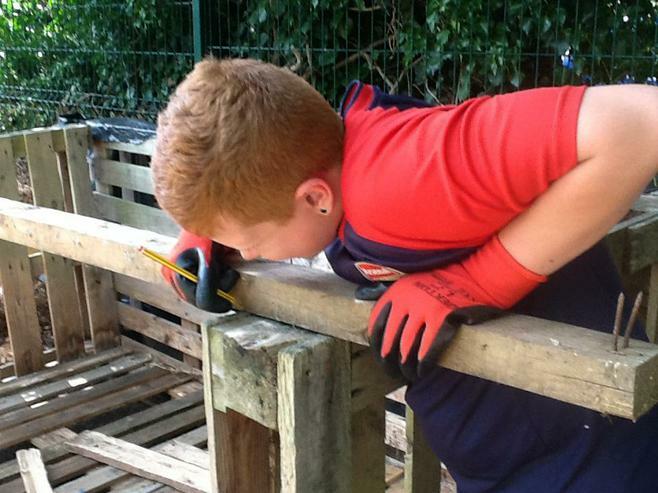 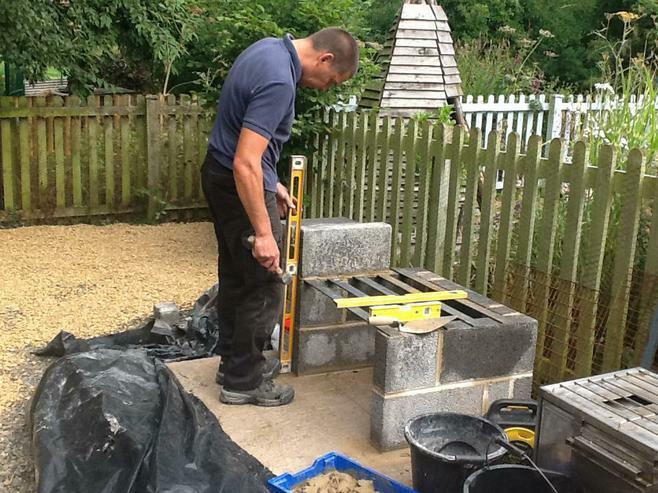 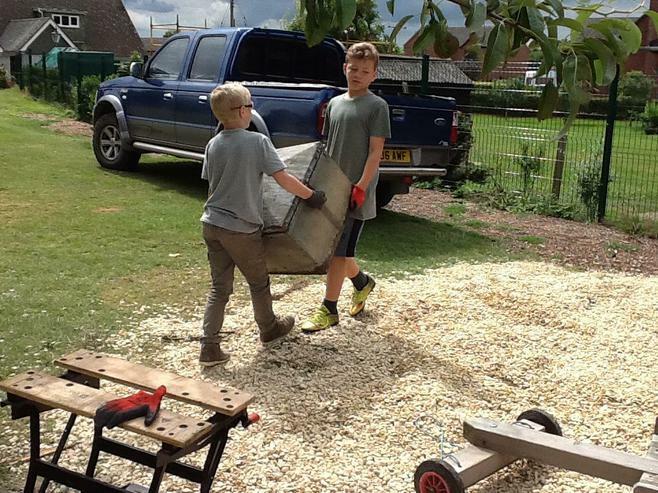 the children have applied their construction skills learnt across the year, their enterprise money and maths ability to build an outstanding outdoor kitchen that will be left as their legacy to the school. 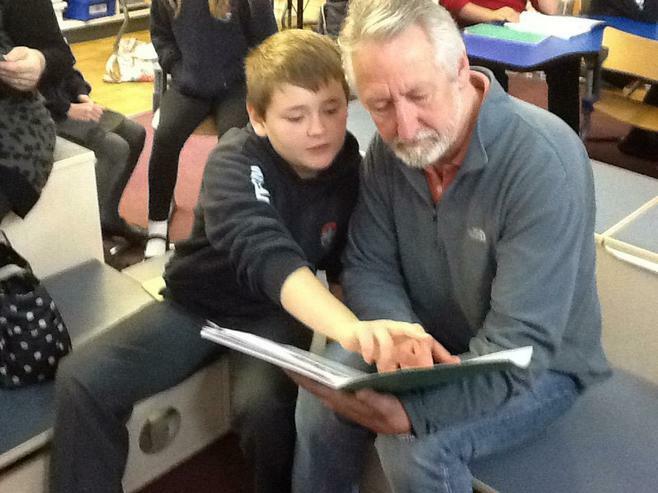 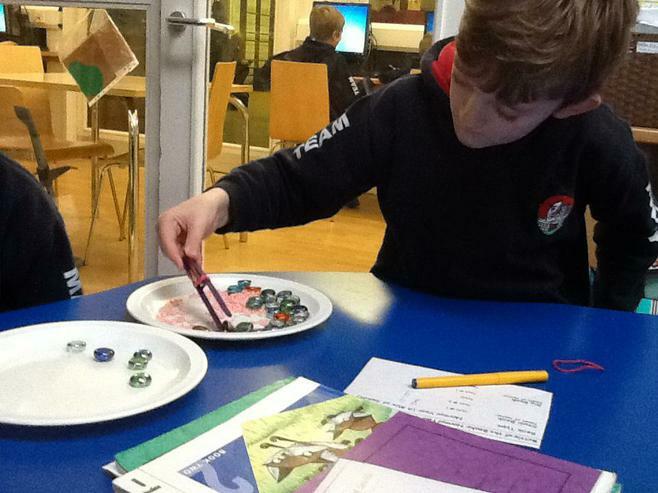 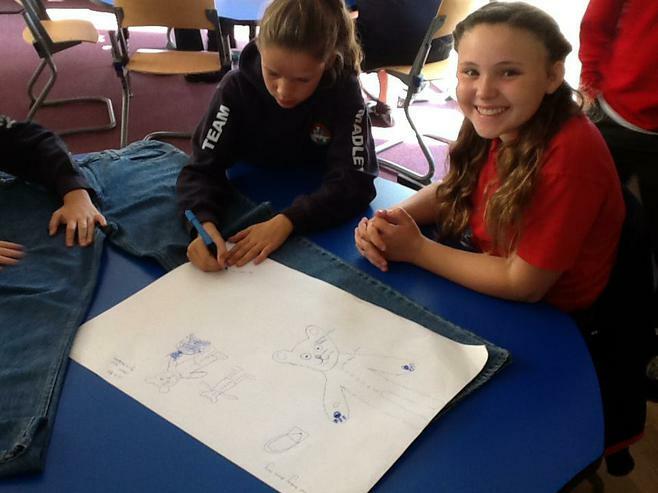 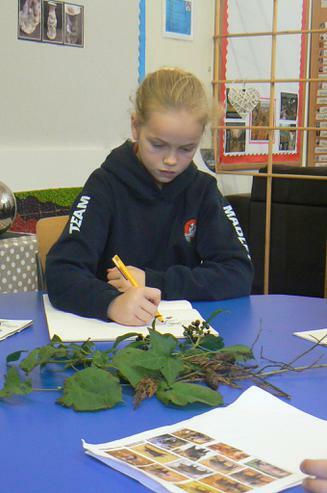 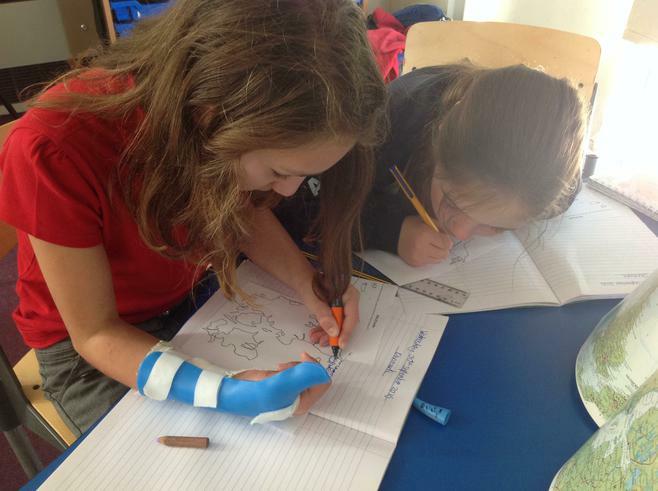 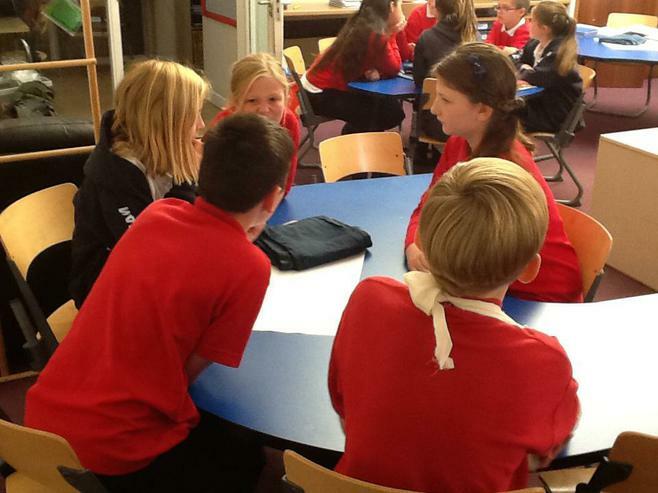 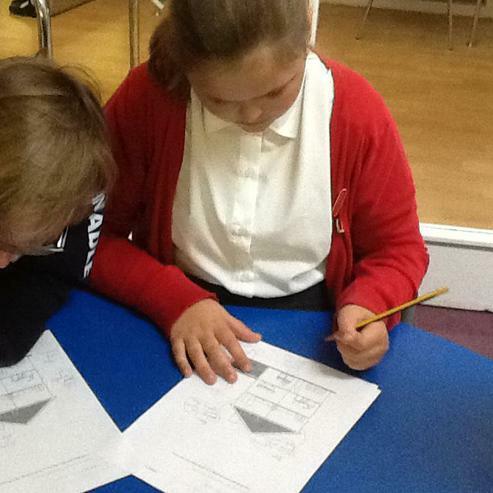 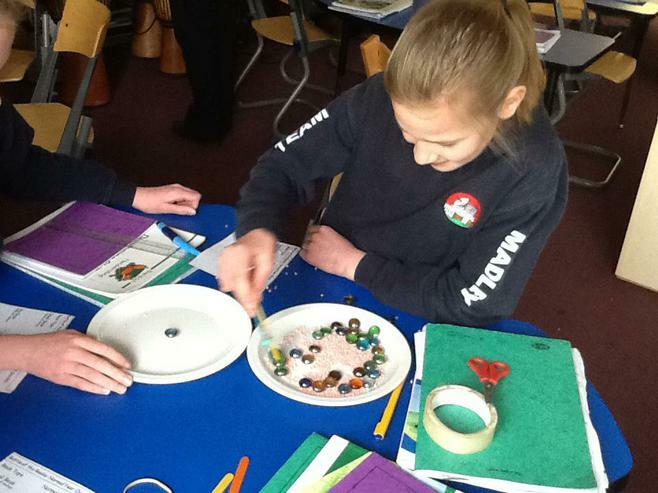 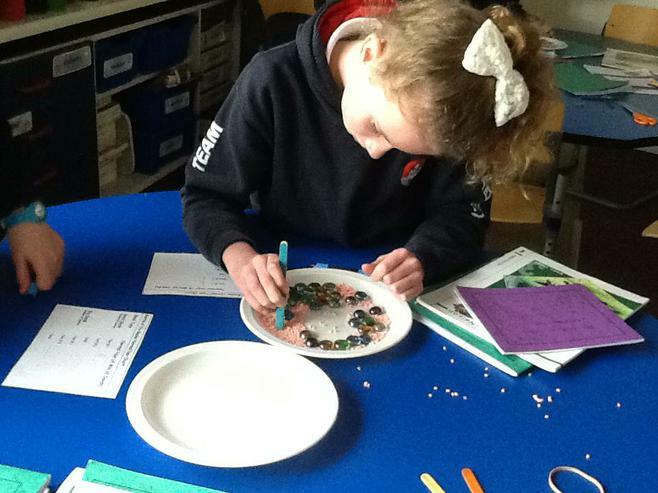 During the evolution and inheritance topic, the children researched Charles Darwin in detail. 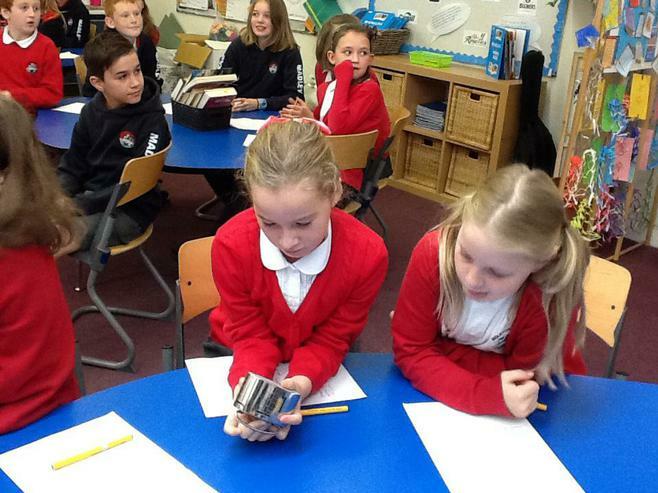 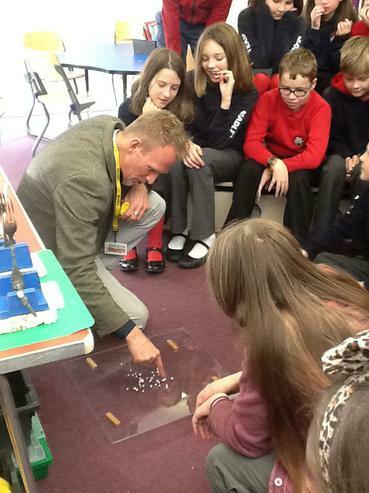 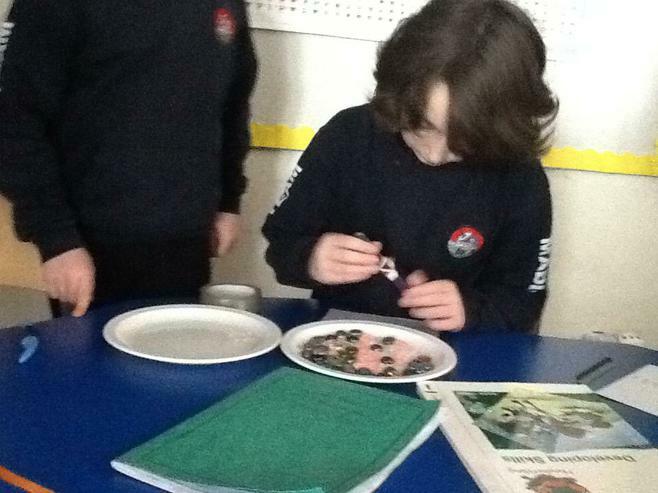 The children became interested in him after investigation finches found on the Galapagos Islands. 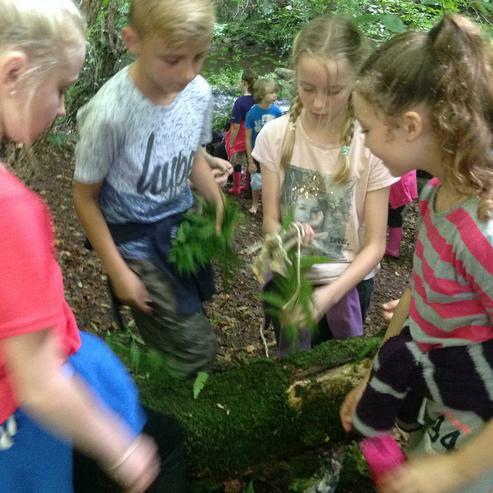 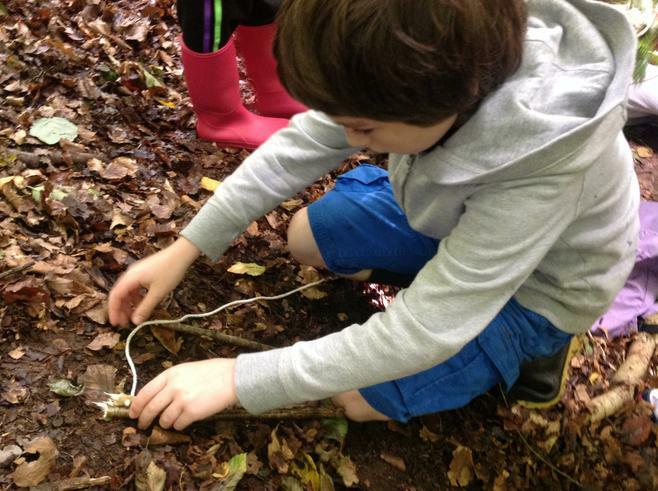 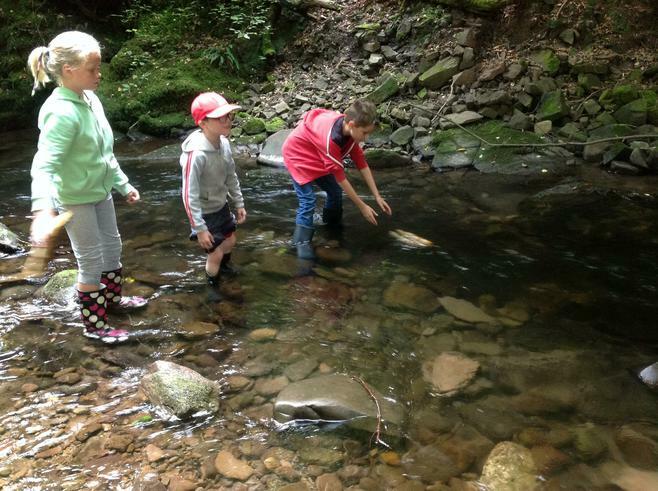 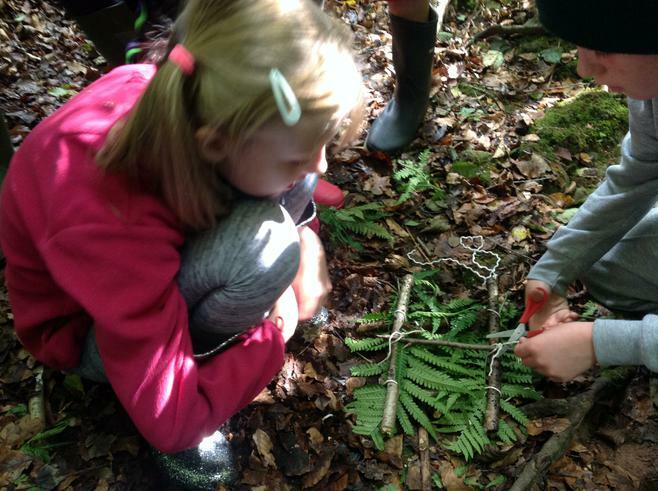 The children carried out an investigation into how changes in the environment force animals to evolve if they are to survive. 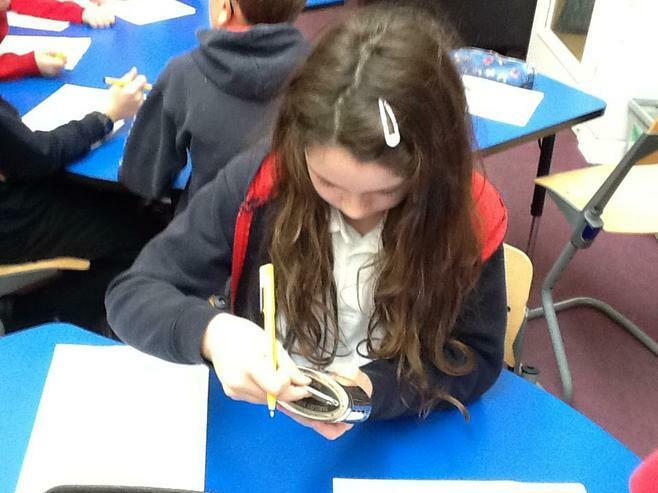 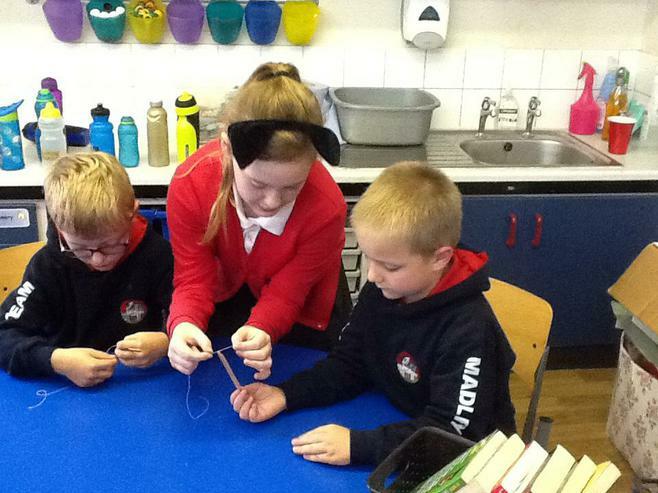 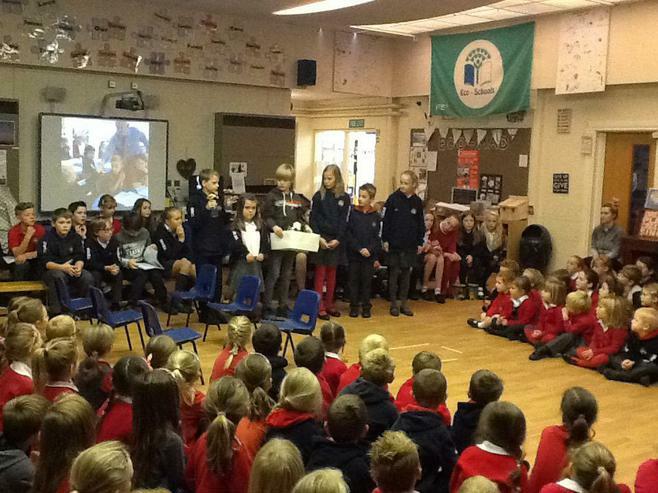 After this, the children wrote some fantastic biographies for Charles Darwin. 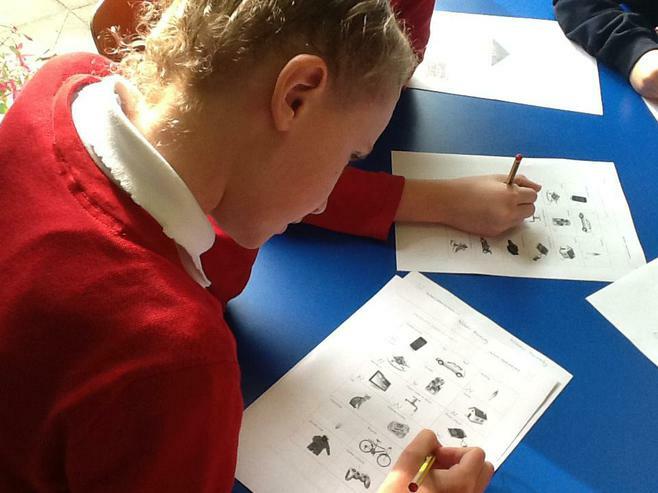 The children drafted the biographies before editing them using word. 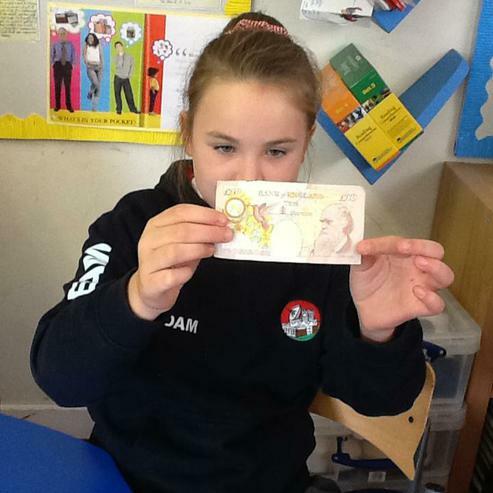 The children found Charles Darwin to be a very interesting person. 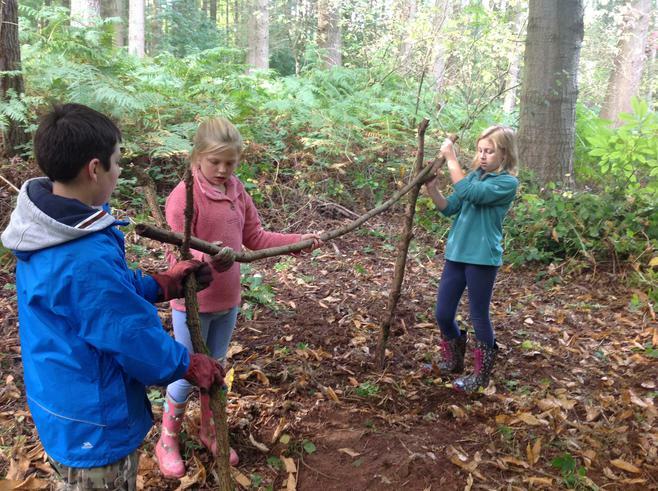 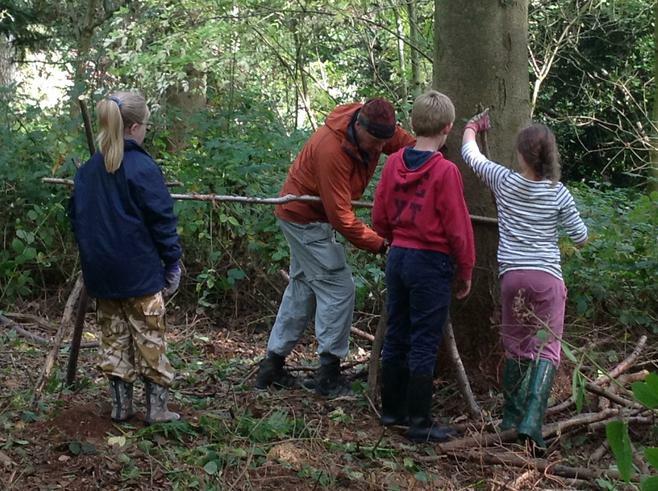 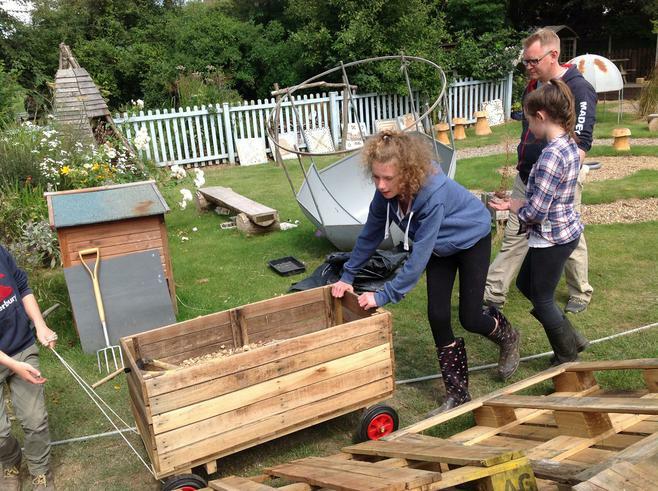 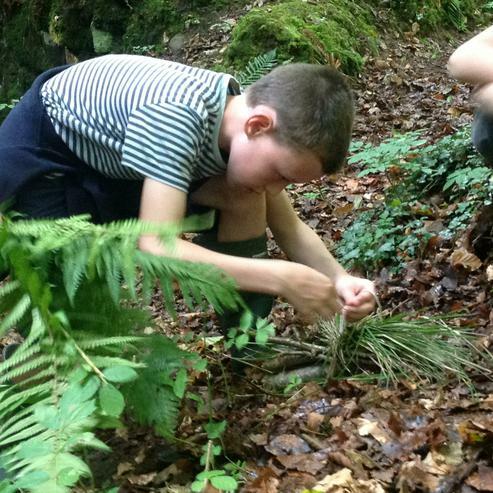 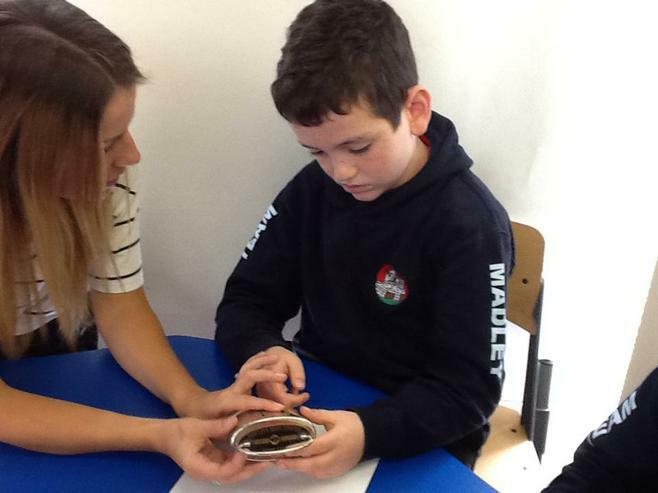 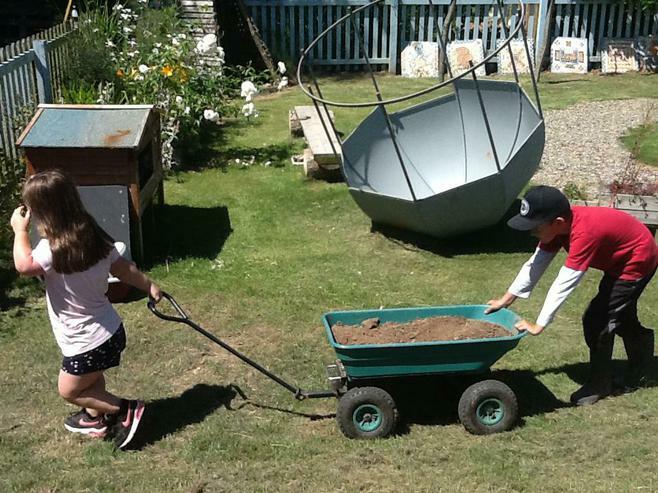 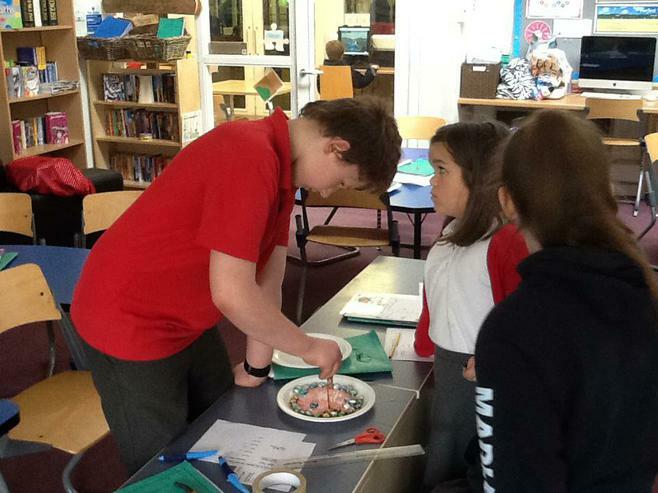 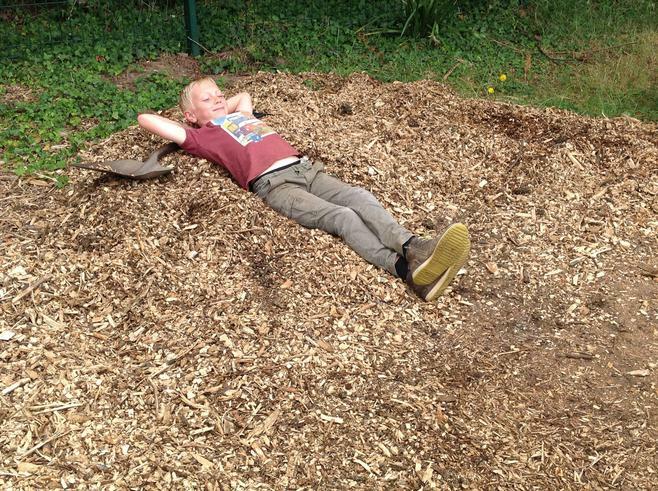 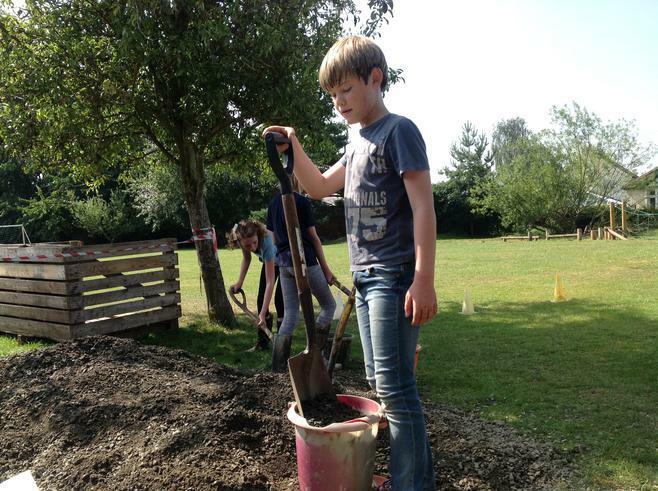 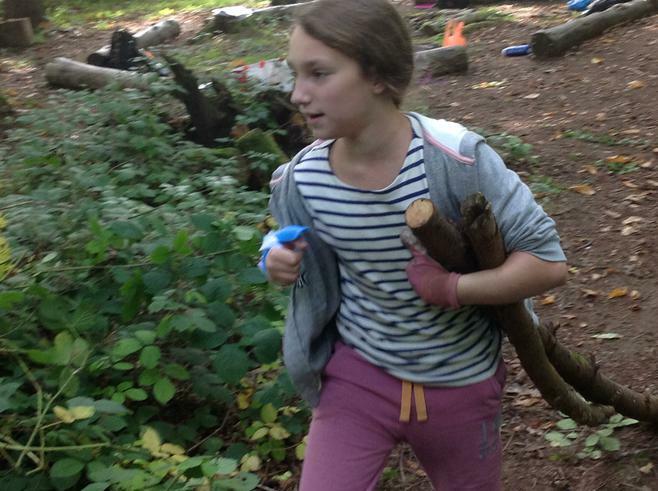 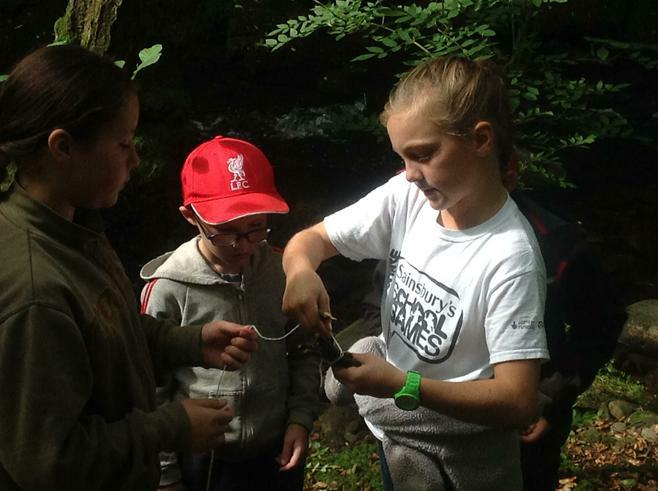 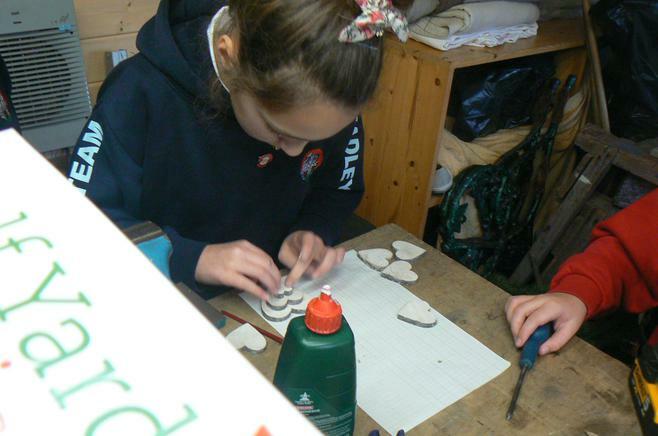 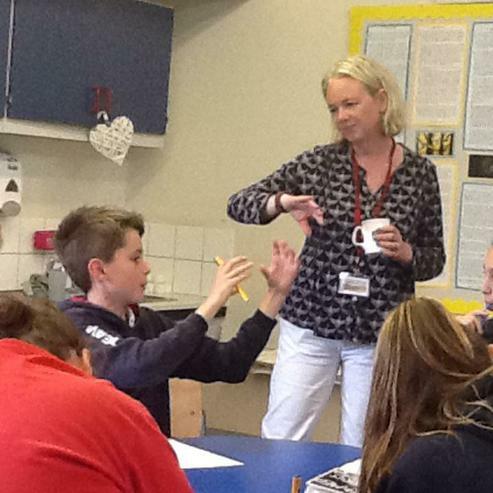 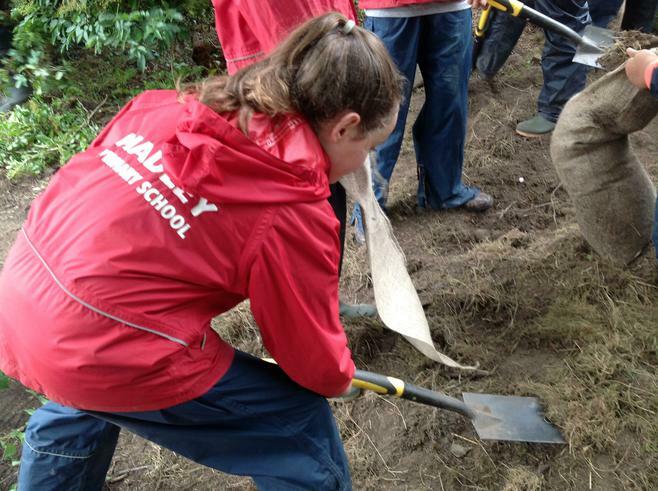 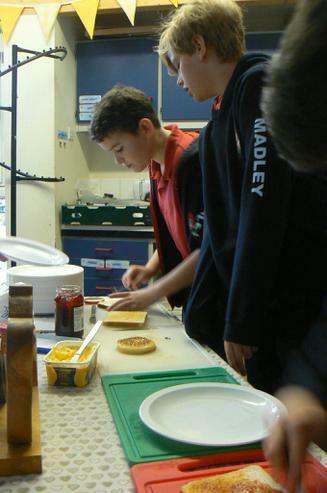 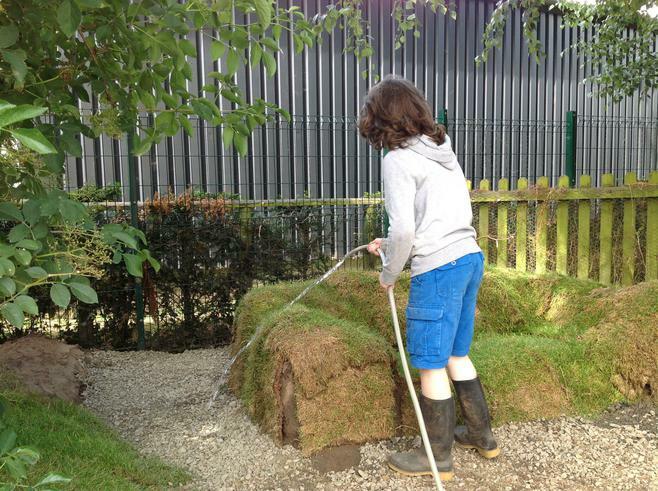 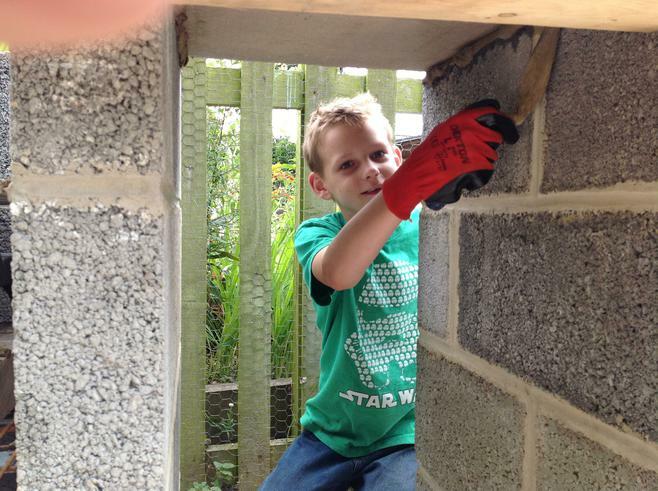 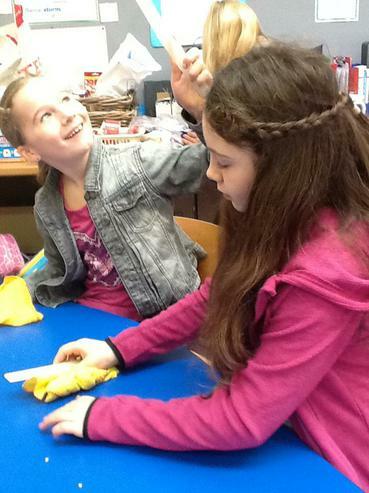 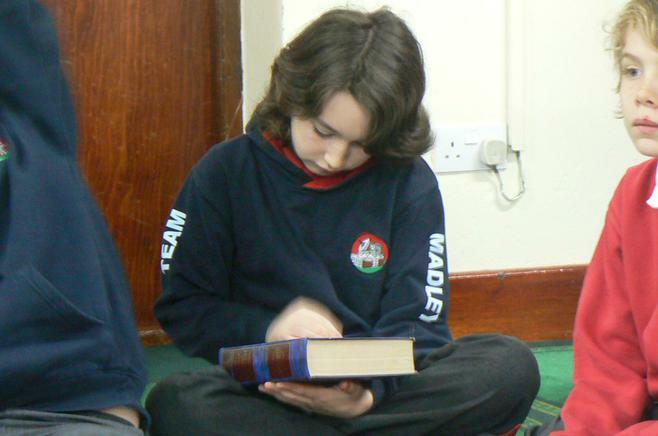 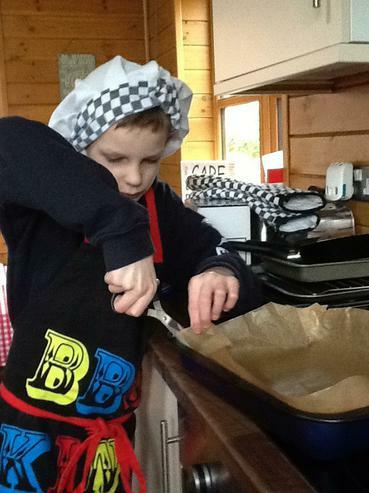 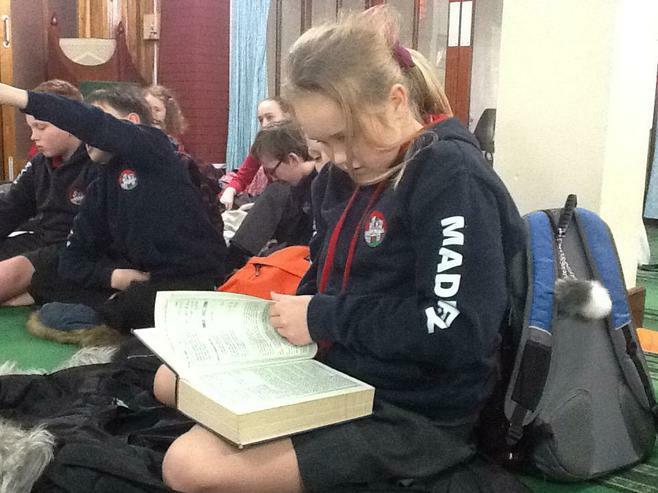 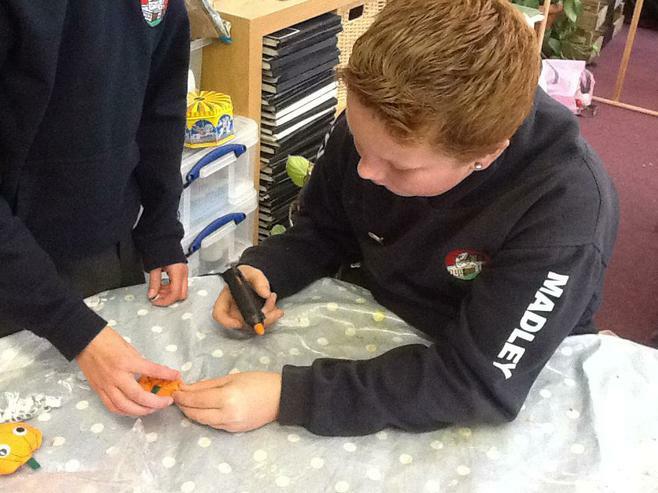 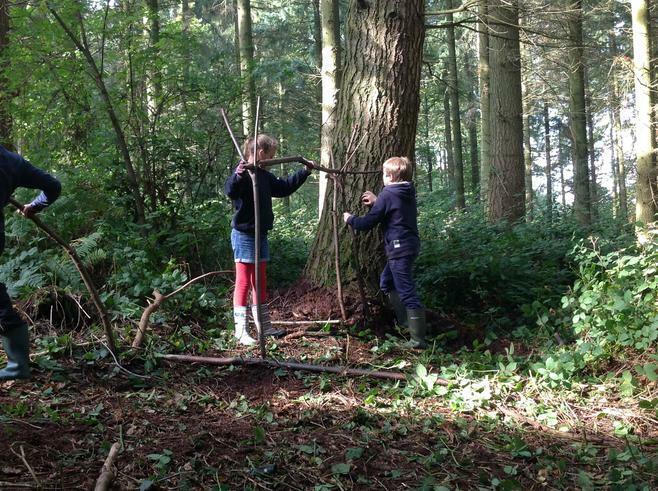 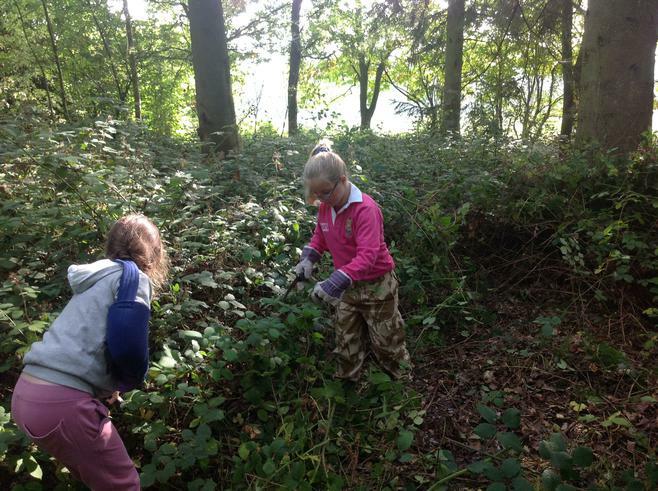 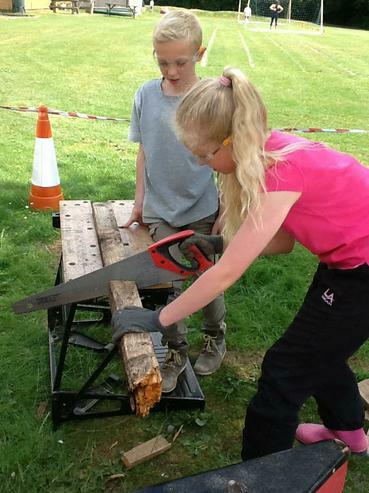 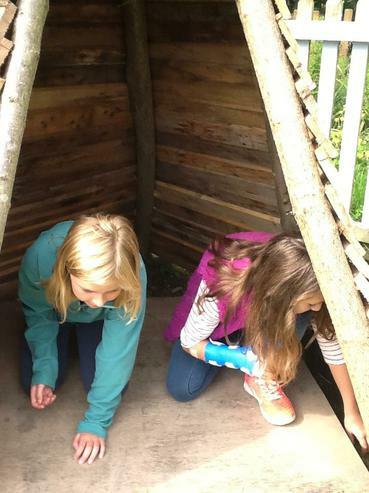 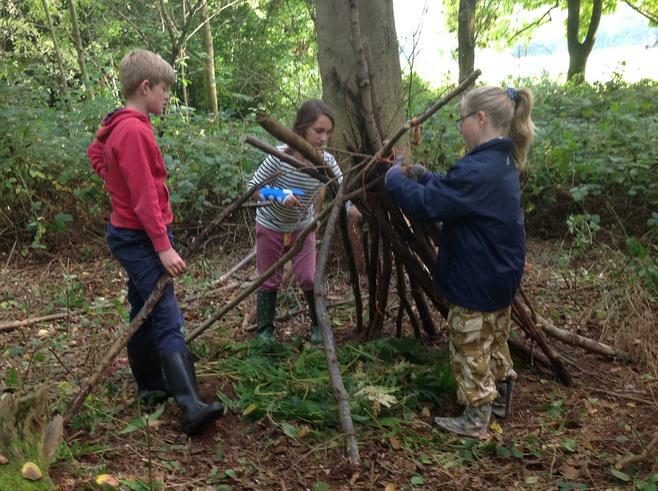 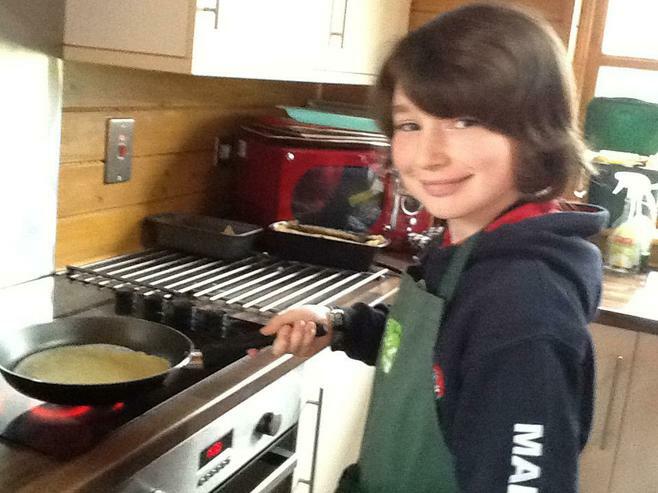 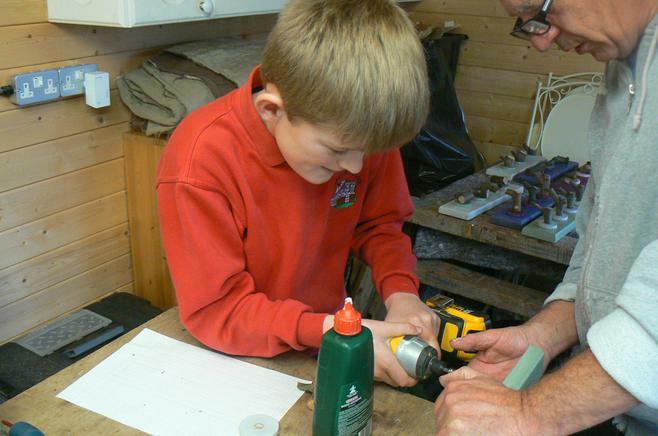 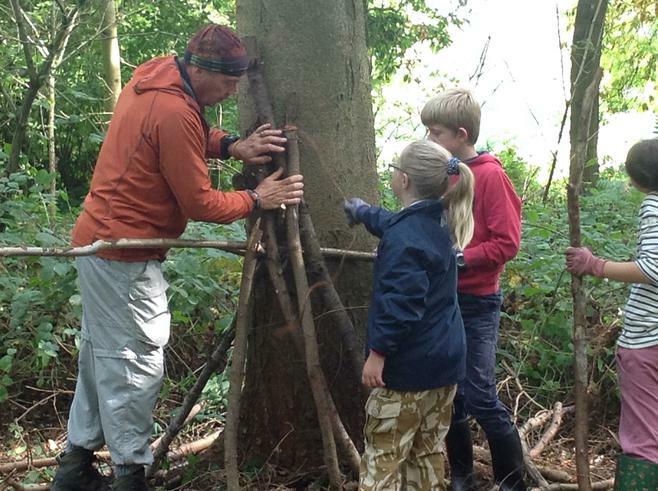 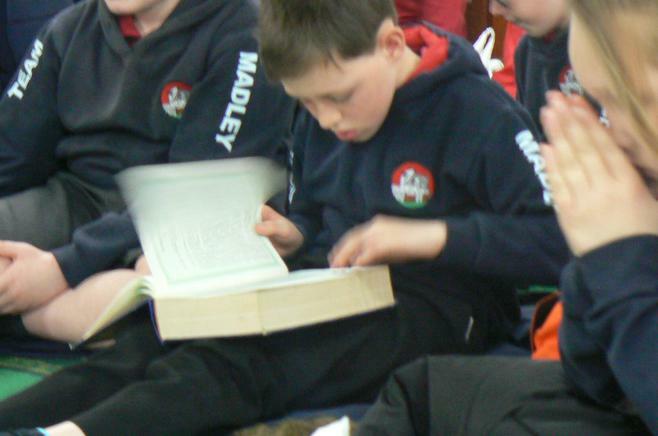 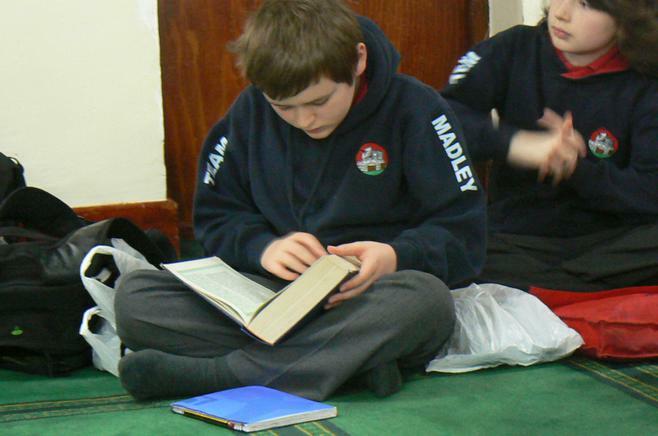 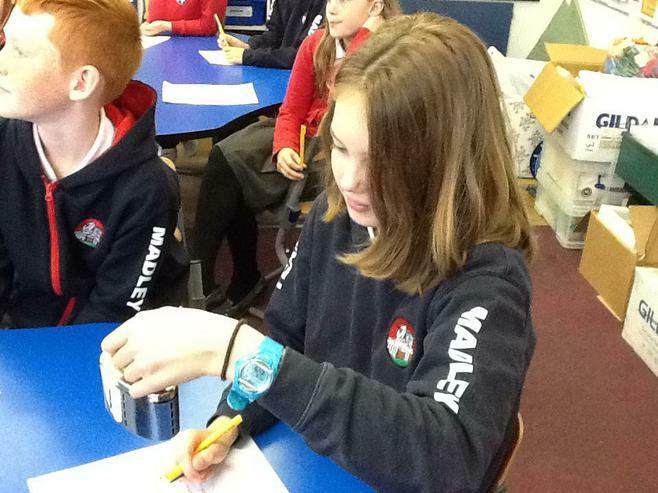 Experiential learning is an important part of the curriculum at Madley and blends seamlessly into our themes. 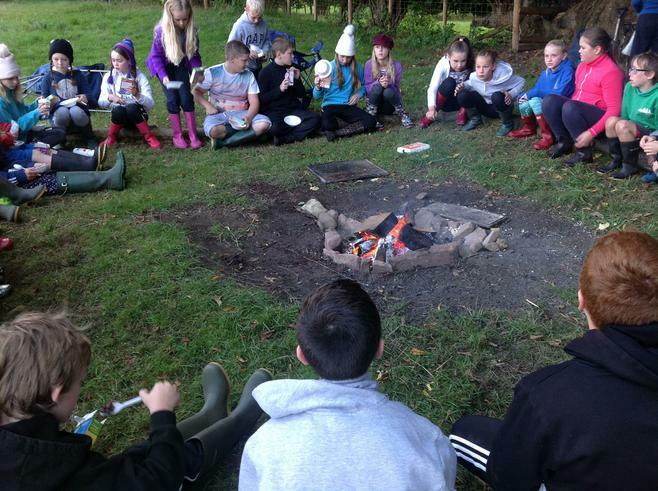 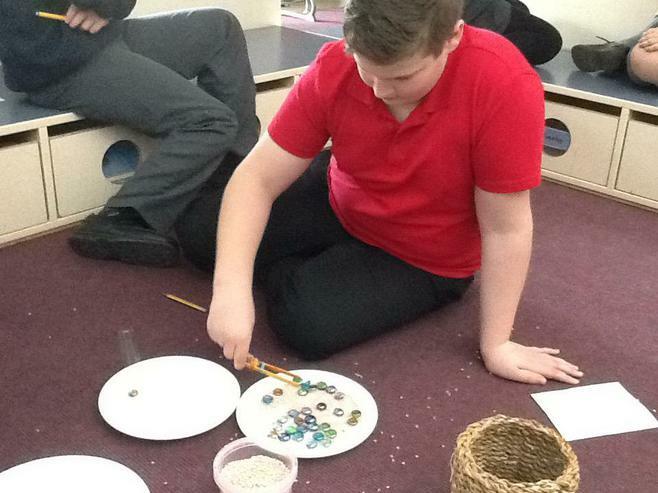 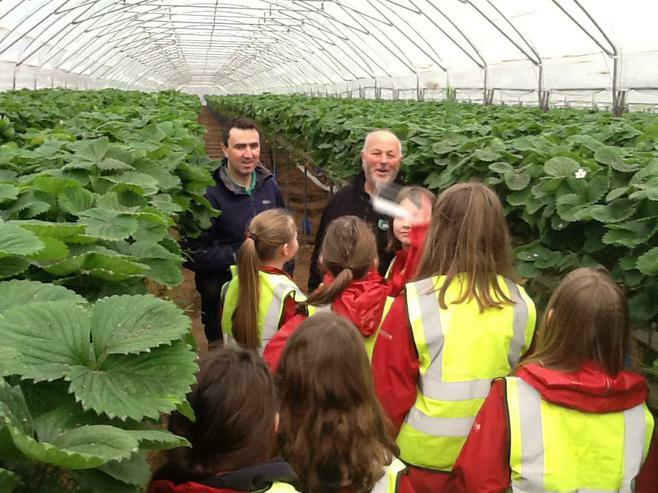 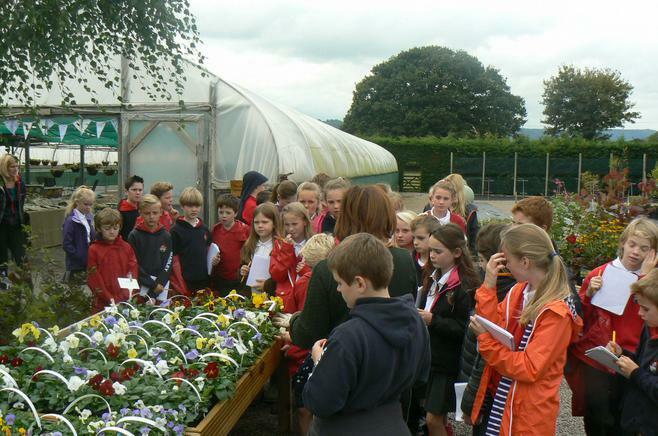 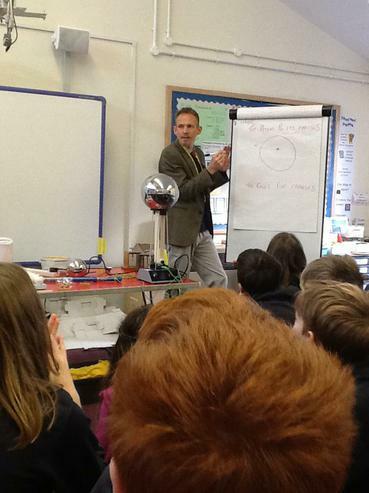 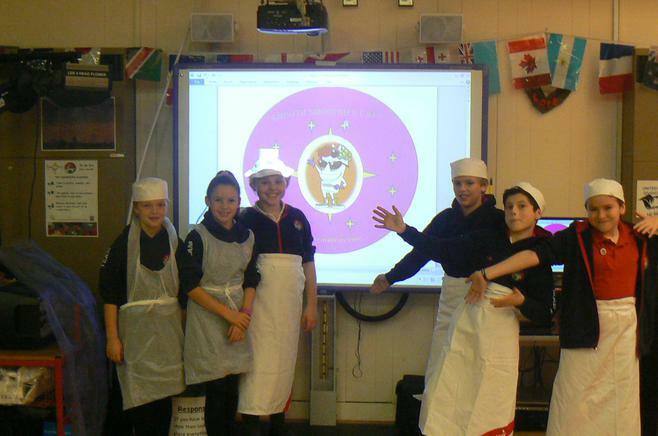 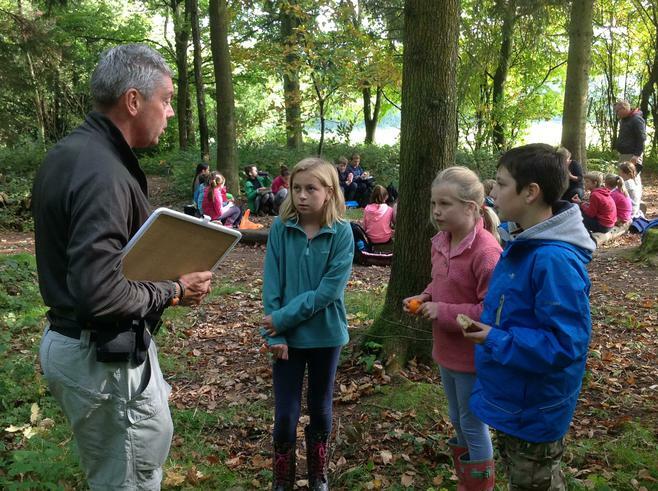 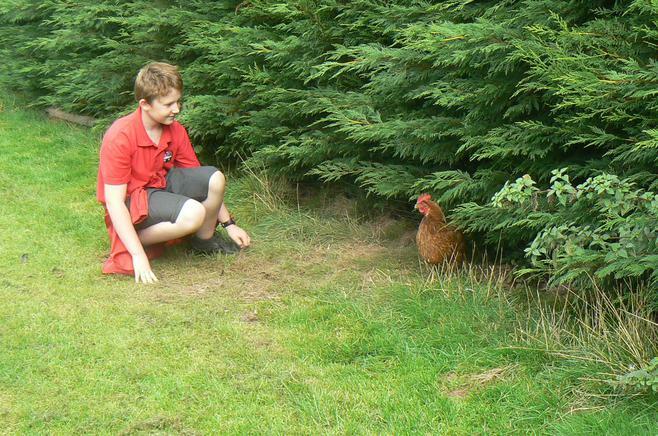 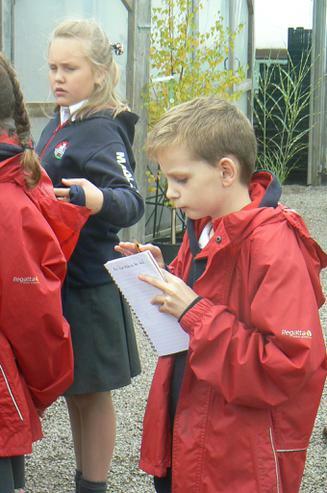 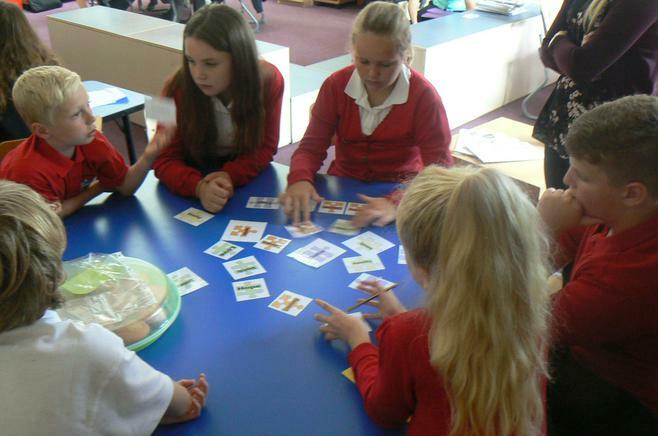 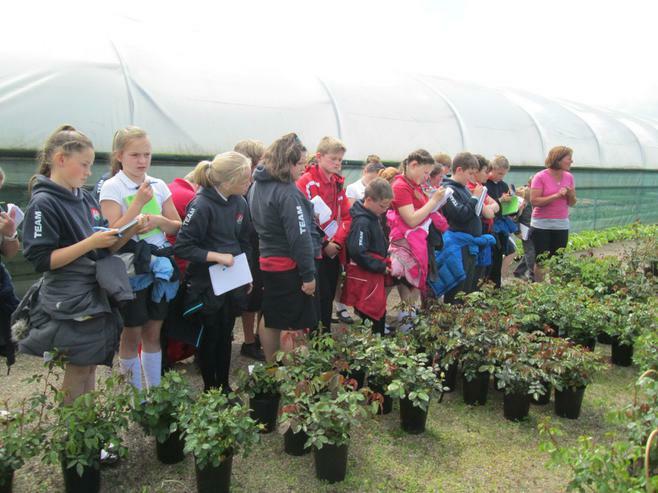 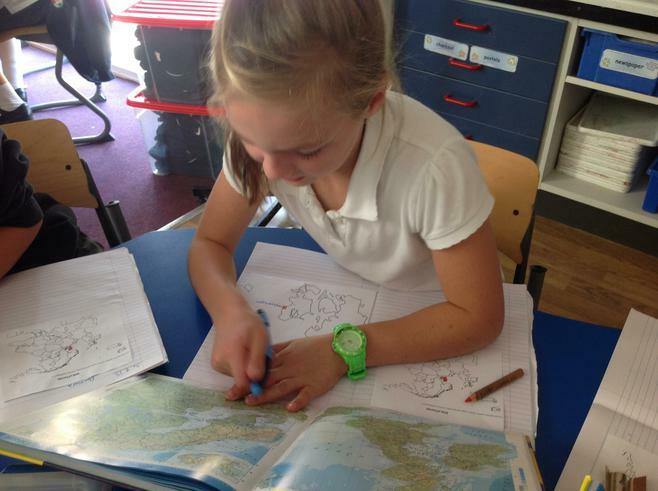 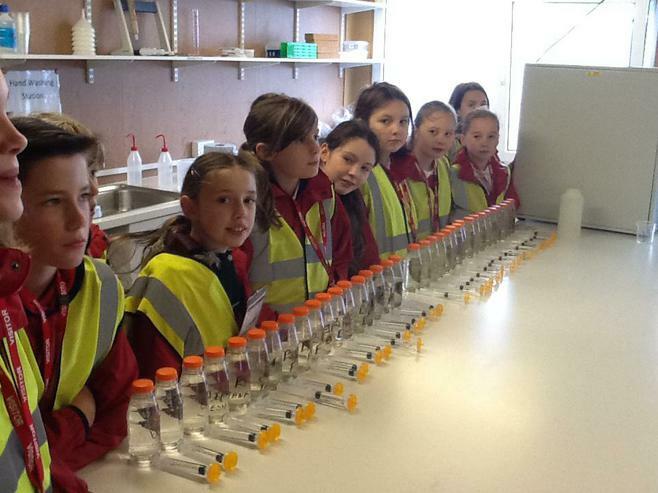 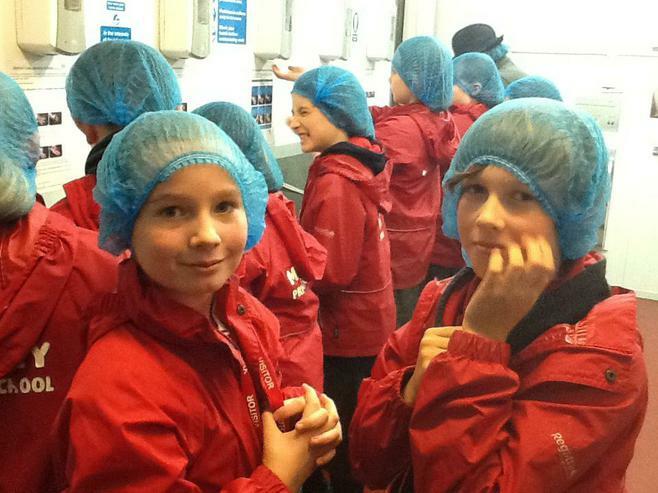 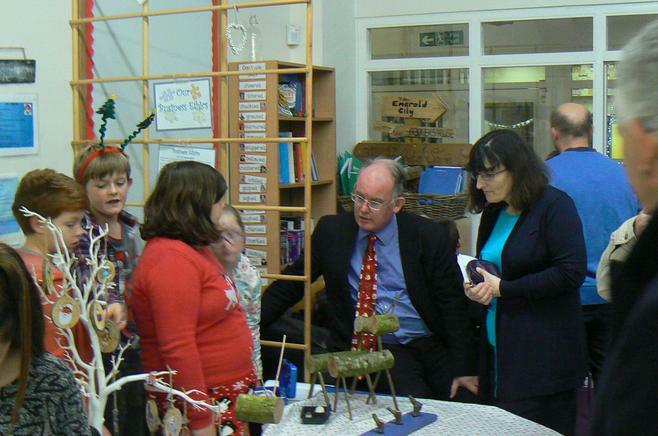 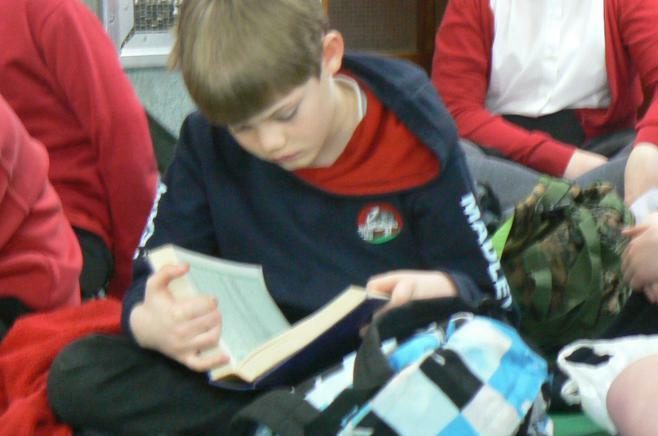 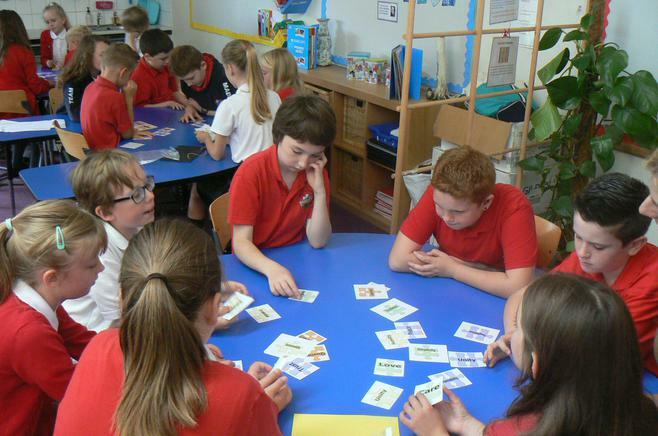 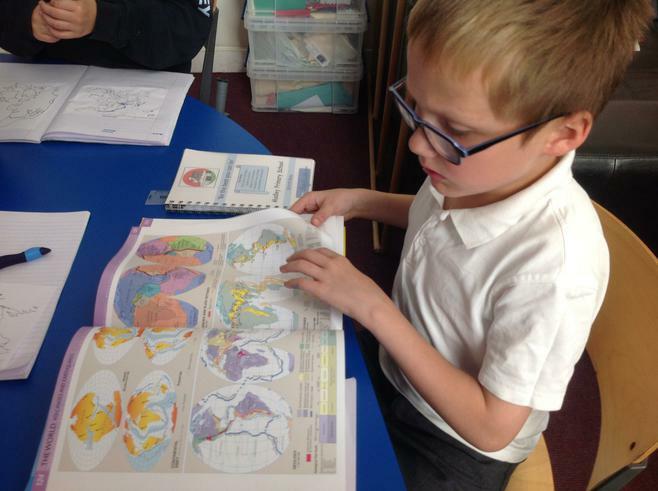 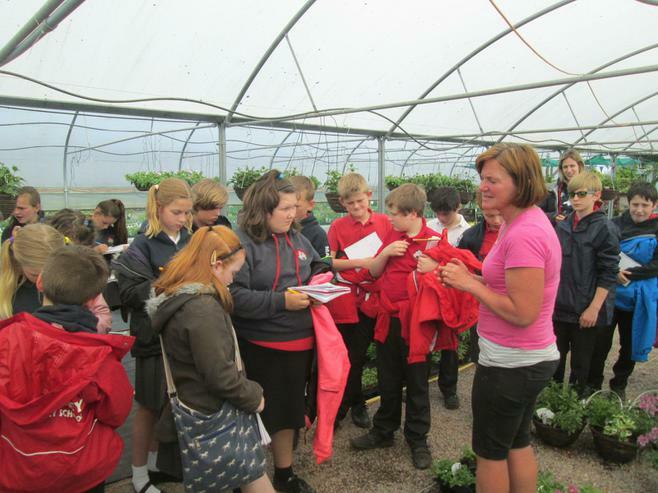 We plan our curriculum visits very carefully to ensure they are informative, engaging and educational. 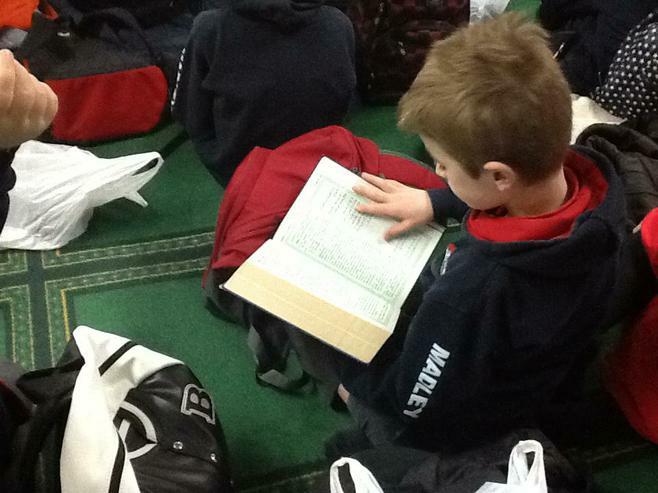 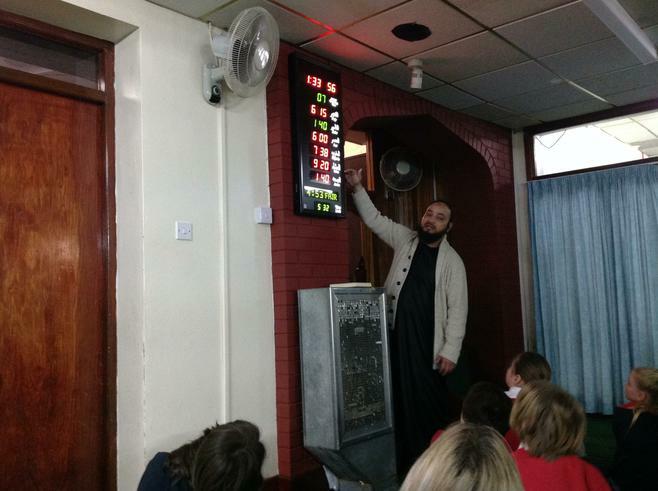 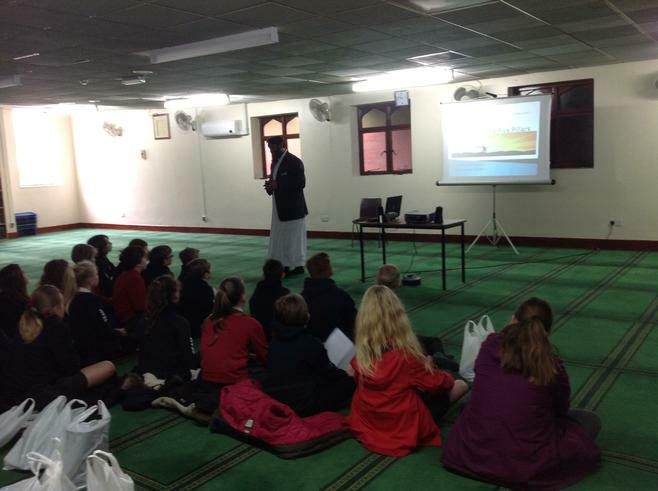 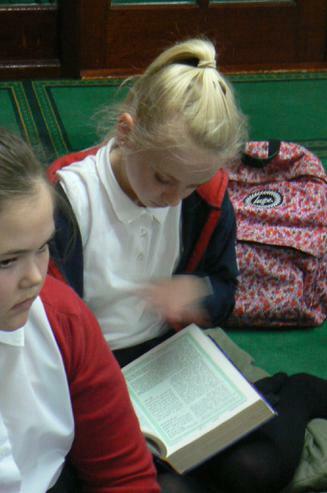 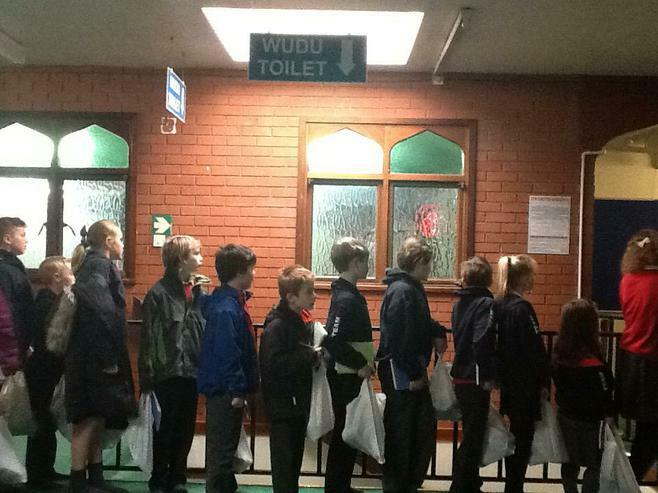 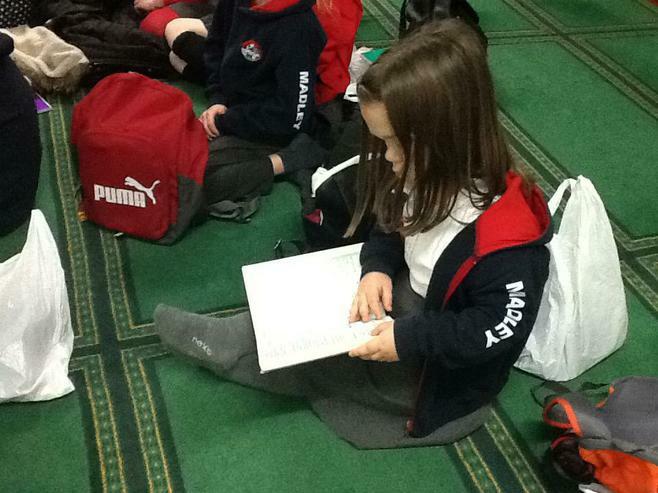 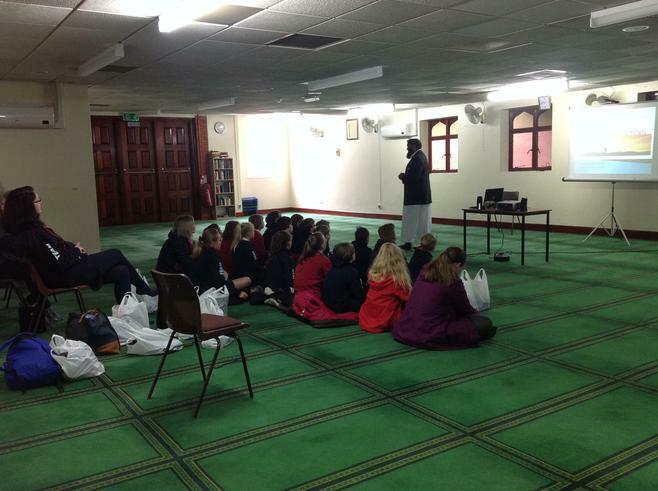 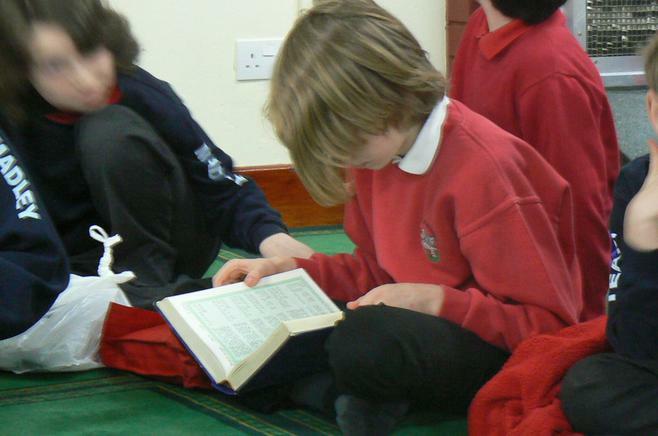 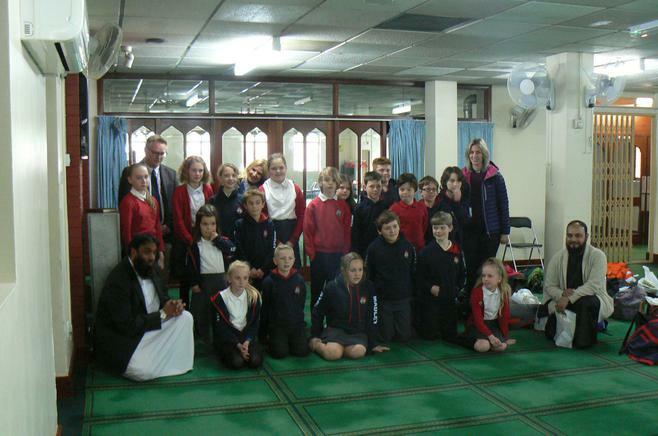 At the Mosque, the children gained an insight into another culture and faith which we simply could not experience in the classroom alone. 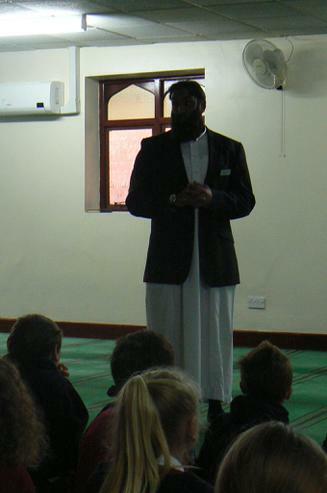 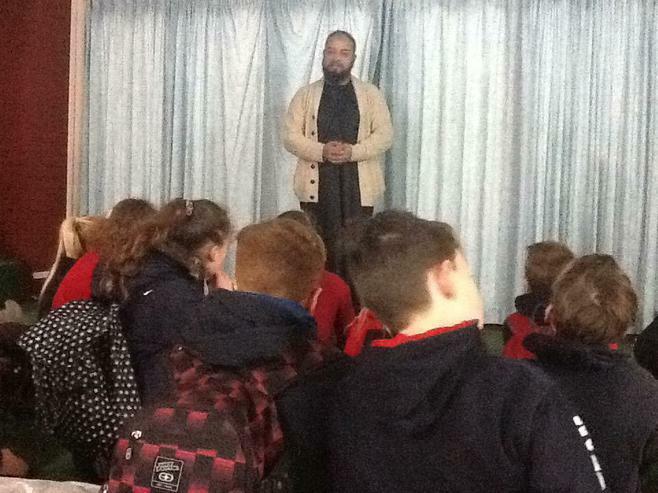 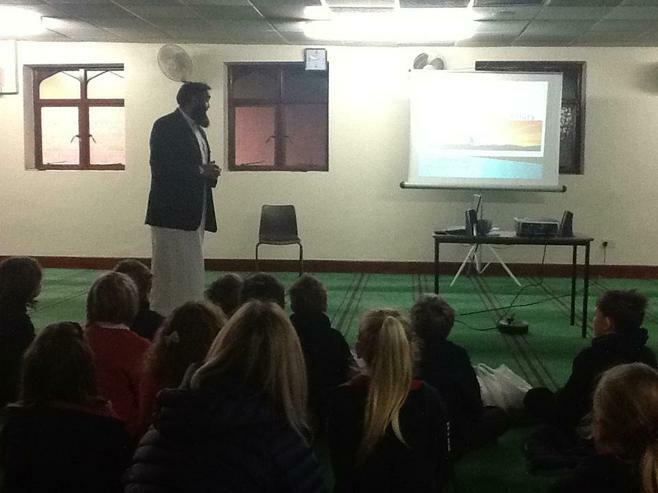 The children asked insightful questions in light of events recently and the Headteacher of the Islamic School was impressed by their questioning. 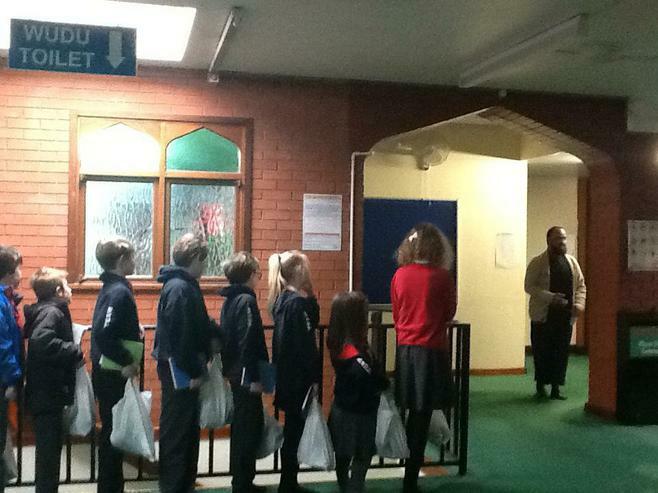 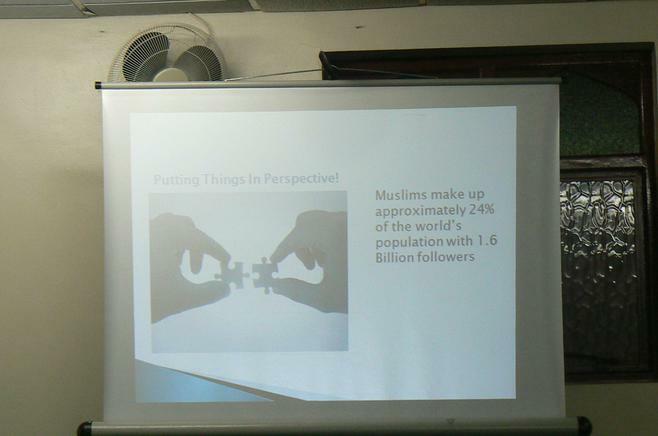 We found out that is Islam is a generous and thoughtful religion that views kindness as a step towards heaven. 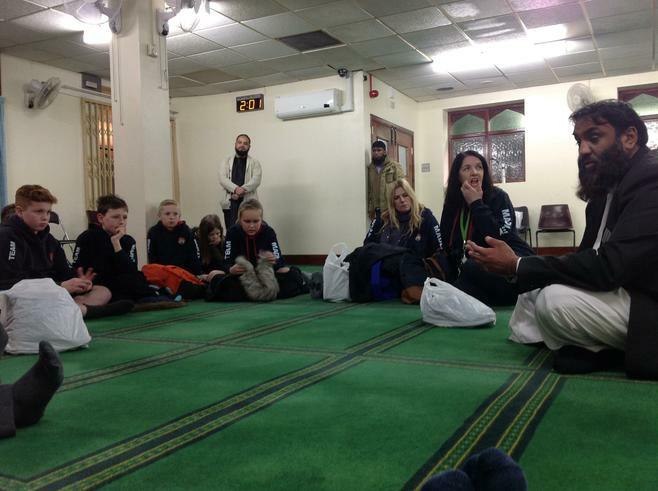 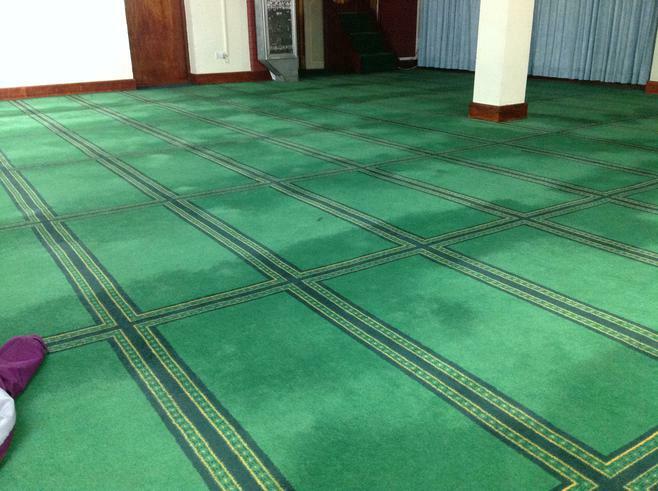 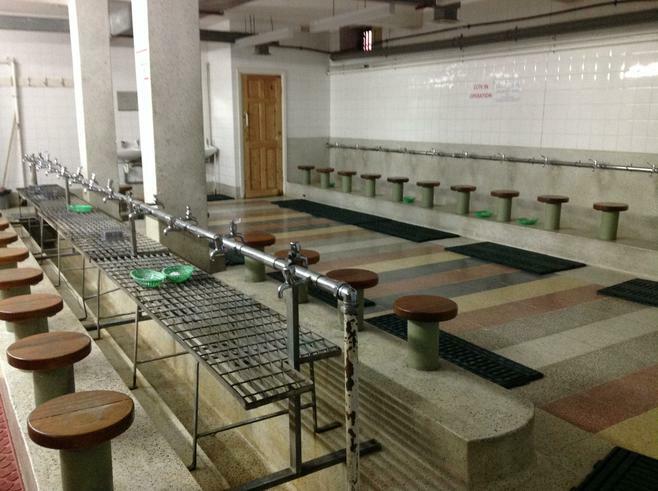 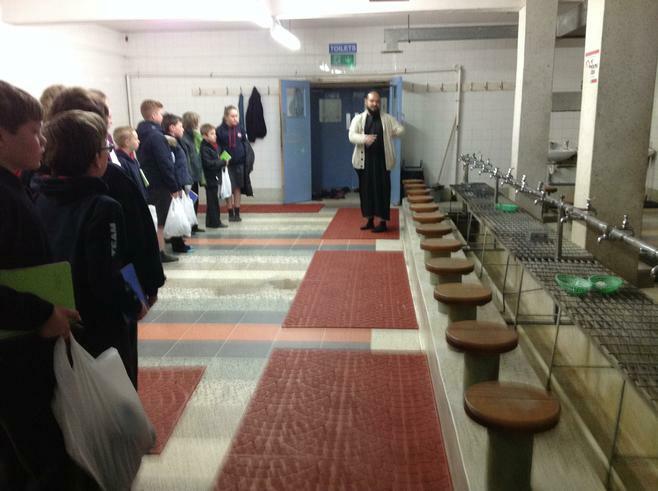 We heard the call to prayer and saw how the Mosque operates. 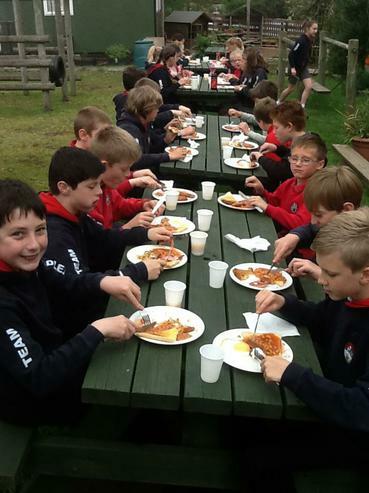 Our hosts were exceptional - generous and kind to everyone and they showed humility throughout the day. 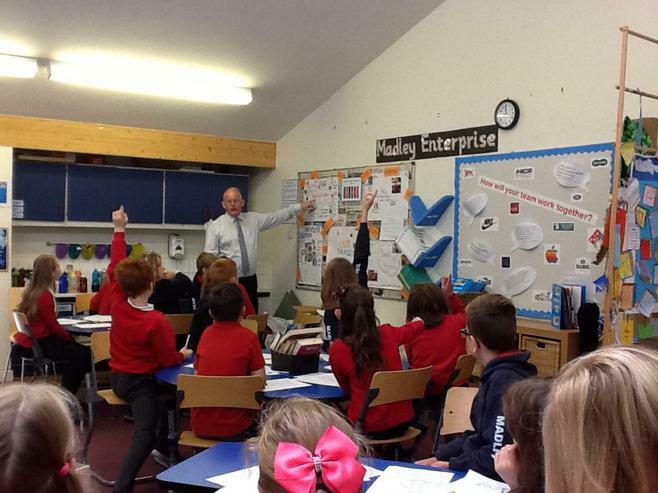 Values are very important to us at Madley; they are embedded in our ethos and culture and help shape everything we say and do. 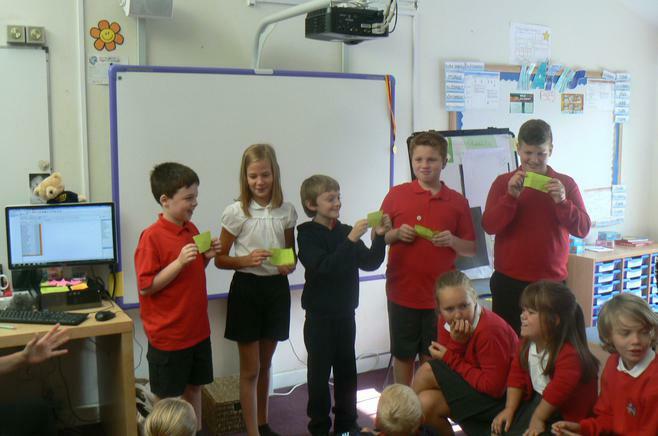 In September, Y6 choose which two values we will have for each month throughout the school year. 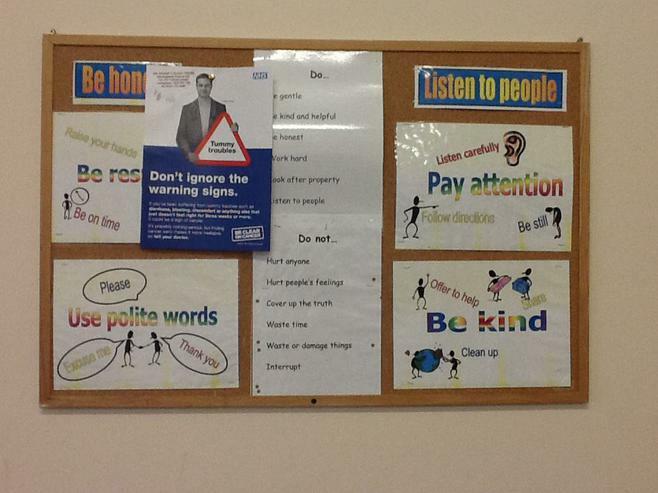 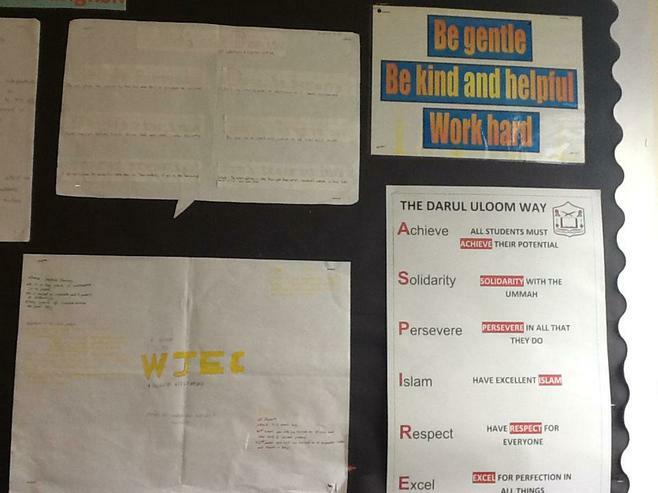 This month our values are 'care and understanding' and in April they are 'humility and tolerance'. 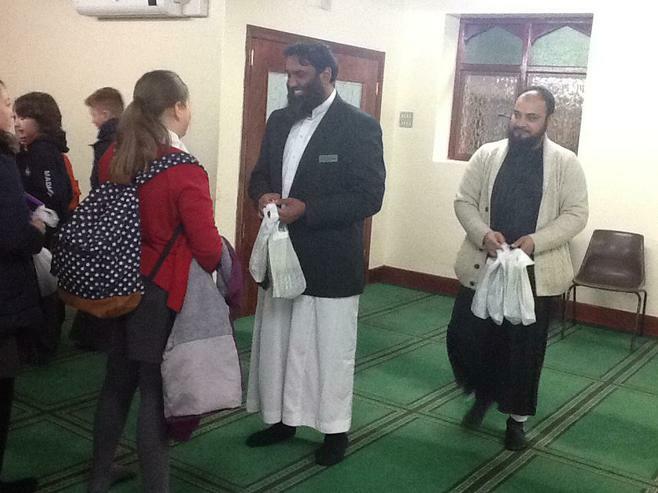 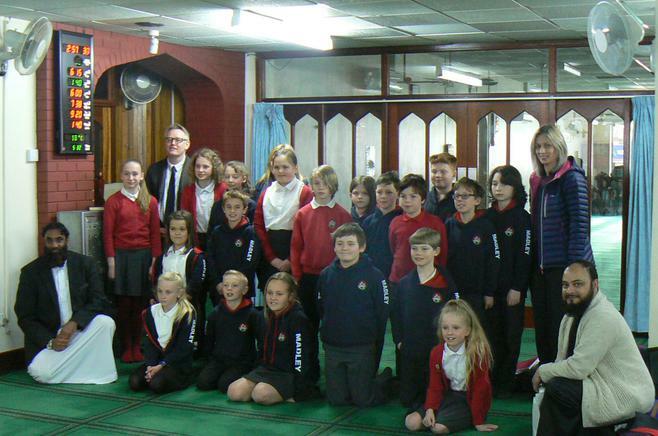 The children exemplified all those and the core British Values during their visit to the Mosque and we are incredibly proud of each and every one. 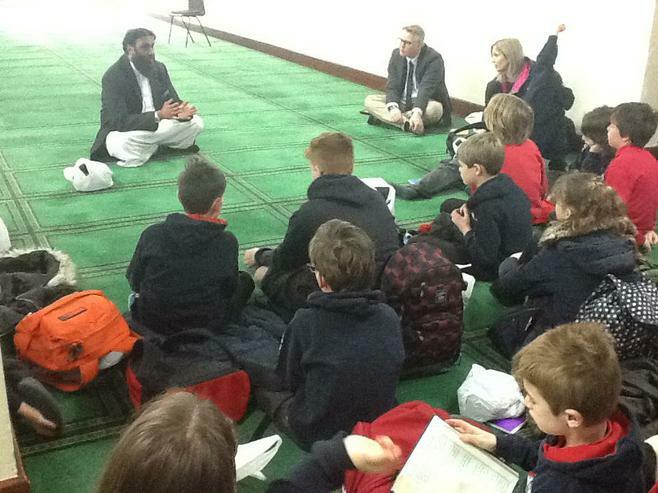 "It was interesting to see all the different things they did as it helped me learn and understand about a different religion"
"I learned that not all Muslims are bad, Islam is a happy, peaceful religion"
"I really enjoyed it and I loved watching the prayers; there were lots of different movements which everyone did at the same time. 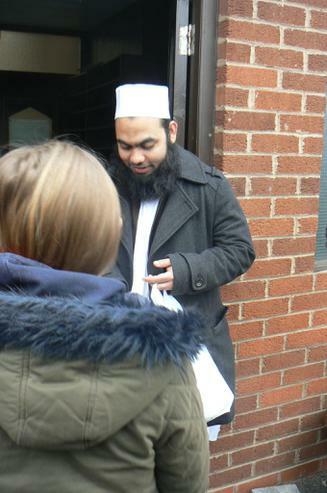 I would really like to visit again!" 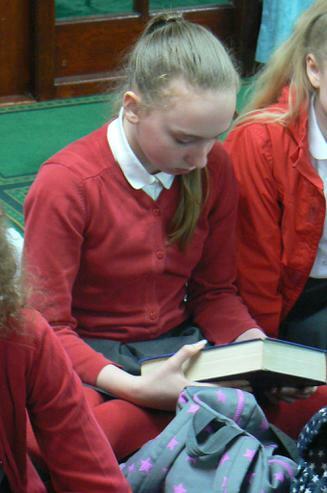 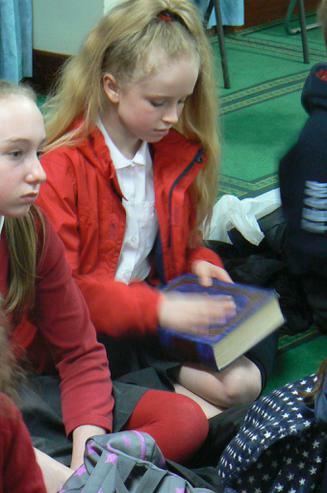 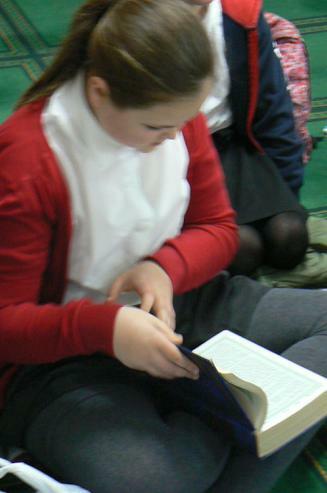 "It was a really interesting day and I was pleased to learn about a different faith and see another culture coming together for prayer"
Well done Y6 for an excellent curriculum visit. 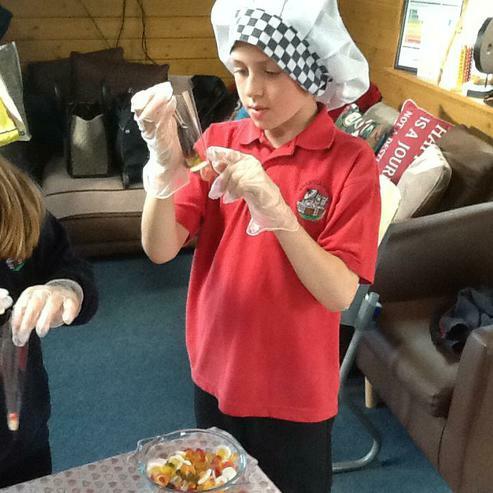 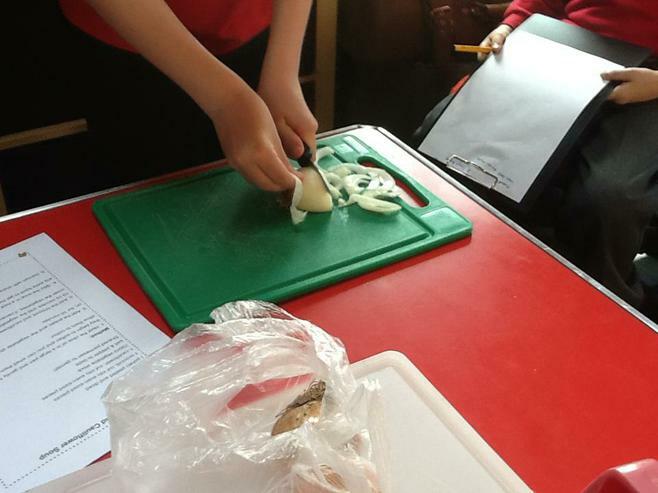 Some of the Year 6 children have been putting their culinary skills to the test by creating wonderful dishes from Thailand. 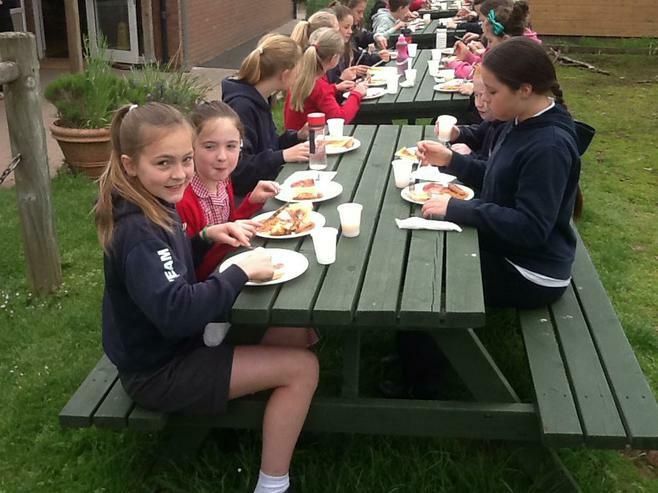 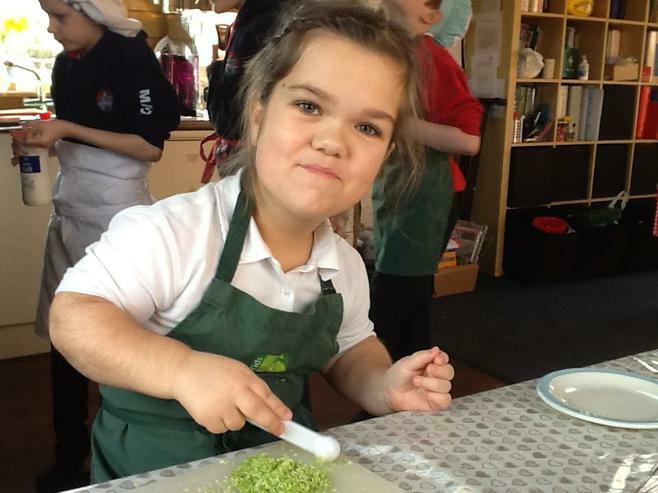 The thai green curry, aromatic rice and freshly baked bread were enjoyed by the staff and Year 5 pupils at Madley Primary School. 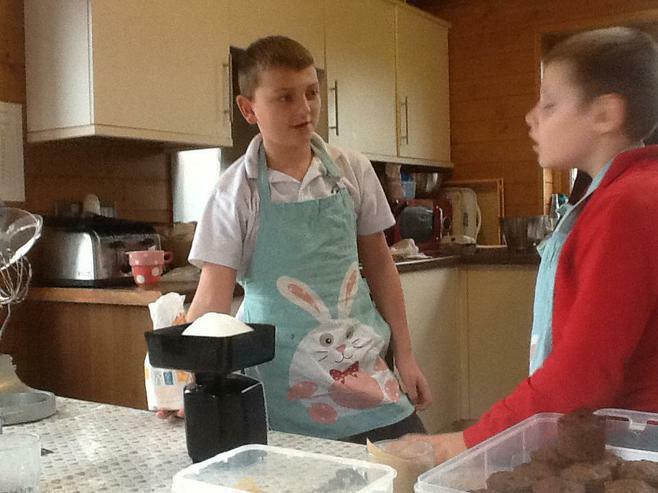 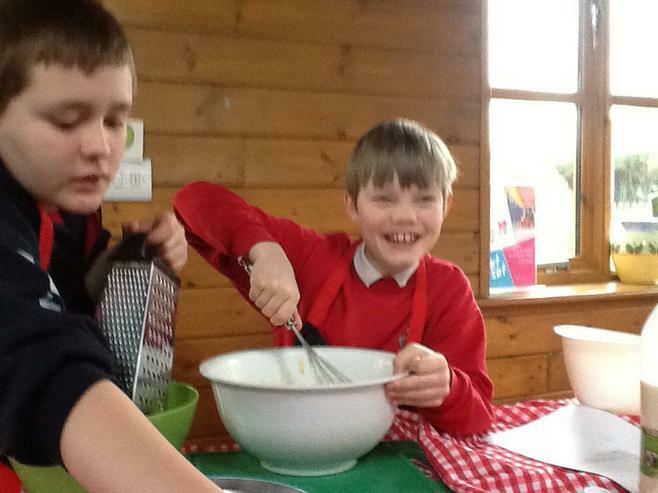 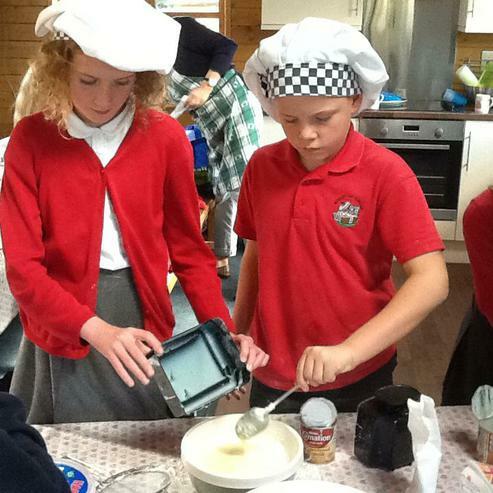 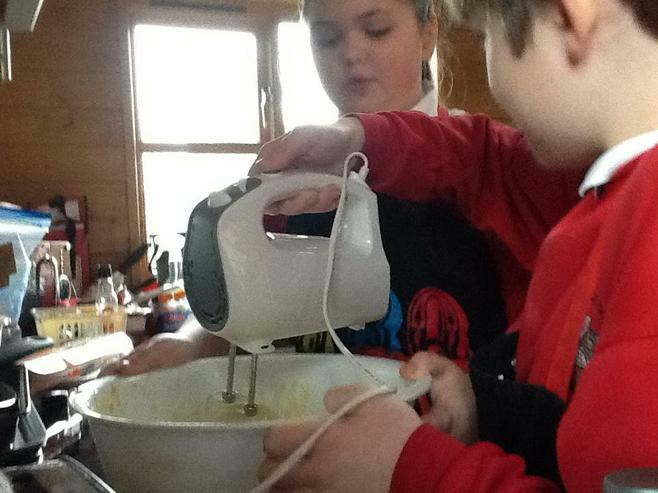 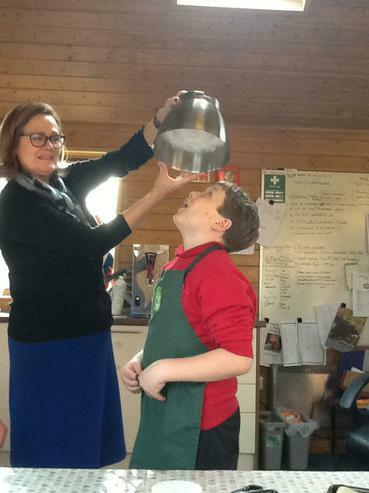 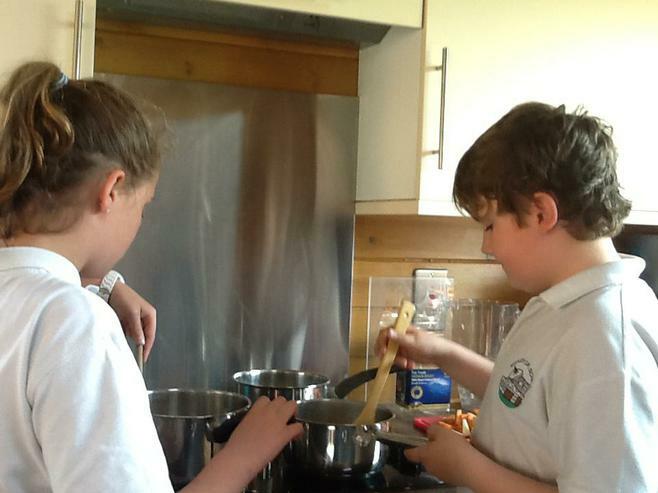 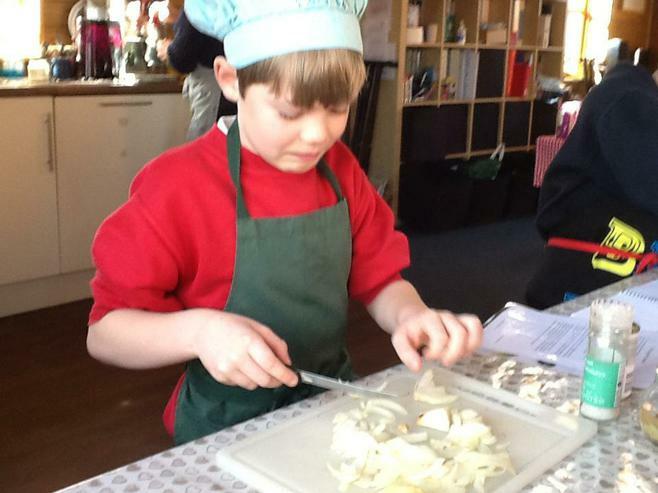 The children had nothing but positive comments about their cooking skills with requests for second helpings and therefore the children (with the guidance of Miss Hirst) decided to extend their cooking experience to some baking. 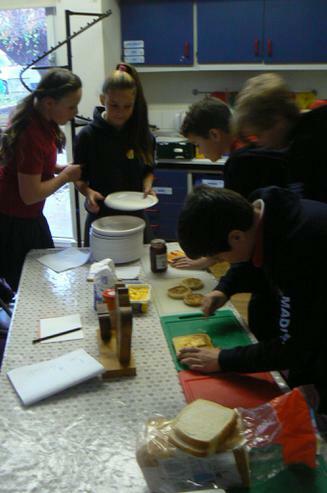 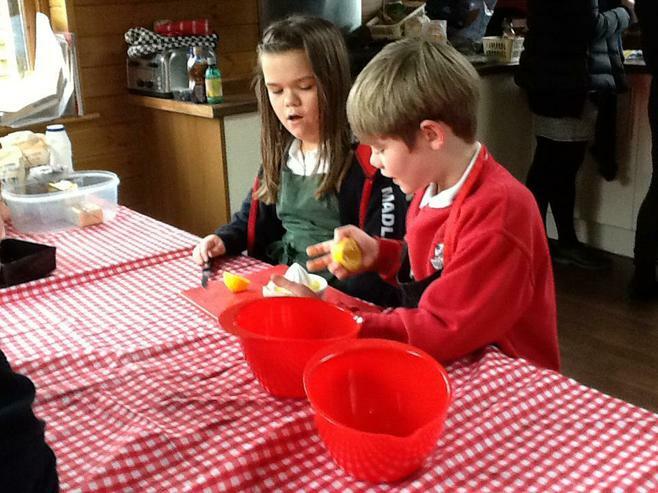 Their lemon drizzle cake and pancakes (in preparation for Shrove Tuesday) were delicious. 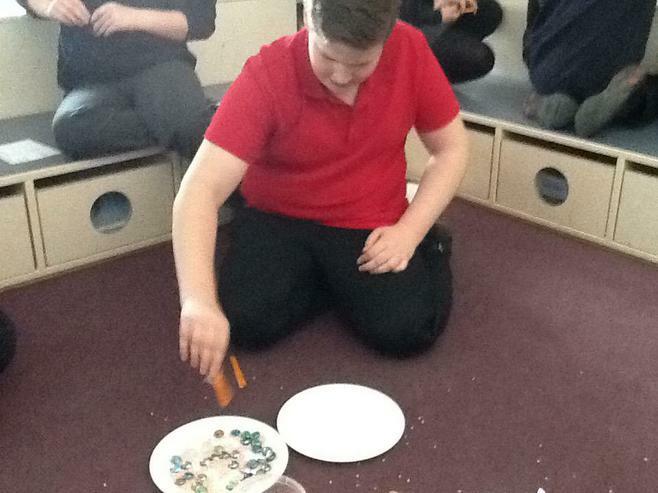 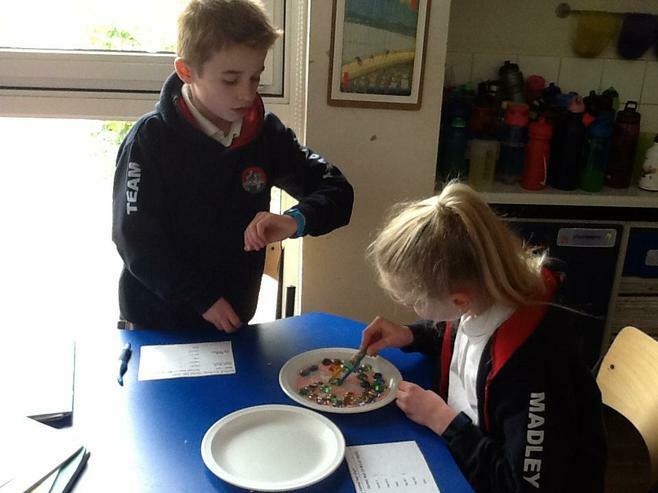 The children involved had a fabulous time while practically applying their math skills for measuring, ratio, proportion and fractions. 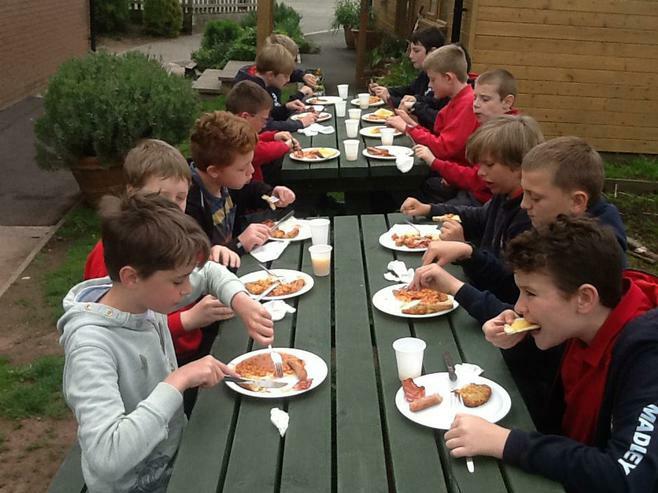 It was a fabulous few days with some tasty treats. 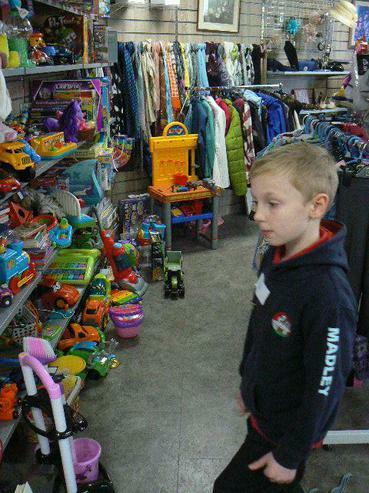 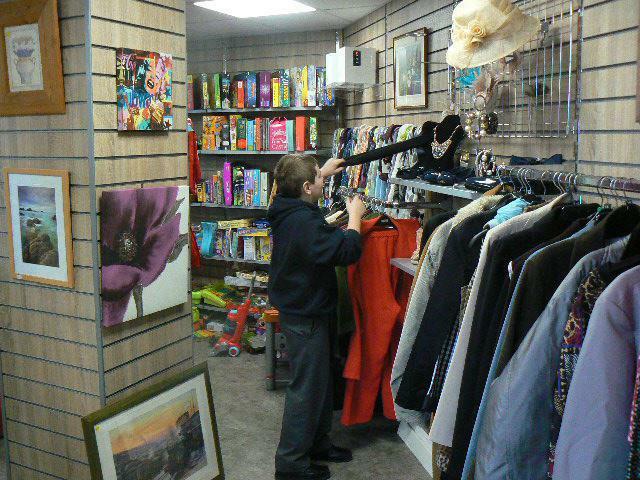 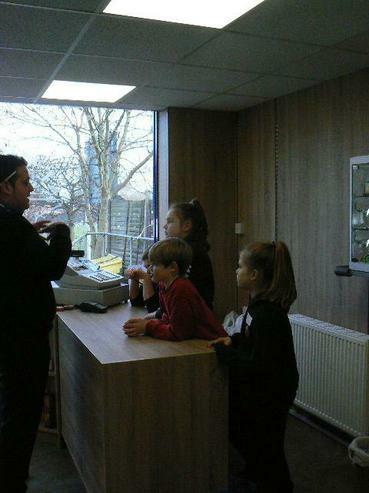 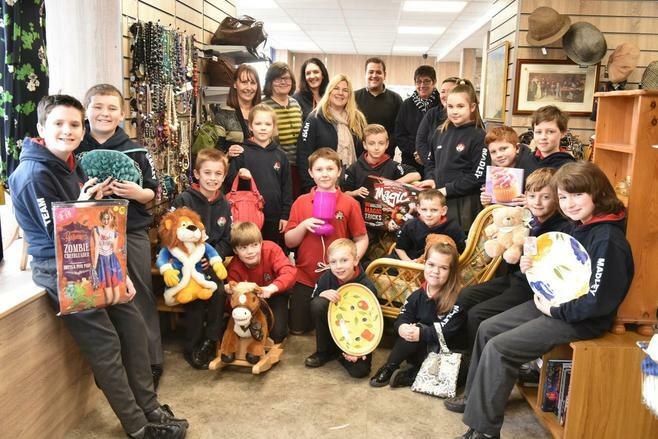 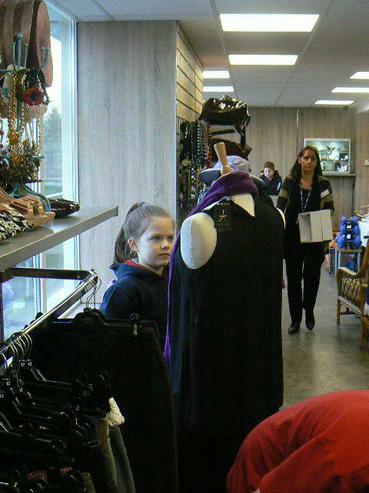 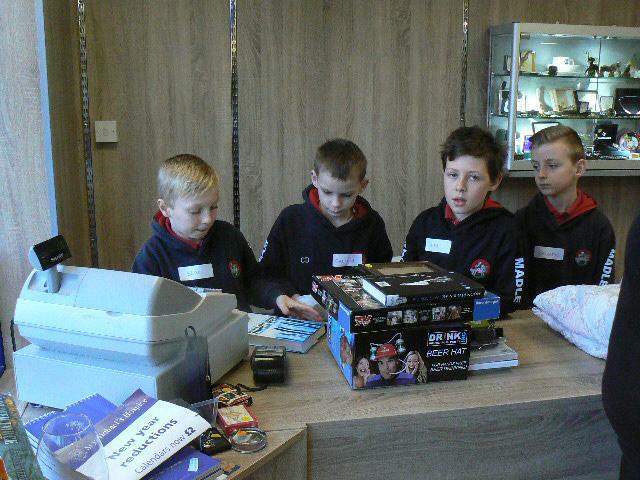 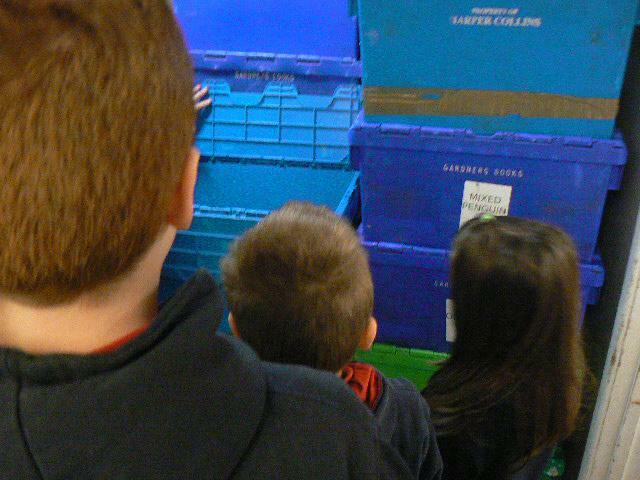 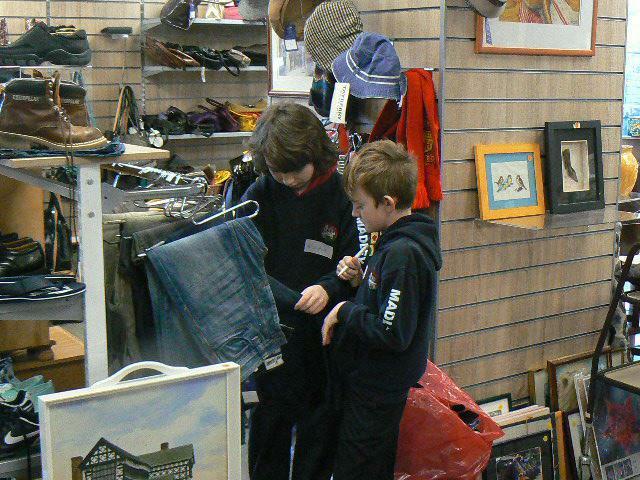 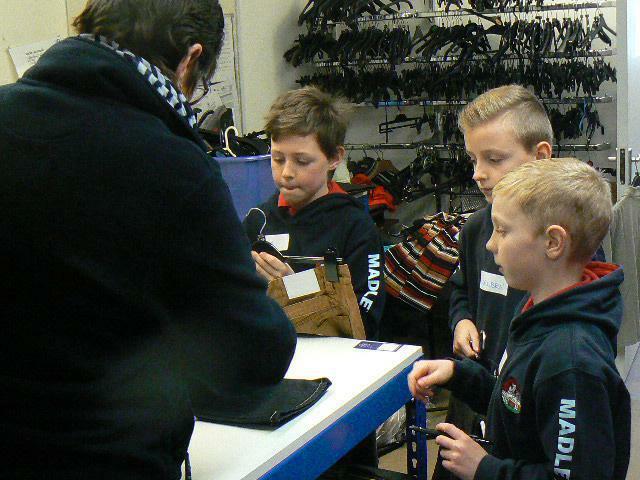 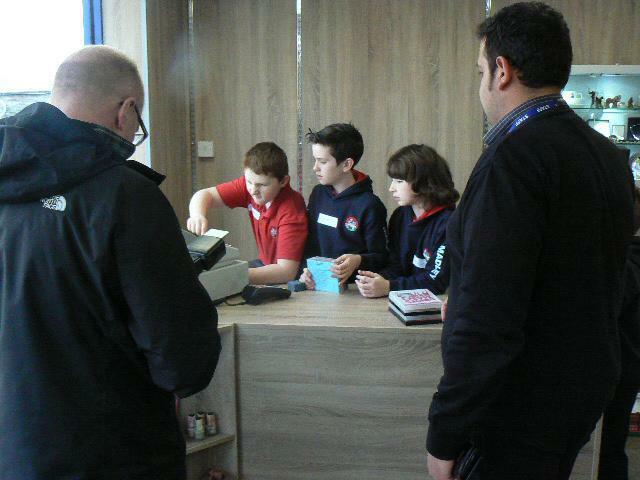 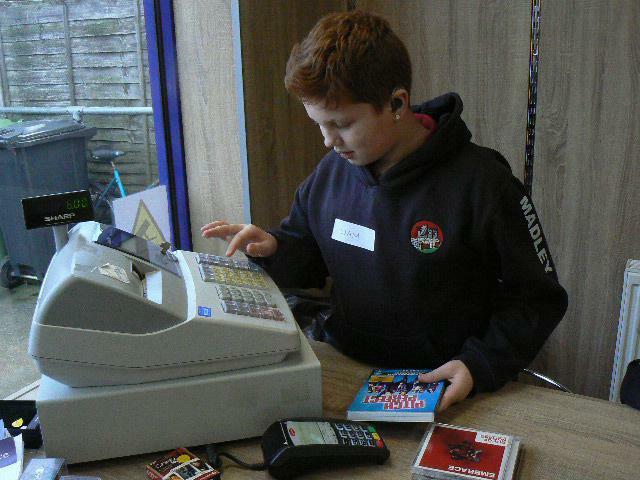 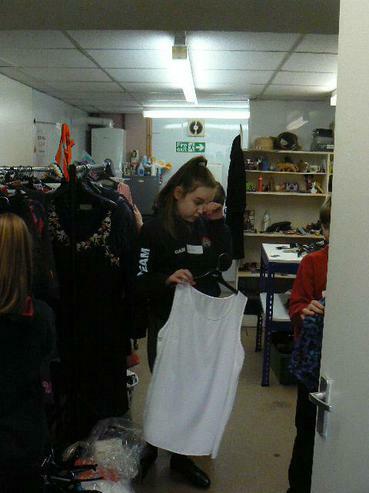 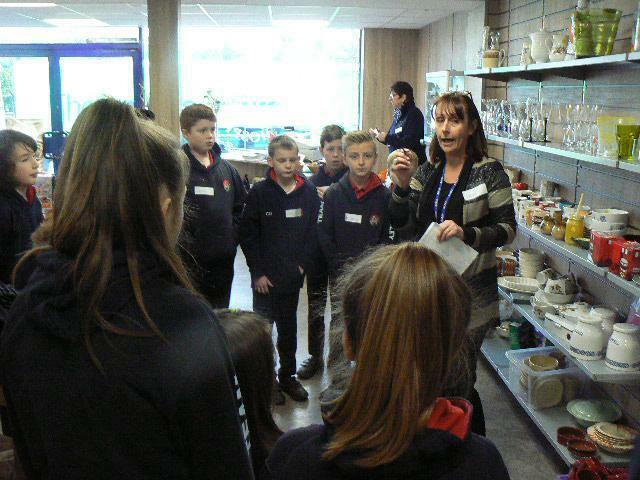 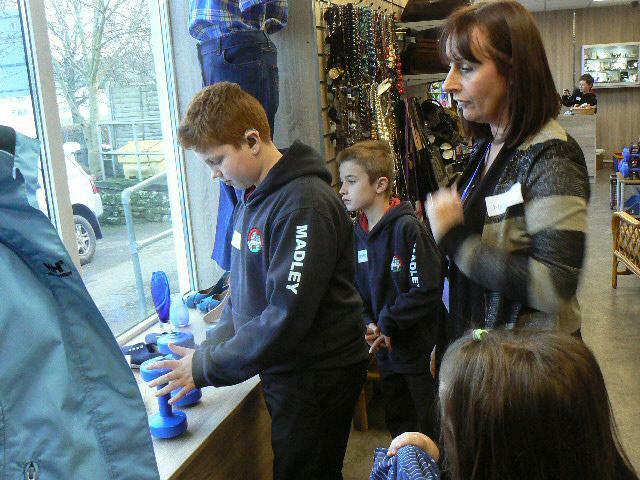 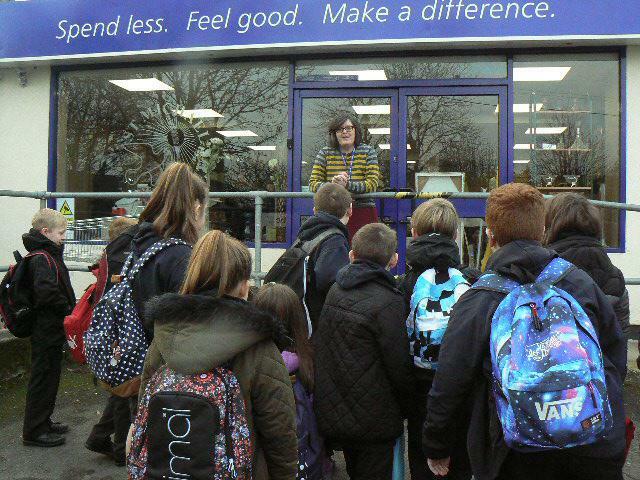 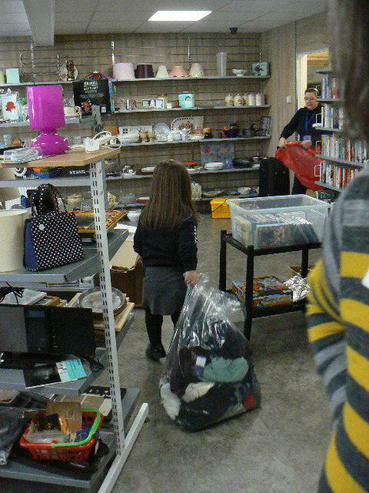 Some of the class visited the Holme Lacy Road Shop for a real-life lesson in retail. 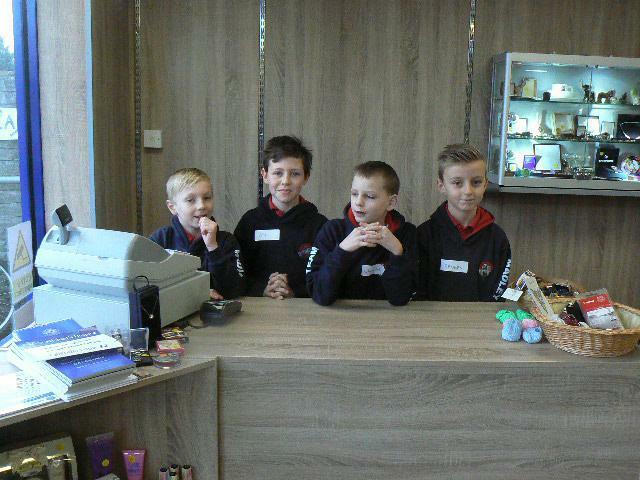 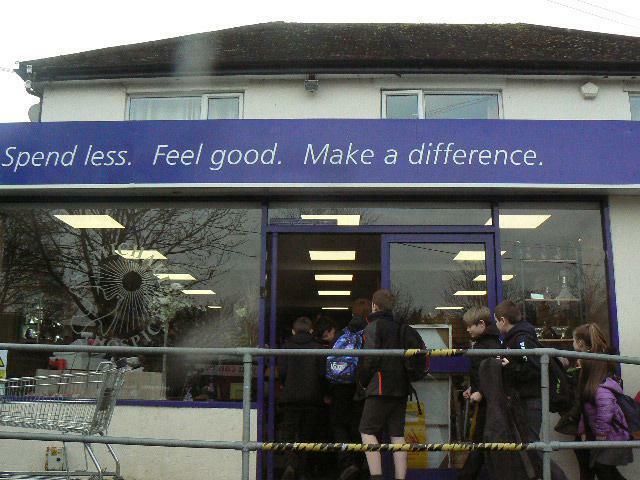 Following their Enterprise theme in the Autumn term this was a fantastic opportunity because they served customers, sorted and priced products, learned about presentation, merchandising and dressed the shop window. 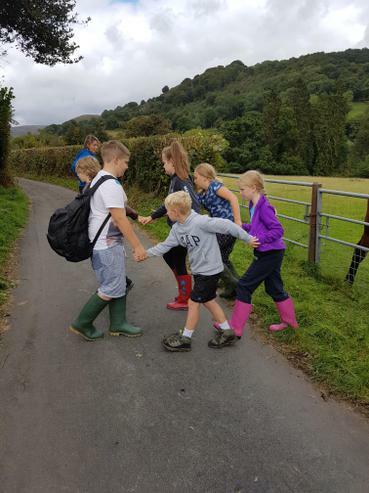 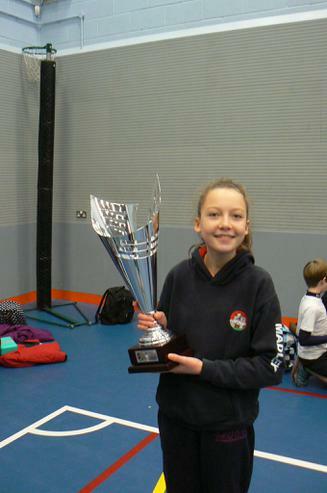 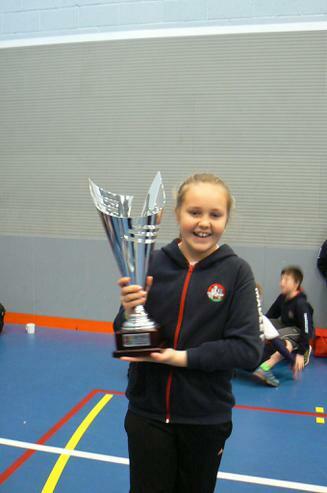 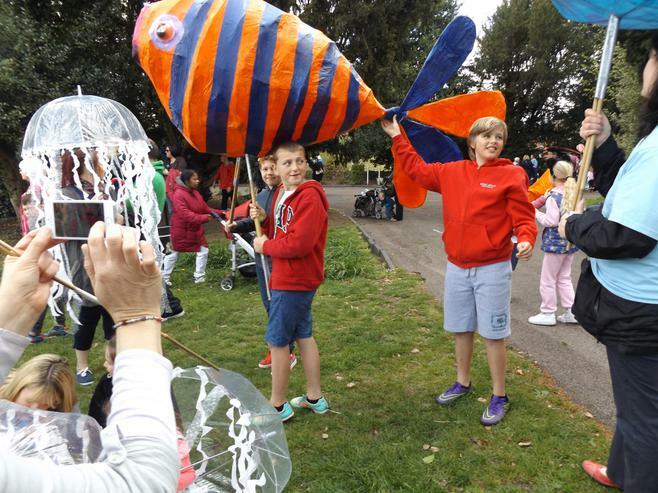 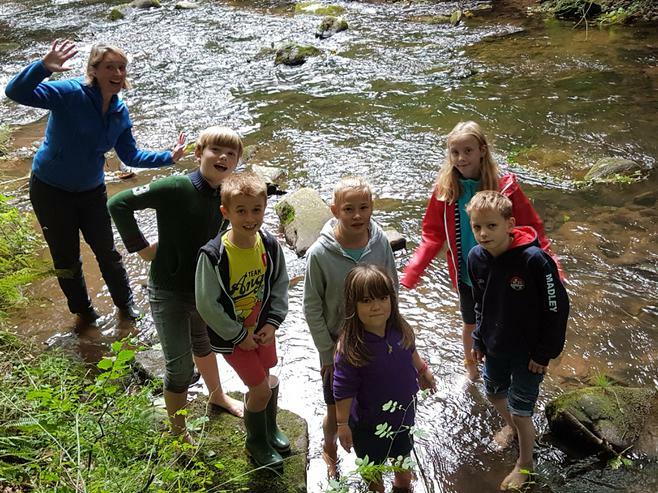 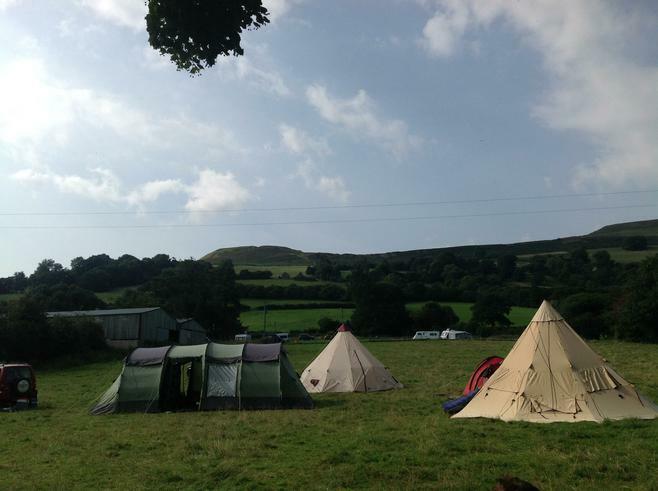 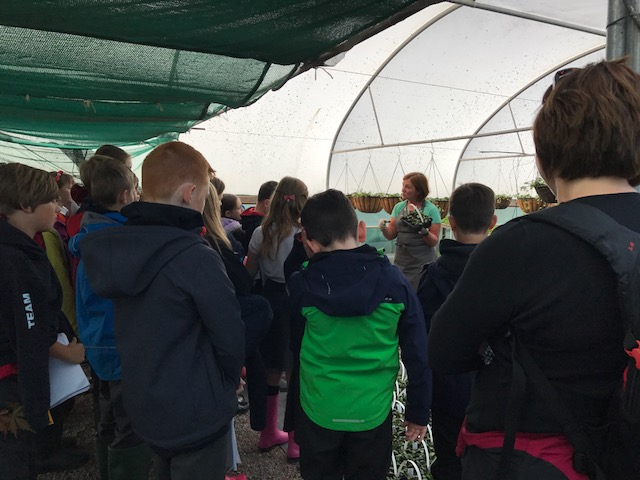 Lydia said, ‘It brought all my learning to life and has been a very memorable day that I think will stay with me for years to come.’ And this feeling was mutual for all of the children who attended. 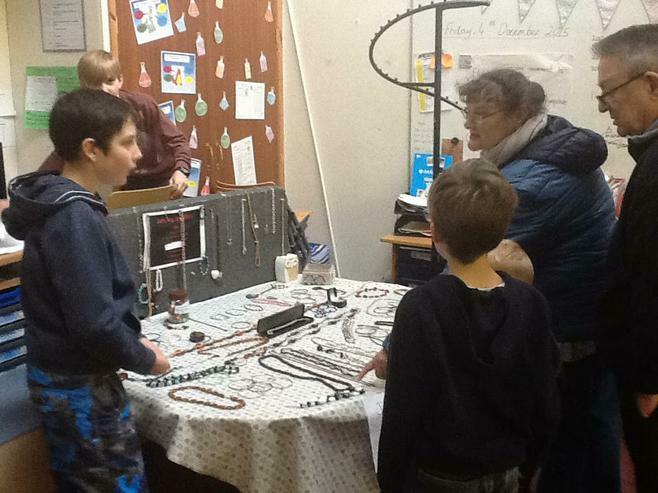 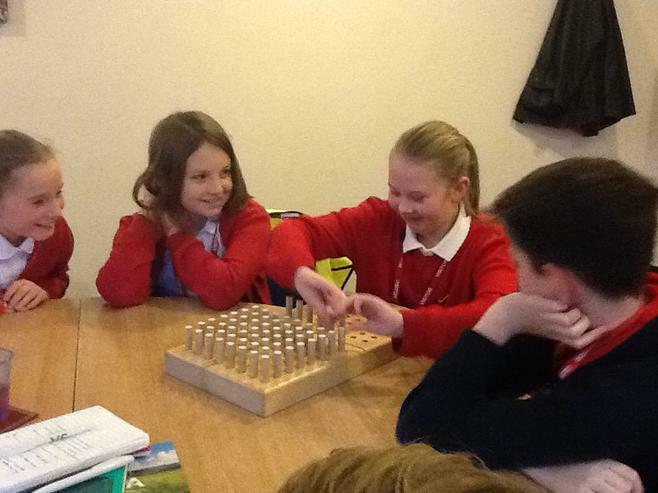 After their work experience, the children had the opportunity to see how the money raised is put to good use with a visit to St Michael’s in Bartestree. 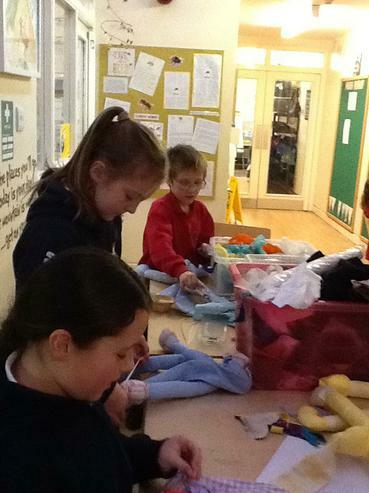 We cannot thank St Michael’s Hospice and the staff involved enough for the opportunity they have provided our children with. 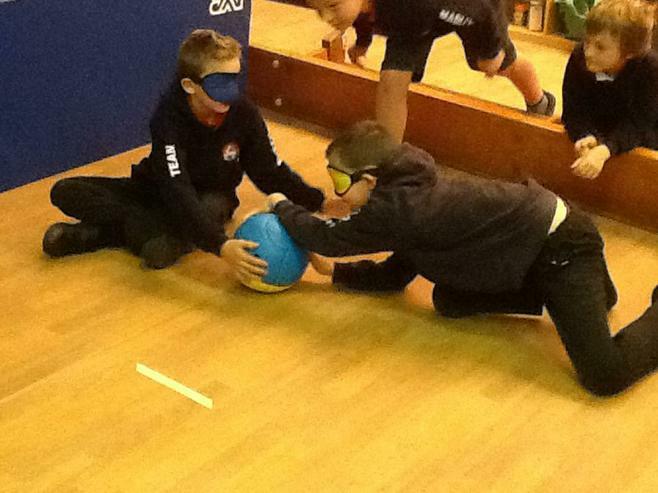 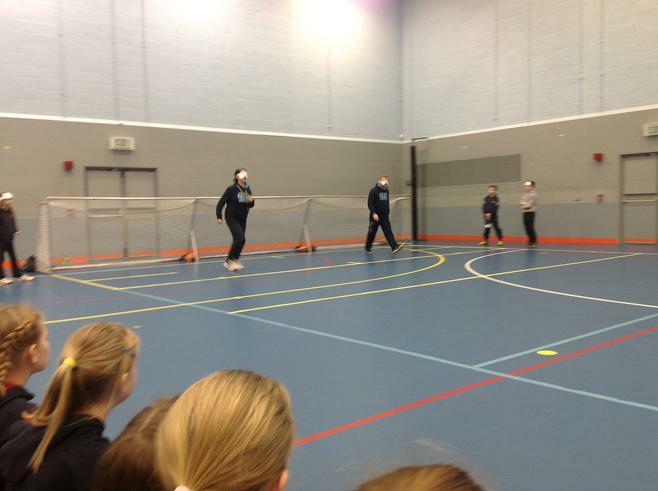 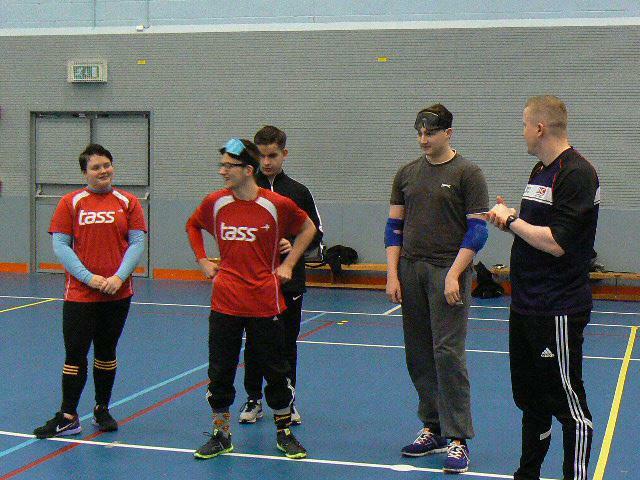 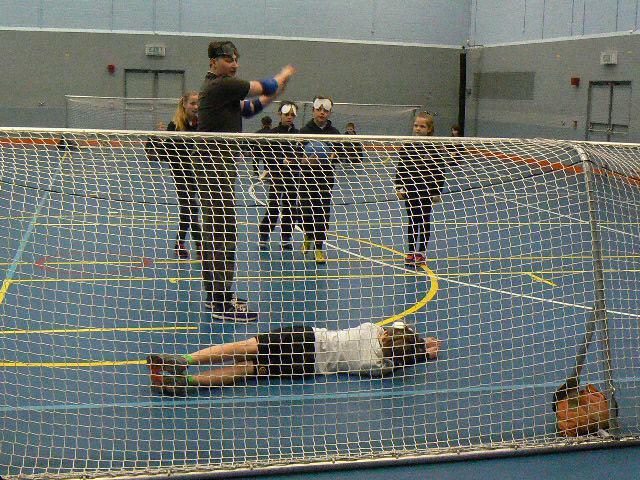 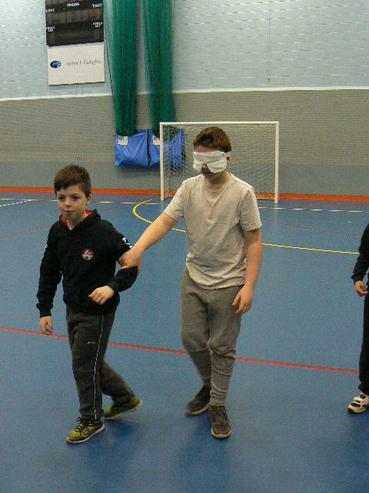 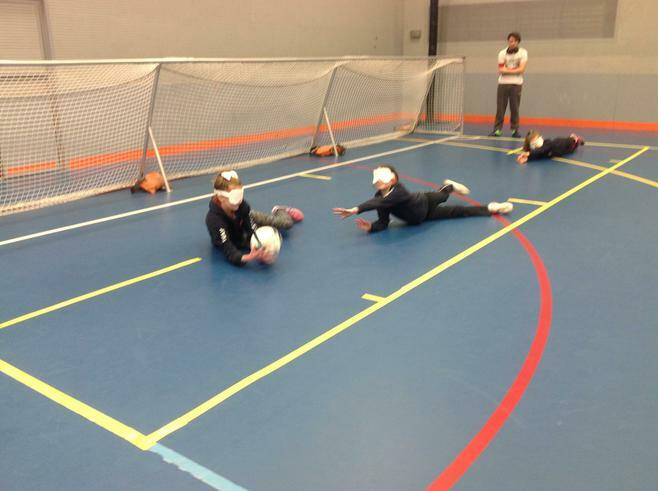 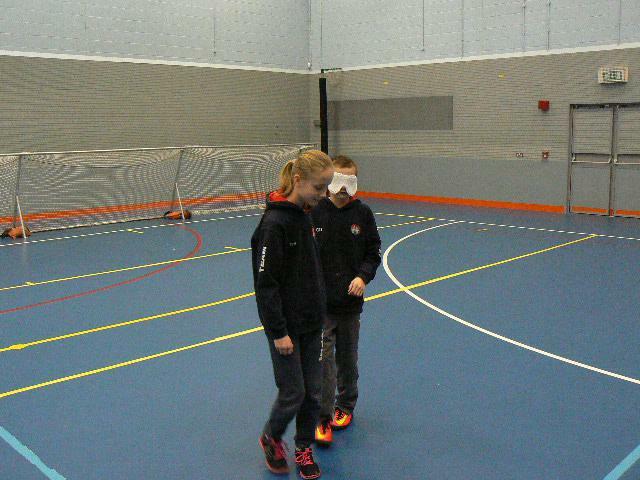 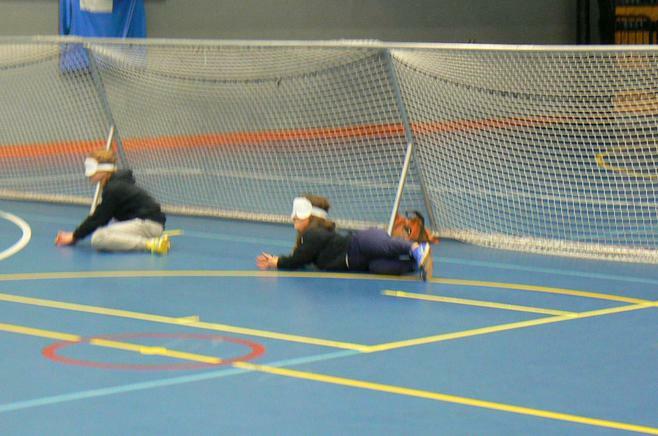 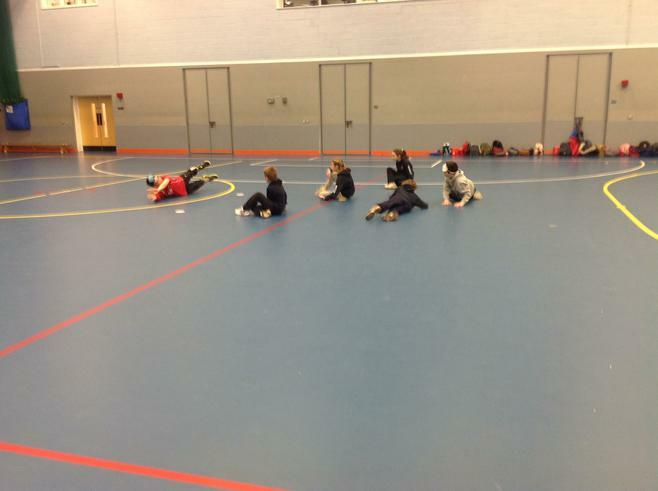 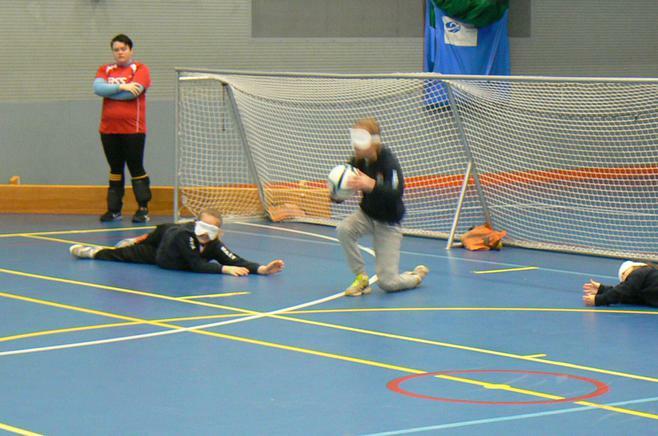 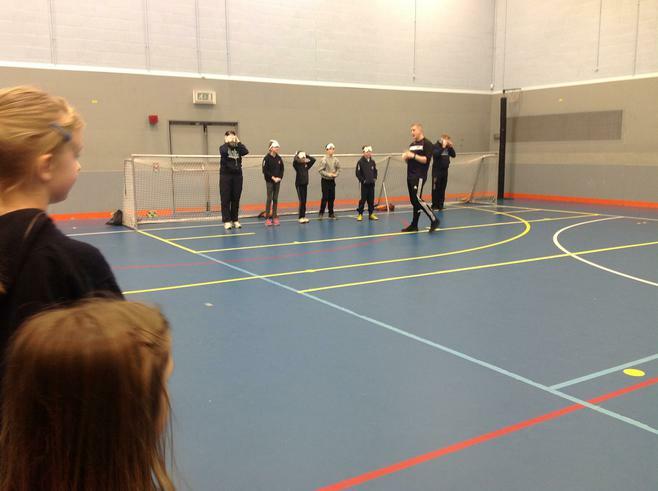 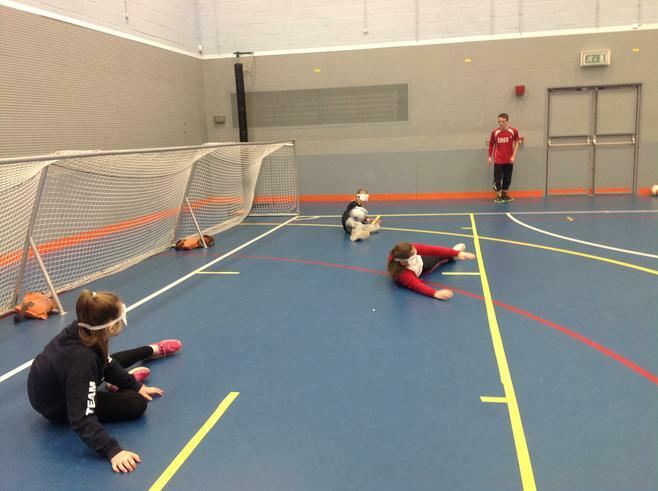 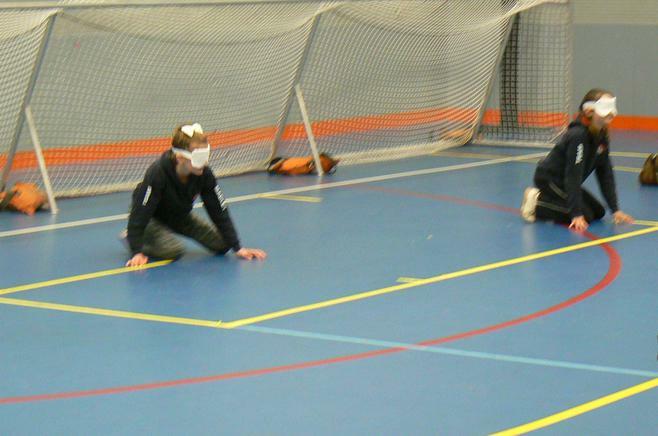 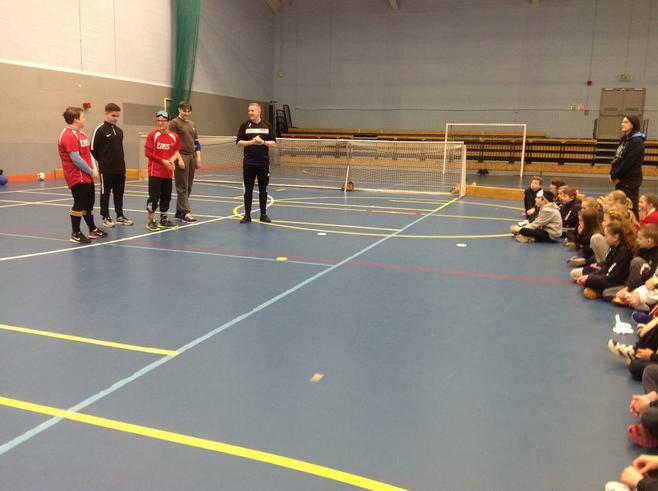 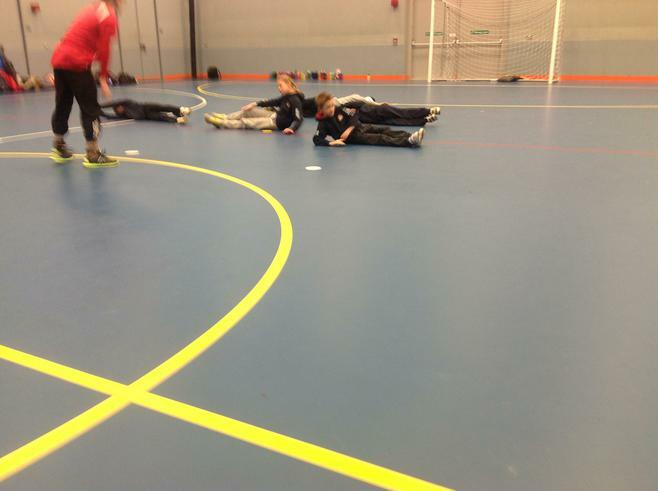 Goalball is a team sport designed specifically for blind athletes. 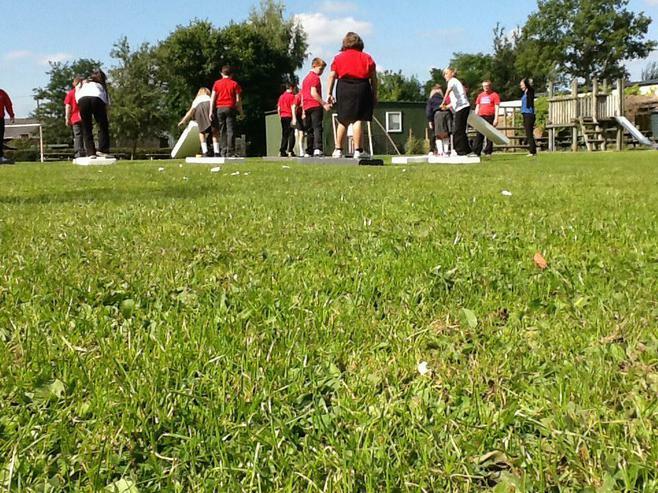 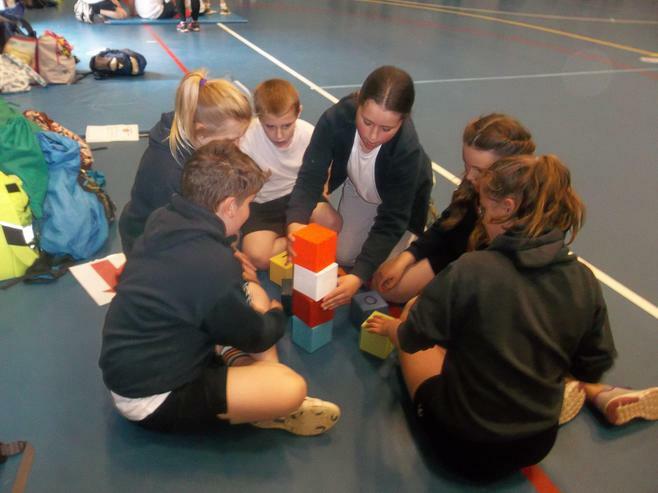 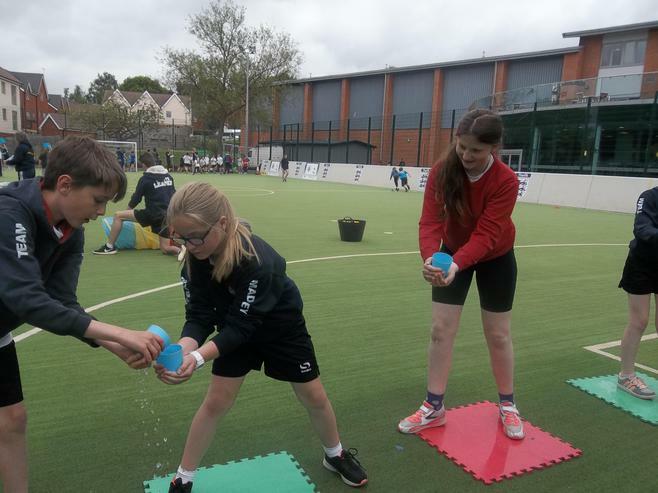 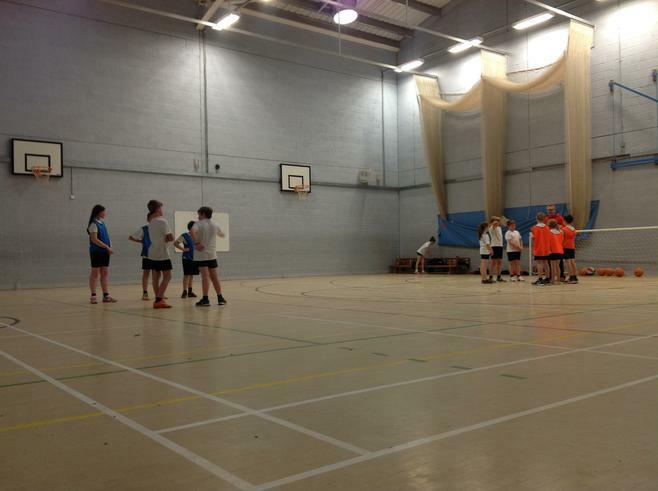 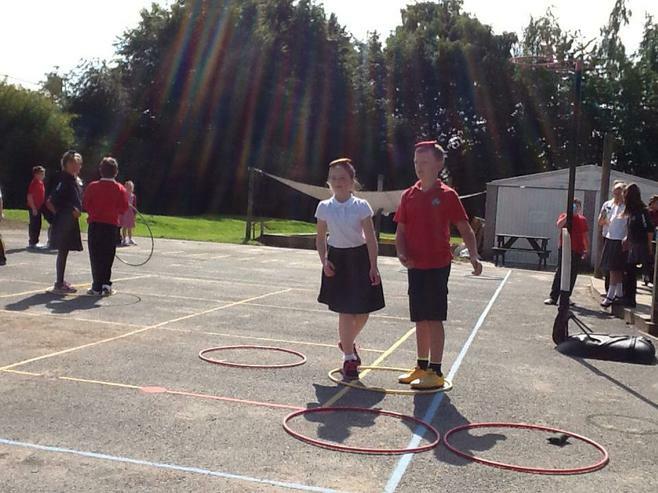 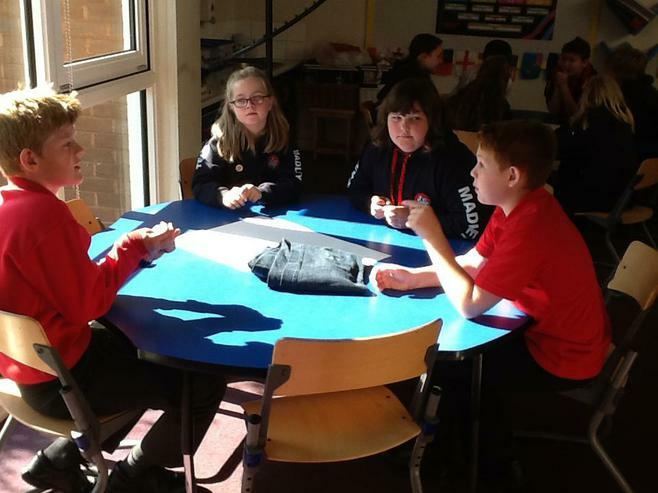 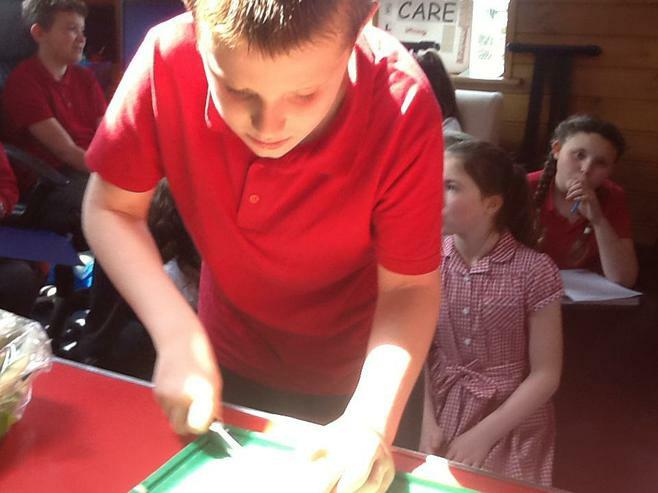 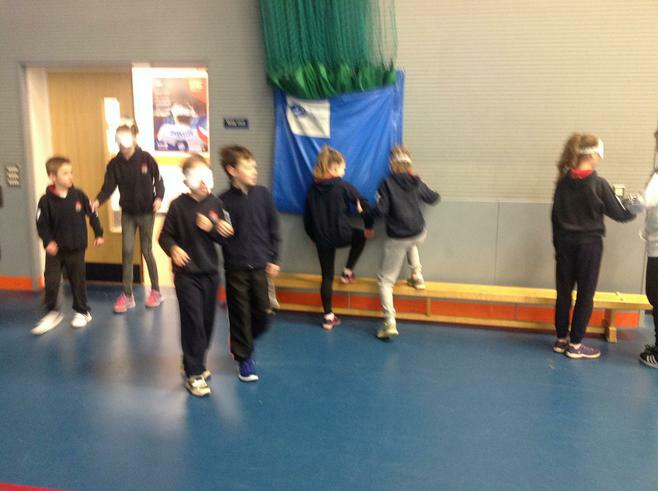 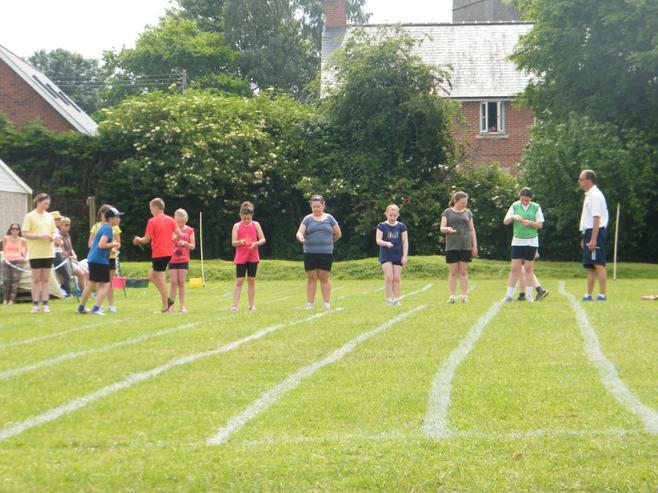 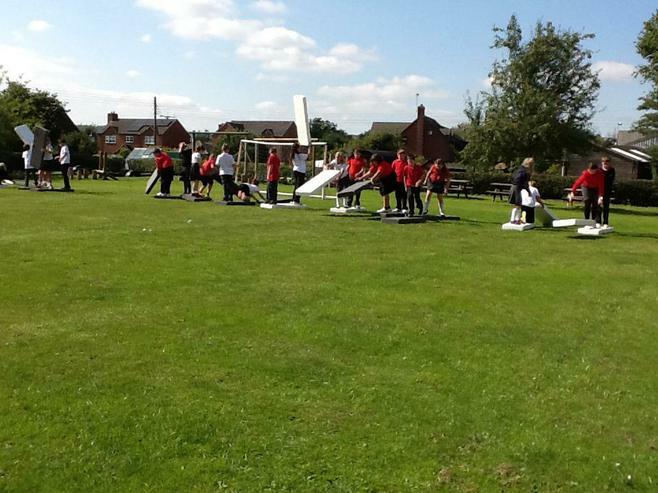 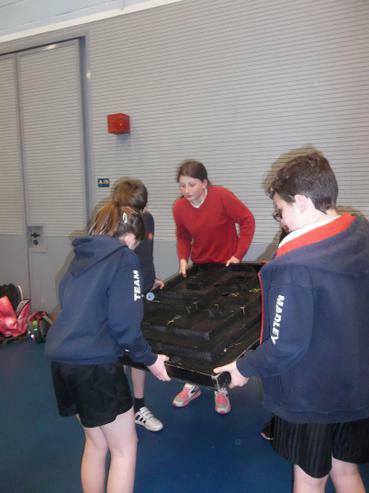 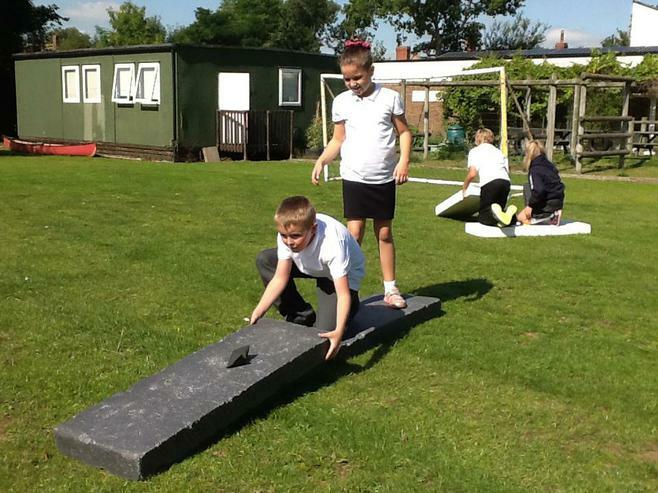 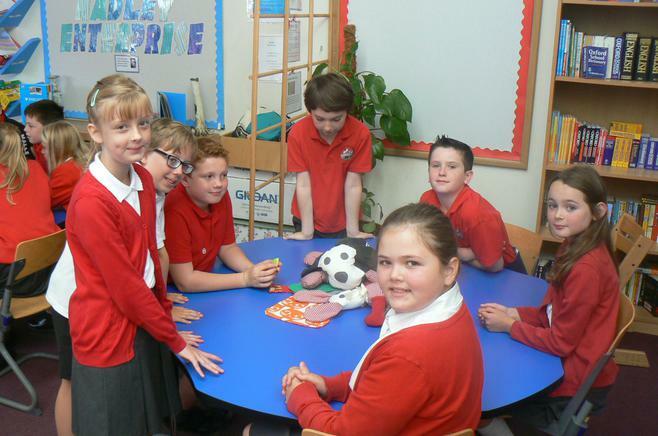 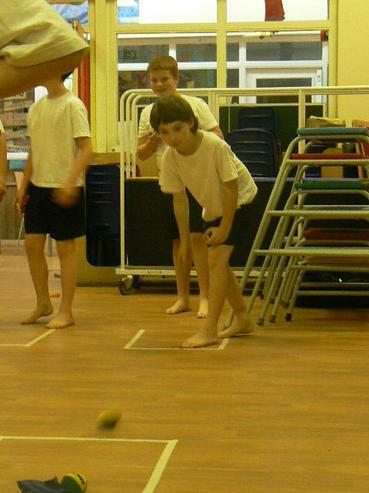 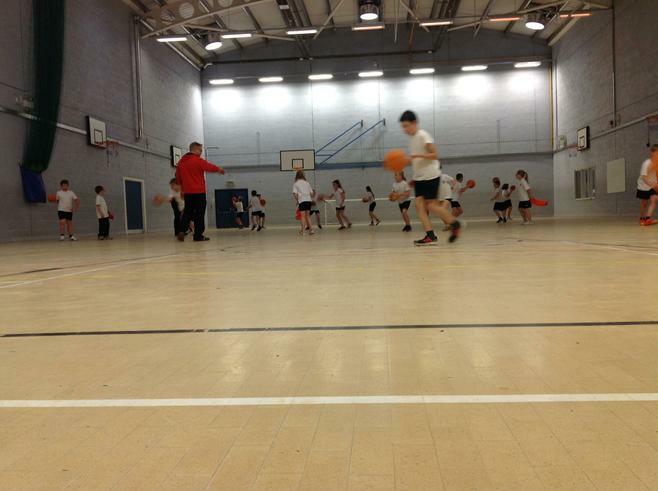 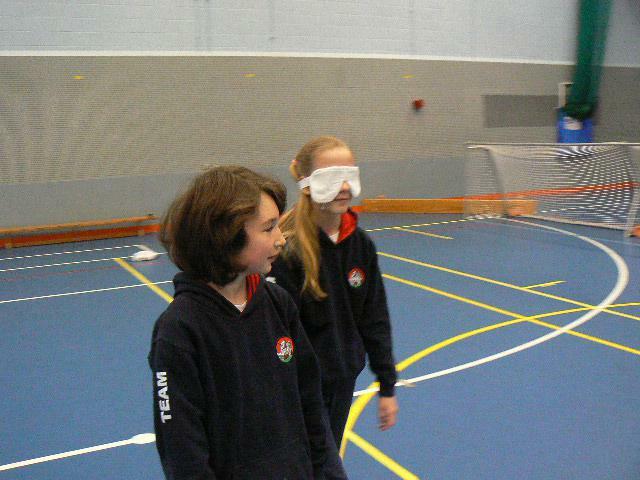 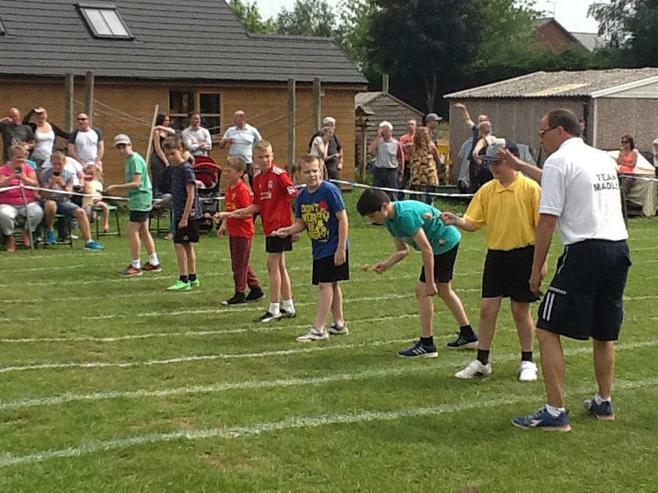 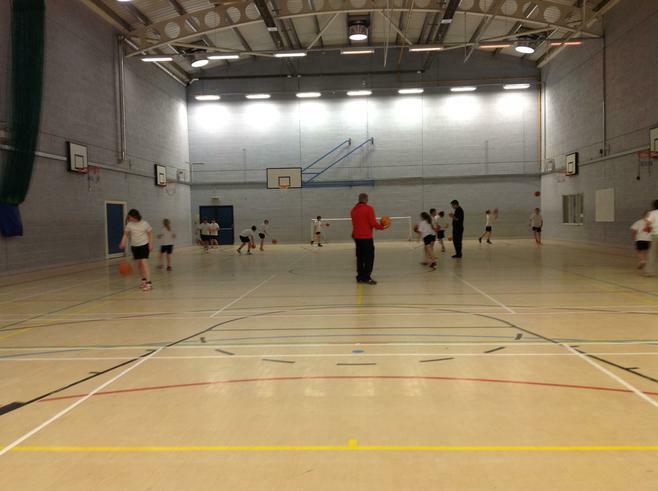 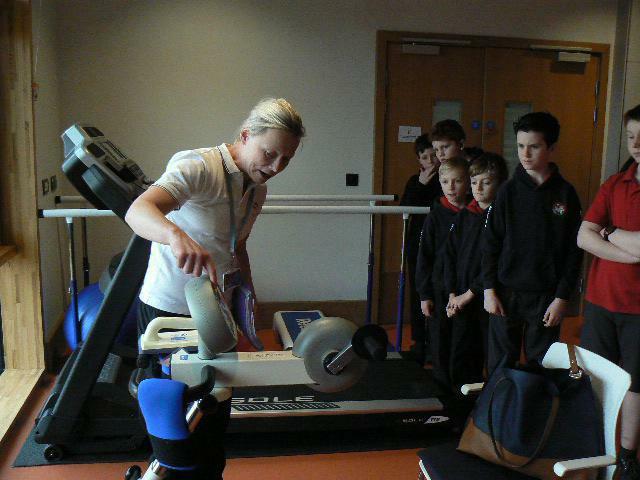 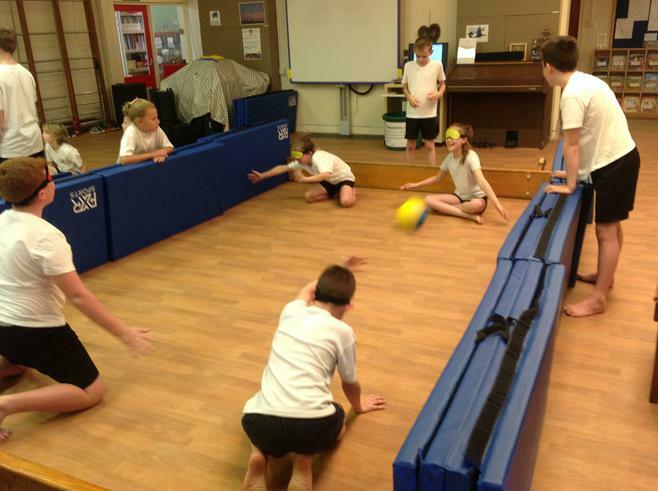 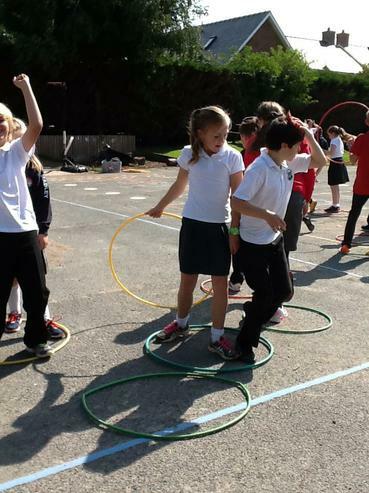 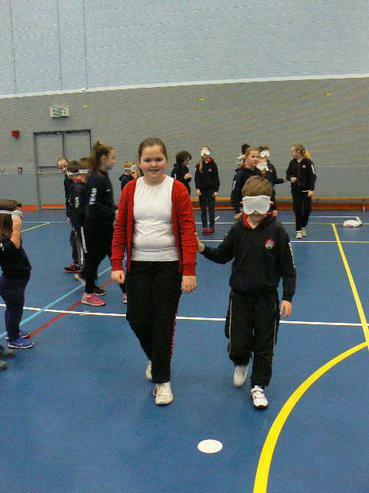 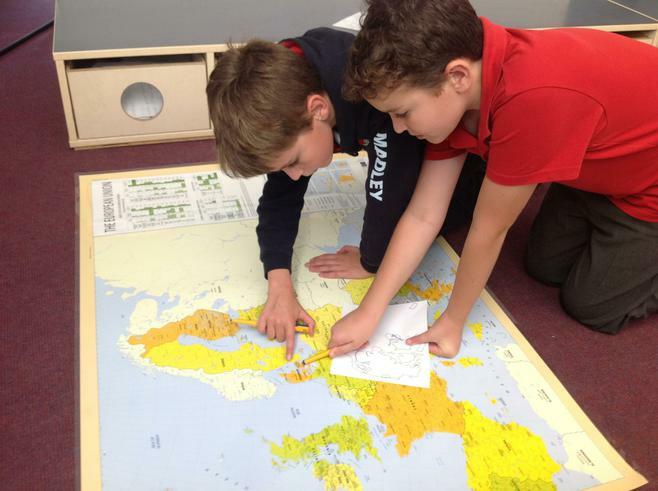 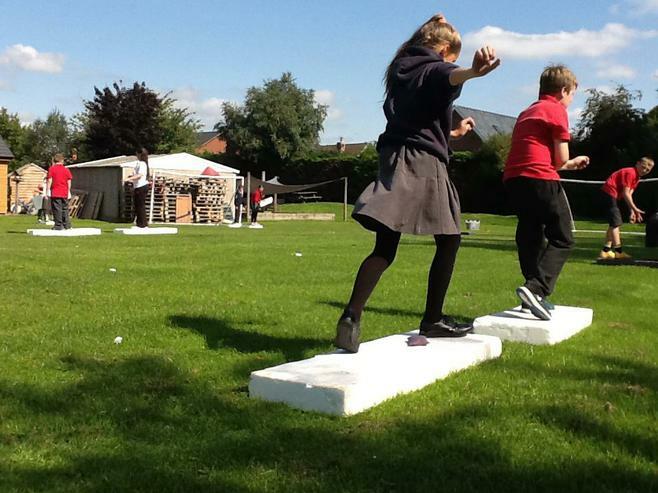 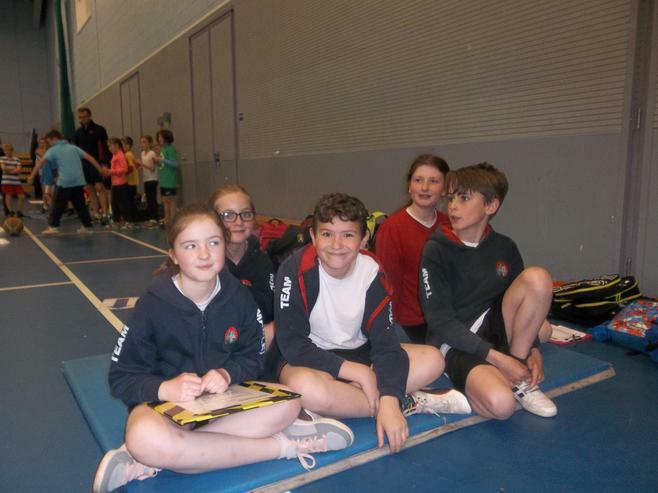 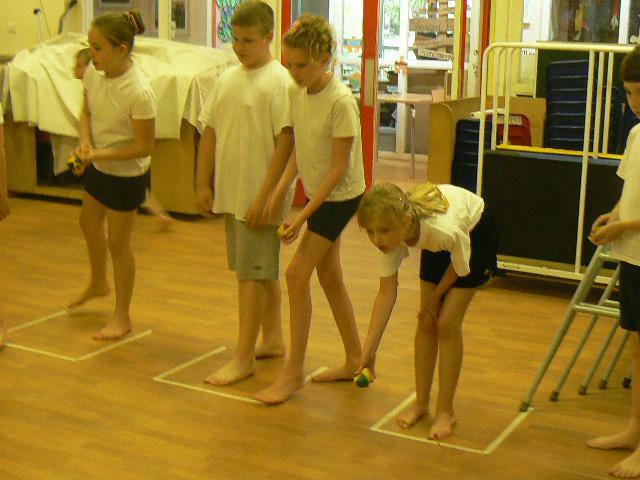 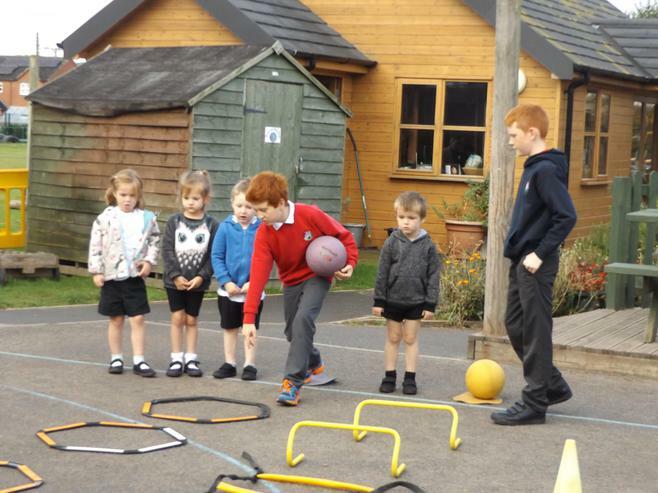 Class 6 explored the game in their PE lessons last term after following the Paralympics. 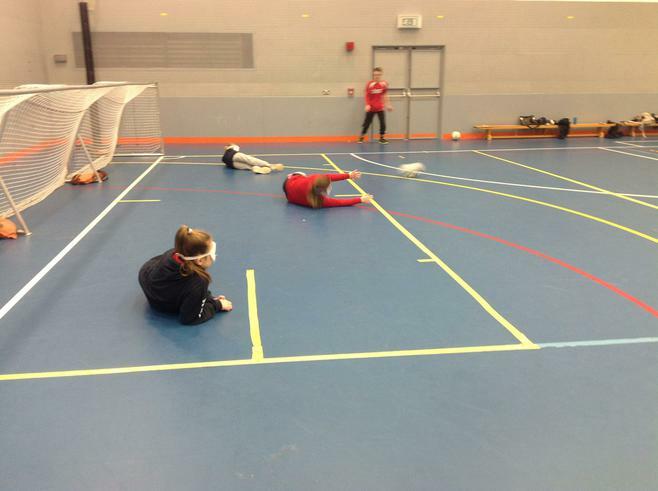 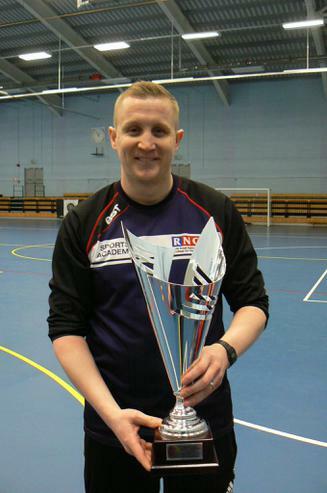 This term they have been fortunate enough to go to the Royal National College for the Blind to play using their fantastic facilities and be coached by their team players including Kali Holder, who has been selected to play for the GB women’s team. 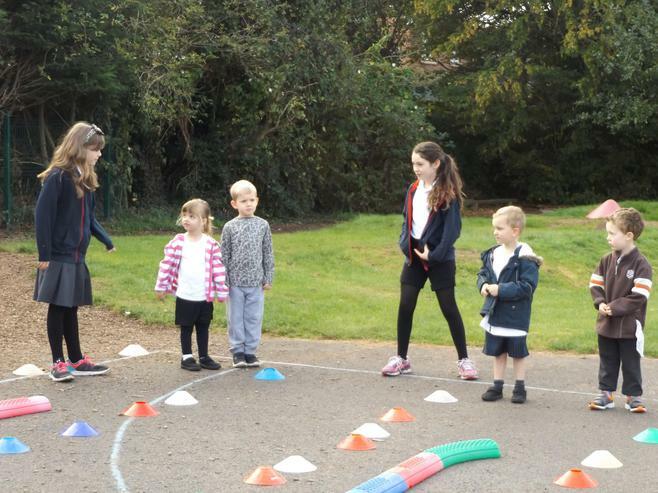 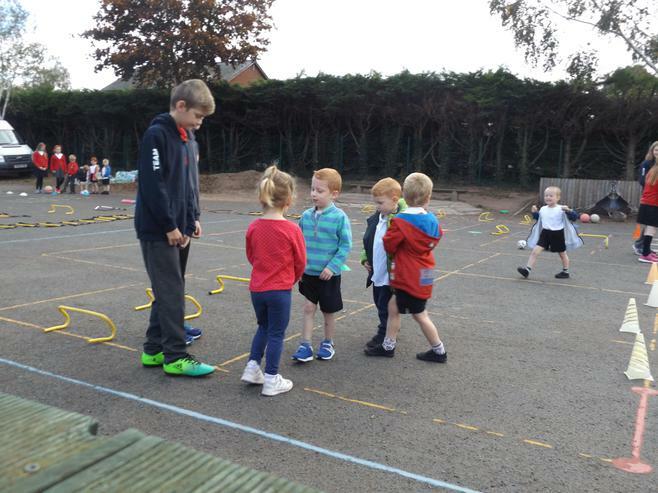 It was an amazing opportunity for the children and they have since enjoyed playing their own games and engaging their parents in a game at school. 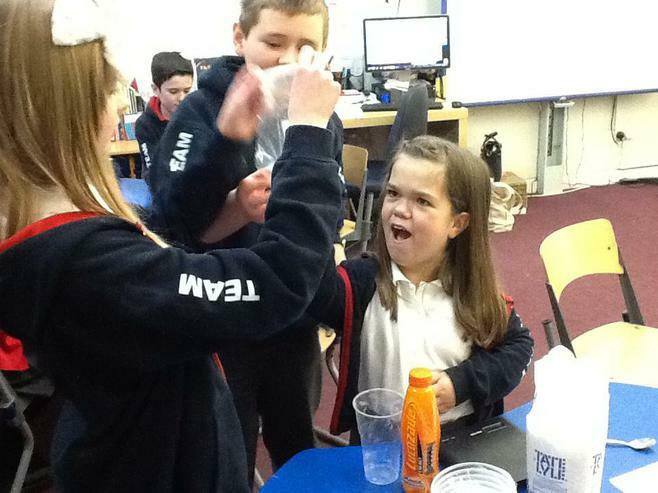 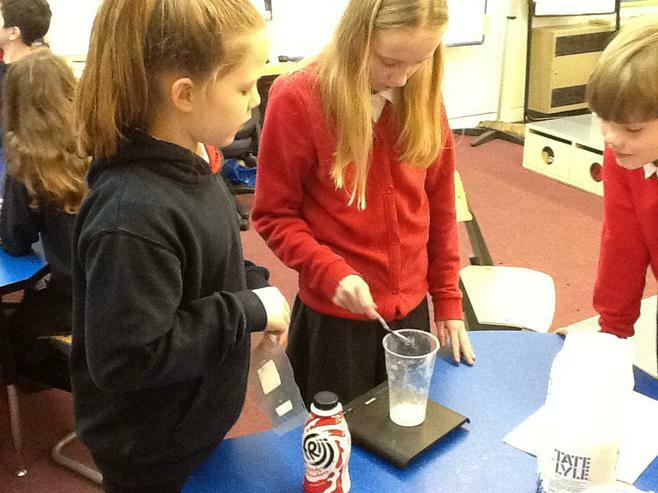 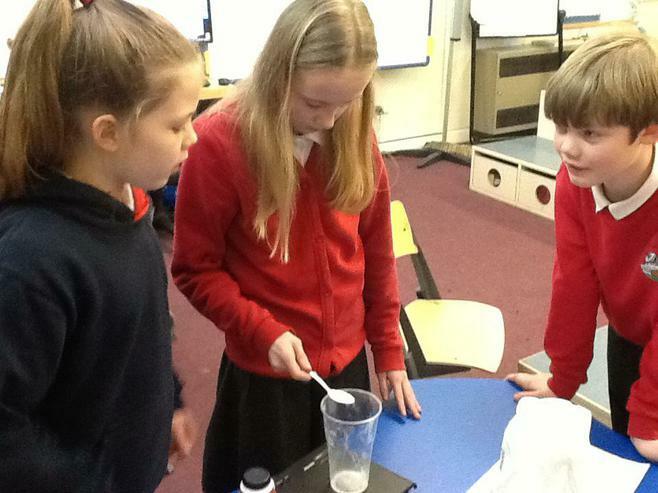 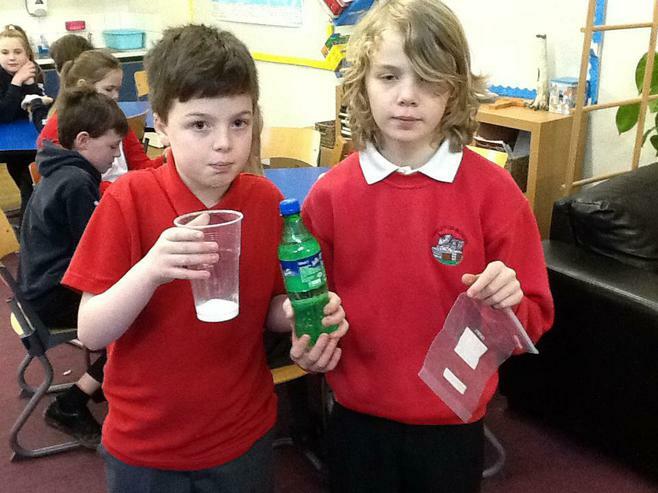 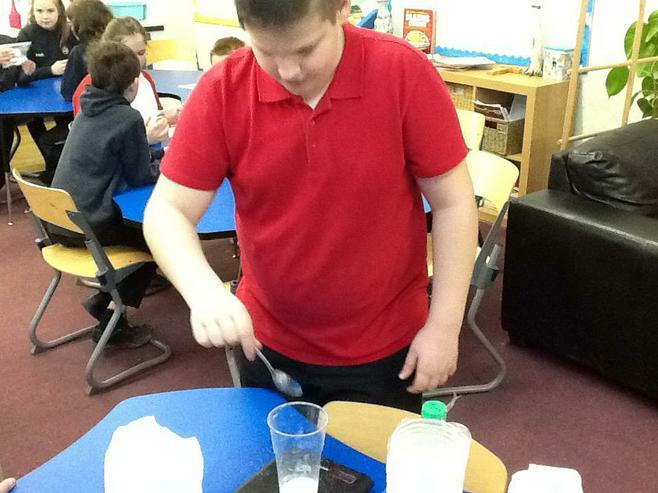 In science, the children have been investigating the amount of sugar in their drinks. 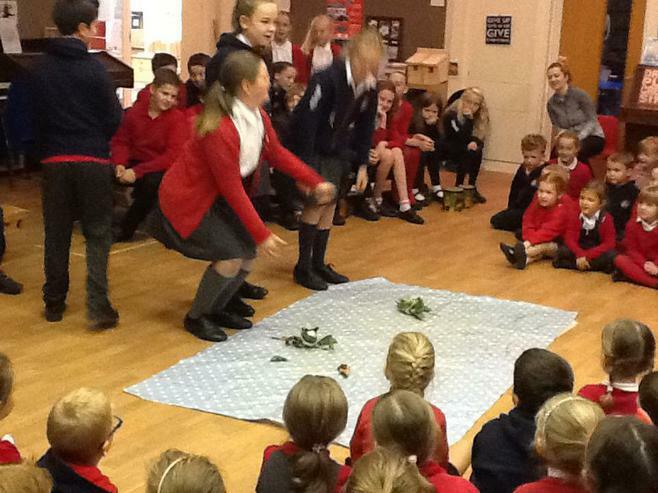 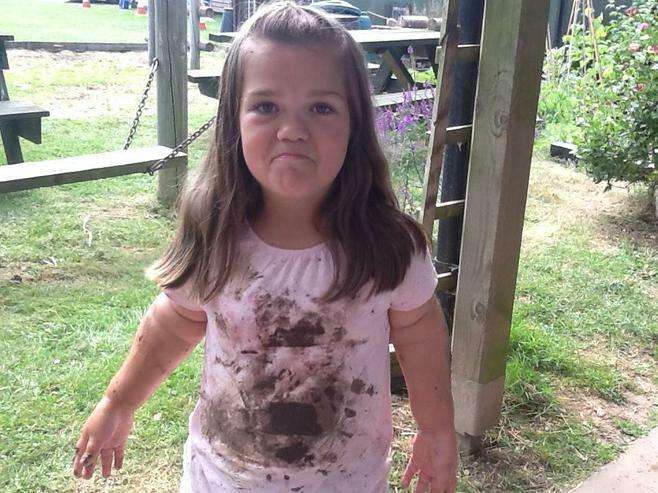 The results were surprising for both the adults and the children. 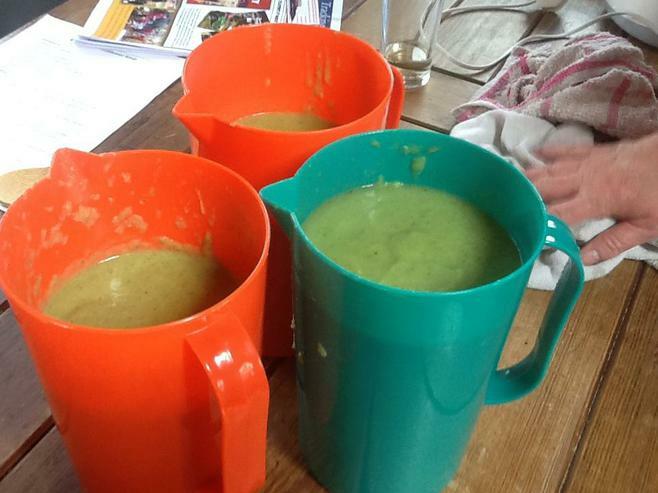 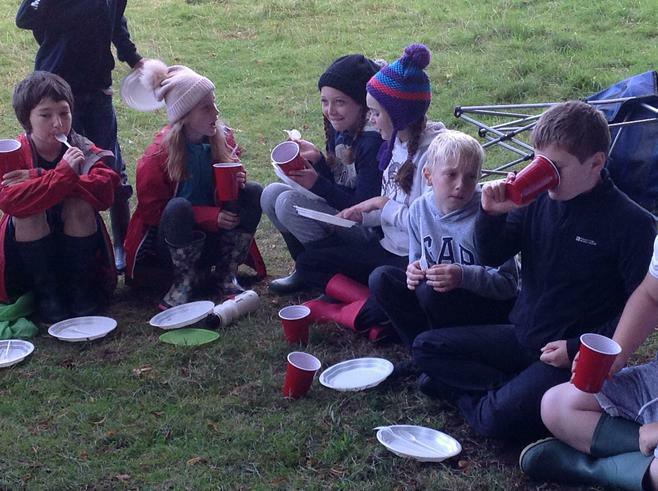 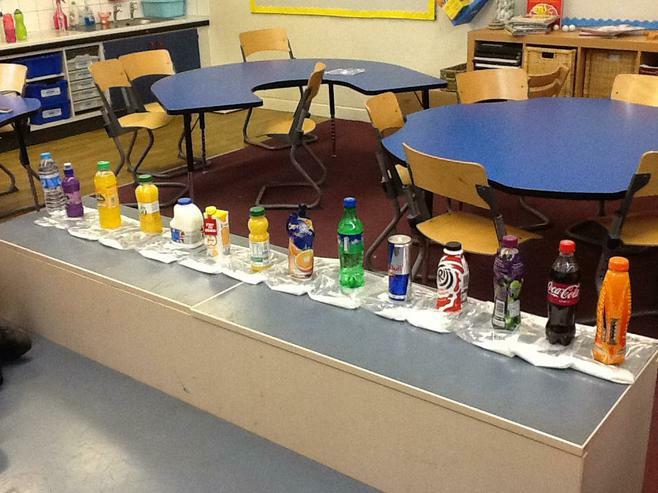 Before looking at the food labels and sugar content, the children had to order the drinks with what they thought would be the least to most sugary. 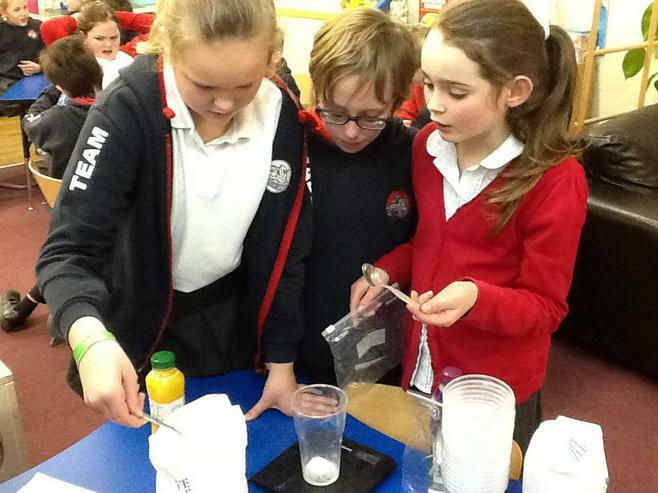 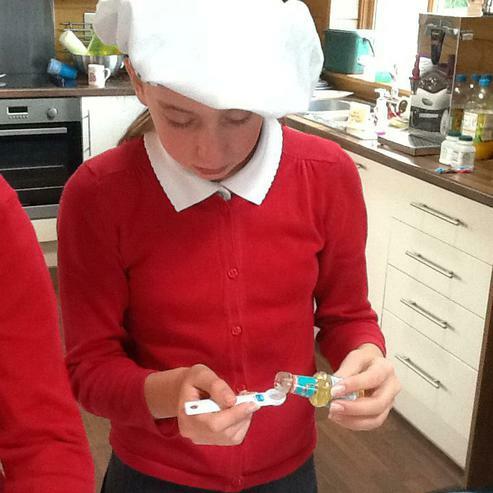 Following this they used the information on the labels to measure out the sugar quantity. 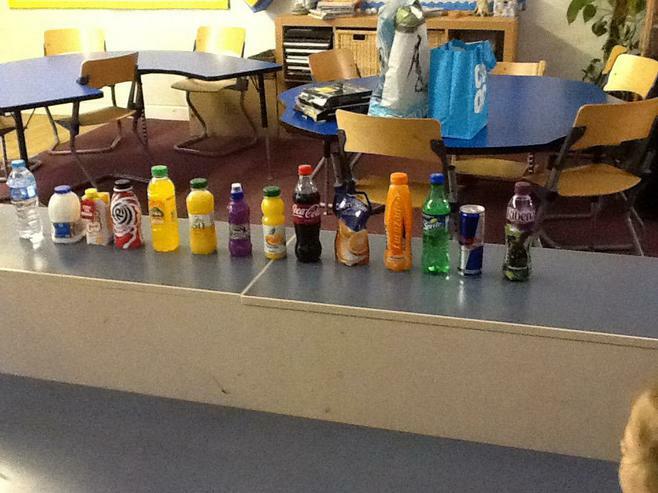 The final order of the drinks was then shown. 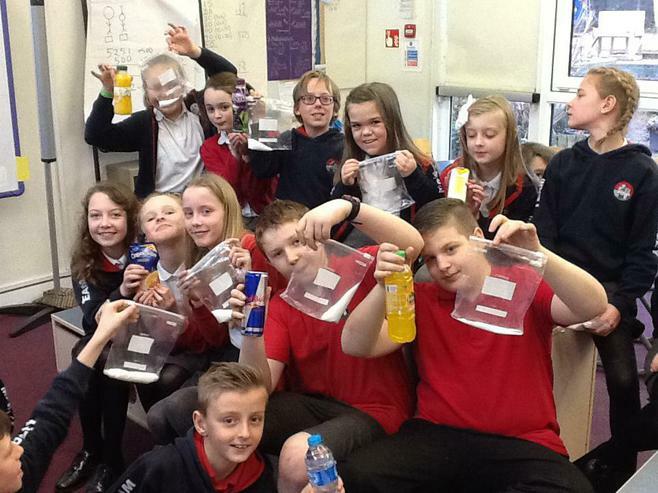 The Frij milkshake and Capri Sun gave the children the biggest shock as they had previously though these would be the healthiest options. 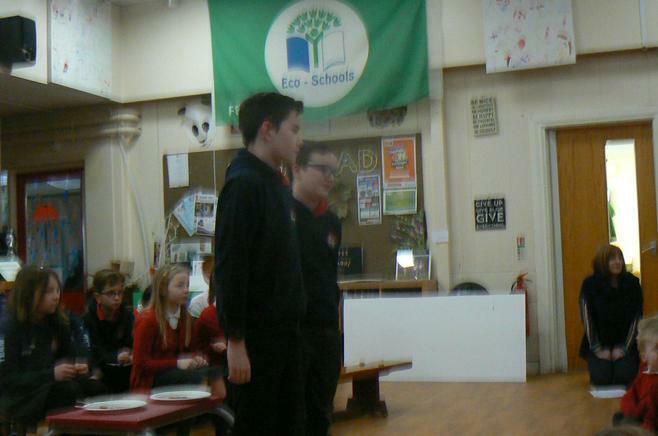 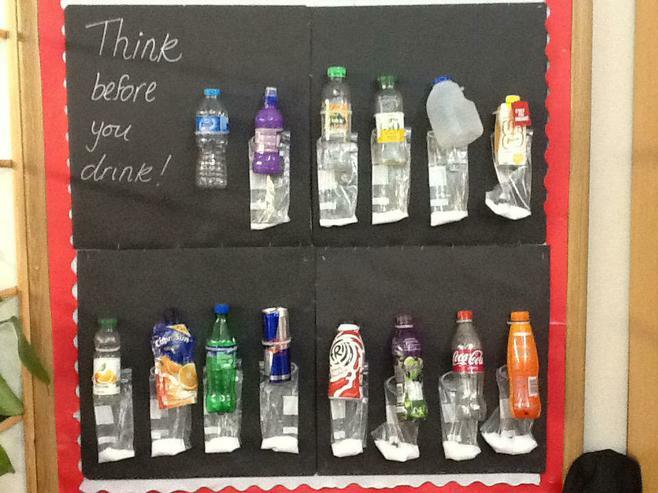 Oisin's report on sugary drinks at Madley! 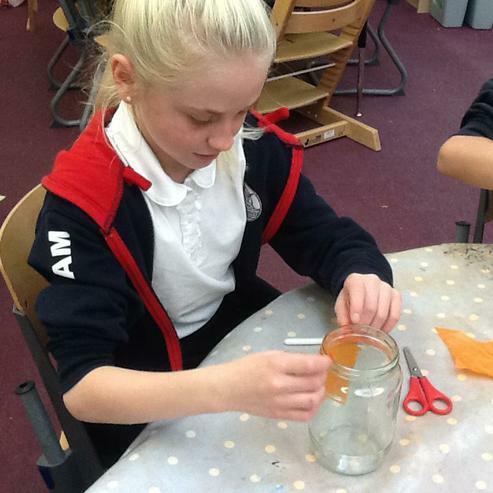 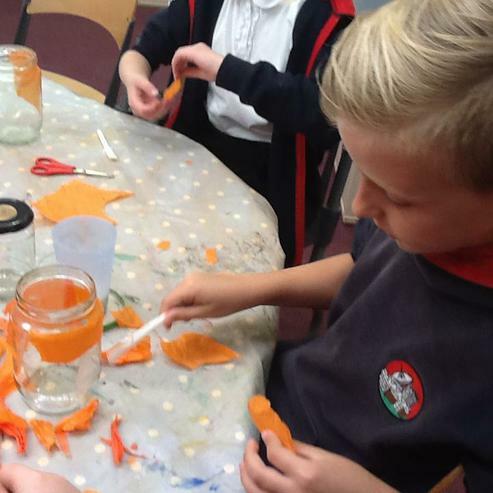 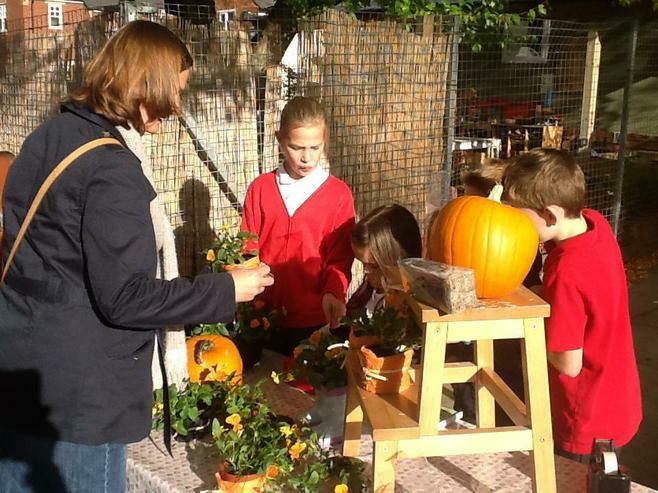 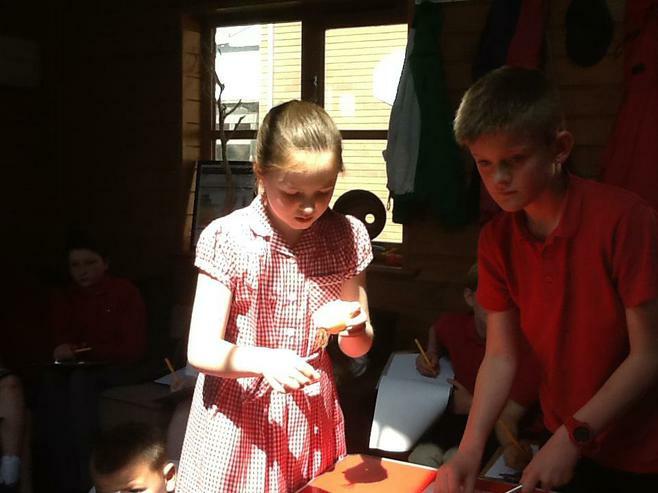 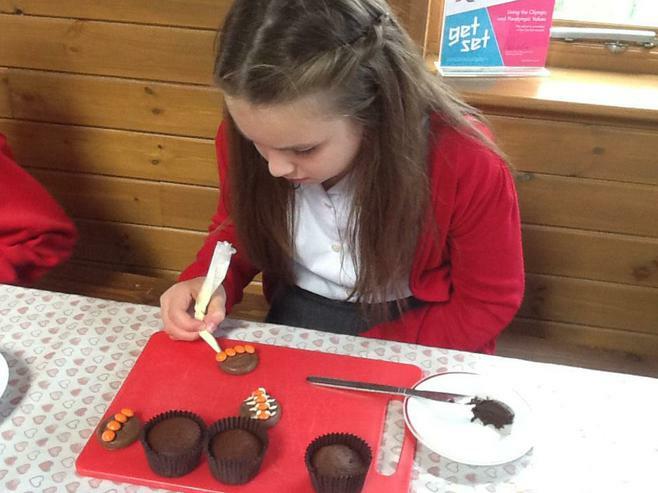 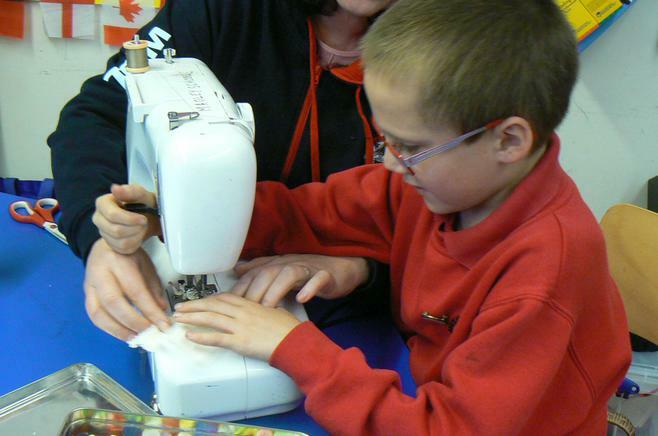 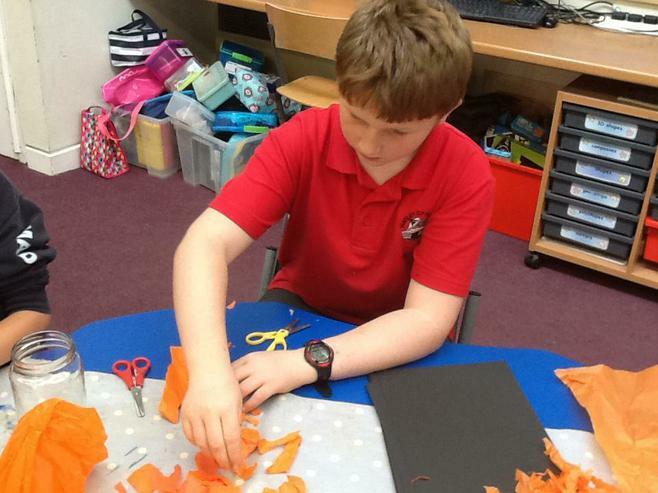 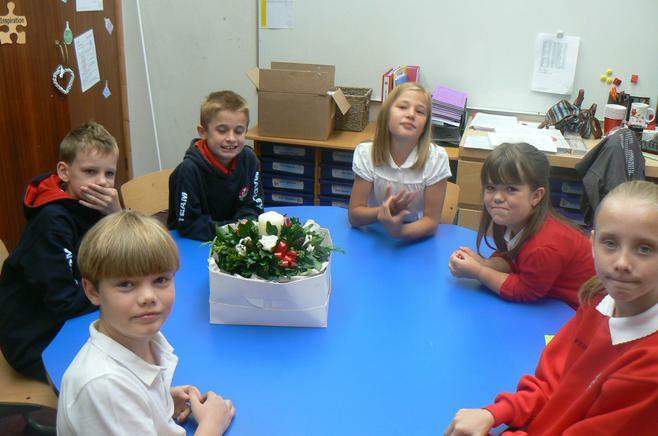 The children had a very busy week preparing their Autumn products for the sale. 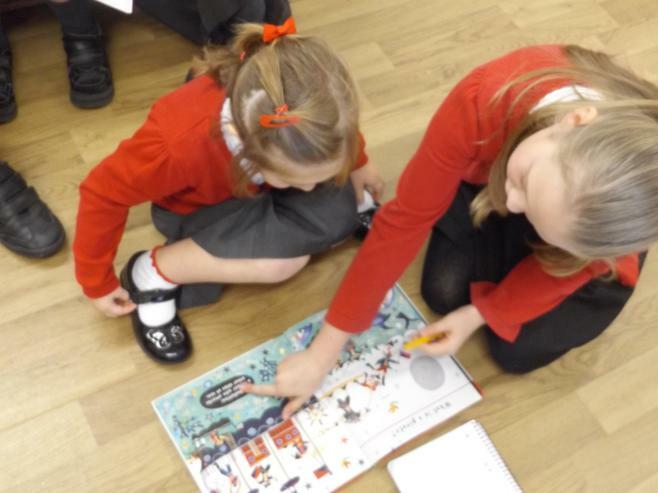 It was very exciting and meeting deadlines became real for the children. 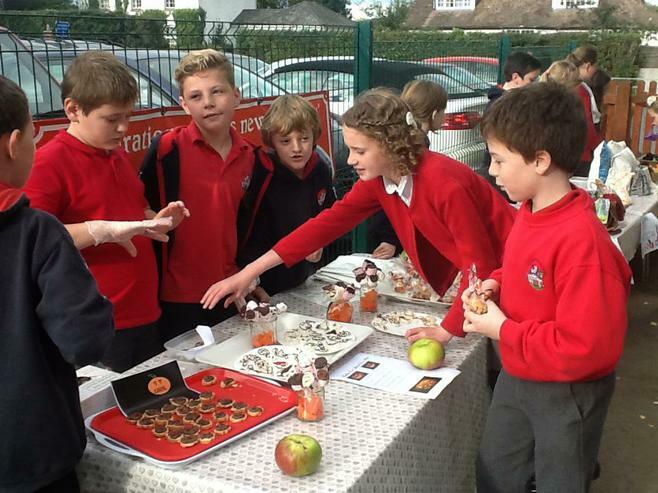 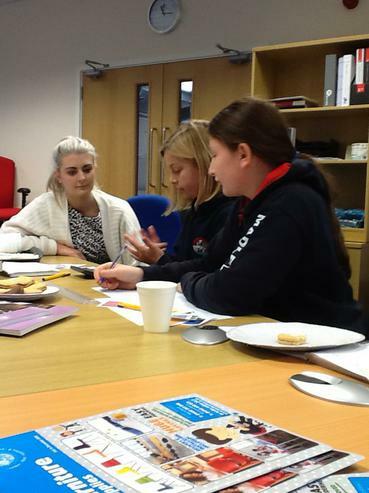 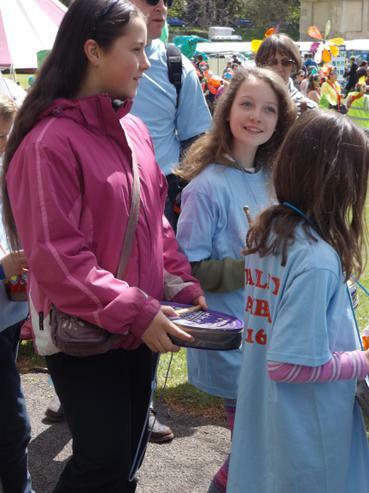 They were all focused and showed maturity in their approach to the build up and selling day. 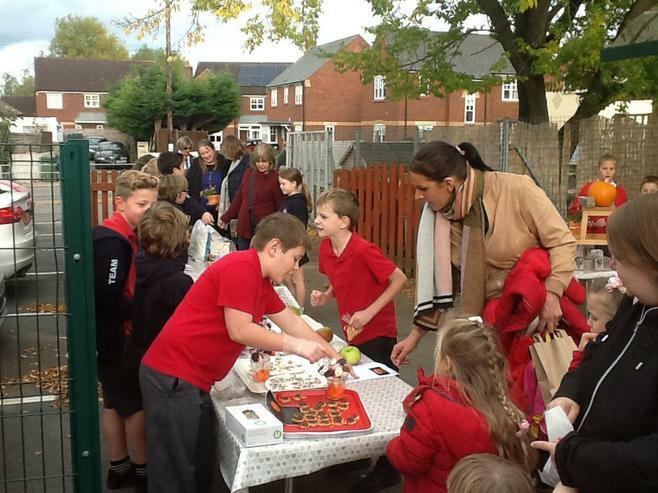 There was a lovely atmosphere outside school while the children encouraged the parents, grandparents, aunties and uncles to spend their money. 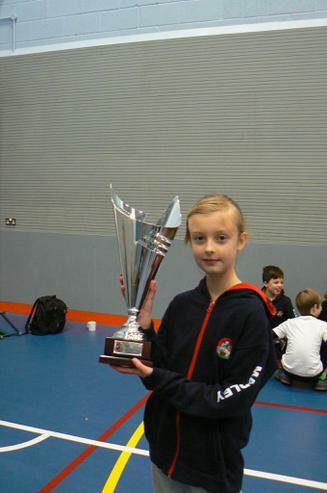 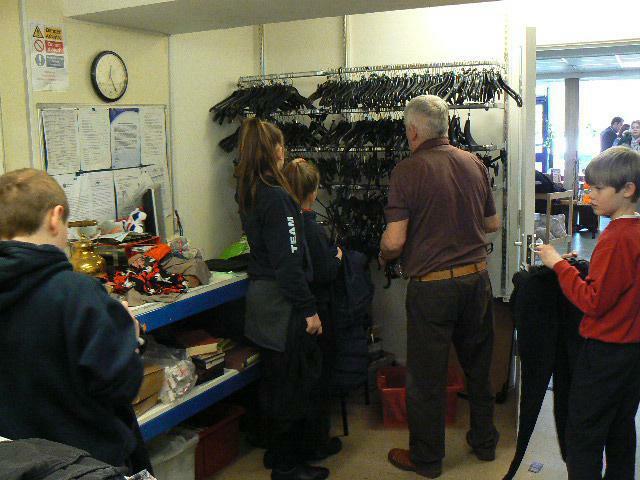 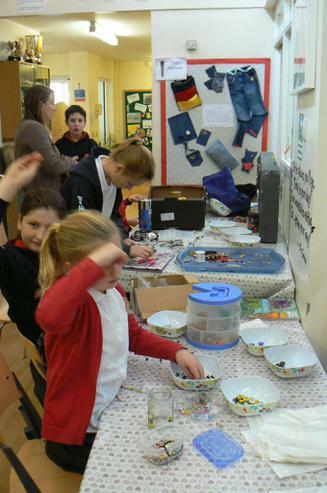 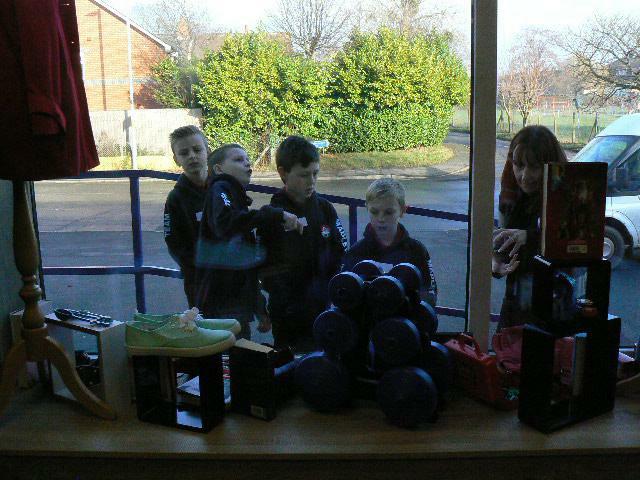 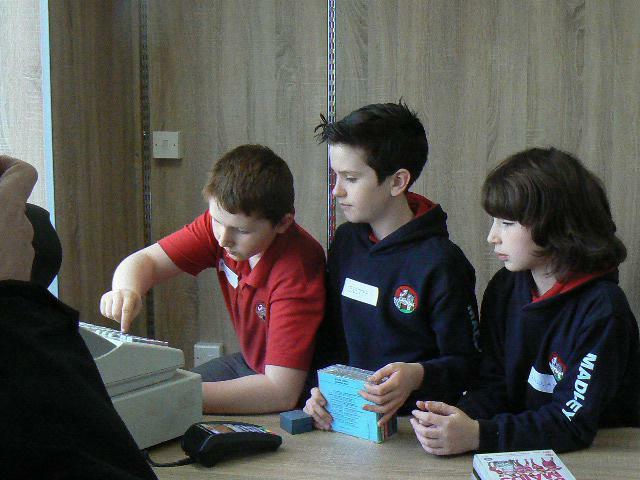 A very successful sale was had for all Enterprise groups involved. 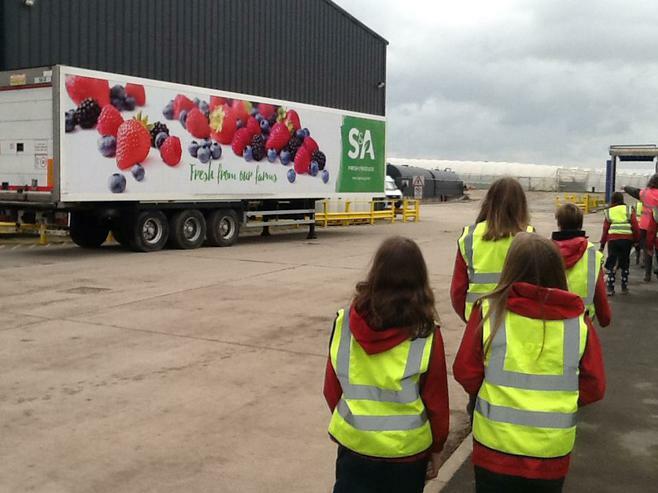 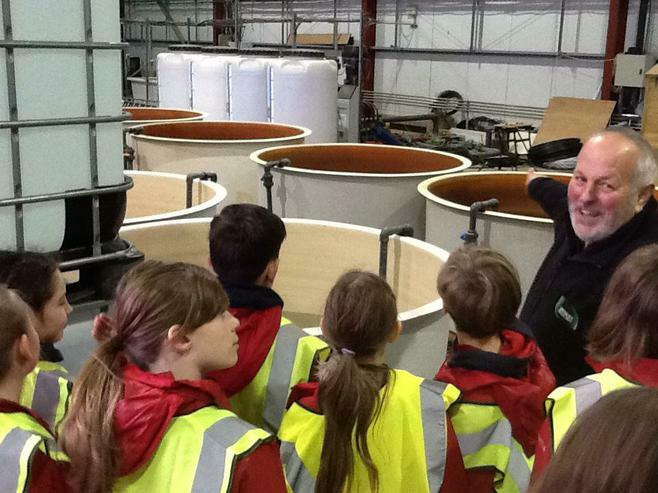 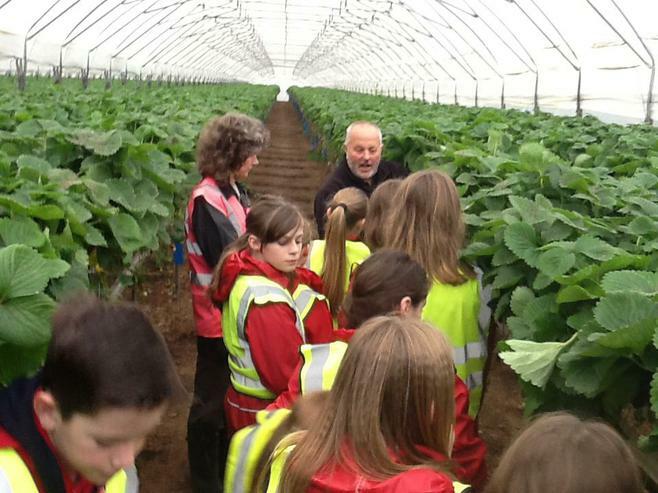 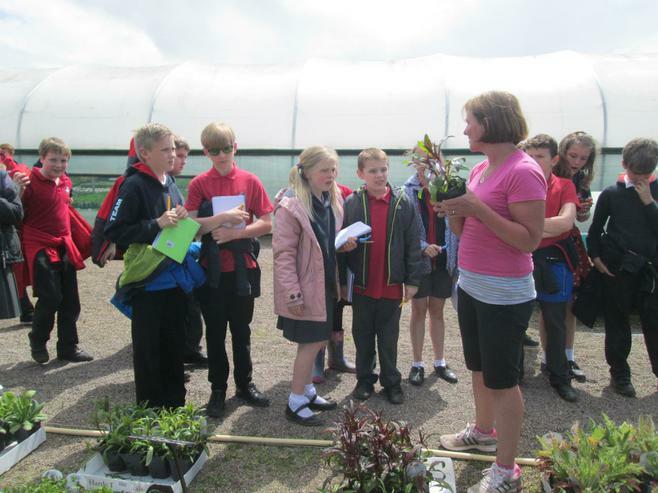 As part of our Madley Enterprise project we have been to visit Madley Plants. 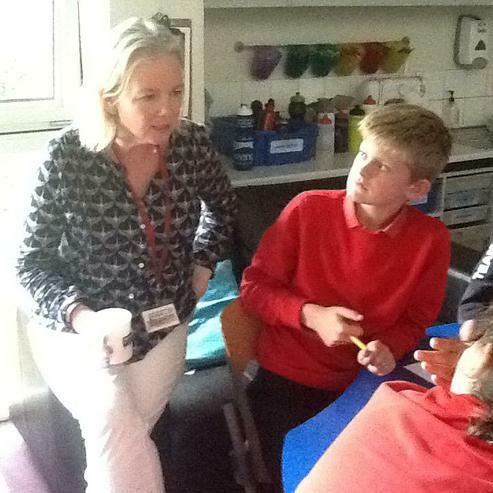 While there, Michelle talked to us about what it was like to set up a business; how the idea came about and why her family chose Herefordshire! 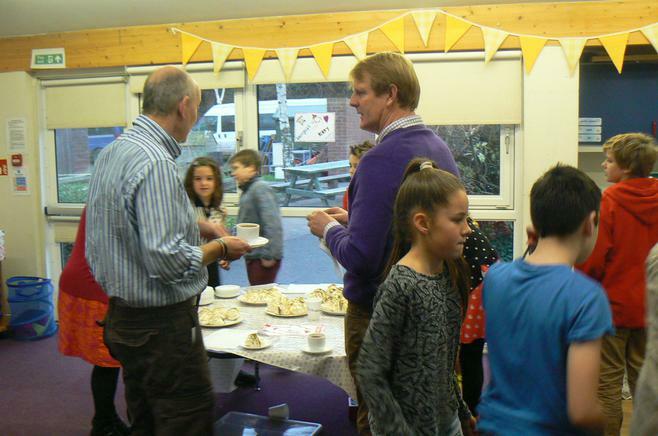 It was made very clear that there are many elements to running a business and in particular we talked about strategies for attracting new customers and ones to look after your regular customers. 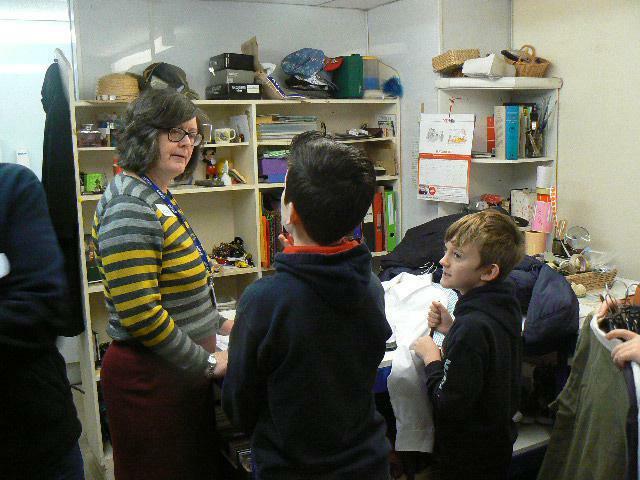 It was great to hear about how profit margins work in a real setting and Michelle offered some excellent tips for the Year 6 Enterprise groups. 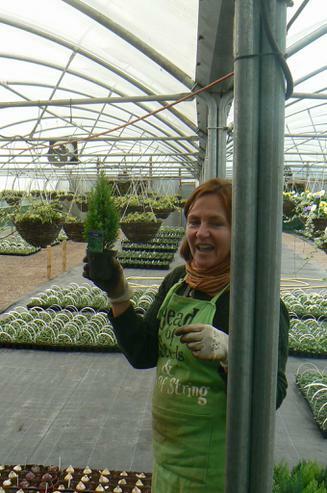 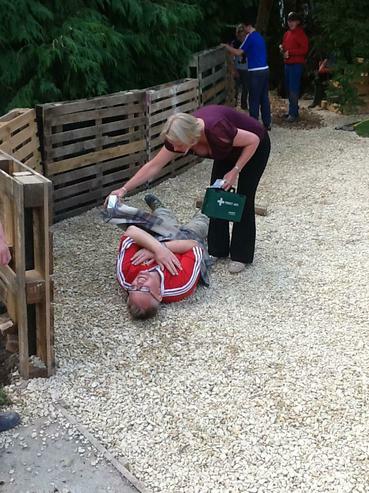 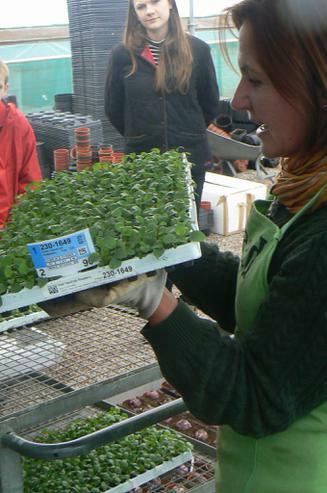 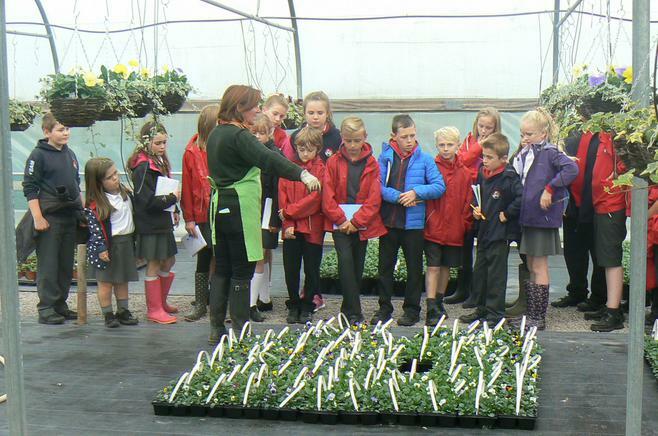 Since the visit, the florist group have been back to purchase plants and package them for their own Autumn sale. 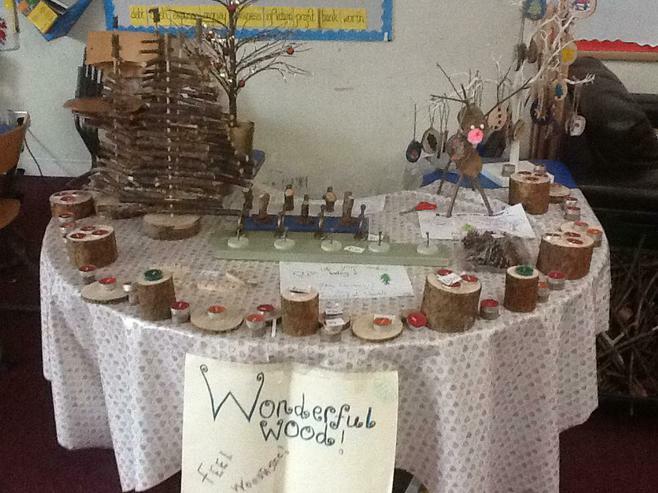 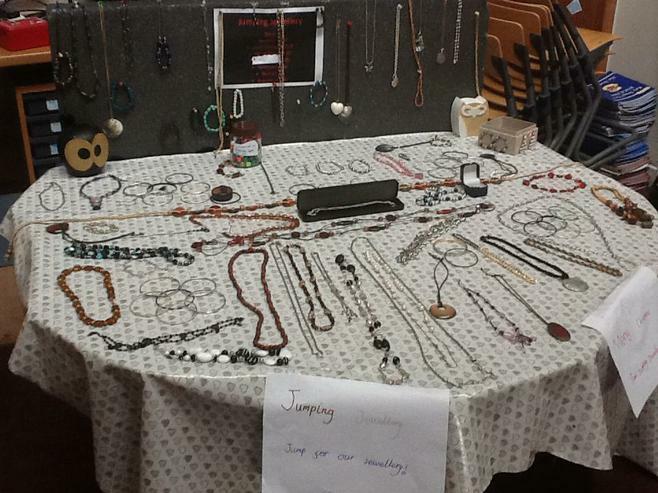 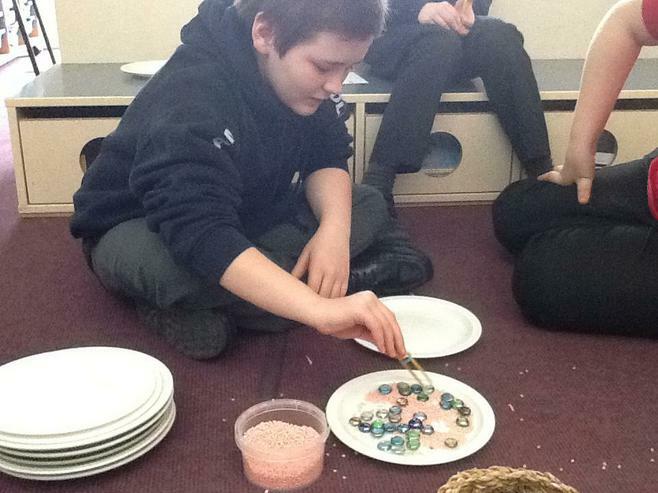 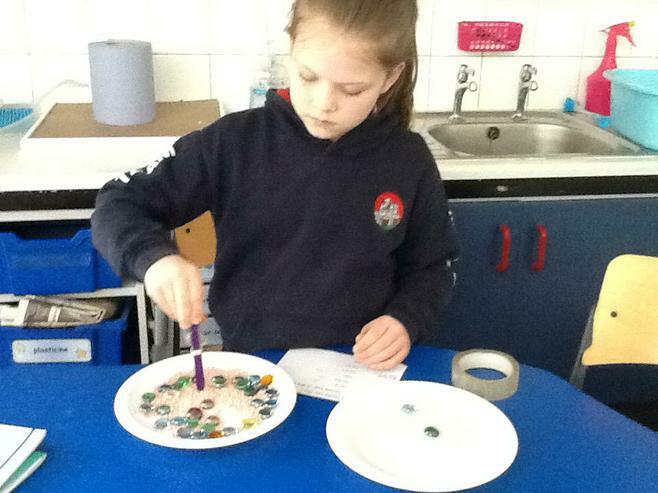 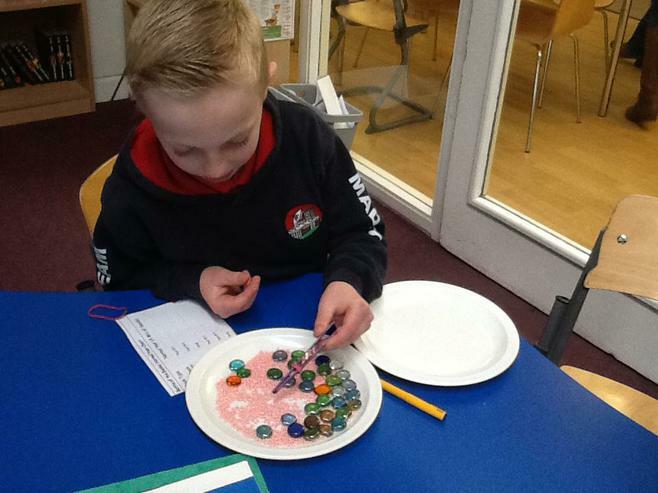 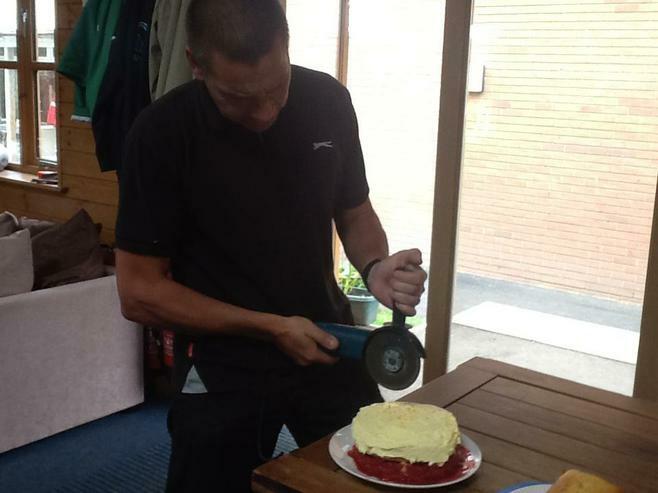 The products were very popular and a profit was made! 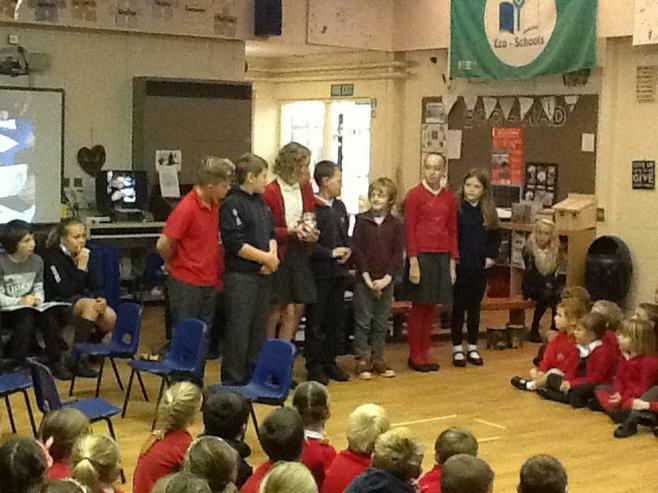 The children really enjoyed the challenge of deciding for themselves how the assembly would work and what they wanted to include. 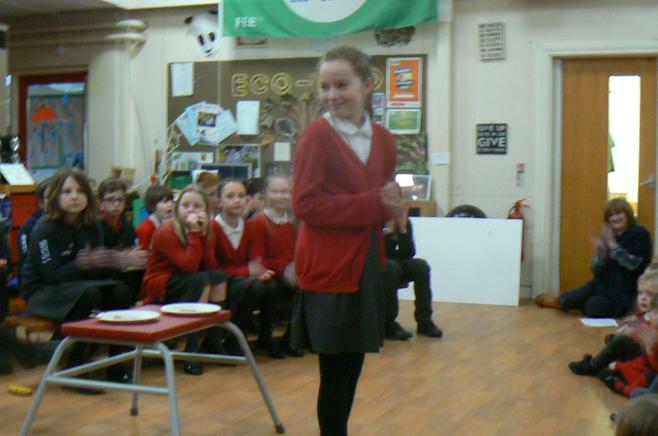 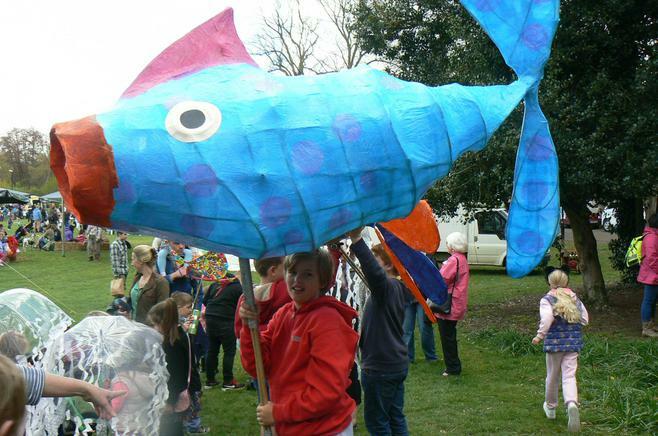 We were all very nervous on the day but thought it was a great success in the end. 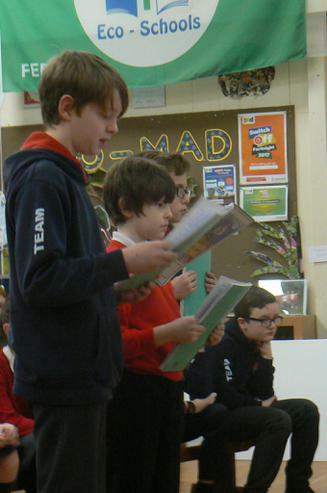 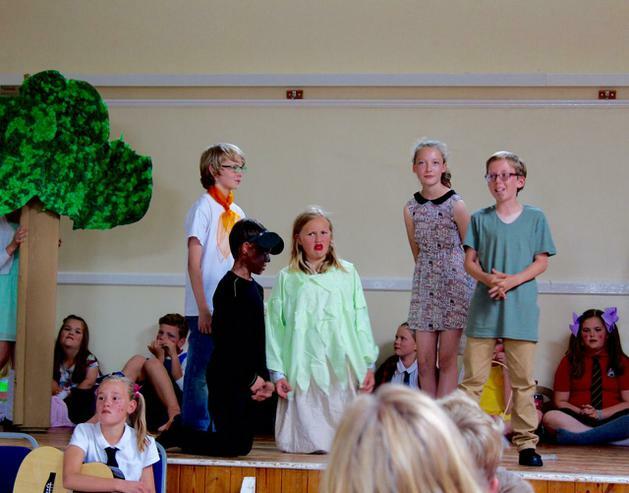 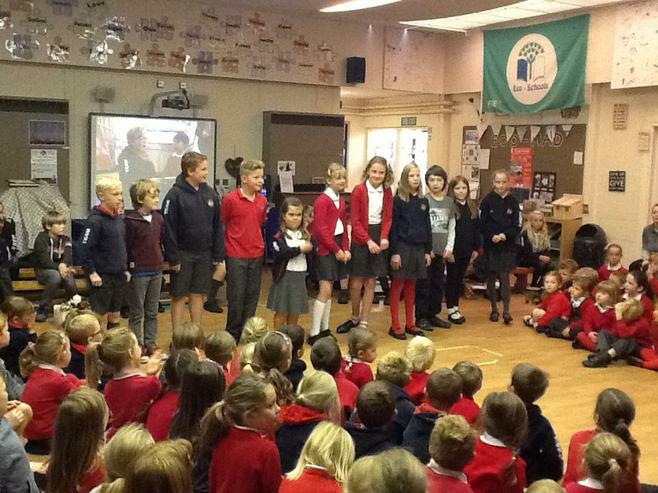 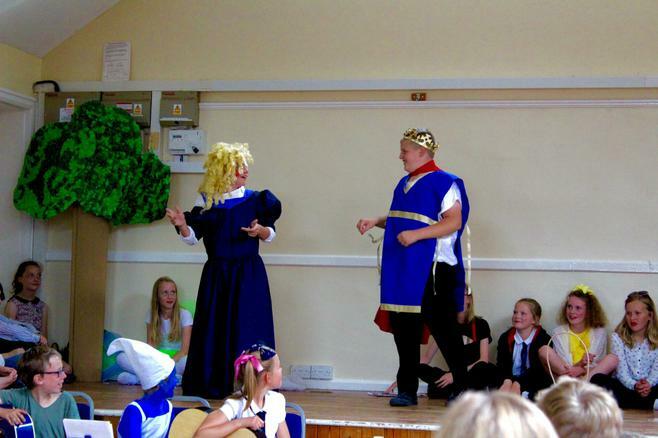 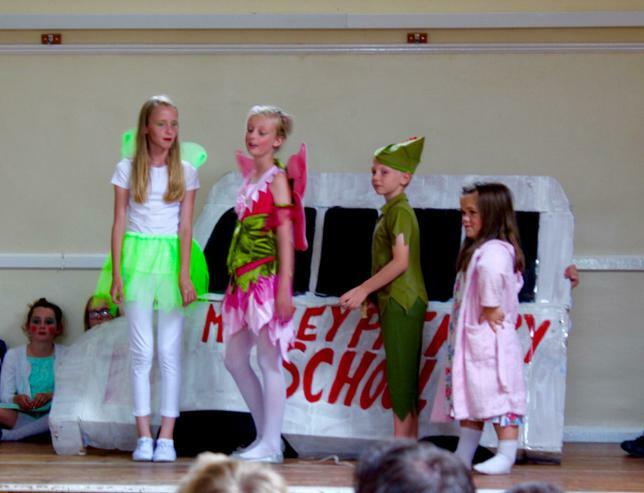 The children clearly shared their learning and confidently involved the audience (including pupils, parents and teachers). 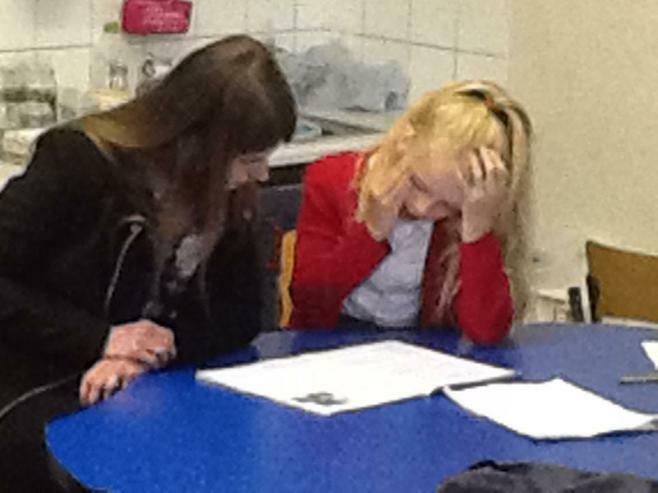 Being able to share Learning Journey's with parents afterwards is always a pleasure. 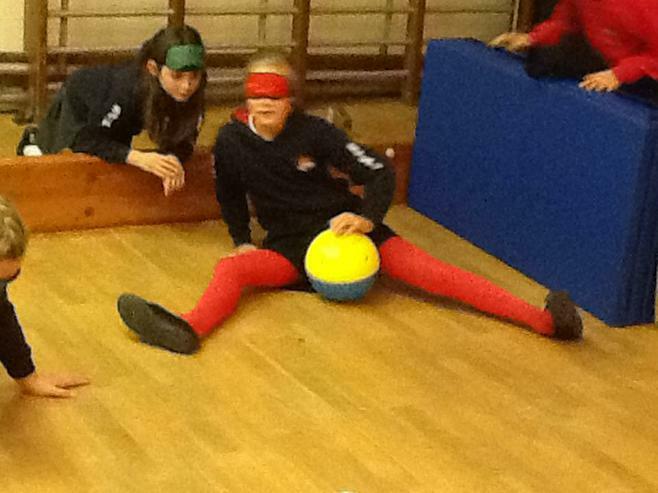 In PE and at break times, we have been thinking about the Paralympics and the athletes that take part. 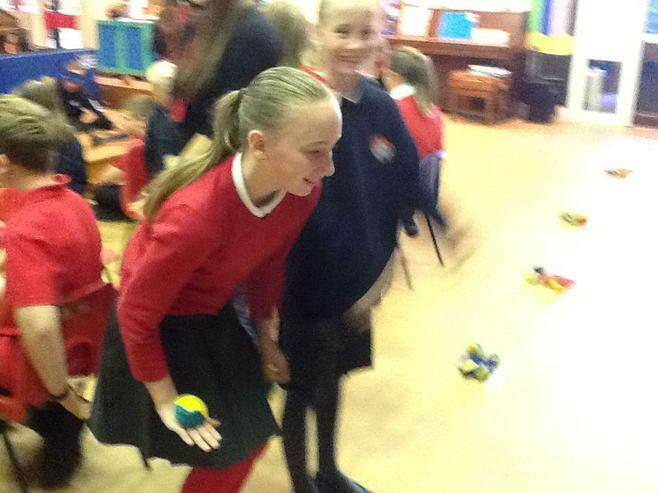 We have played games such as boccia, goal ball and finger fencing! 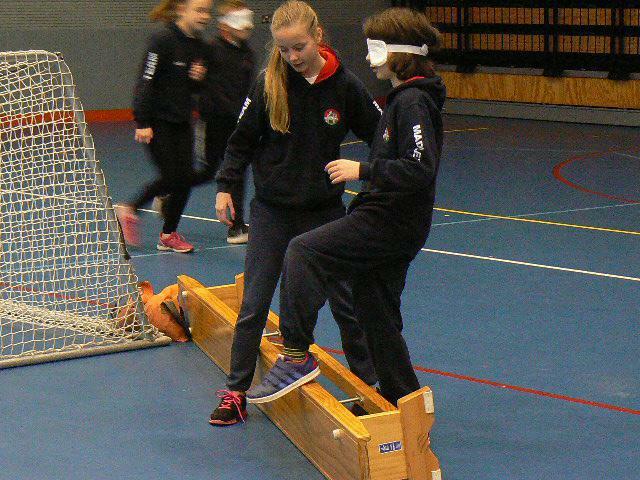 It has helped us to appreciate the effort and determination needed by all athletes to be good and even great at the sports they compete in. 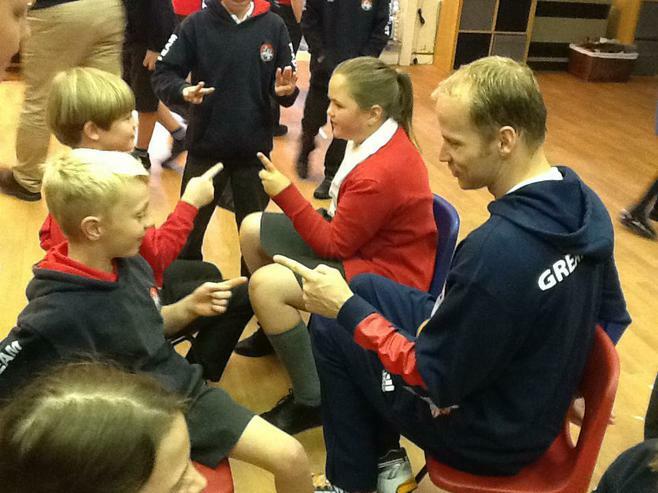 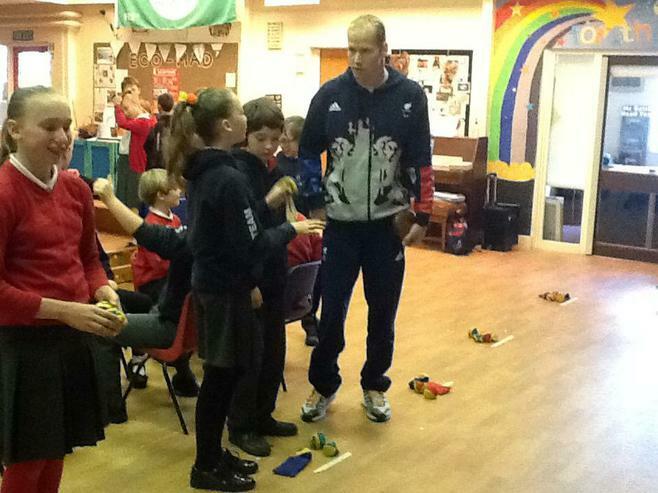 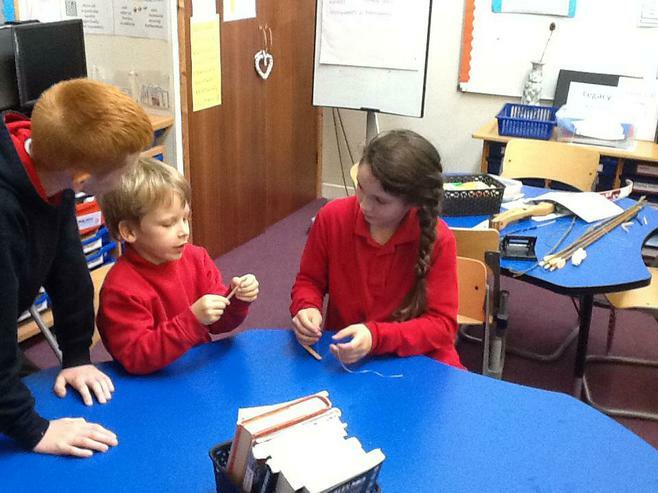 We enjoyed sharing our learning with Sasha Kindred, a six time Paralympic champion on his recent visit to our school. 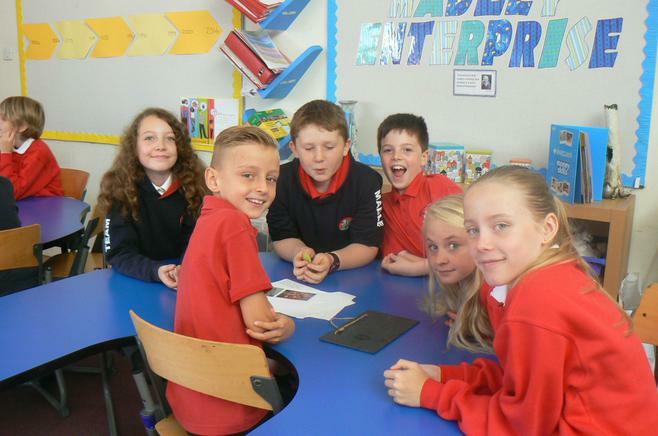 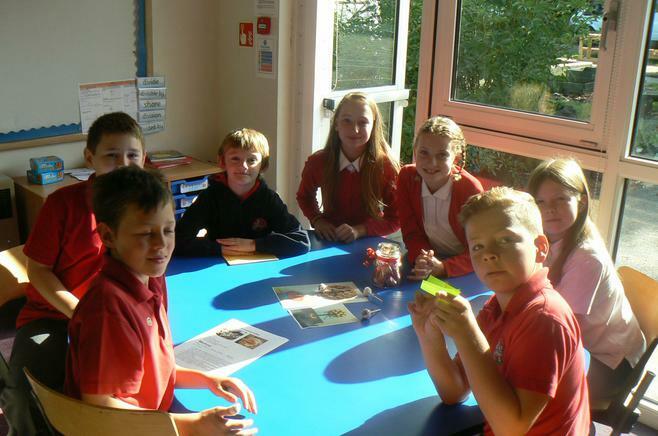 Welcome to Year 6. our theme this term is Madley Enterprise and we will be working in groups to develop our own businesses. 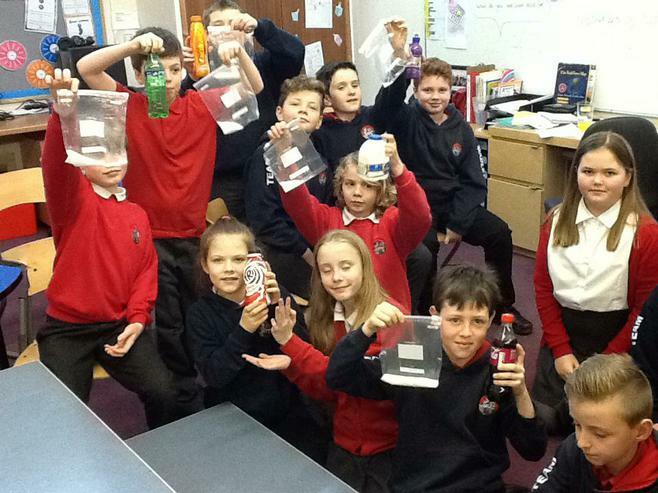 As the term progresses we will develop products to sell and work with many local businesses to deepen our understanding of how business works. 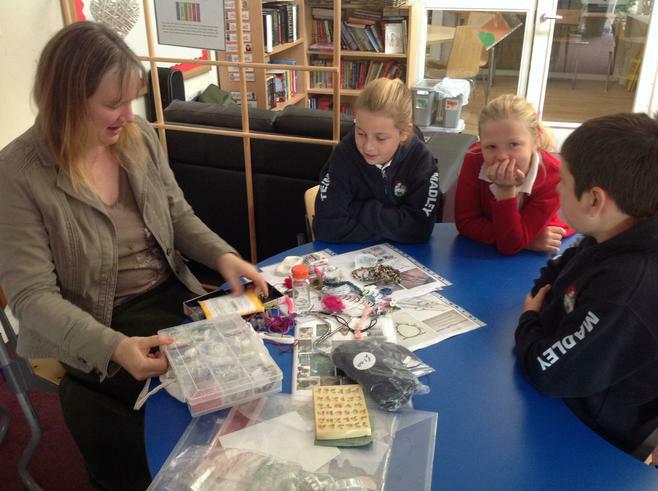 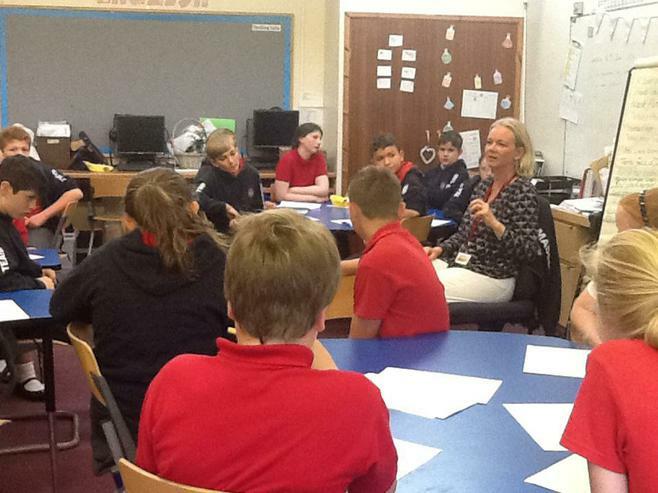 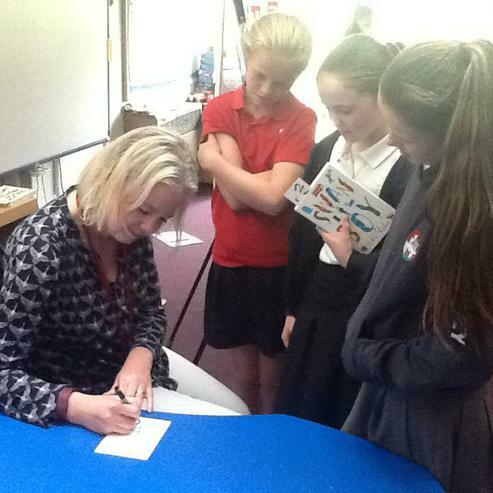 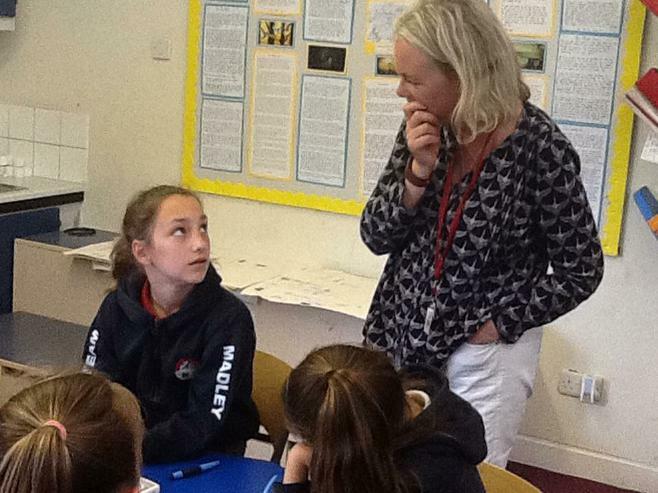 Class 6 had the opportunity to work with author Nikki Sheehan . 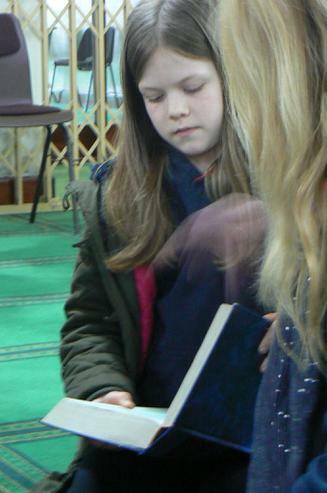 Nikki has written two books , Who framed Klaris Cliff ? 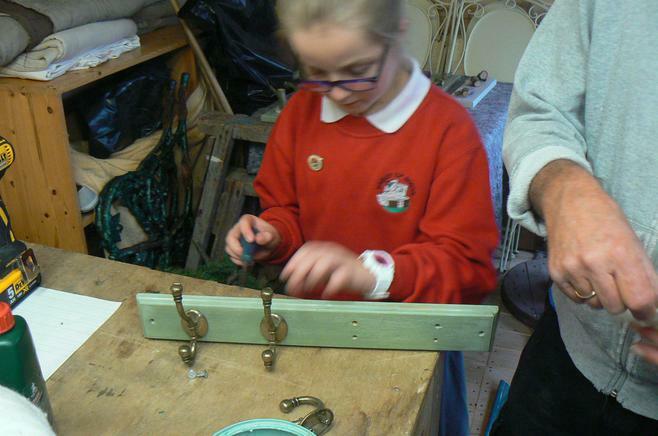 and Swan Boy and is currently working on her third! 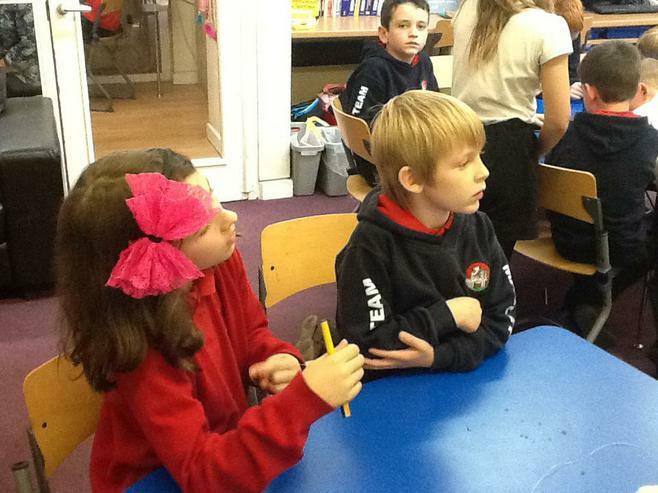 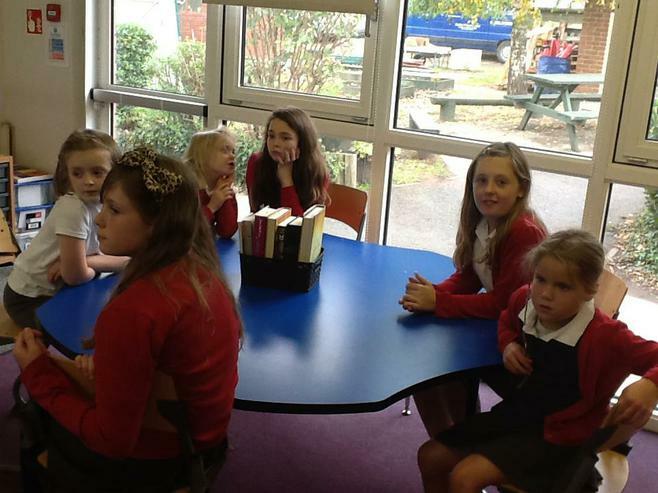 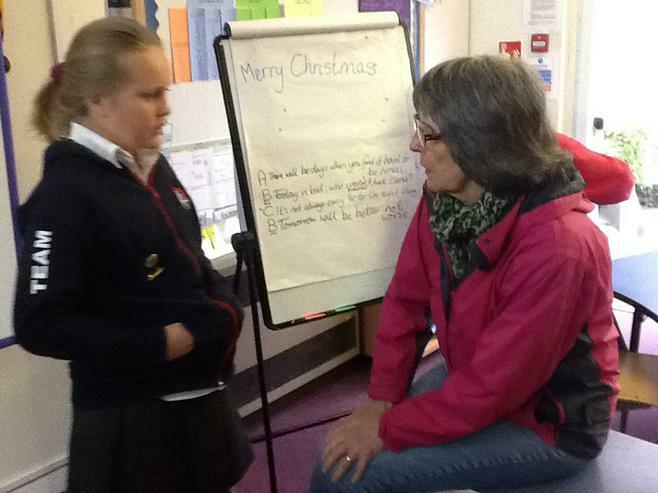 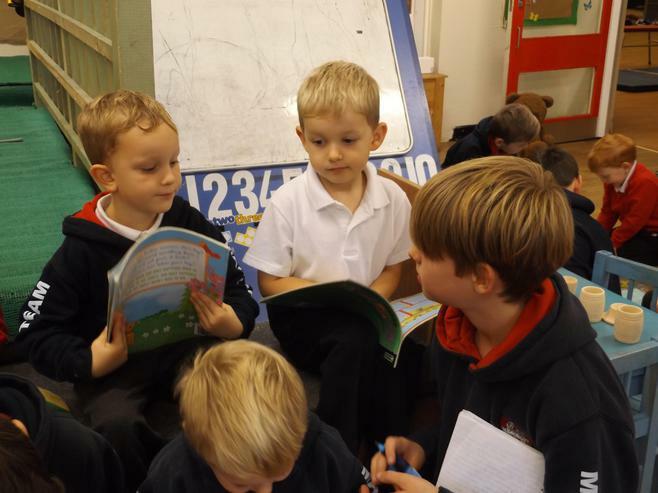 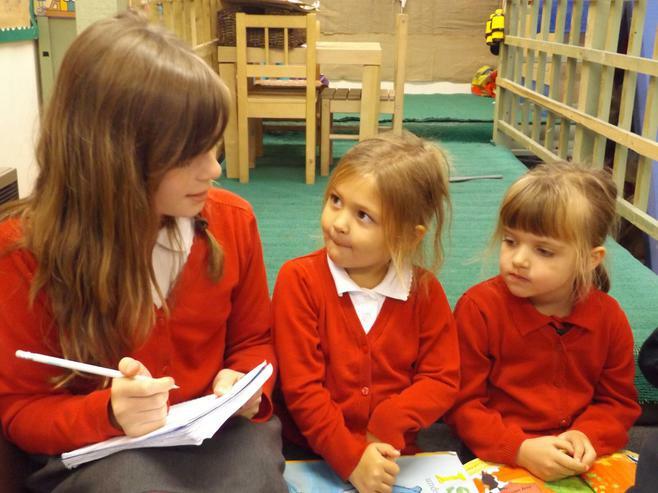 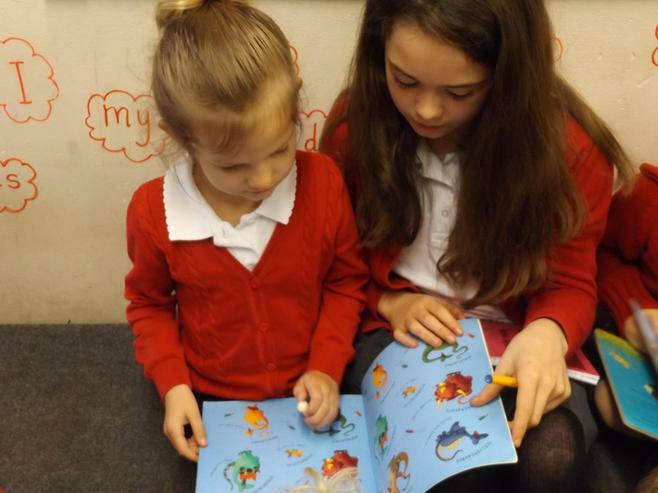 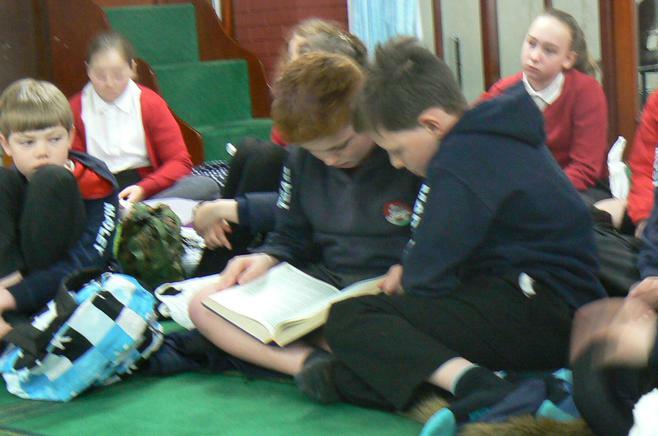 Nikki encouraged the children to write a story based on an imaginary friend , collectively the class worked on an opening paragraph and the children have been inspired to write imaginative and inspiring texts . 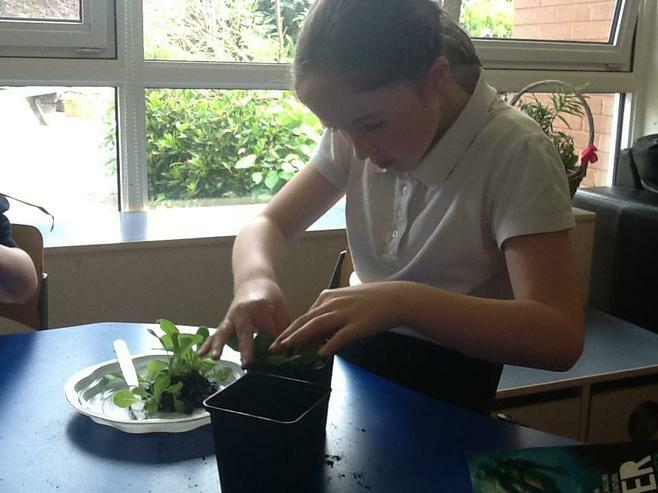 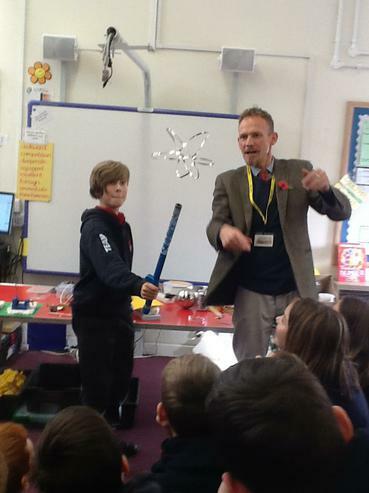 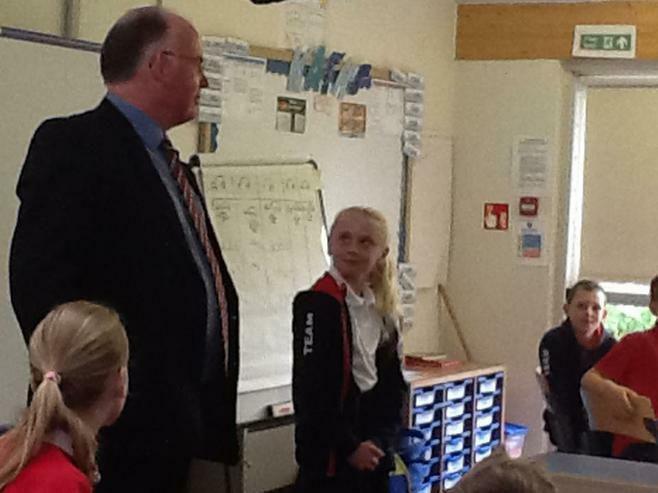 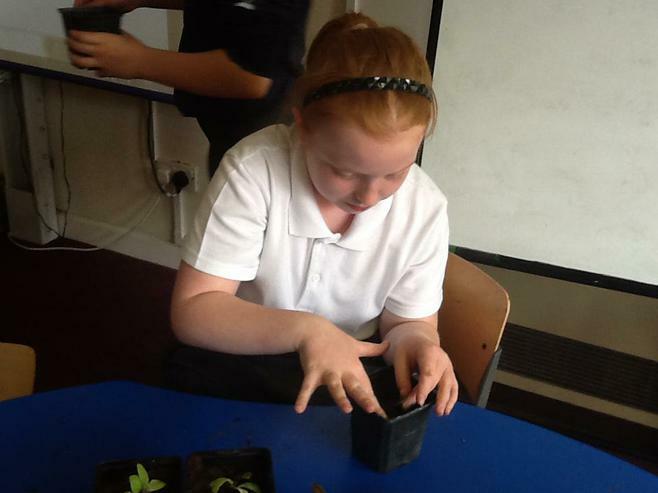 We would like to thank Peter Clay who volunteered his time to visit year 6 whilst the explore their topic of how does your garden grow ? 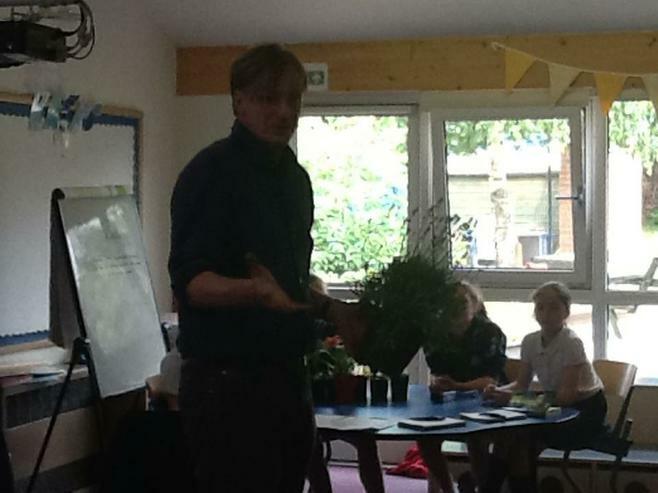 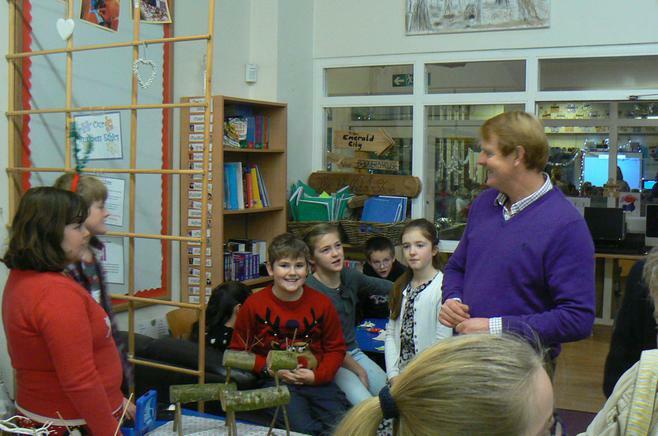 Peter is an extremely experienced gardener who was on hand to offer tips and advice to promote the children's learning. 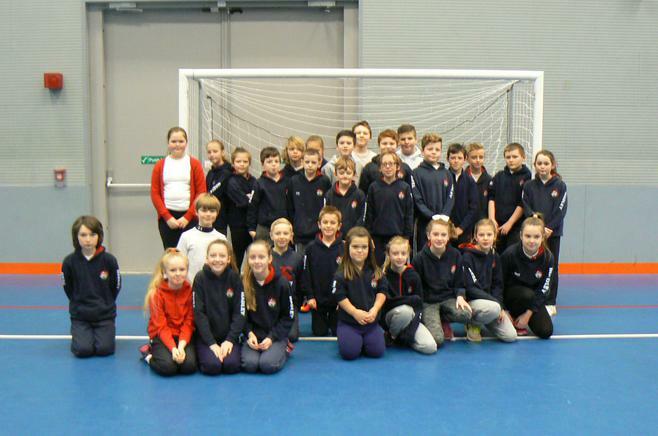 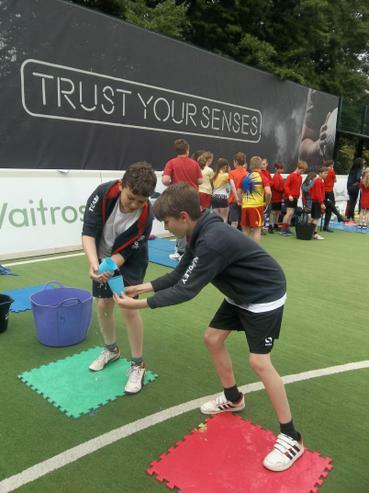 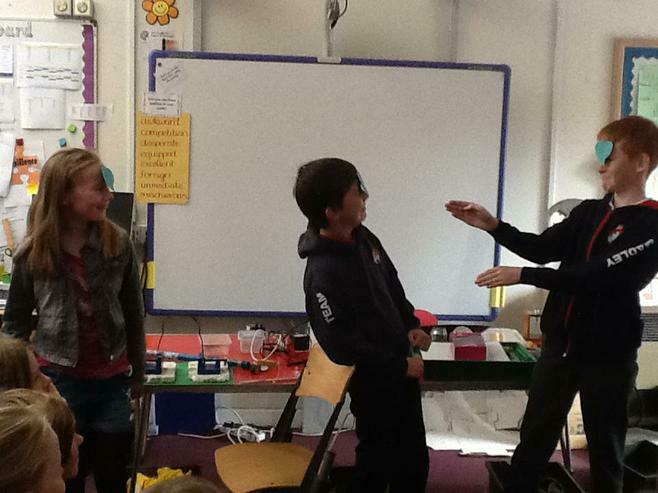 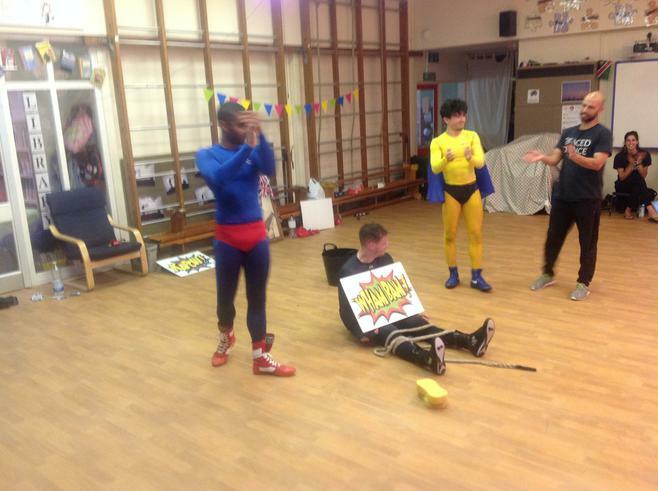 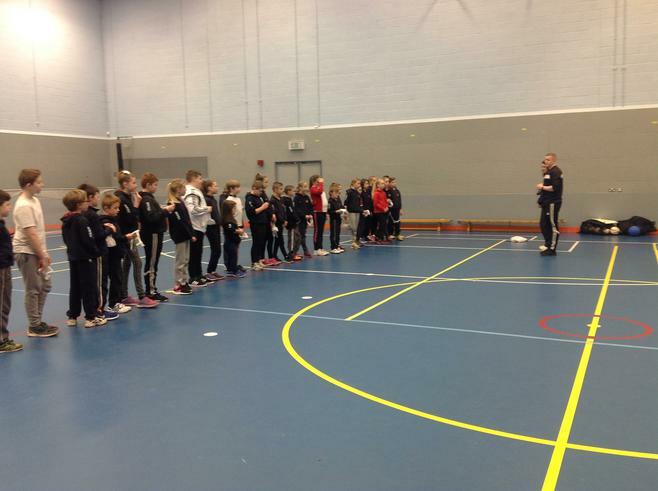 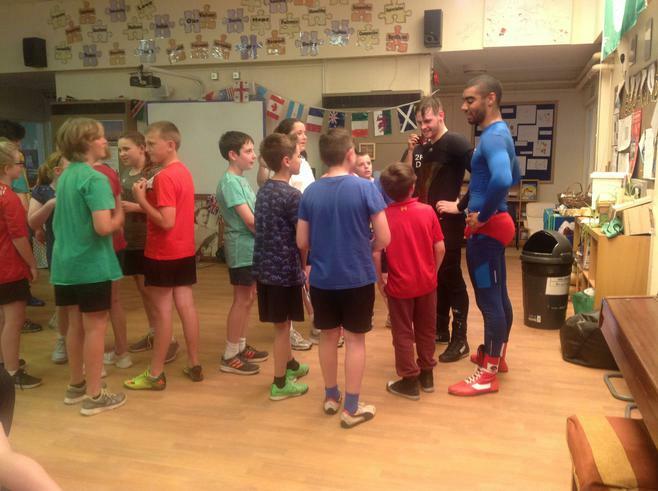 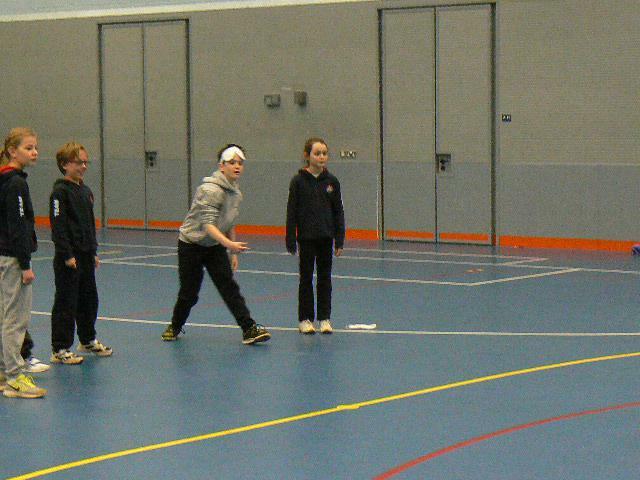 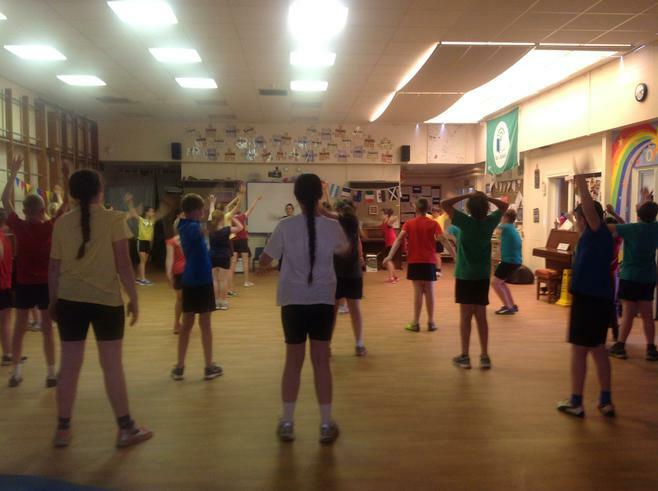 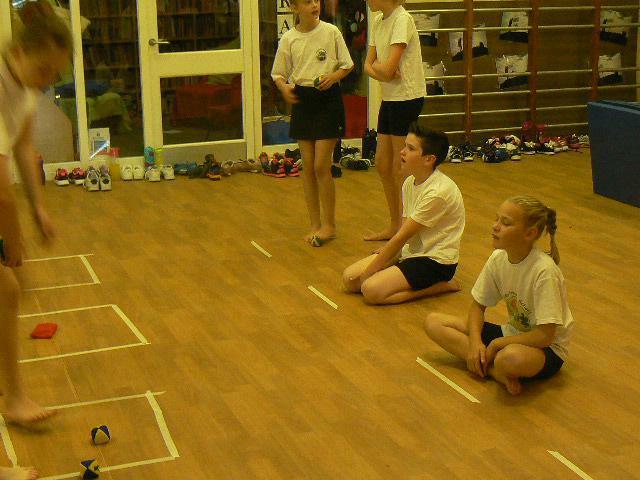 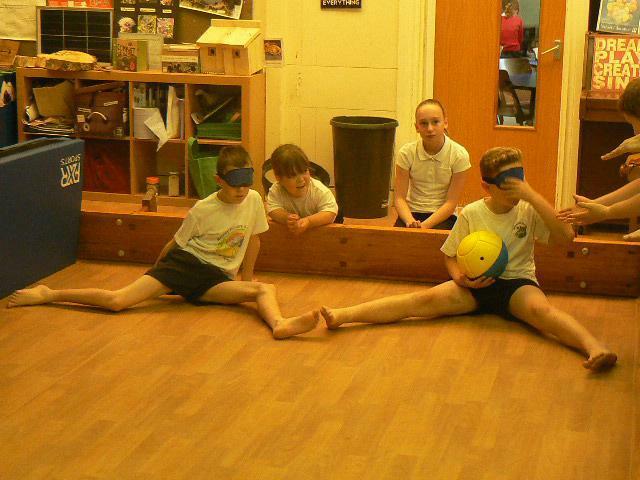 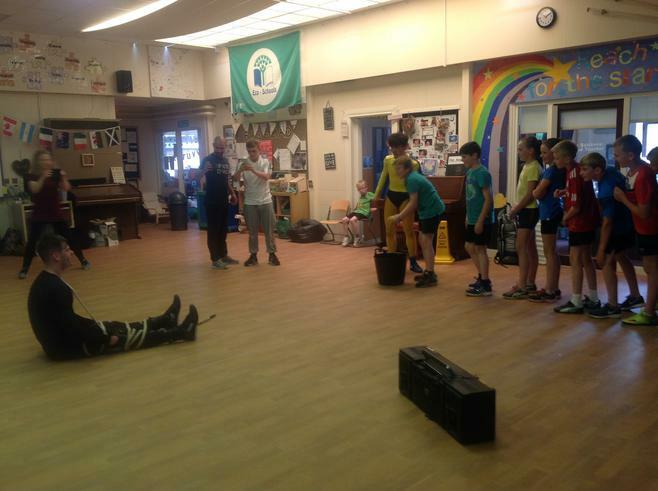 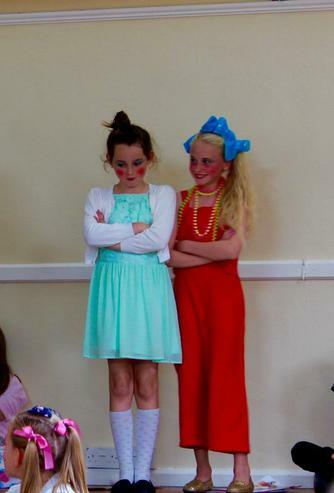 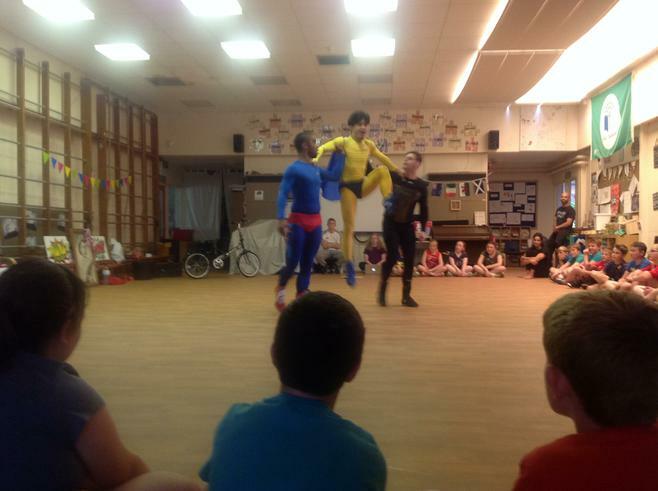 The sports workshop for Year Six was the extremely talented two face dance . 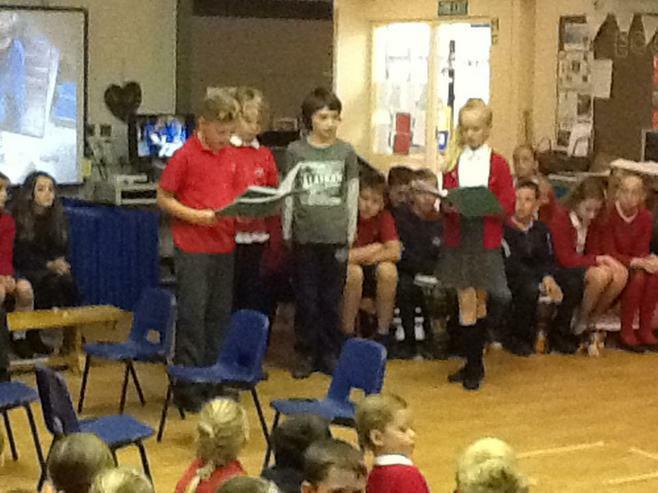 We were fortunate enough to watch an immaculacy choreographed piece of work which has us all captivated . 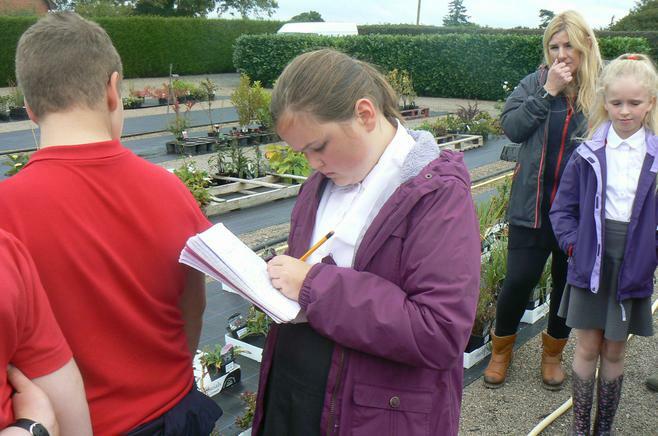 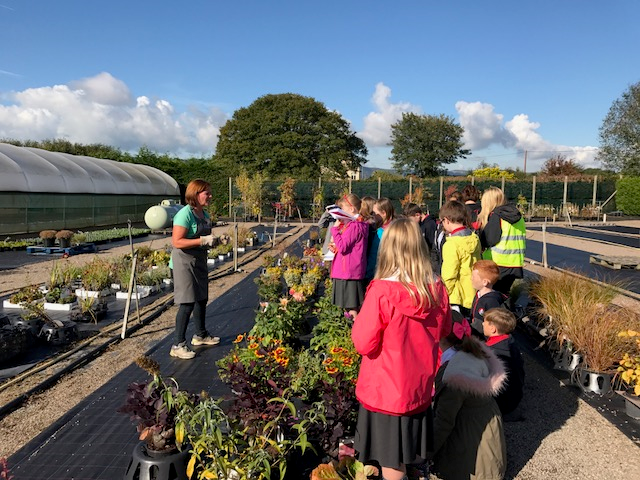 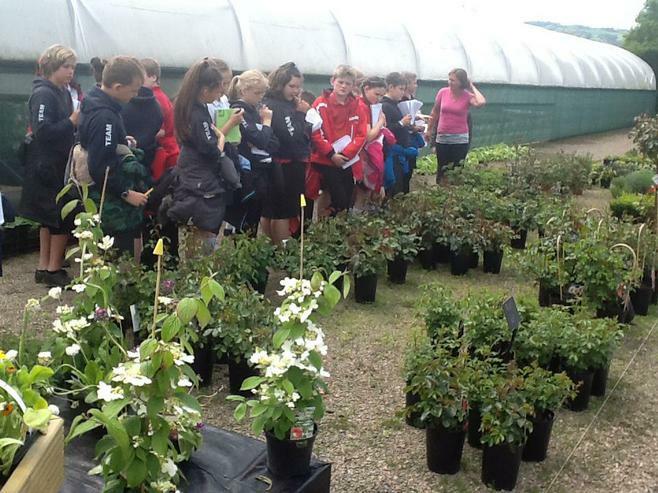 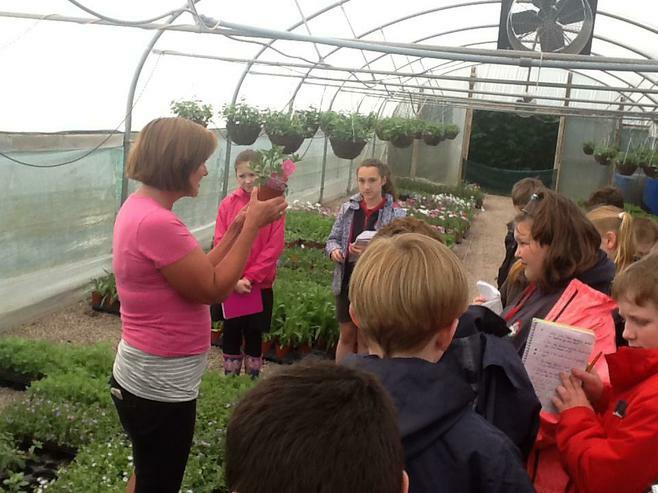 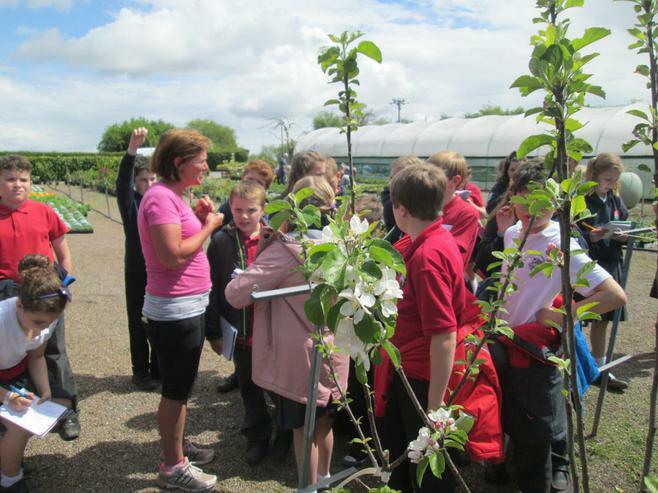 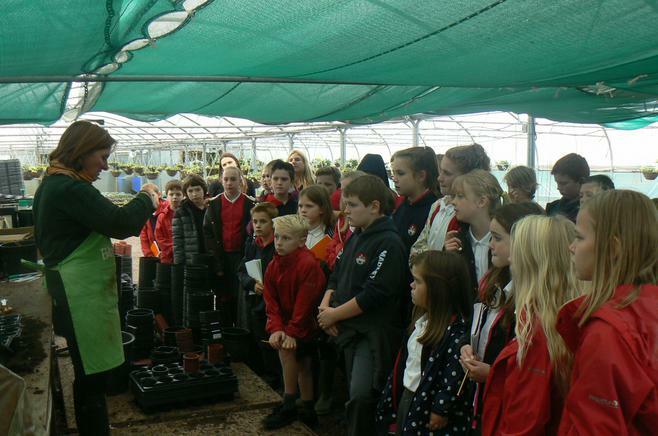 Thank you Michelle of Madley Plants for our curriculum visit , the children learnt about planning and planting , and Michelle passed on valuable advise . 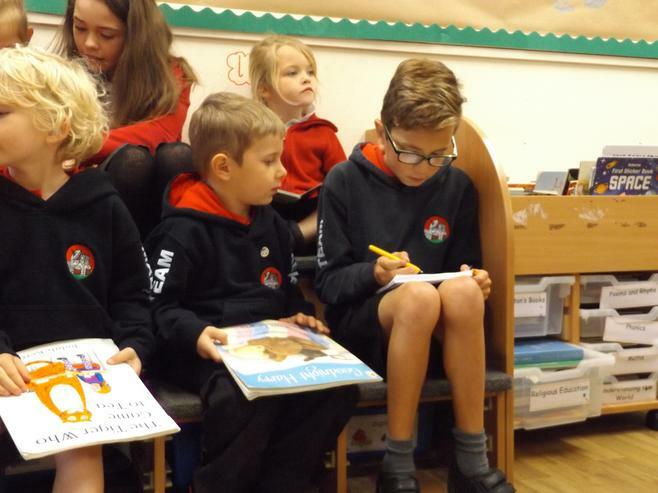 Sats week is in full flow and as a school, we are immensely proud of the effort, determination and commitment the children have demonstrated , and we that you for your continued support. 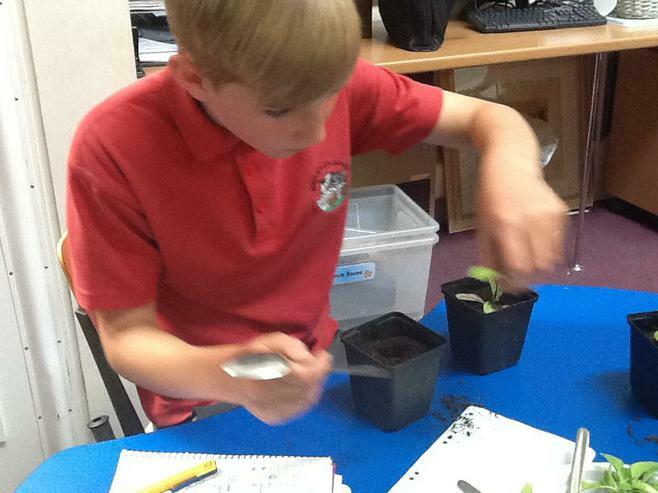 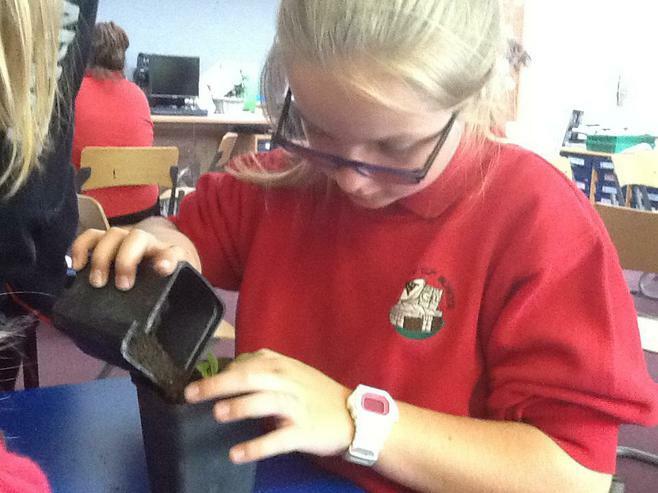 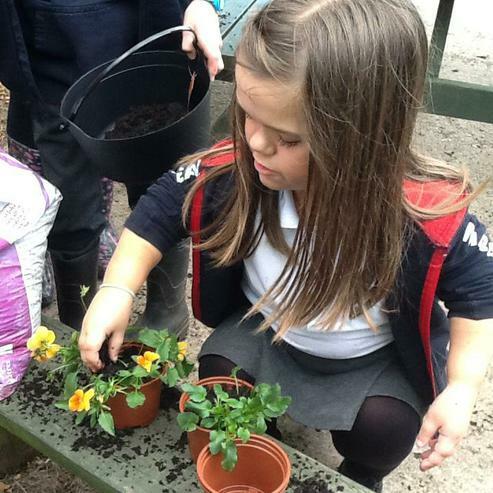 The Class topic is How does your garden grow? 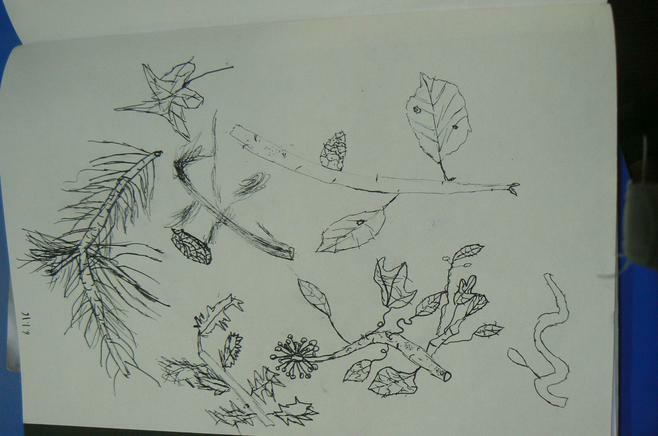 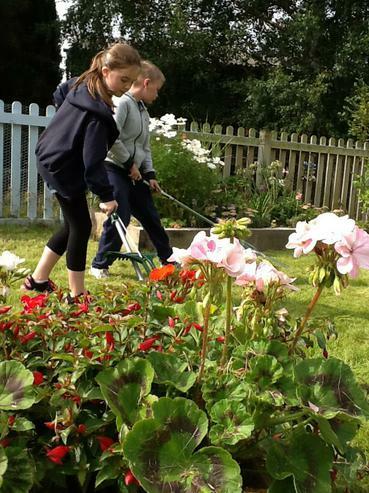 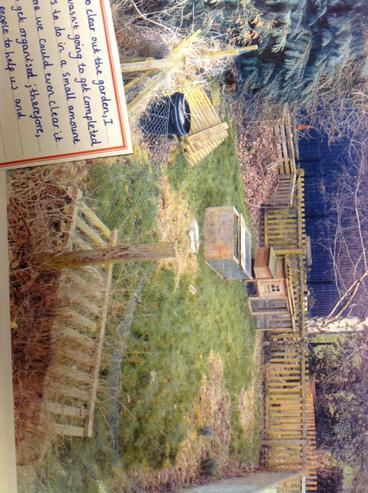 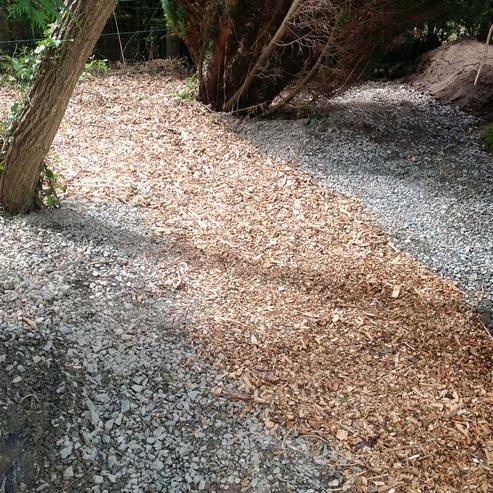 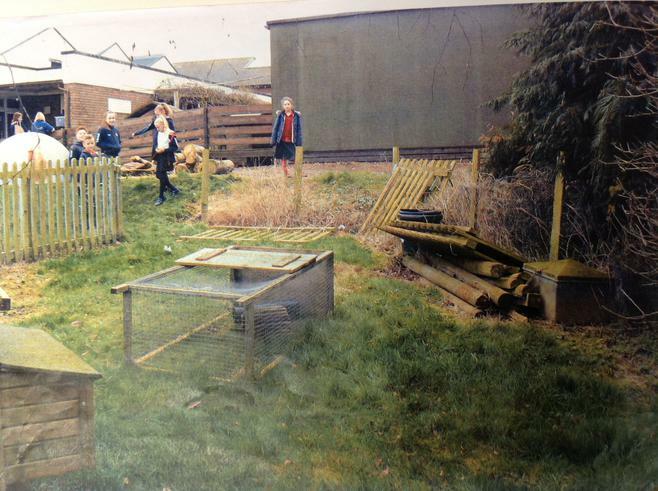 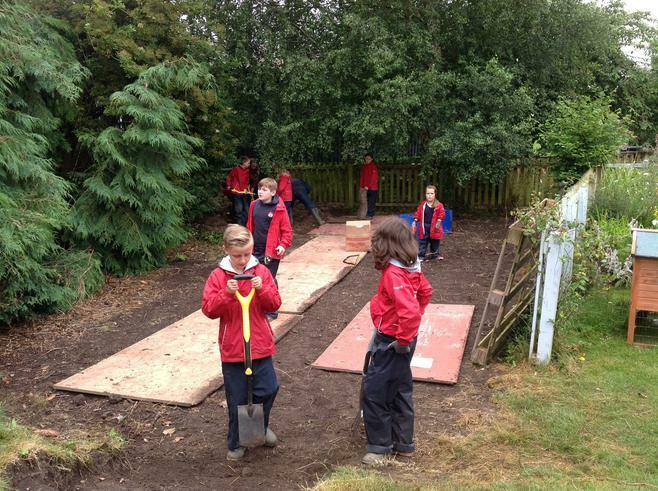 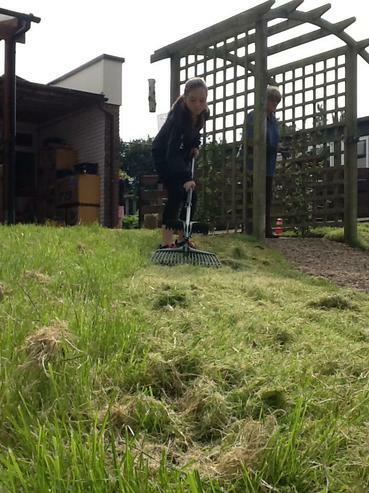 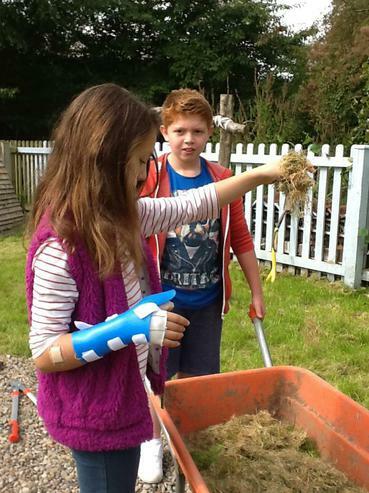 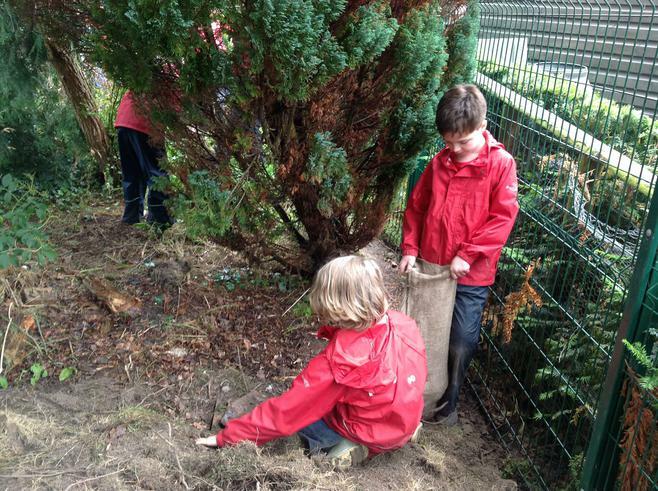 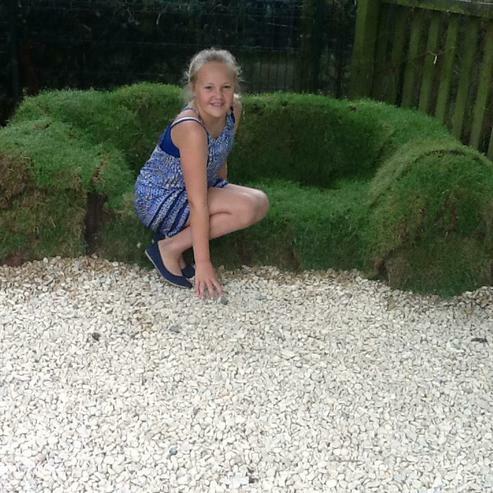 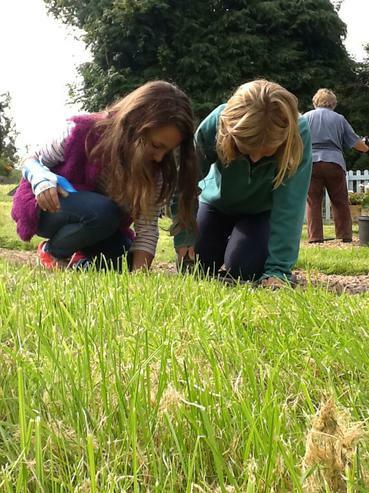 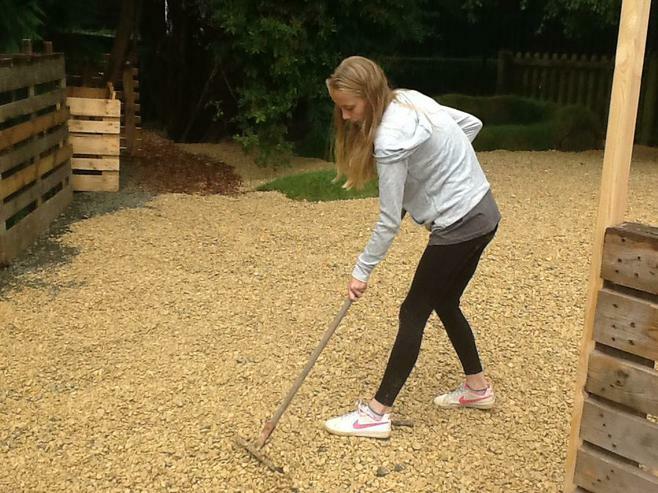 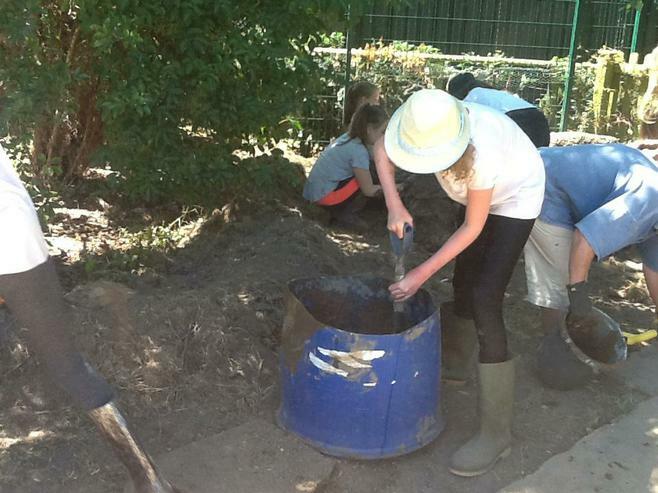 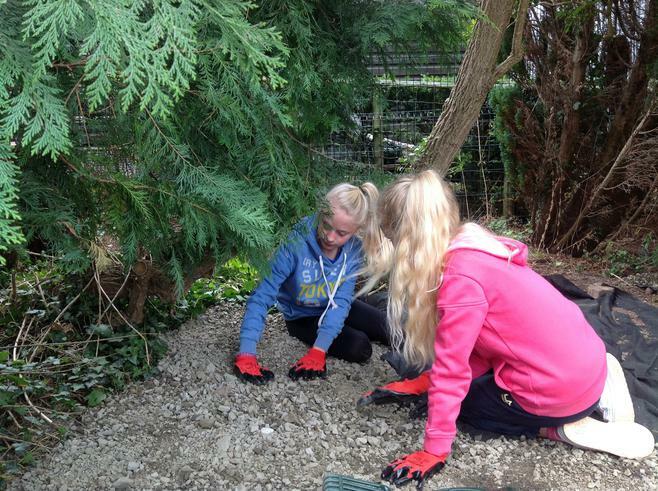 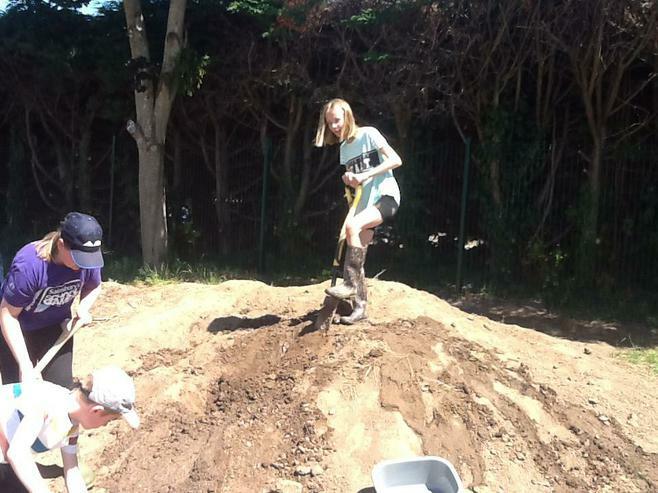 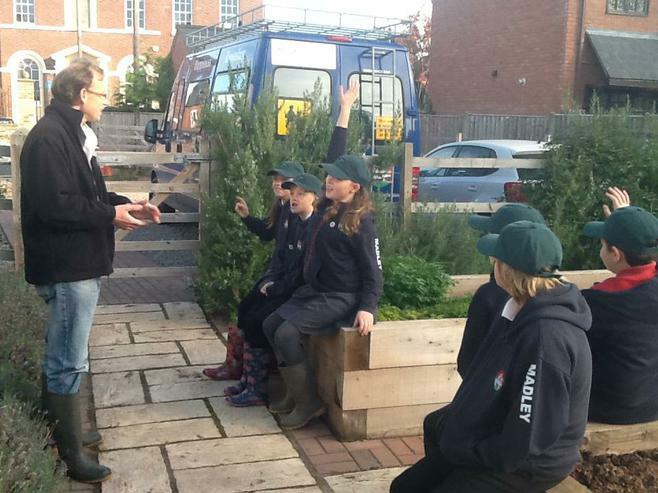 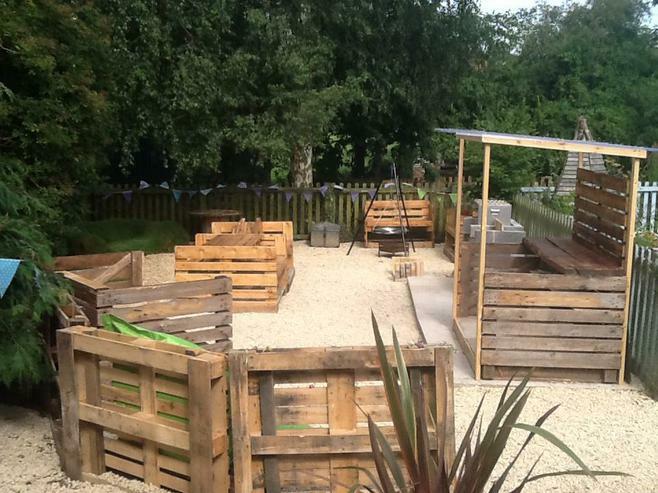 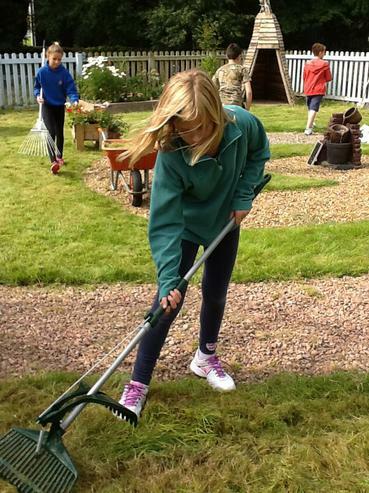 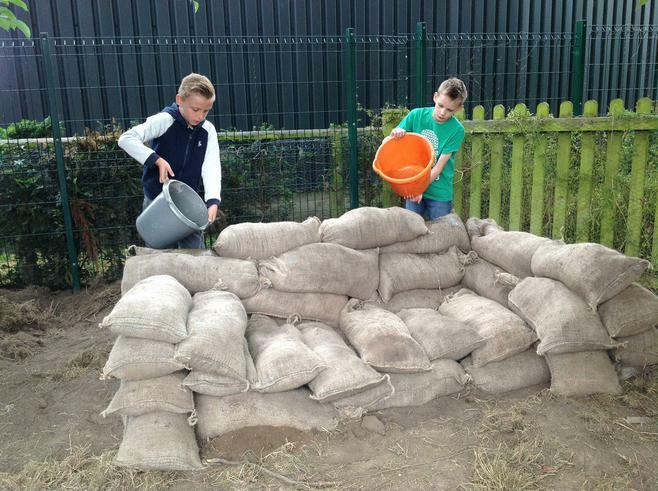 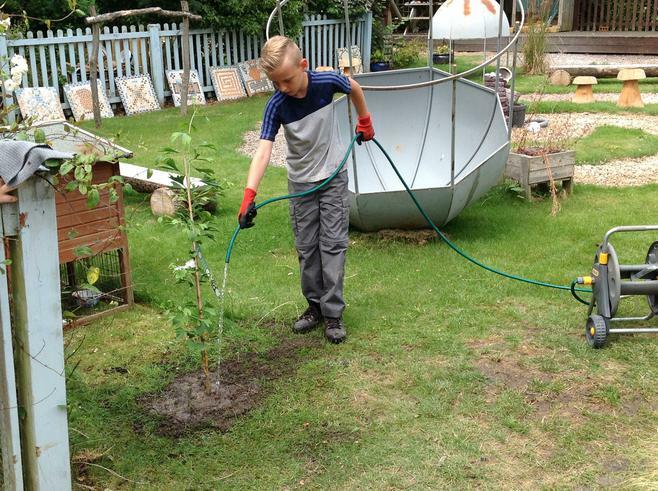 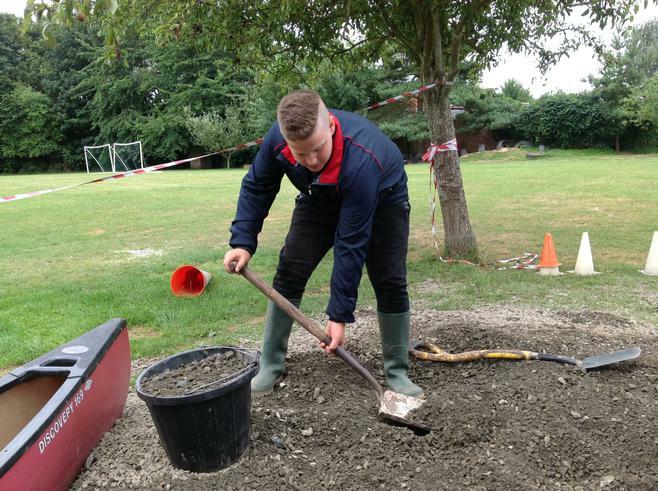 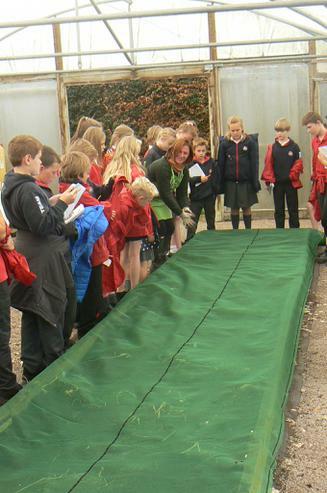 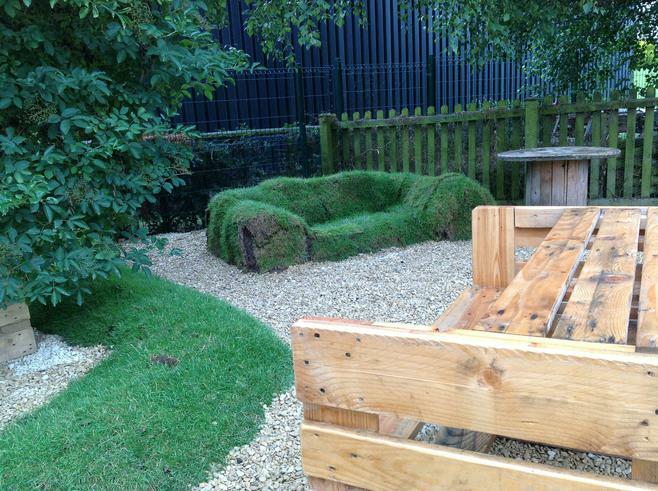 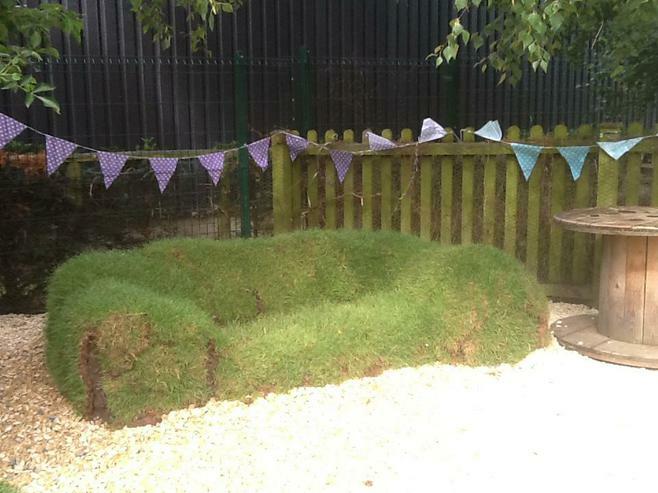 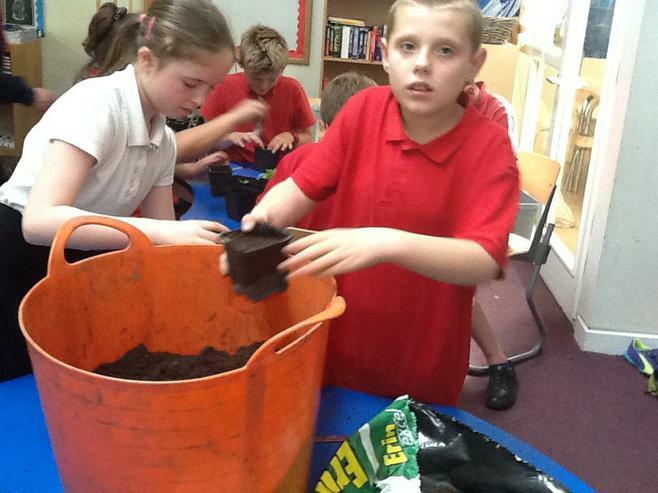 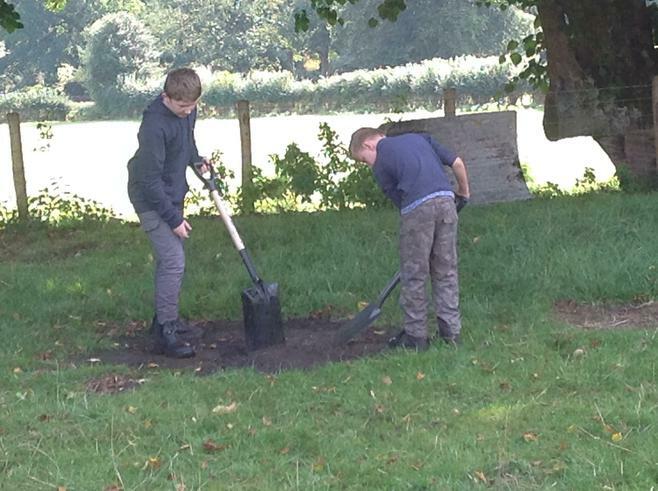 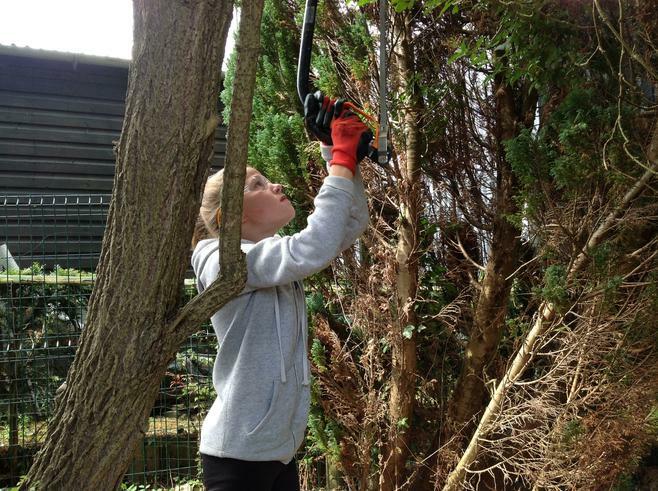 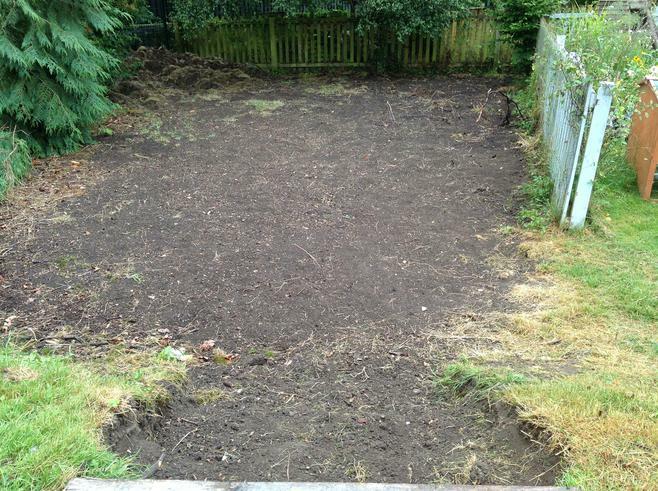 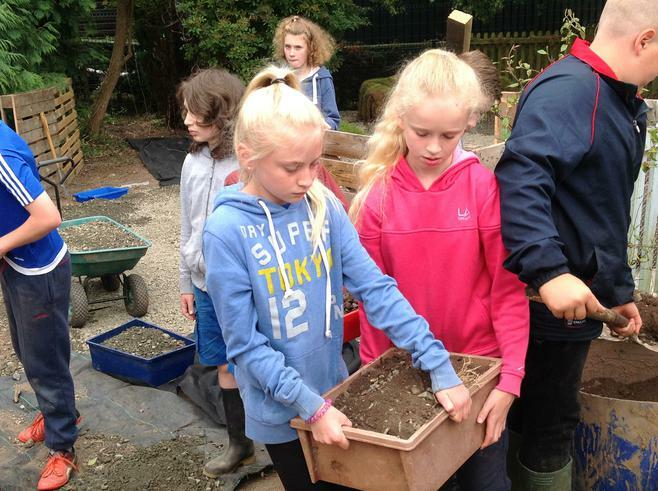 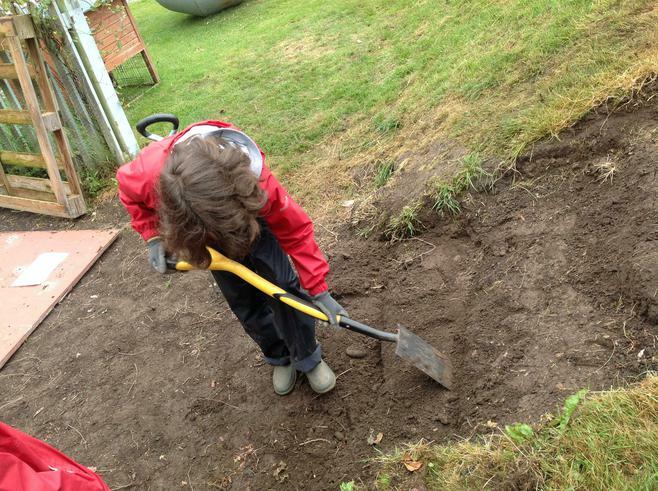 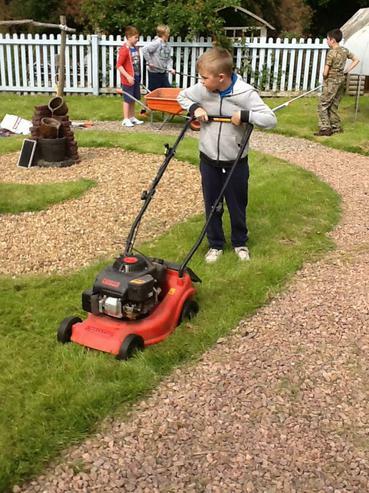 and year 6 will be developing the garden as their legacy to the school . 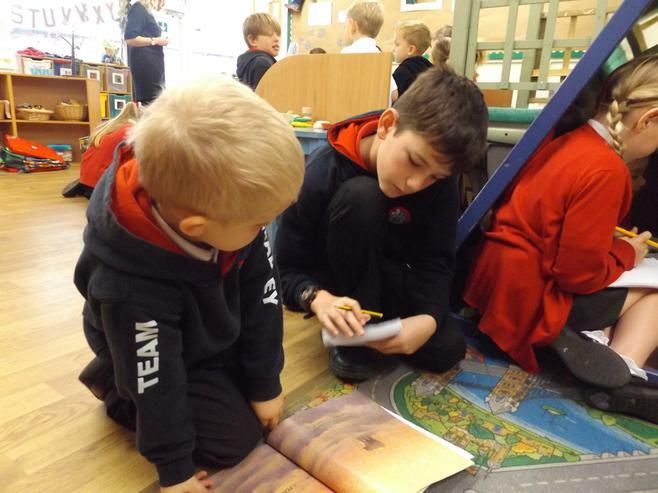 Year 6 have launched themselves into their new topic , " Inspire "
Reading William Blake's poem "The Tyger" and evaluating the work of the artist Henri Rousseau has inspired the class to combine these two mediums to produce their own poetry and illustrations . 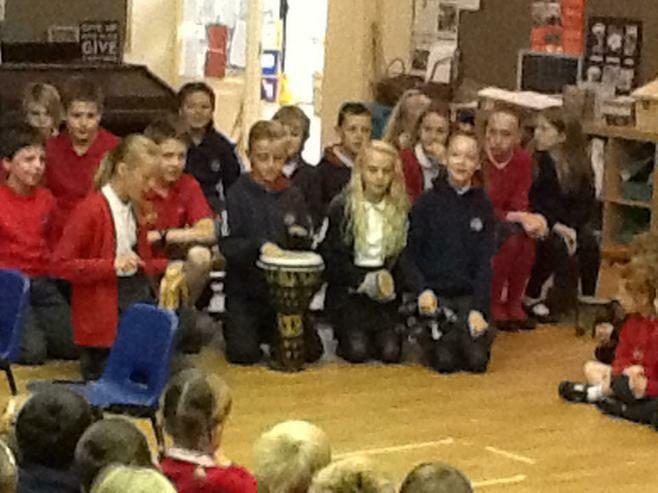 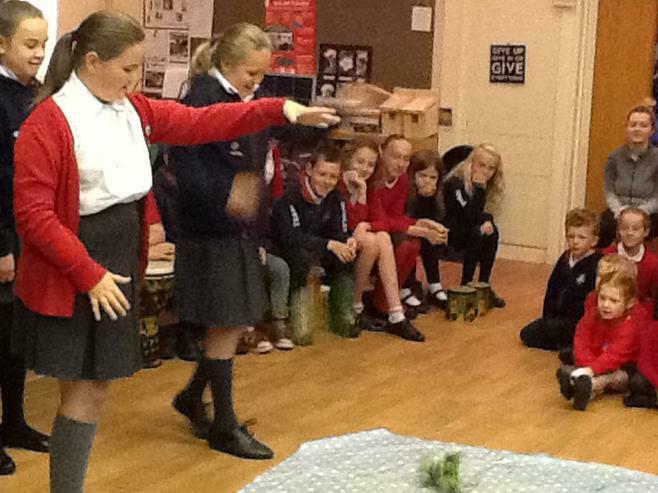 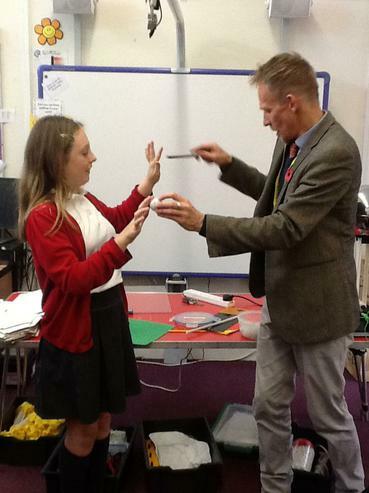 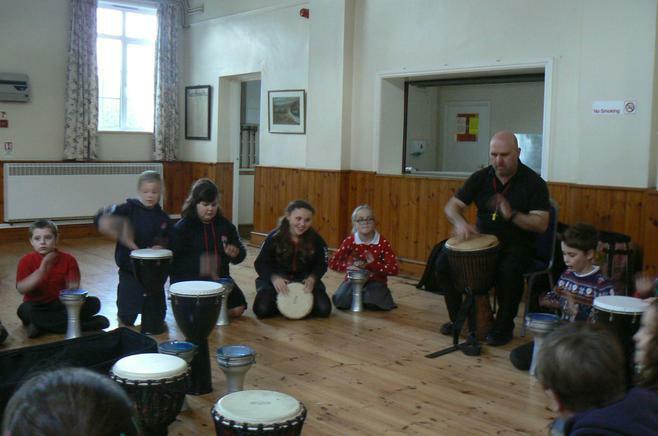 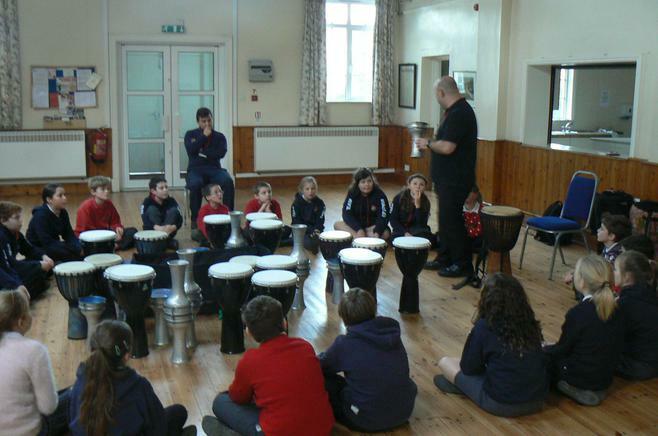 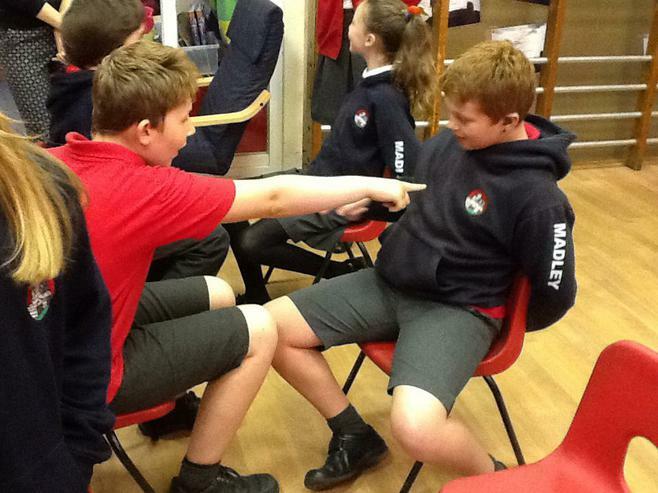 Year six took part in a drumming workshop . 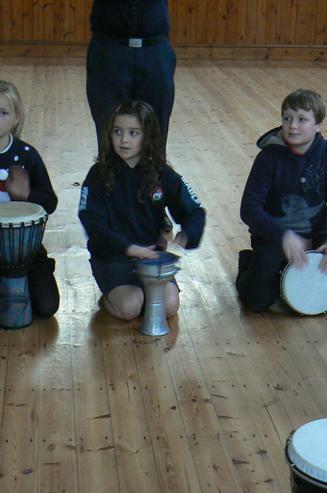 Ed the drummer has worked with many famous celebrities , such as Beyoncé ! 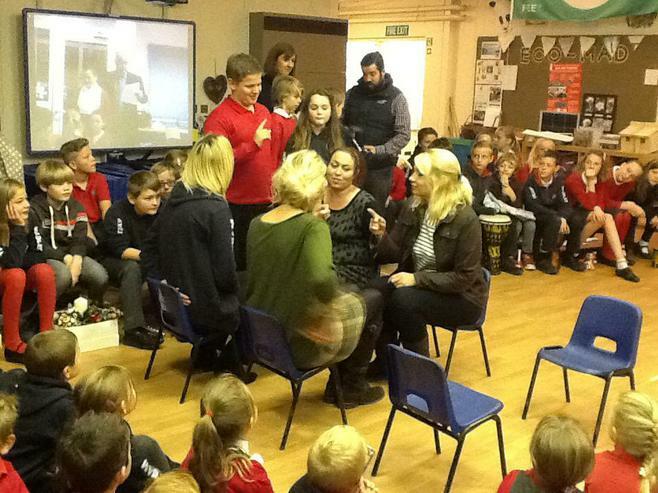 so we were all very excited to take part in this session . 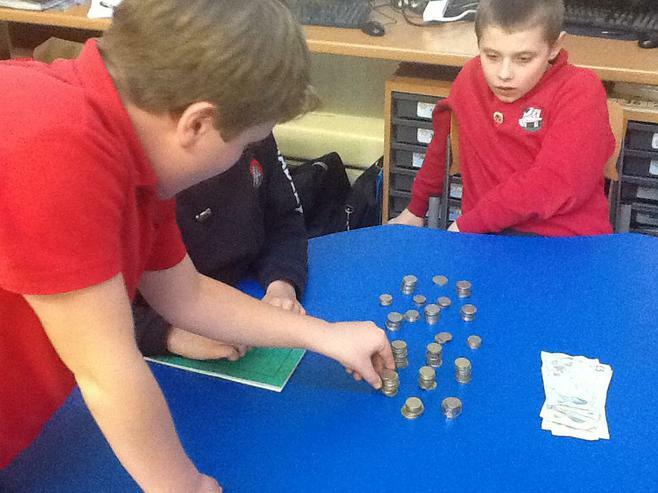 Collectively Year 6 have made £1100 !! 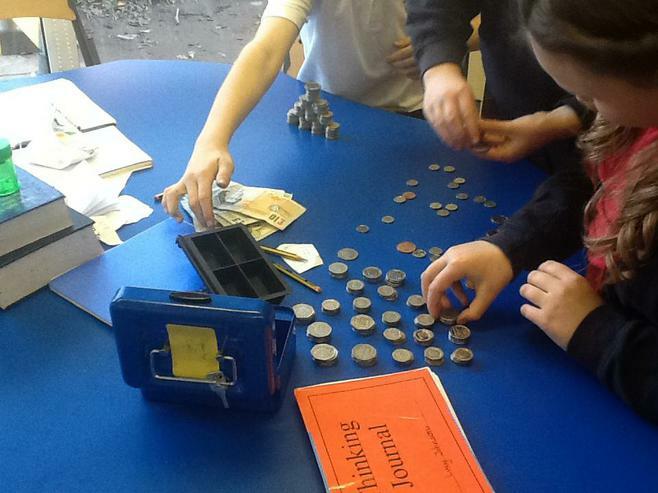 10% of their profits will go to a charity ( of their choice ) and the remaining funds will be used however the class decide . 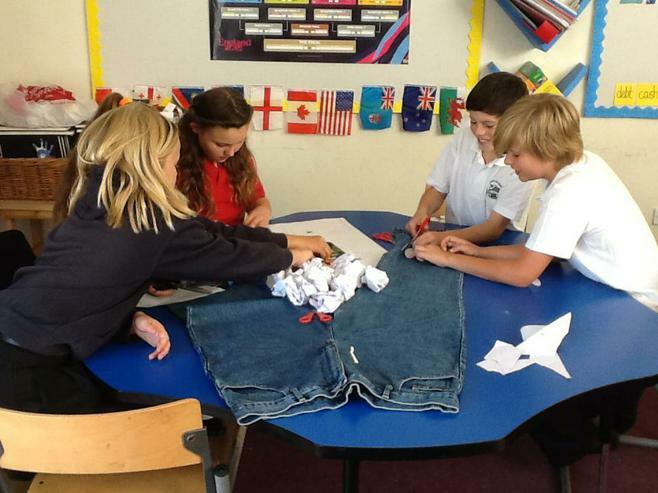 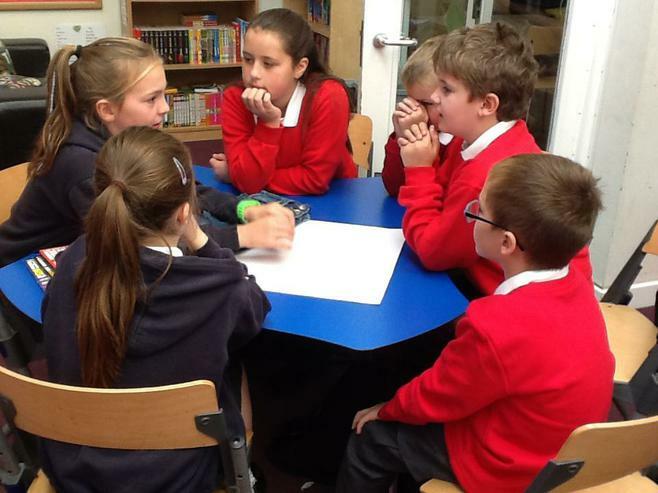 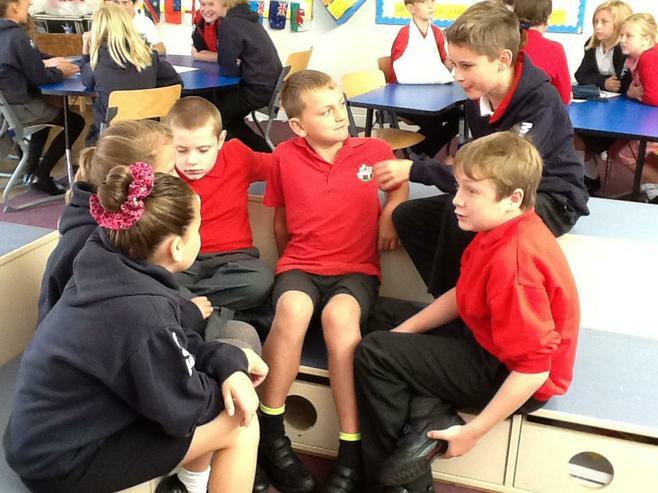 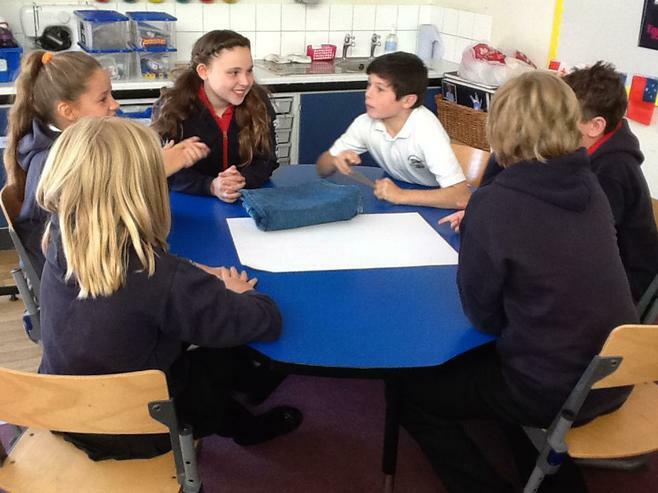 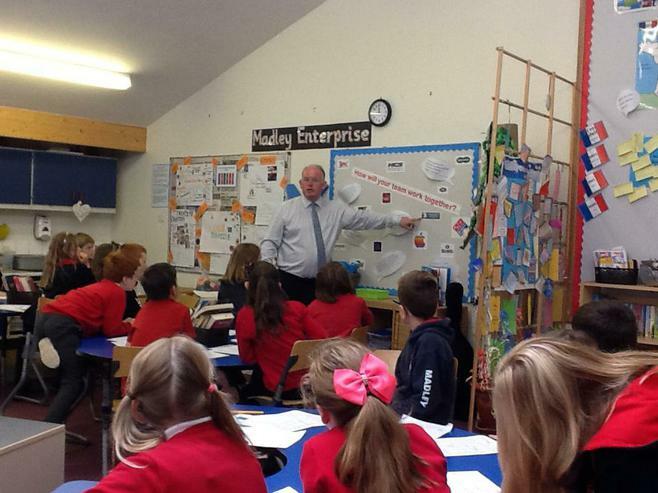 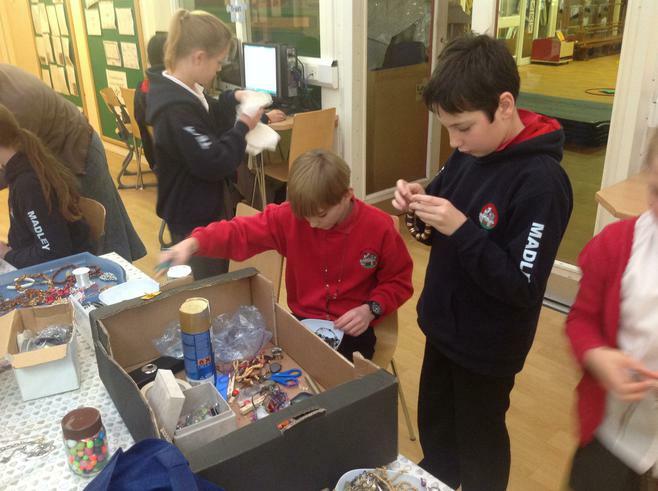 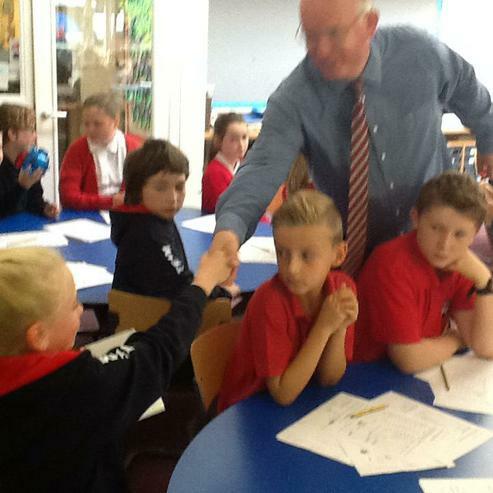 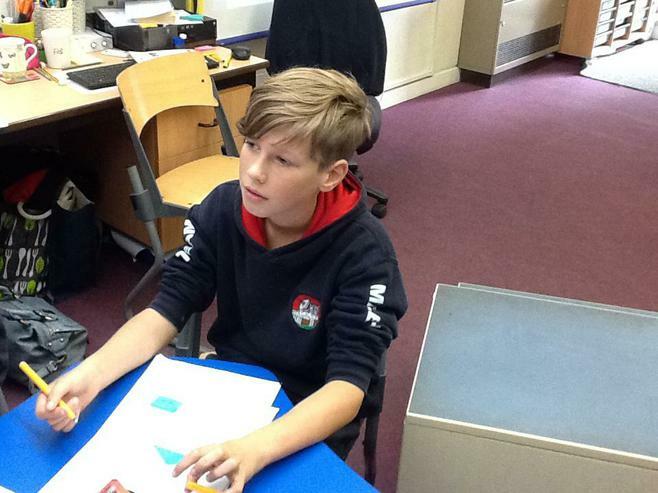 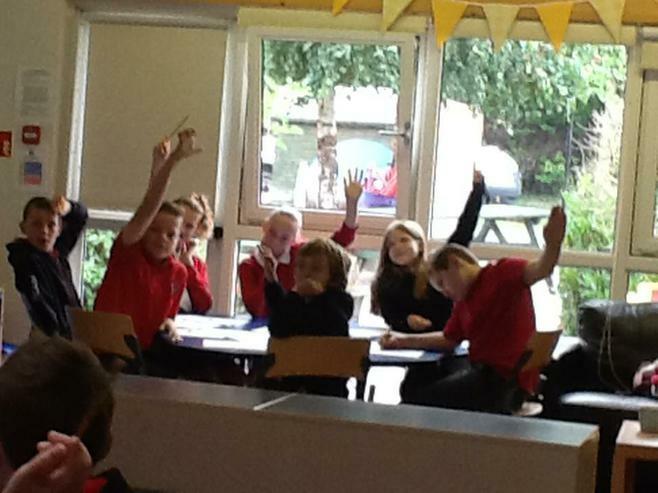 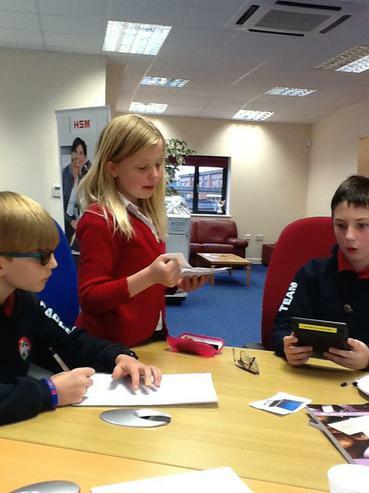 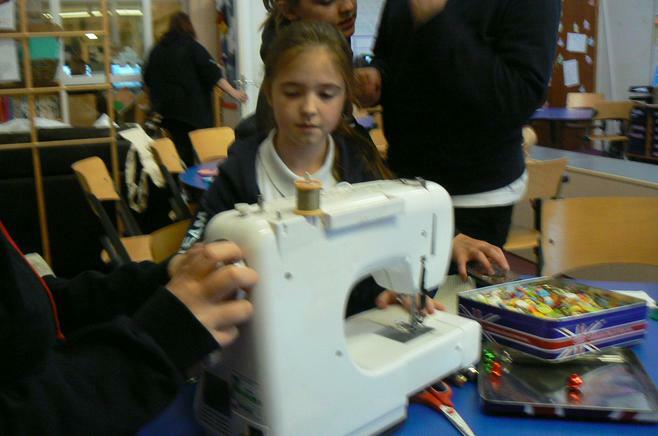 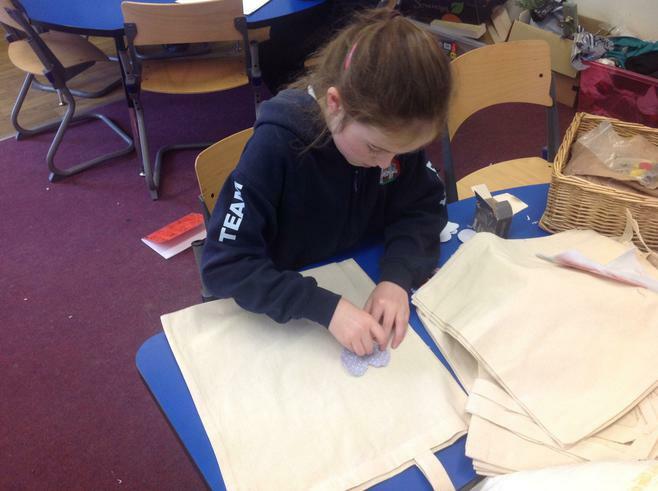 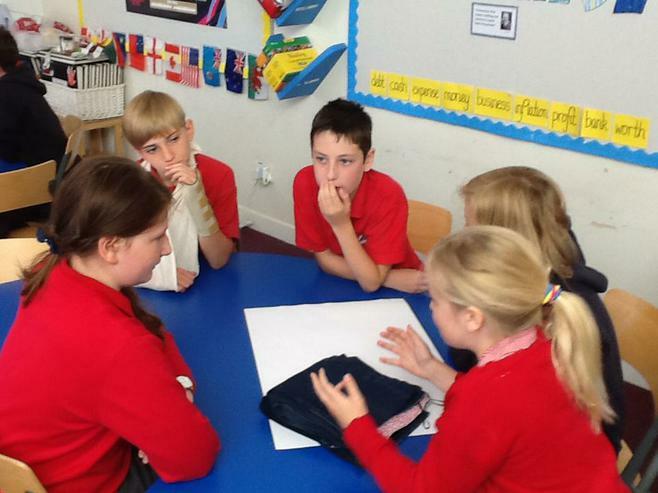 Year 6 worked on their Madley Enterprise topic . 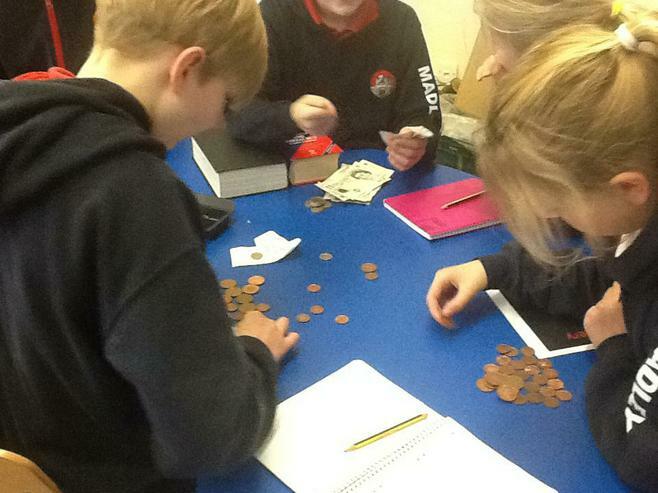 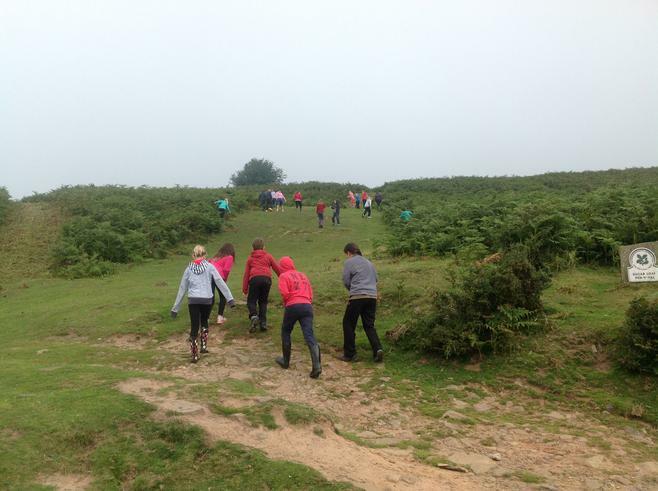 Five groups were established and they spent the morning with the aptly named Mr Cash from Barclays bank !